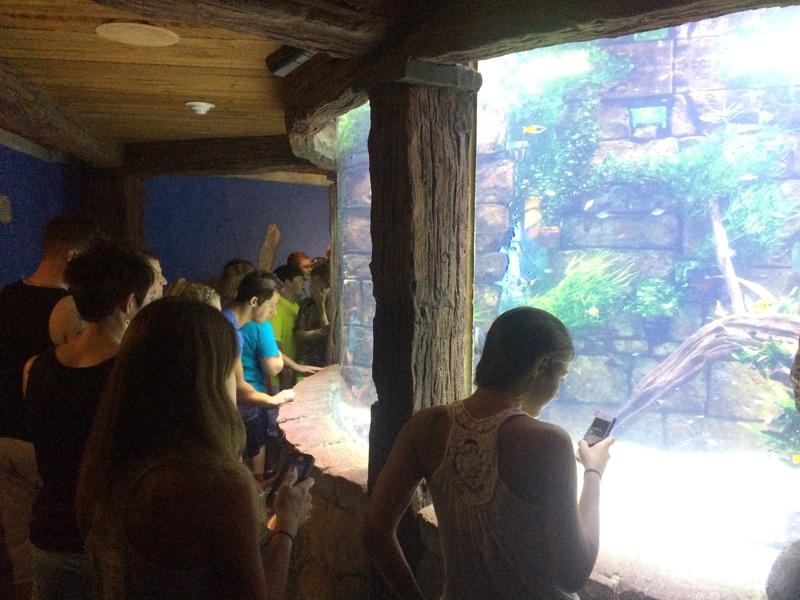 This is one of the worlds best marine/aquatic zoos in the world in my opinion. 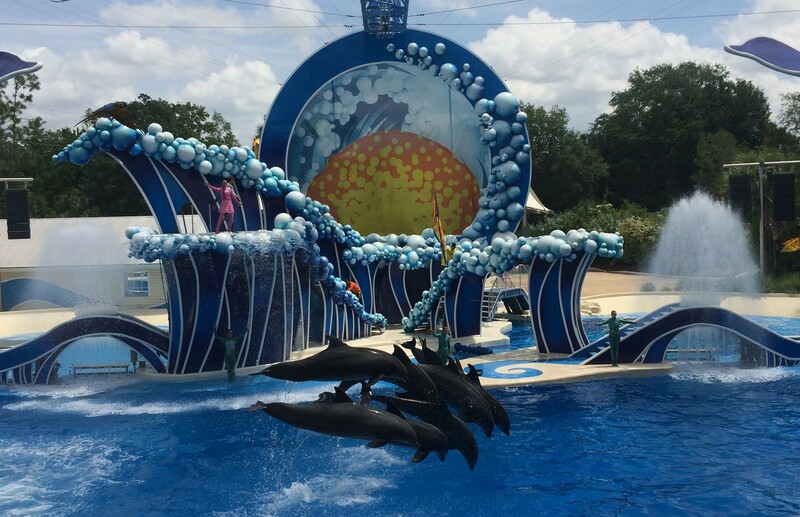 It is heavy on outdoor shows with lots of animal interactions and exhibits as well as themed attractions, rides, and roller coasters. 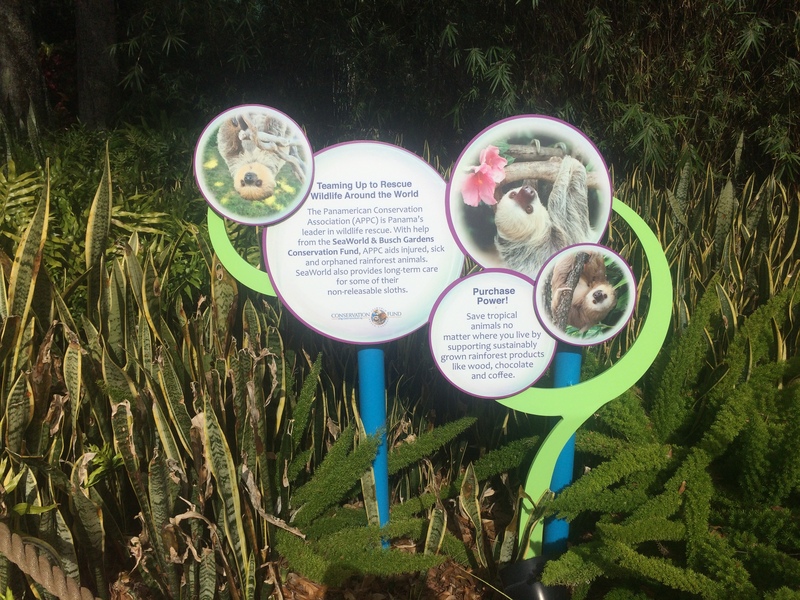 This parks primary focus is on education and conservation through entertainment and that message is pervasive throughout the entire park. 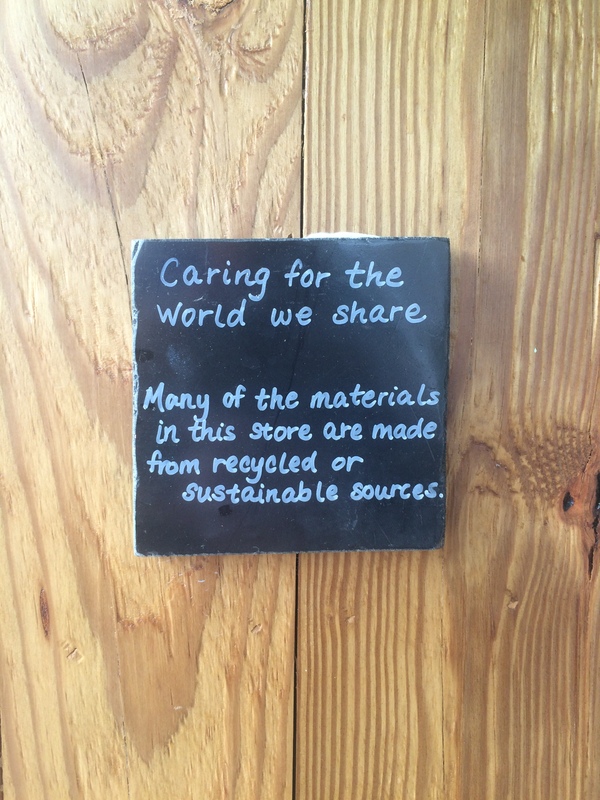 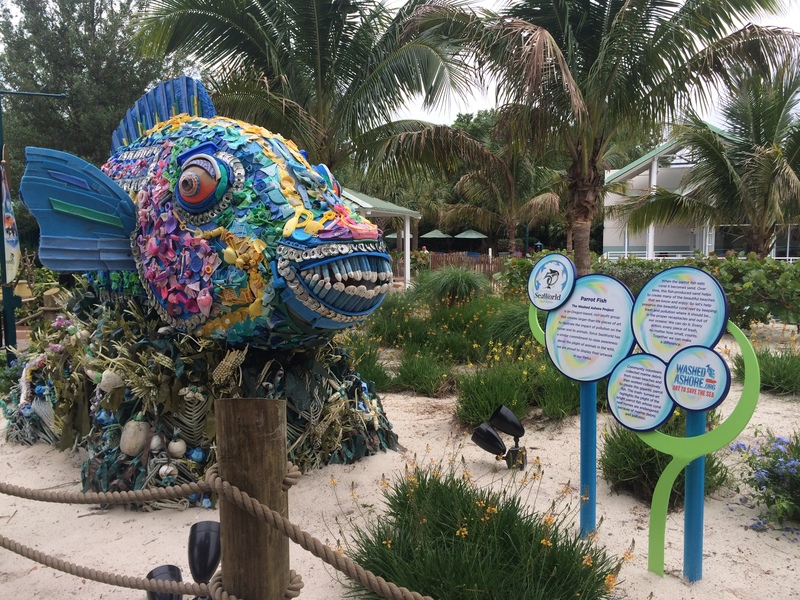 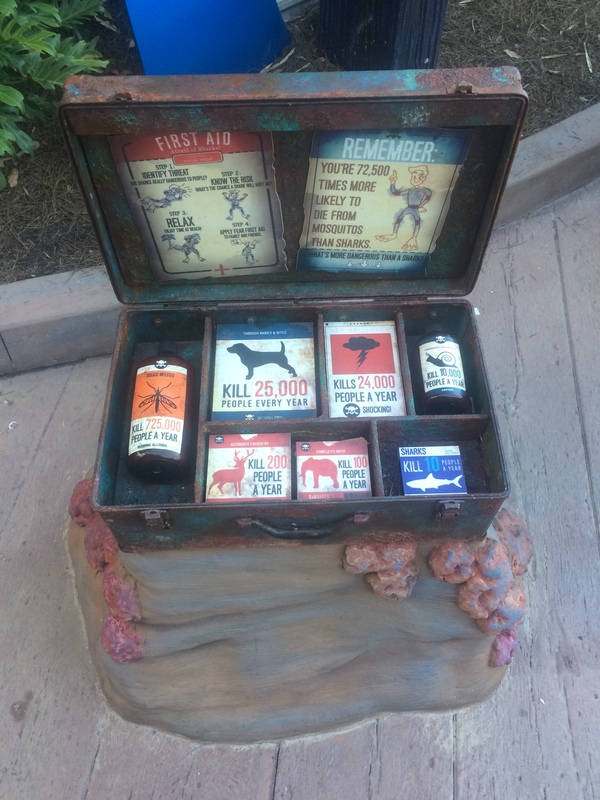 There are many displays at the animal encounters as well as recycling bins throughout the park and the restaurants and shops use as much recycled material whenever possible. 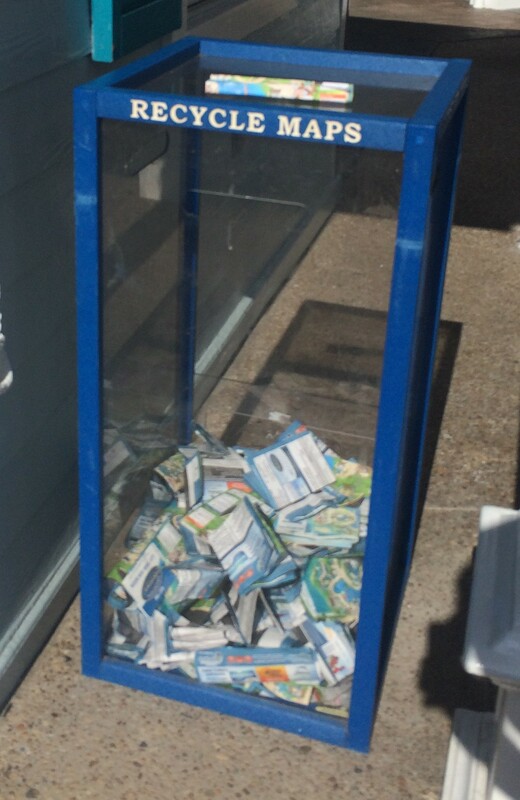 They even encourage you to recycle your paper park maps at the exit when you leave as there is a bin for used maps at the exit turnstiles. 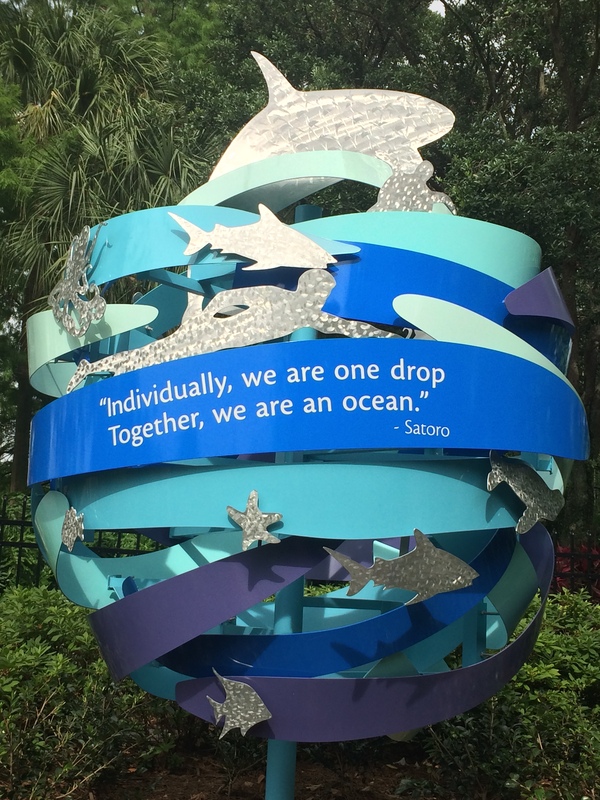 There are many things for the entire family to do here, as I said before, there are a plethora of shows and exhibits, there are also two world-class steel roller coasters, several indoor and outdoor rides, and a large kids area called Shamu’s Happy Harbor.. As a native-born Floridian and a Orlando resident since 1975 so my memories of visiting SeaWorld go all the way back to when my elementary school would take our annual field trip to the park back in the early 1980’s. 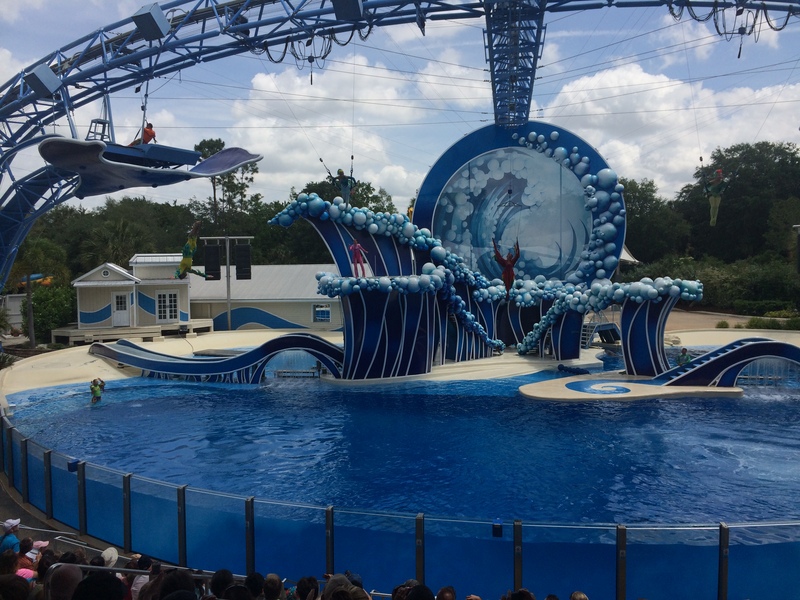 I can remember a time when the Orcas were performing with the dolphins in the Dolphin and Whale Stadium where Blue Horizons is now showing. 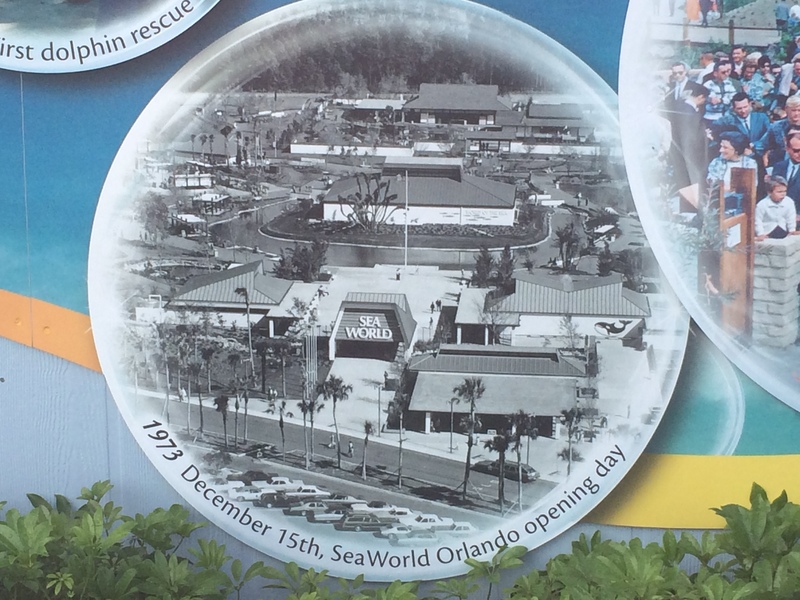 I also remember at time when the park didn’t completely encircle the lake and the only ride was the Sky Tower, the Hawaiian Punch Village was where the Waterfront area is now, the Japanese Village was where Antarctica is now, and the Worlds Oceans Aquariums where Manta is now, and the Makahiki Luau dinner show that was behind the Seafire Inn restaurant in the Waterfront area. 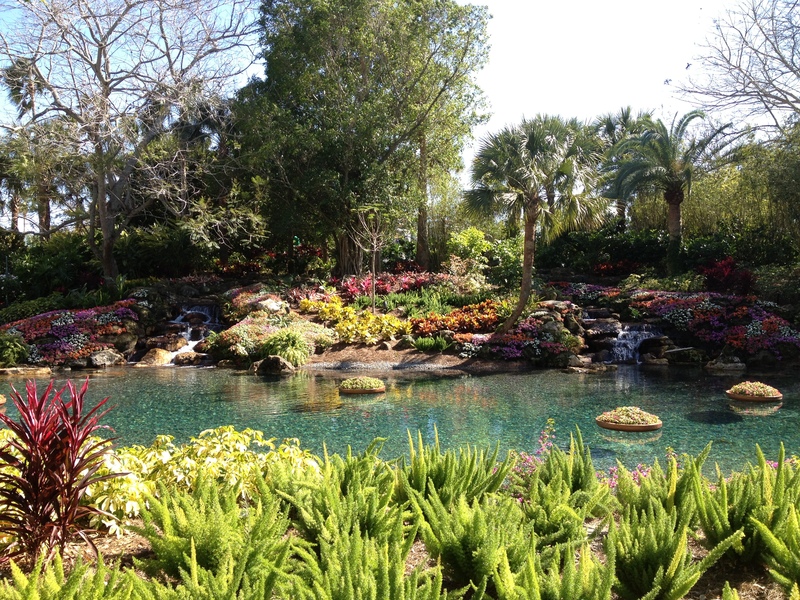 In-fact, I can remember being in the Sky Tower ride and watching as Spaceship Earth was being built at Disney’s EPCOT. 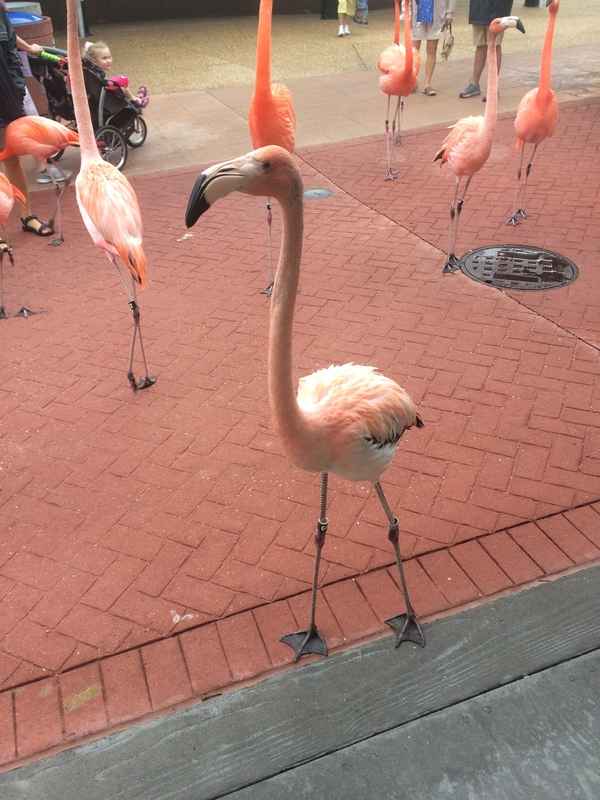 I should let you know that I will delete and post that I deem to be vulgar and/or threatening and all posts typed in caps will be deleted as well. 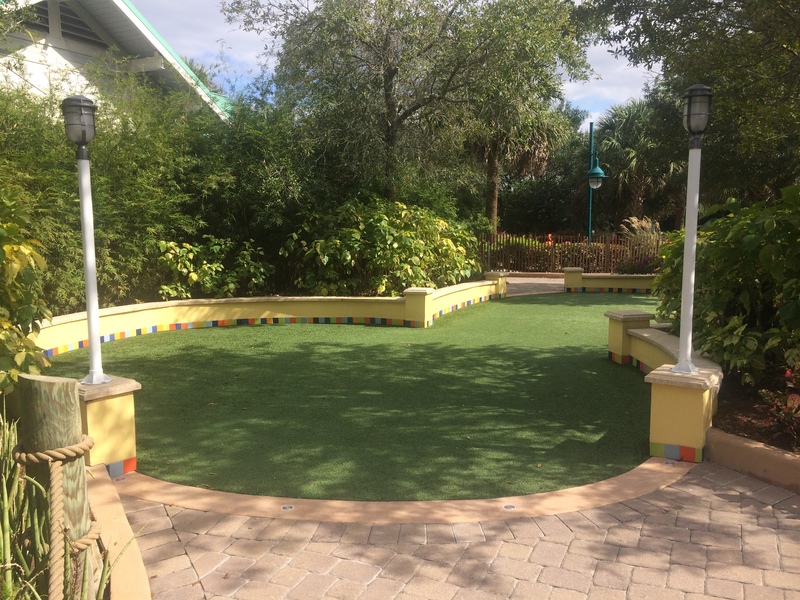 There are on site kennels that operate on a first come first serve basis and are an additional charge. 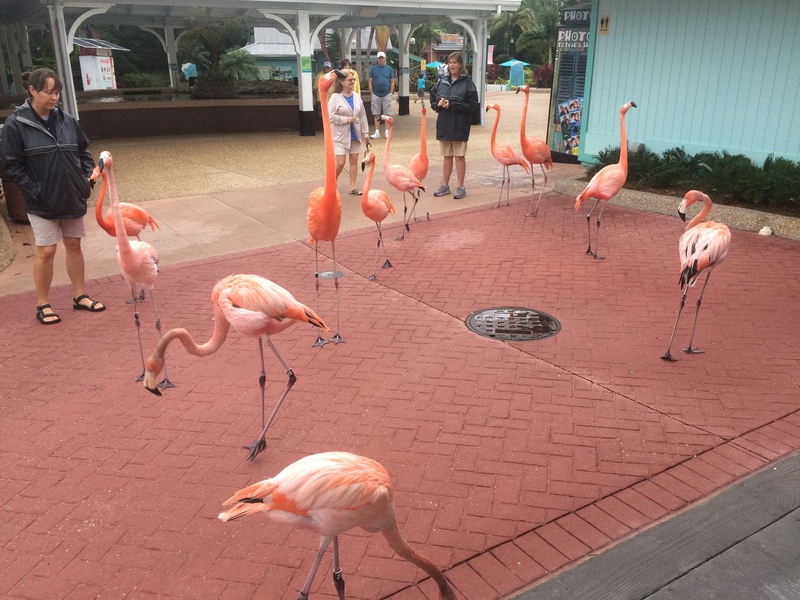 You’ll need to feed and walk your own pet and there are no overnight accommodations and please check the parks website for any additional information. 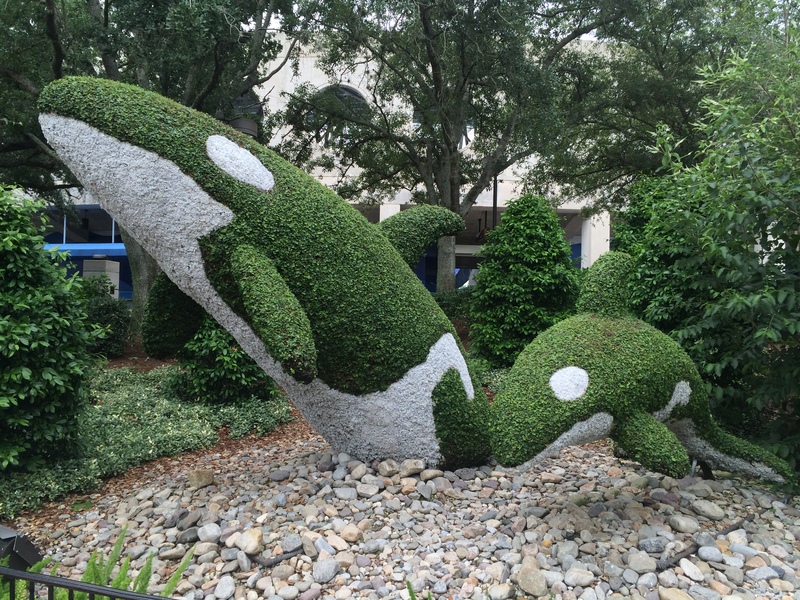 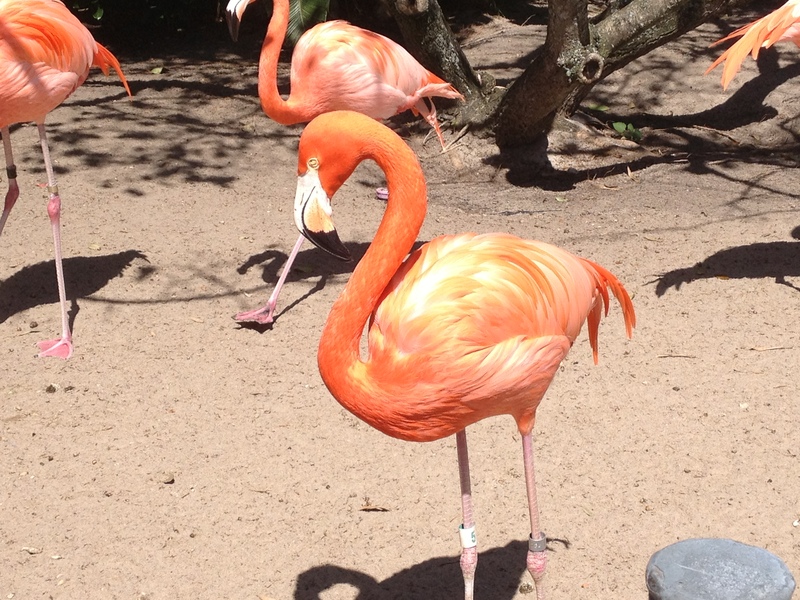 This 200 acre park opened on December 15, 1973 under the name Sea World Florida. 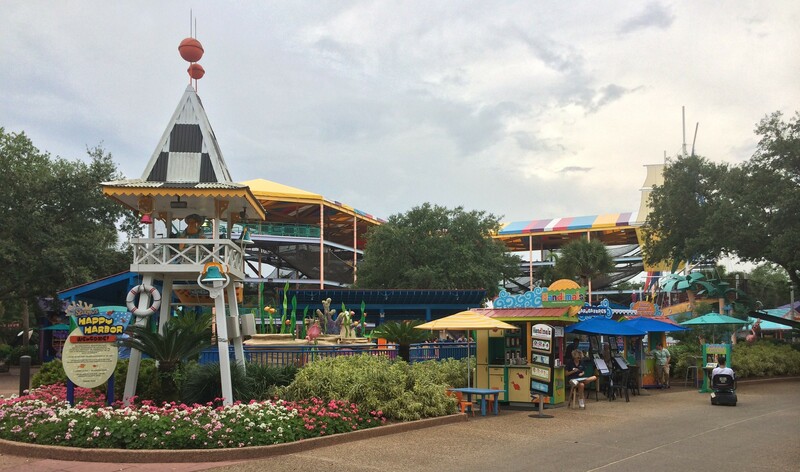 The park has had a few different owners over it’s 40+ year history. 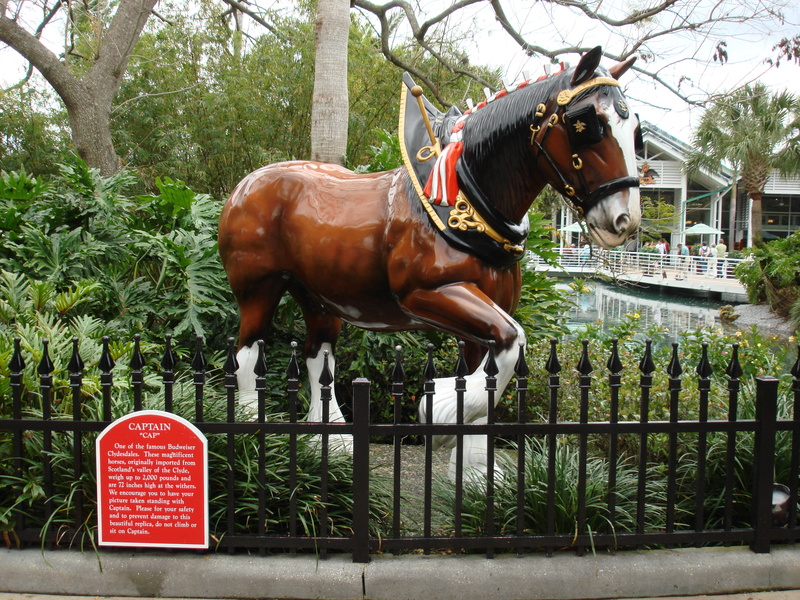 First it was owned and operated by Sea World, then all three parks were sold to Harcourt Brace & Jovanovich (HBJ), then it was sold to Anheuser Busch which also owned all the Busch Gardens parks, then the entire chain was sold to the Blackstone Group when Anheuser Busch was bought by In-Bev, a Dutch brewing company. 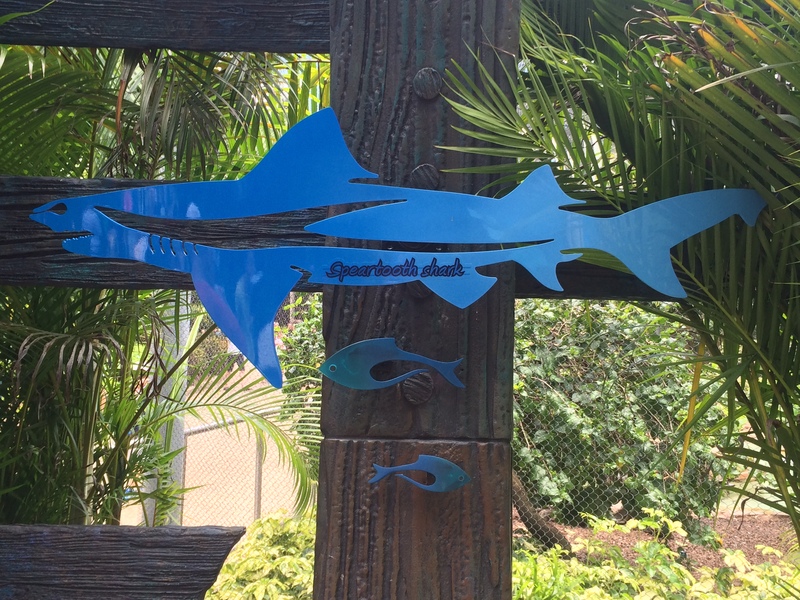 This park is themed to the oceans, and communities that border the oceans around the world. 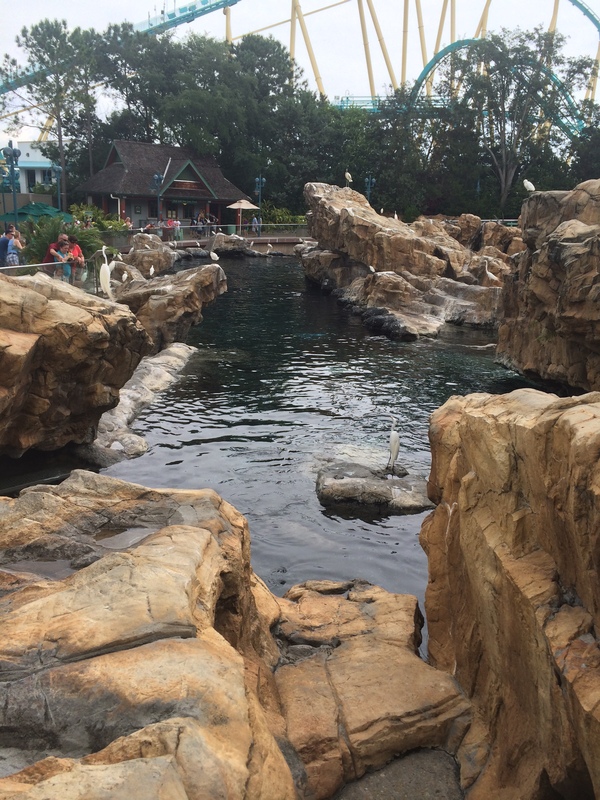 There are eight themed areas in the park which encompass the Port of Entry and seven “seas” of which are the Sea of Shallows, Sea of Legends, Sea of Ice, Sea of Delight, Sea of Mystery, Sea of Fun, and the Sea of Power. 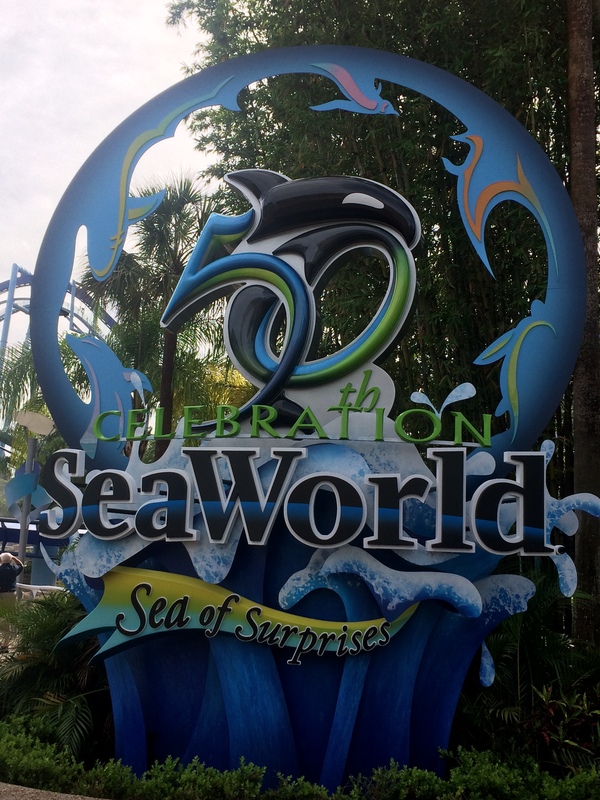 SeaWorld is celebrating their 50th anniversary this year which mark 50 years that the original SeaWorld in San Diego, California, USA opened so you’ll see quite a few 50th anniversary banners and wall displays with different photos from SeaWorld San Diego and Orlando all over the park. 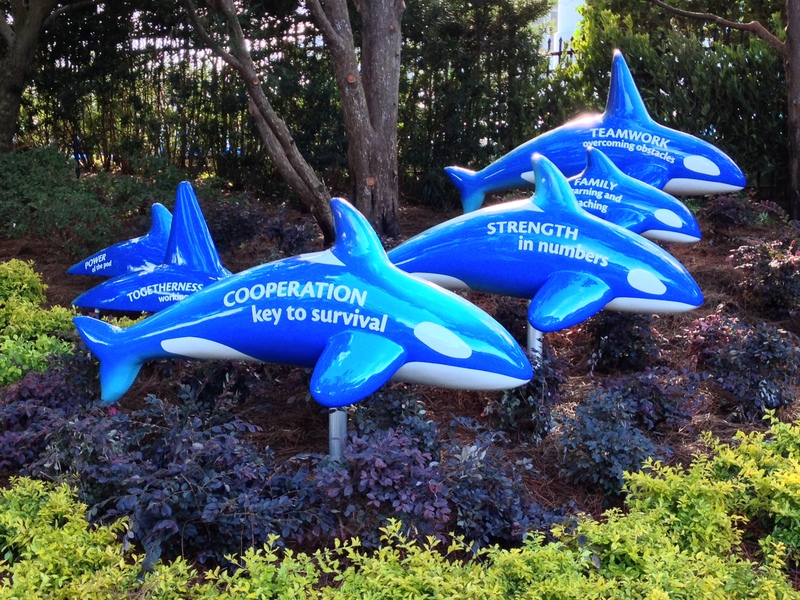 SeaWorld Orlando opened on December 15, 1973. 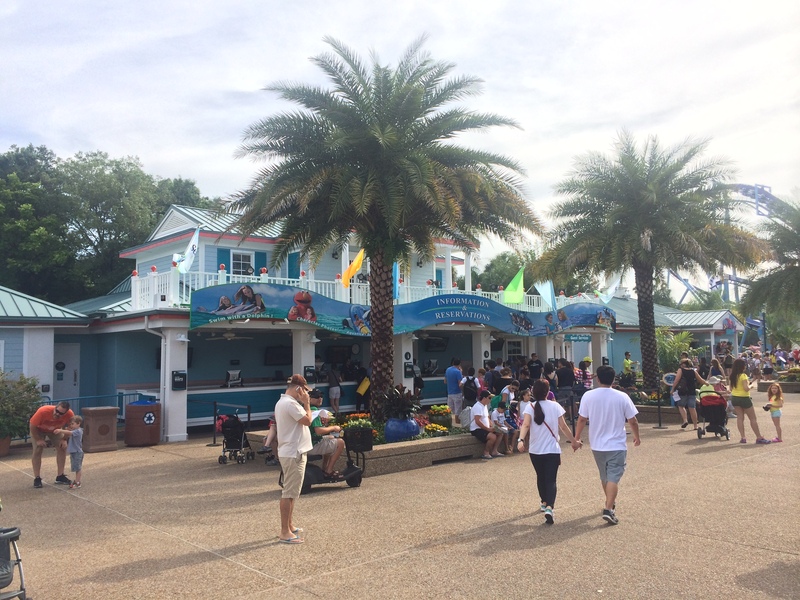 This is the main gate area that has buildings that have a Florida inspired theme with tropical foliage and a large artificial lake with a marina theme that has several anchored boats, a few sea lions, and an iconic Shamu themed lighthouse. 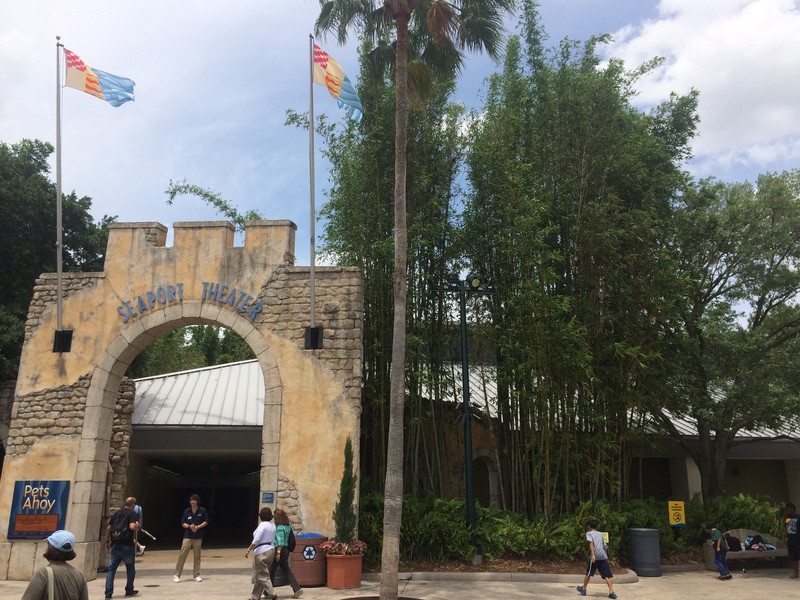 It should be noted that the harbor area at the main gate is where the original main entrance and ticket counters used to be. 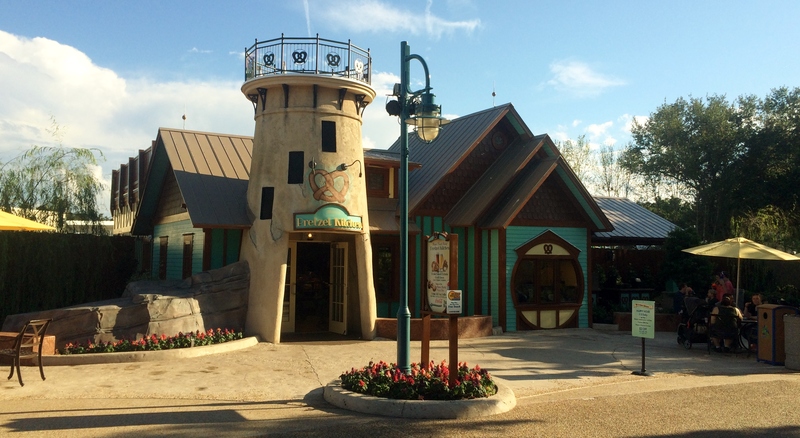 This area has a guest relations building, a locker/stroller/wheelchair/locker rental building, a large gift shop, a pastry and ice cream shop, and restrooms. 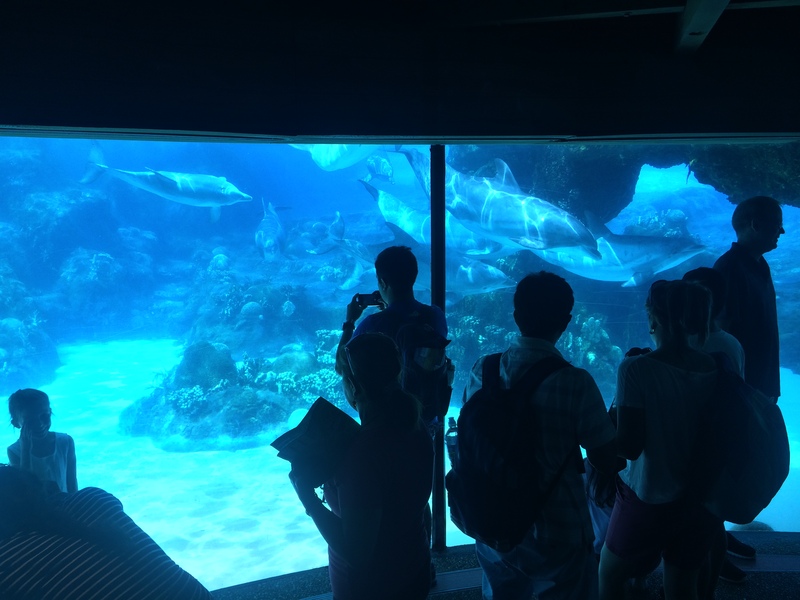 You can also make reservations for additional charges for special behind the scenes tours and activities like the Conservation tour or going behind the scenes in the Dolphin or Orca shows and other tours. 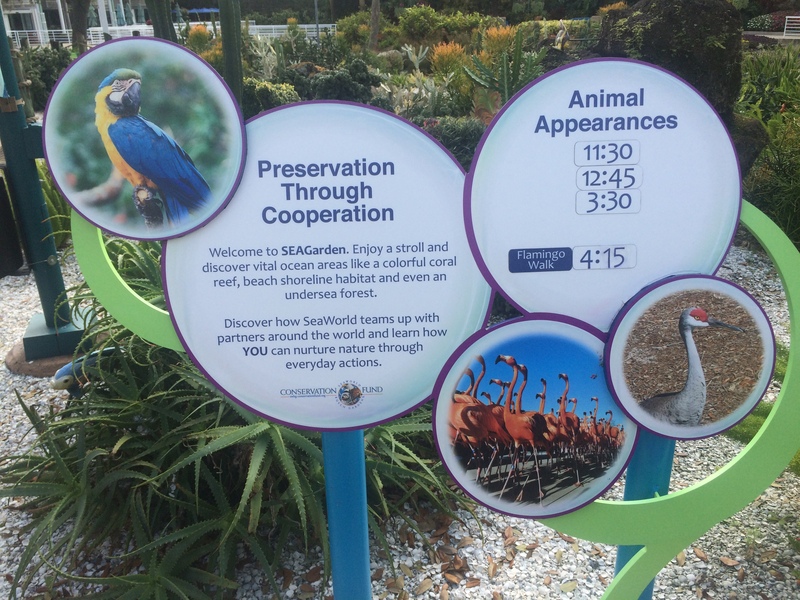 You can also purchase reserved seating if you do want to risk walking up to the stadium and seeing one of these signs in front, or you can just get there at least 30 minutes before the show starts to ensure you and you group get a seat. 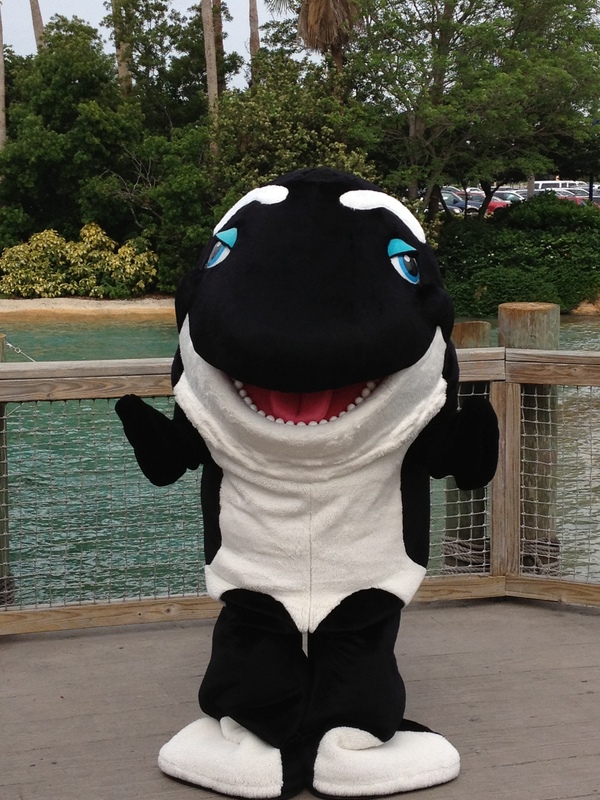 This area is also where you can get a photo taken with Shamu. 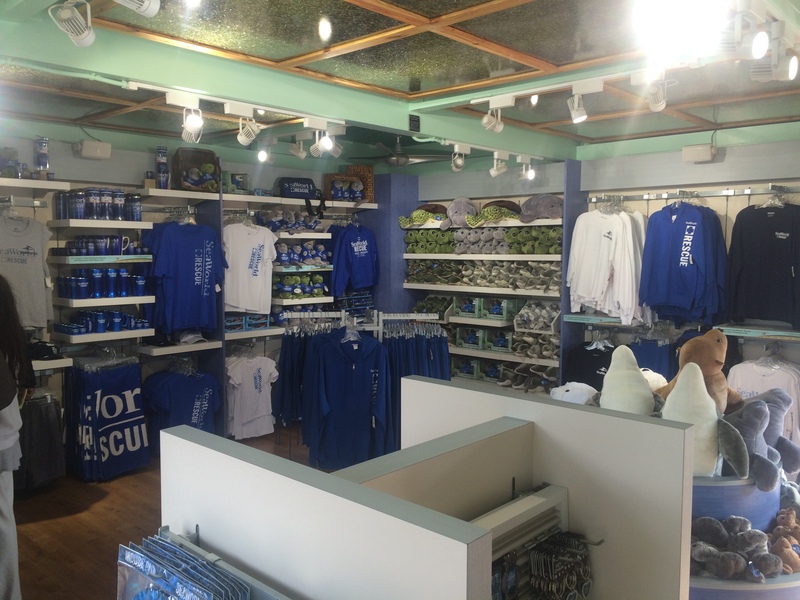 There is a new store called SeaWorld Rescue that occupies the former Shamu Store. 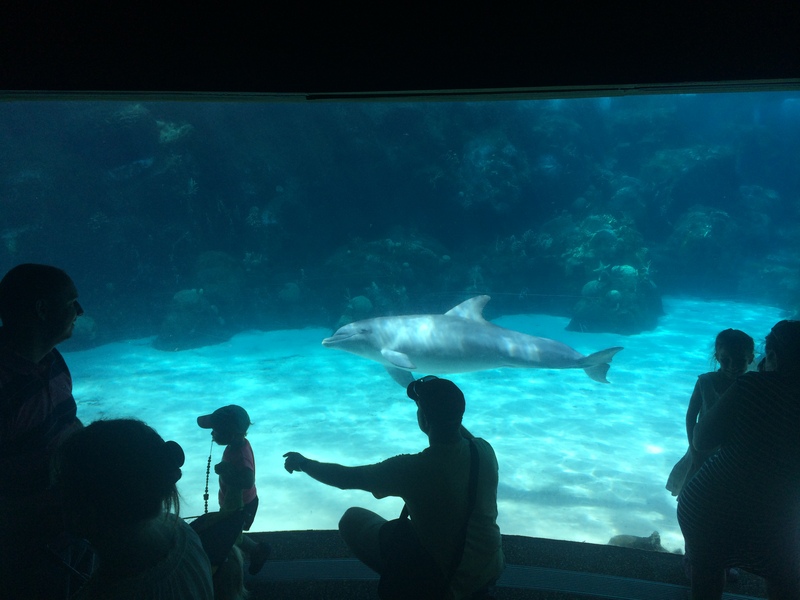 Here you can buy products related to their popular weekly TV show that highlights some of their rescues and also takes you through the rehabilitation and release process. 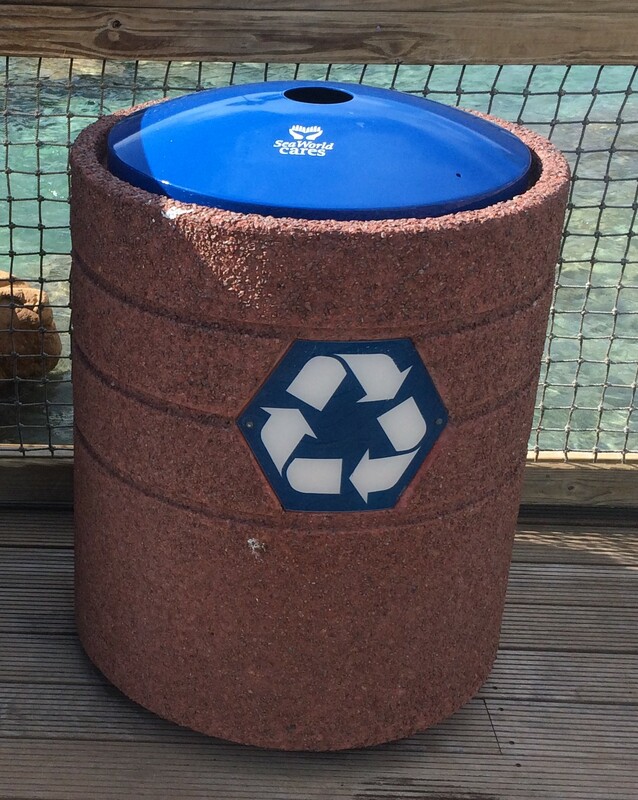 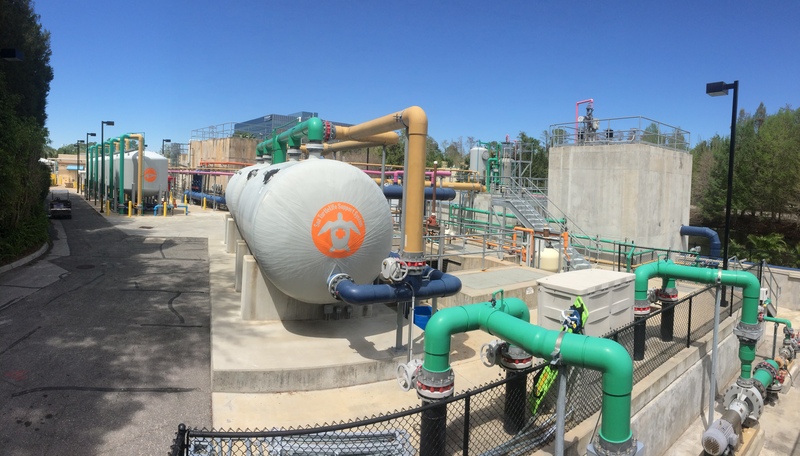 Both SeaWorld and Busch Gardens try very hard to use recycled material when they build new attractions and stores and this one is no different. 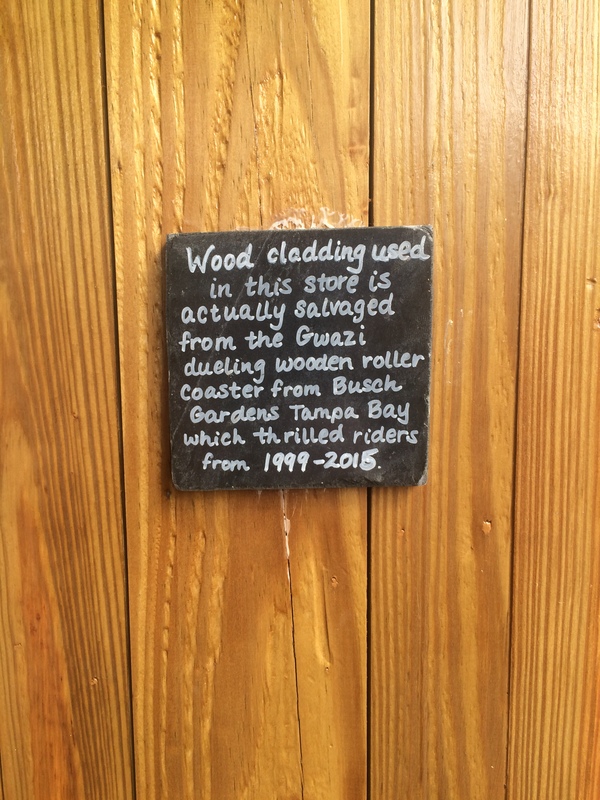 The wood you see here is reused from the Gwazi wooden roller coaster which operated at their sister park, Busch Gardens Tampa, from 1999 to 2015 and the ceiling panels are made of crushed glass. 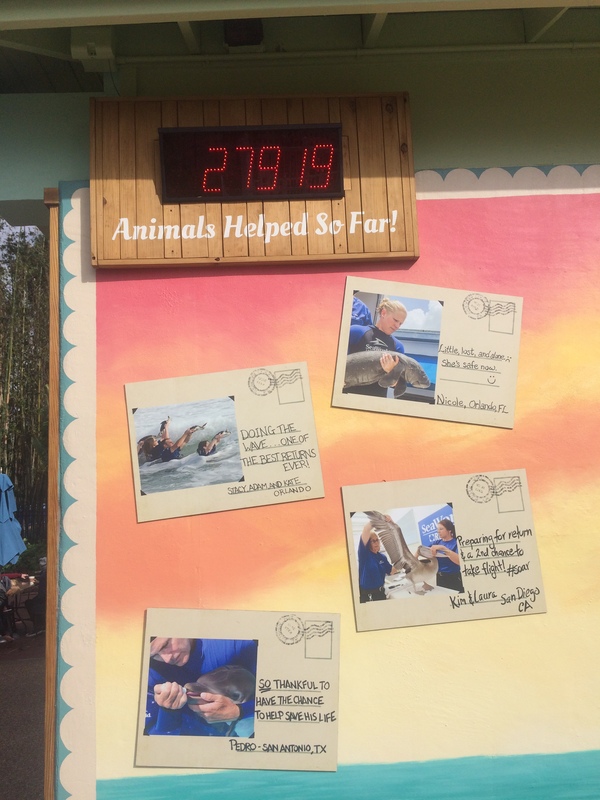 Outside the store is a photo opportunity and a rescue counter that informs park guests just how many rescues SeaWorld has performed to the present date. 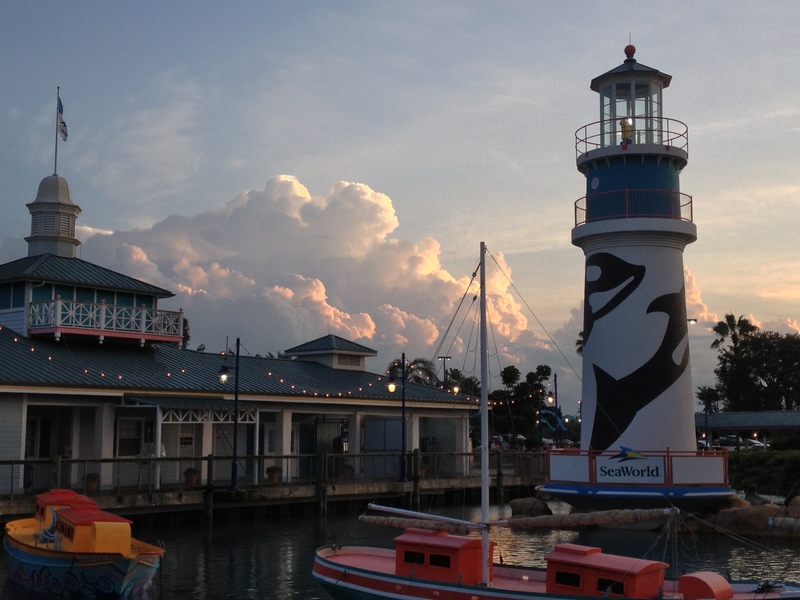 Now we come to a point where we can turn right and go to the Waterfront area or go left to Manta and the Key West area. 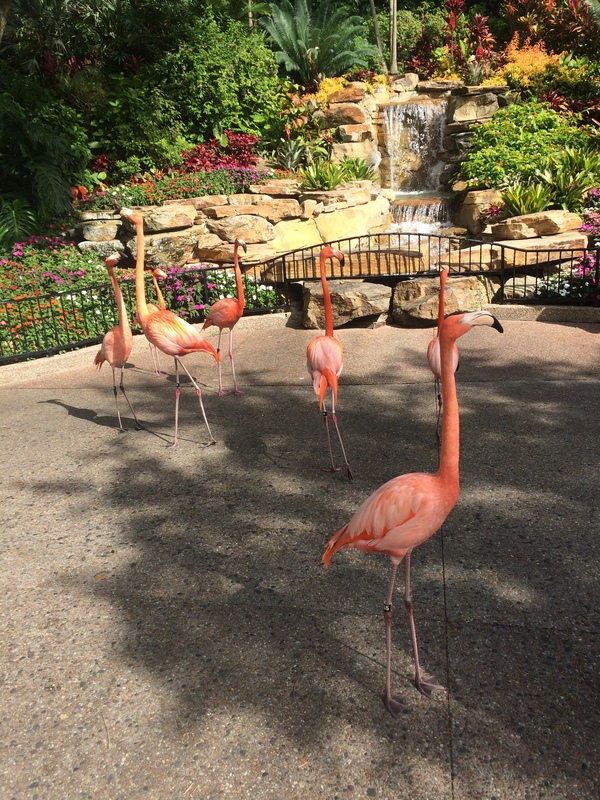 We’ll go left and enter our first area but before we do that, I need to tell you that SeaWorld does let out some of the Flamingoes to walk the park with escorts on occasion so keep an eye out for that special photo opp when it occurs. 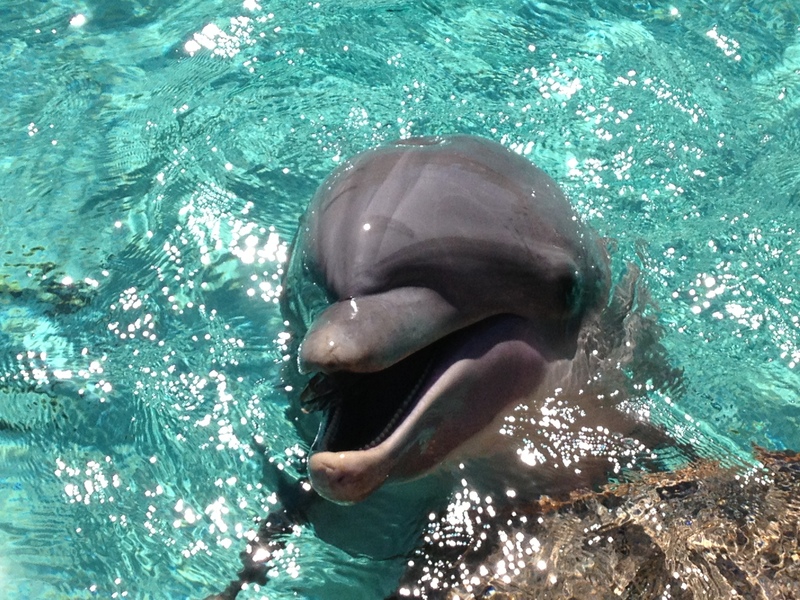 The one on the left was taken right at the waterfall photo spot outside the Dolphin Stadium near the Journey to Atlantis water coaster and the other two were taken near the Stingray pool in the Key West area. 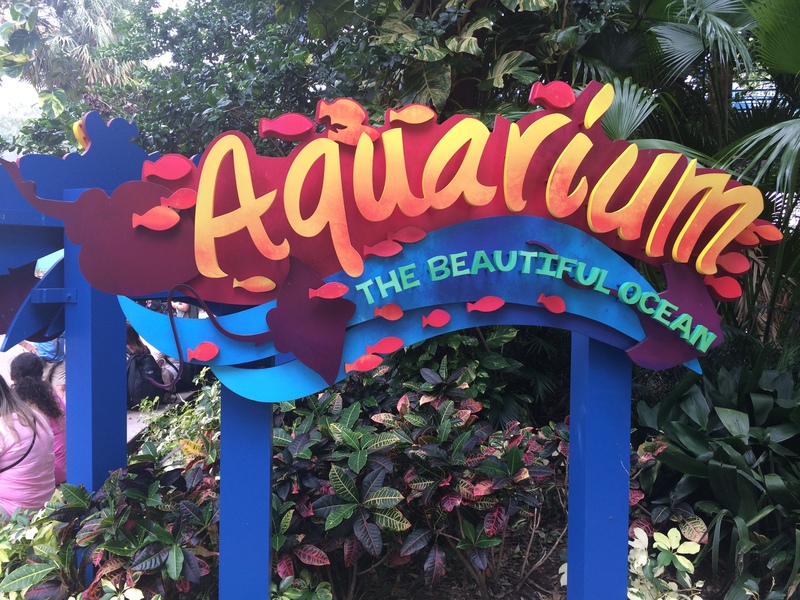 This area is themed to animals that you would see in the shallow parts of the oceans which includes turtles, manatees, manta, stingrays, flamingoes, and alligators. 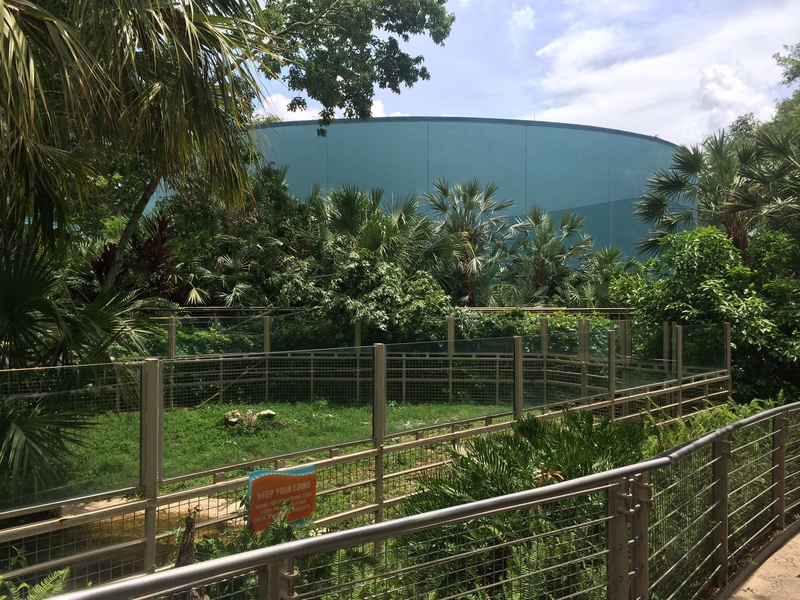 This area has two attractions, a show, several animal interaction and observation areas, and a sub section called Key West. 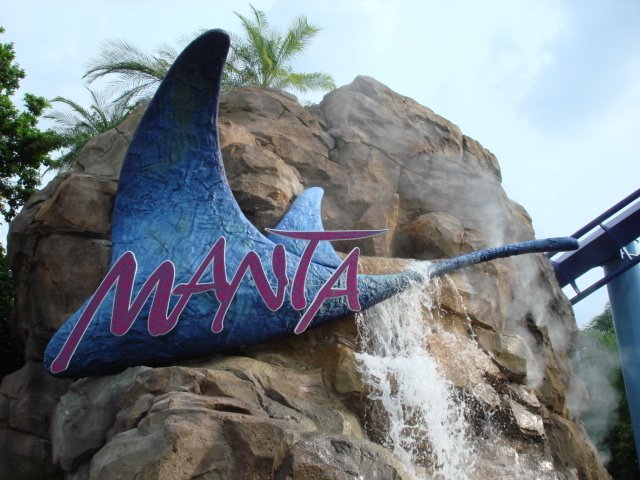 The first attraction is a Flying steel roller coaster called Manta. 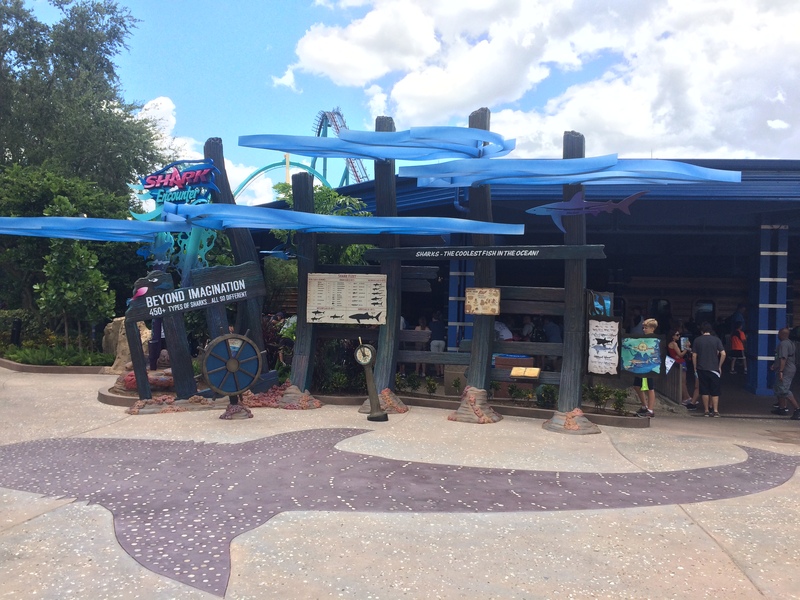 This ride is well themed with several aquariums in the queue (line). 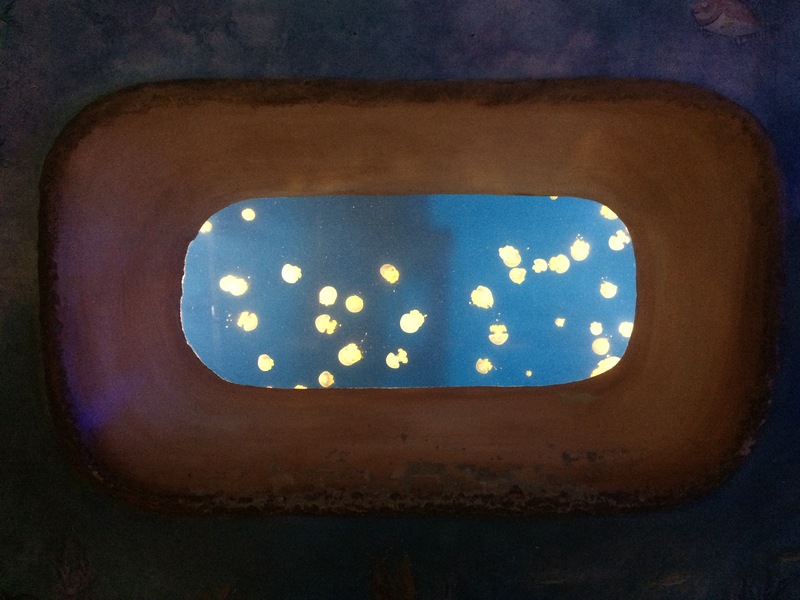 The photos above are actually two aquariums in one with the small fish in the aquarium in the front and the large aquarium in the back. 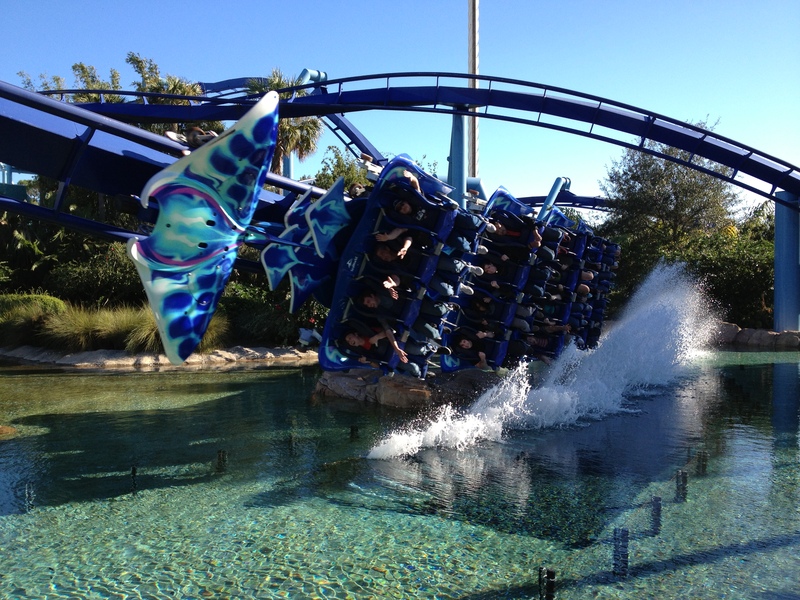 Manta is a Flying steel roller coaster from B&M and is one of the best Flying coasters I’ve been on. 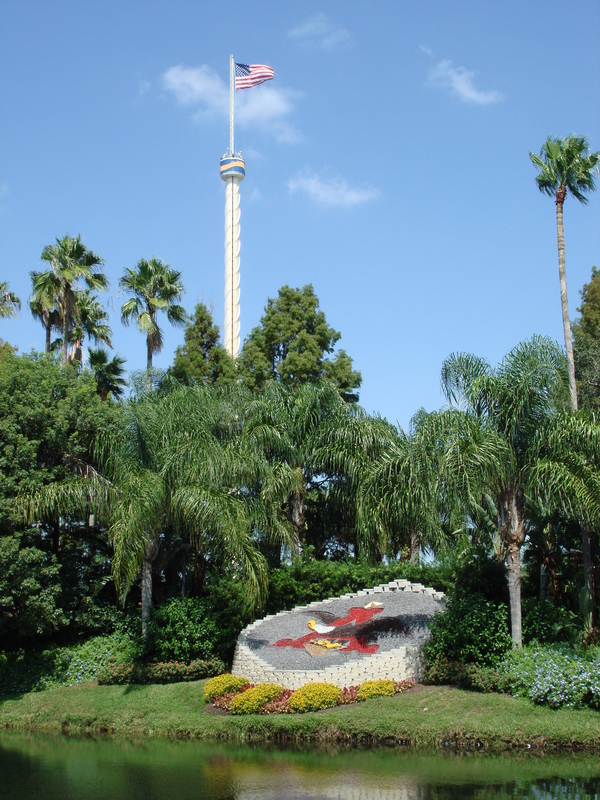 It opened here on May, 22, 2009 and is 140 feet tall, has a 113 foot first drop, a length of 3,359 feet, four inversions, and a top speed of about 56 mph. 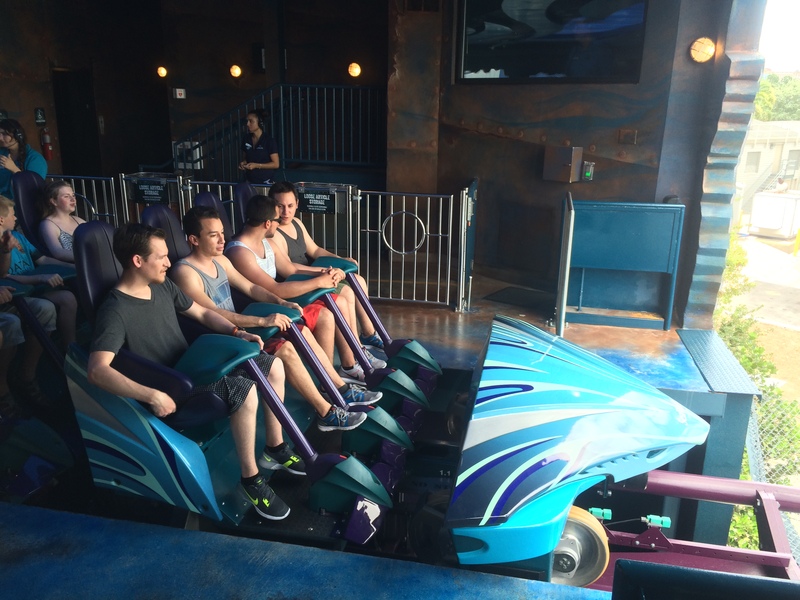 I recommend riding in either the front or back rows as the ride experiences are completely different even though they’re on the same ride. 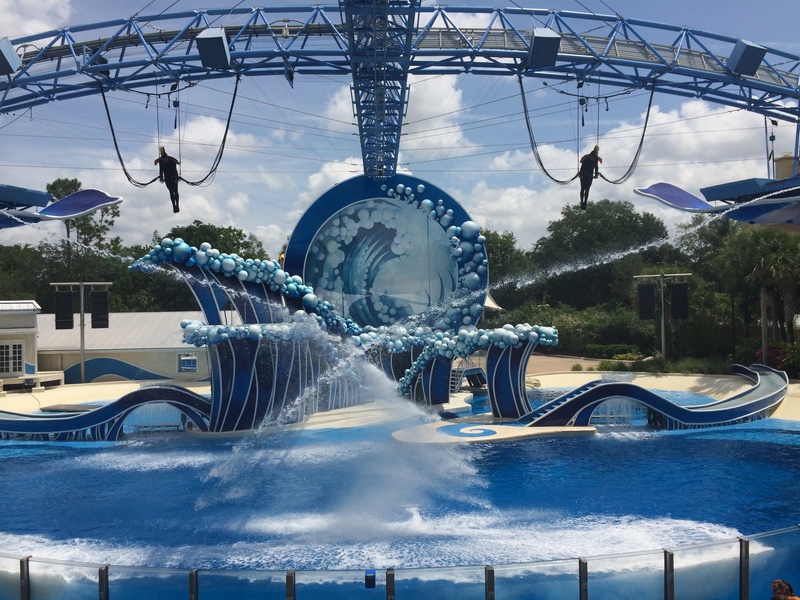 It may look like you get wet while riding, but that splash is mainly for the effect, those that are sitting on the far right side might get their right foot wet a little bit but that’s it. 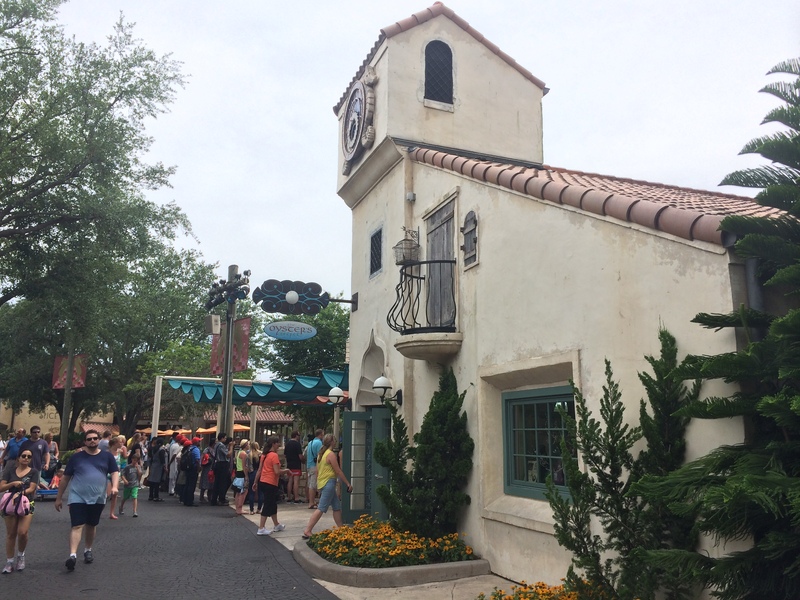 Here’s my off ride video I shot during the media event on May 21st, 2009 which includes a walk-through of the queue. 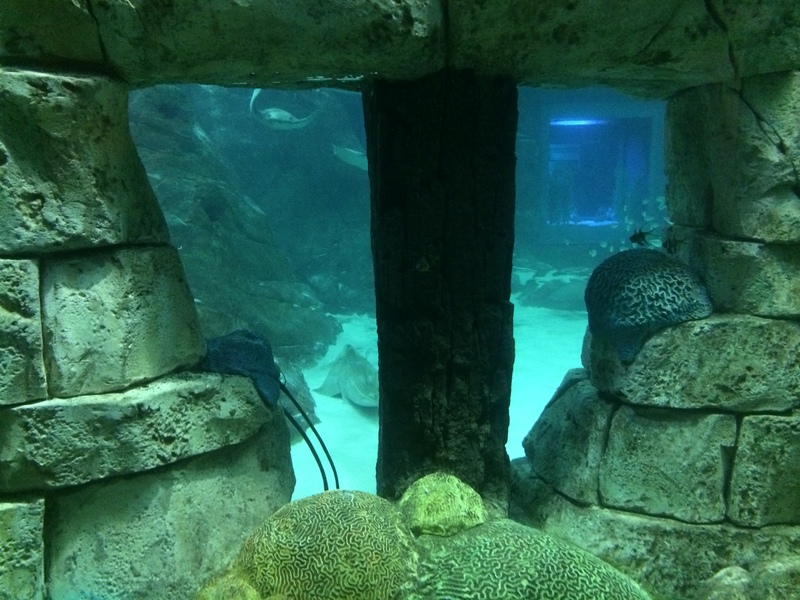 You can go past the entrance to Manta and see the same large aquariums and a few more including one you can climb into the middle of without getting wet. 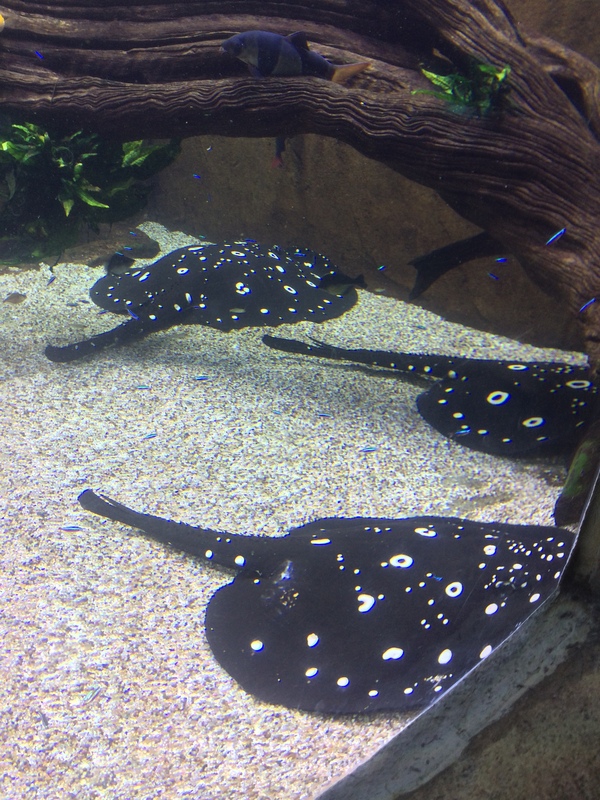 Here’s my video of the Manta Aquarium. 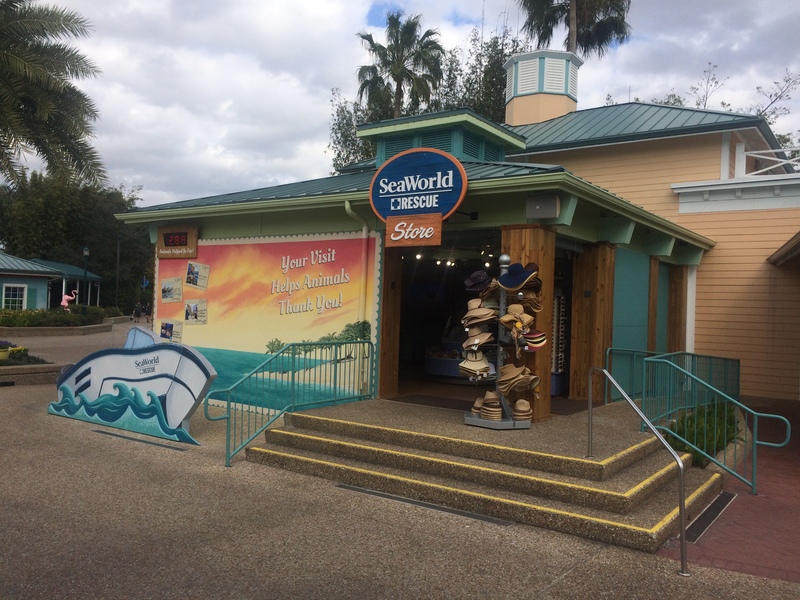 It should be noted that the area that the last half of the roller coaster as well as Manta’s station house and aquarium takes up what used to be the Worlds Oceans Aquarium which had a Flamingo area as well. 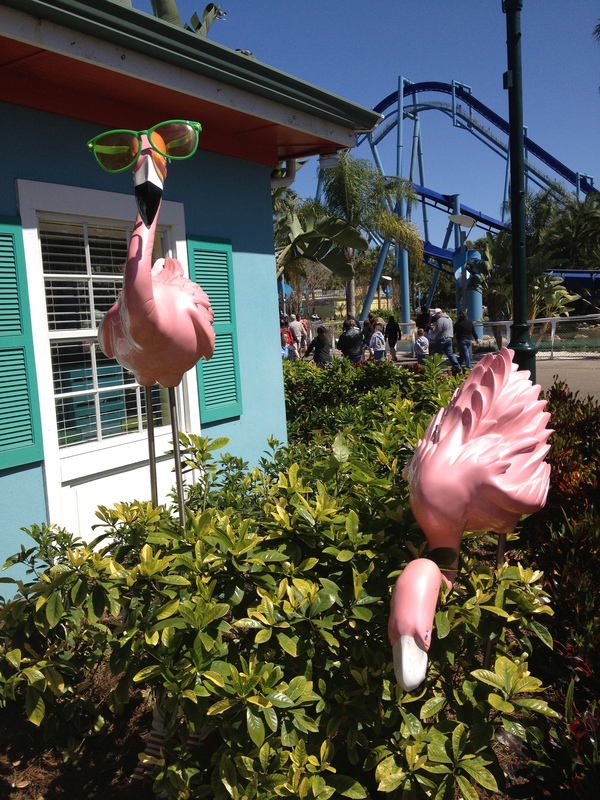 Fortunately, the Flamingos were moved just a few feet from where they once were and are across the way from the Entrance to Manta. 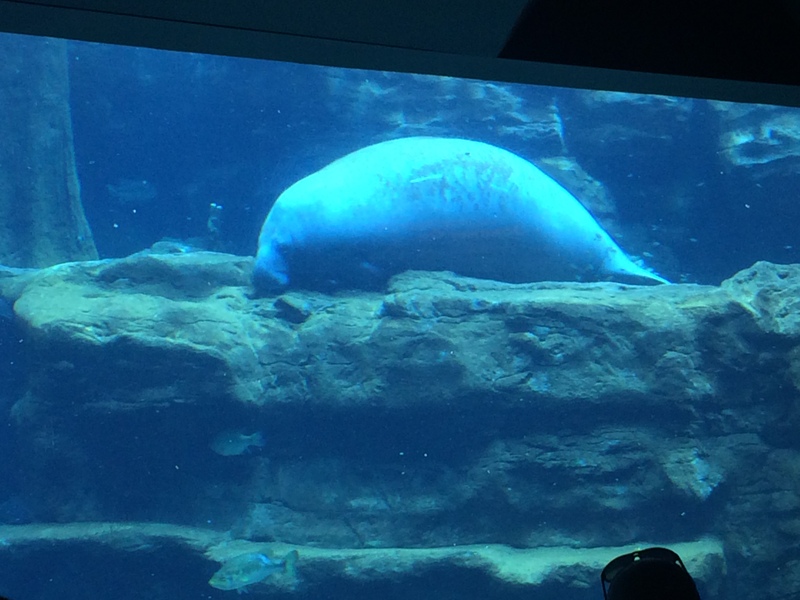 Now we come to the sub section in the Sea of Shallows. 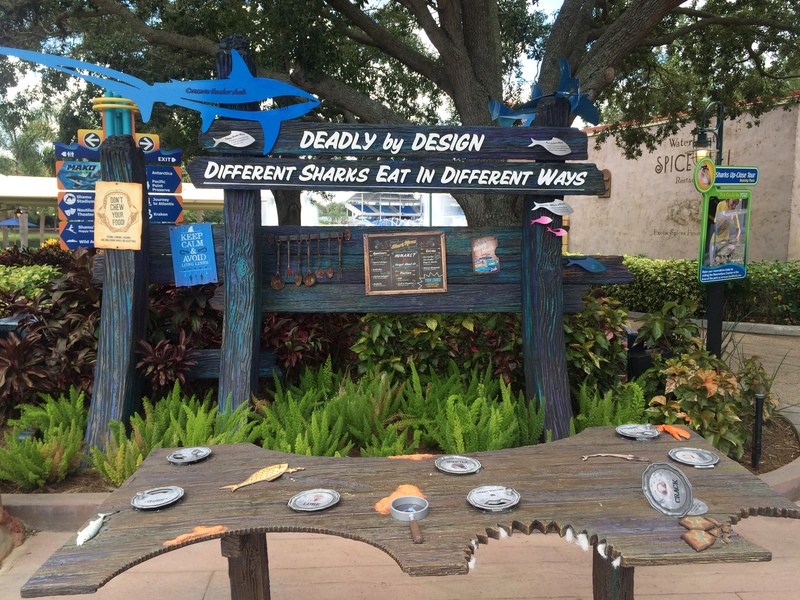 This area is themed to the Florida Keys and it has many animal interactions and displays as well as a few gift shops, a small outdoor counter service restaurant, and restrooms. 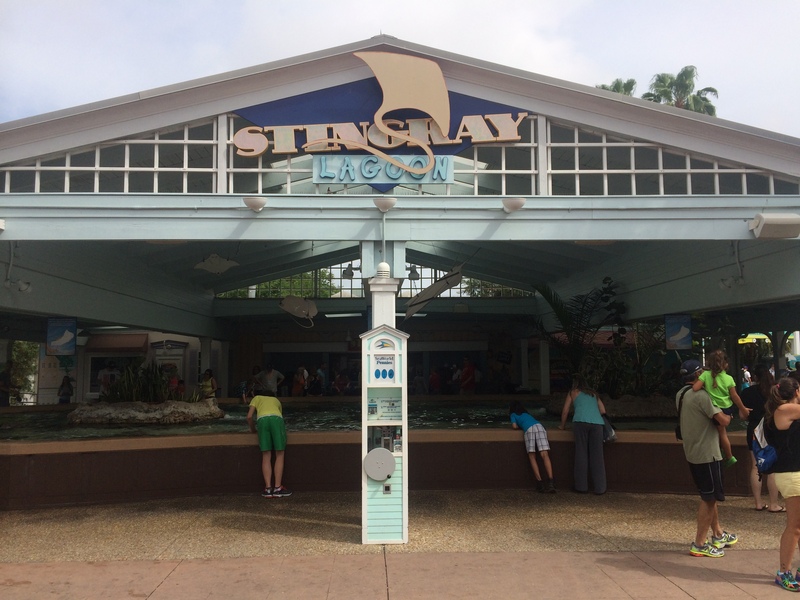 So we’ll take a left turn and stroll down the main drag and walk up to our first animal interaction area called Stingray Lagoon. 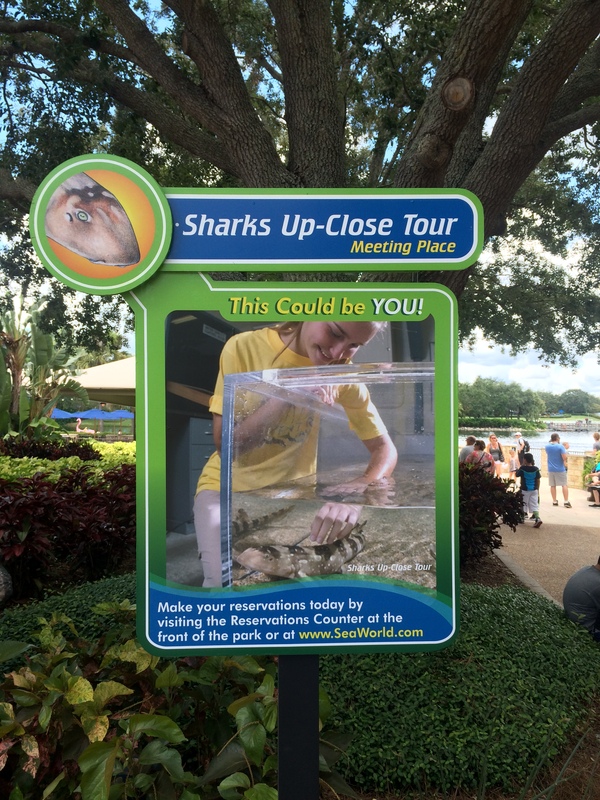 Here, you can pet and even feed the Stingrays, the feeding is an additional charge but the petting is still free. 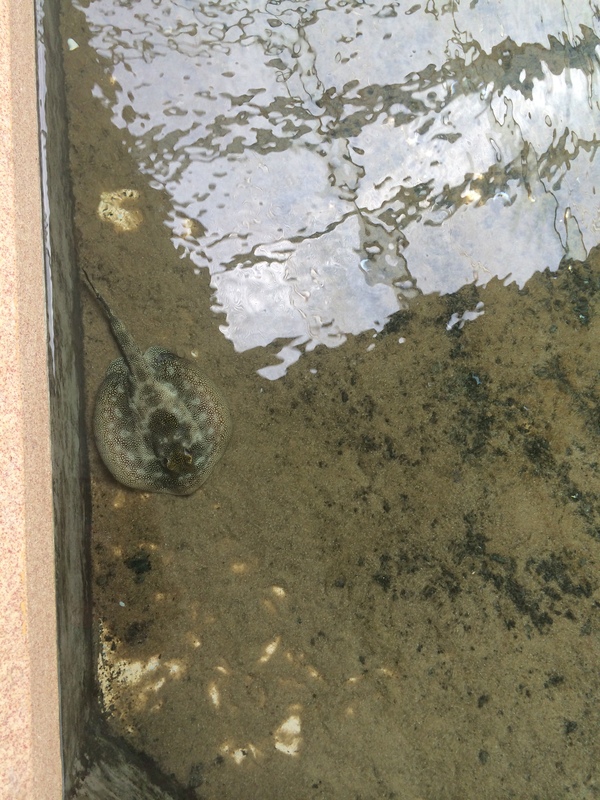 There’s even a small pool where the baby Stingrays are kept, feeding and touching are not allowed here. 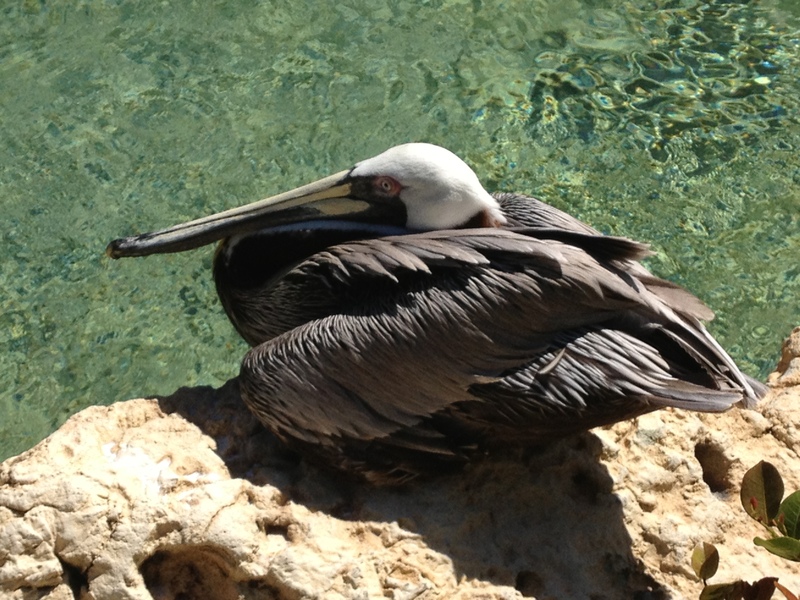 Now we’ll move on to the next animal exhibit called Pelican Preserve. 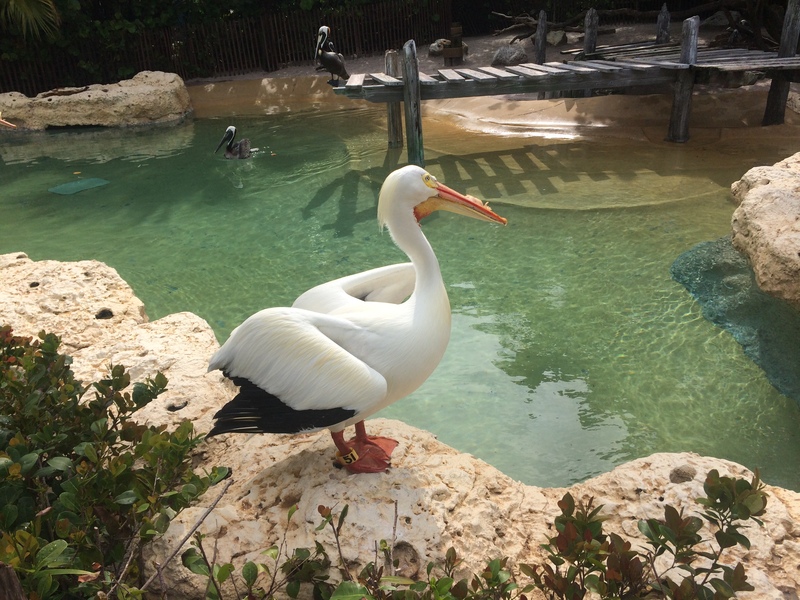 Pelican Preserve is home to many different species of Pelican and Sea Turtles that were rescued, rehabilitated, and unable to be released back into the wild due to the extent of their injuries. 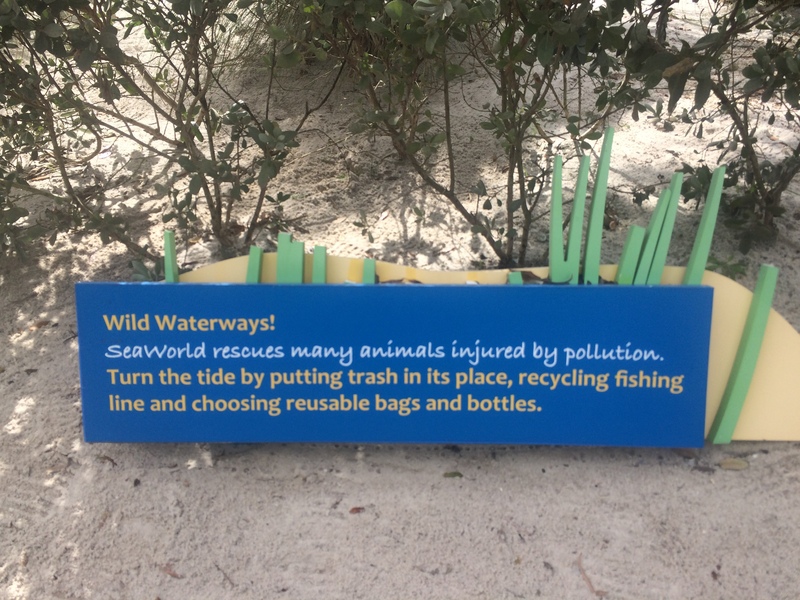 You can do your part in preventing injuries to the wildlife by not littering and recycling, as well as disposing your hooks in the proper receptacles like the one in the photo below. 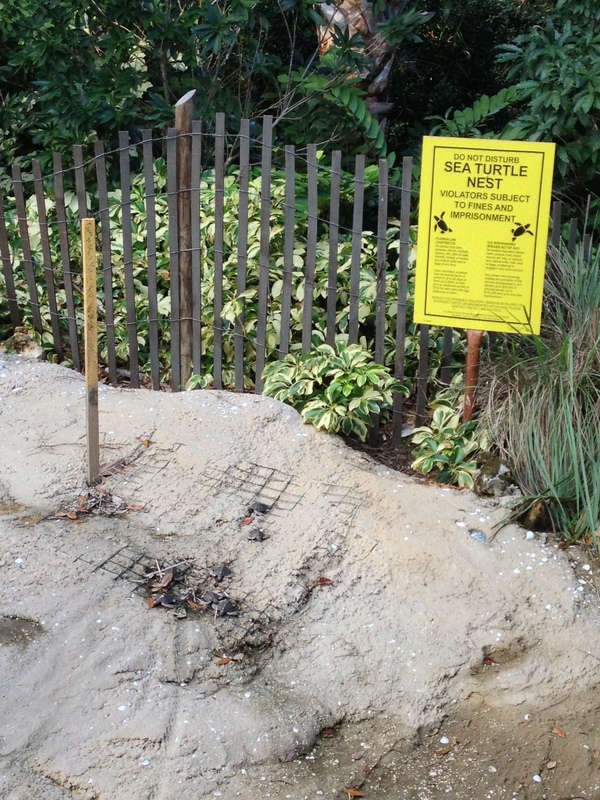 Don’t disturb the Sea Turtles nesting sites as you can be arrested as they are a protected species. 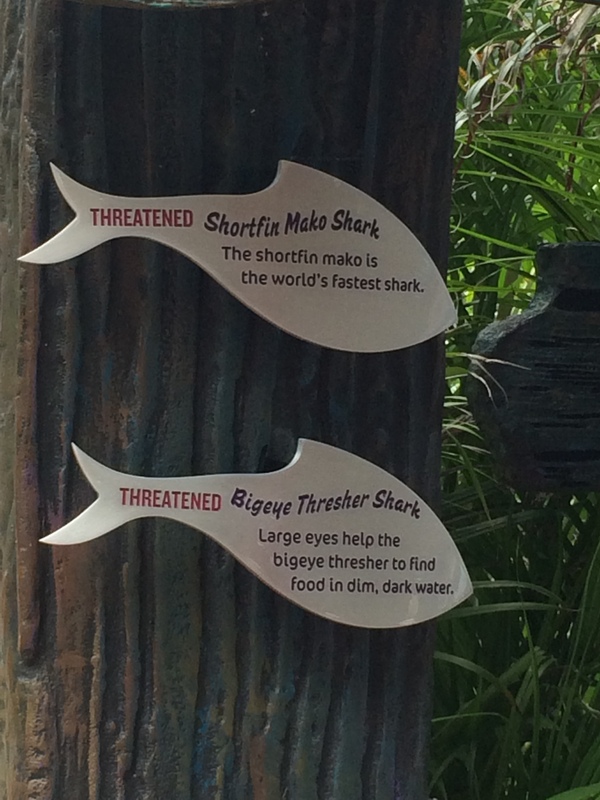 Look for these signs and or a net on the sand and please stay away from them. 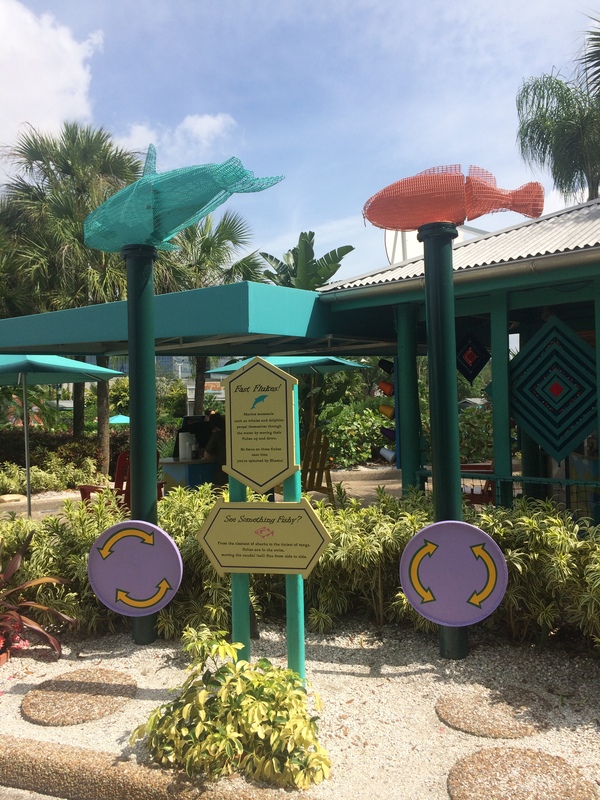 Nearby are some interactive tools for kids to enjoy such as these mechanical fish that have tales that can be moved by spinning the wheels at the base. 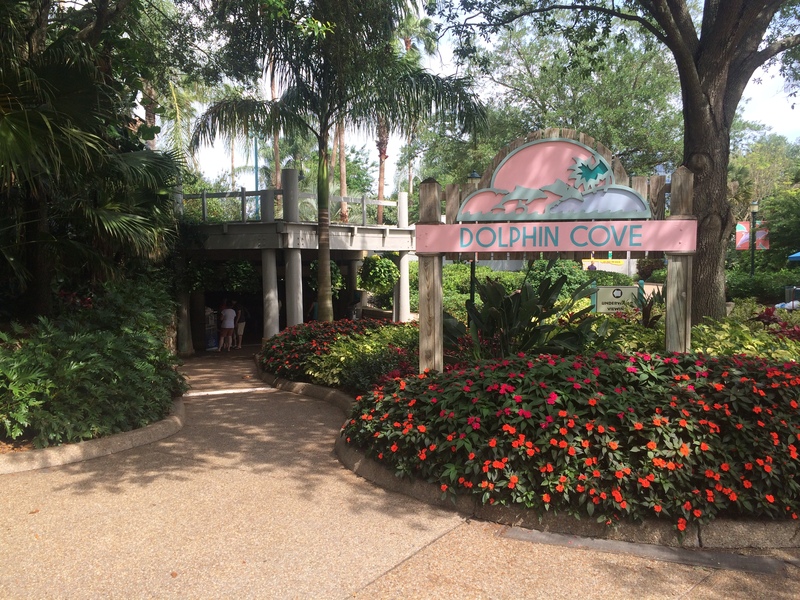 Next up is Dolphin Cove which is an animal interaction area where you can feed the Dolphins at certain times of the day for an additional charge. 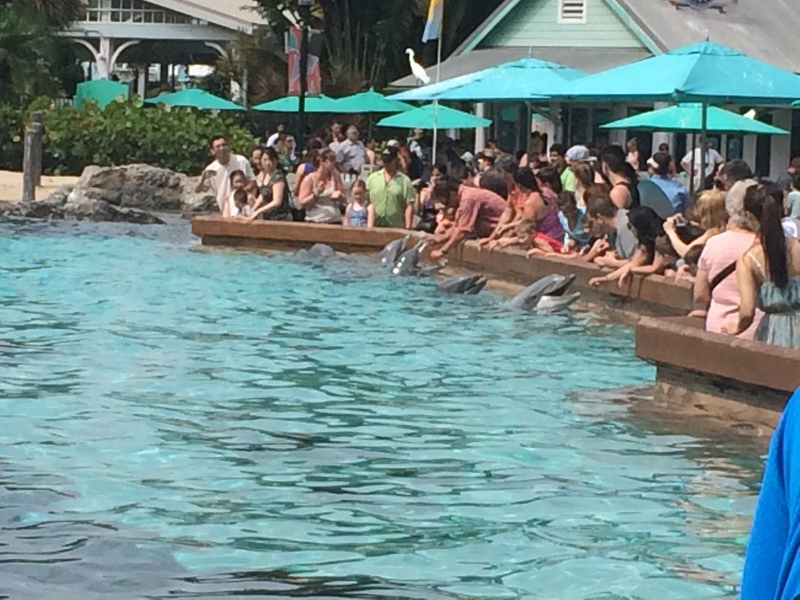 You can still see the Dolphins if you don’t want to feed them and there is always enough room to see them up close. 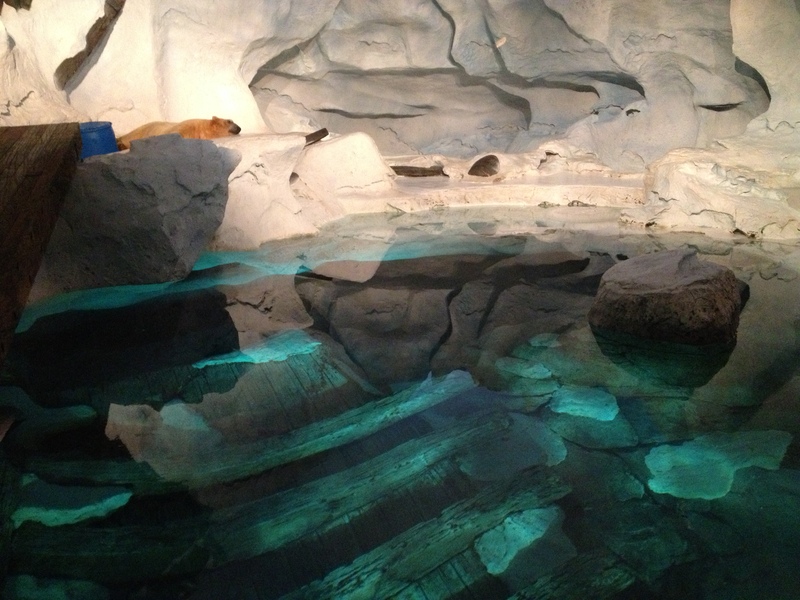 There’s even a viewing area on top of the rocks as well. 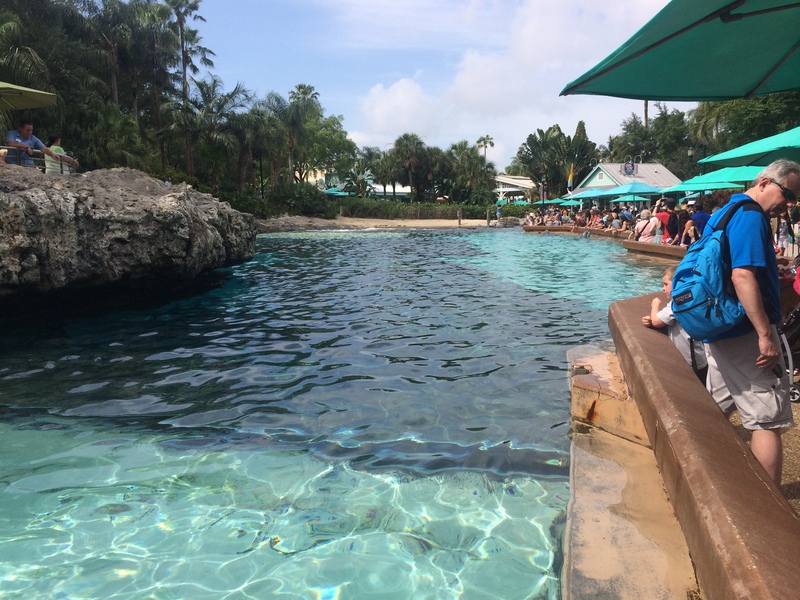 You can even see the Dolphins underwater in the underwater viewing area. 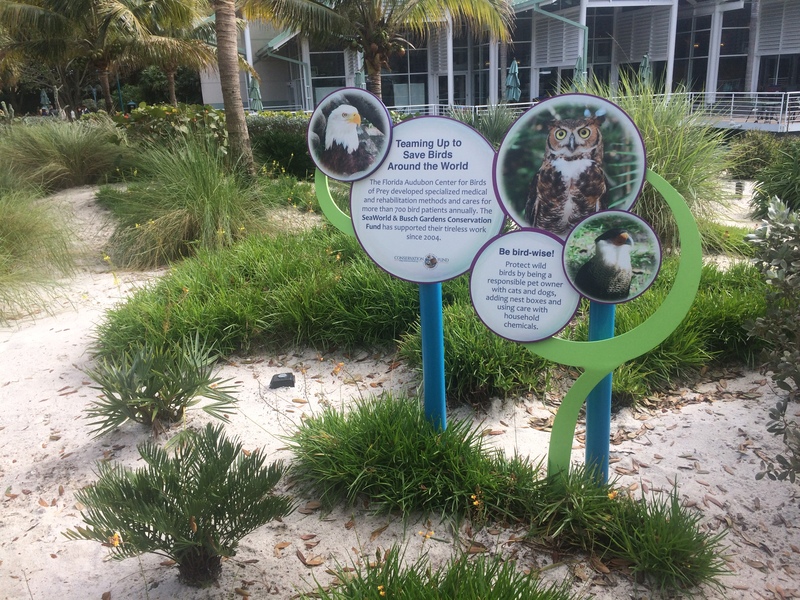 This is the last place in the Key West area and this is the meeting area where your Behind the Scenes Rescue & Rehabilitation tour begins. 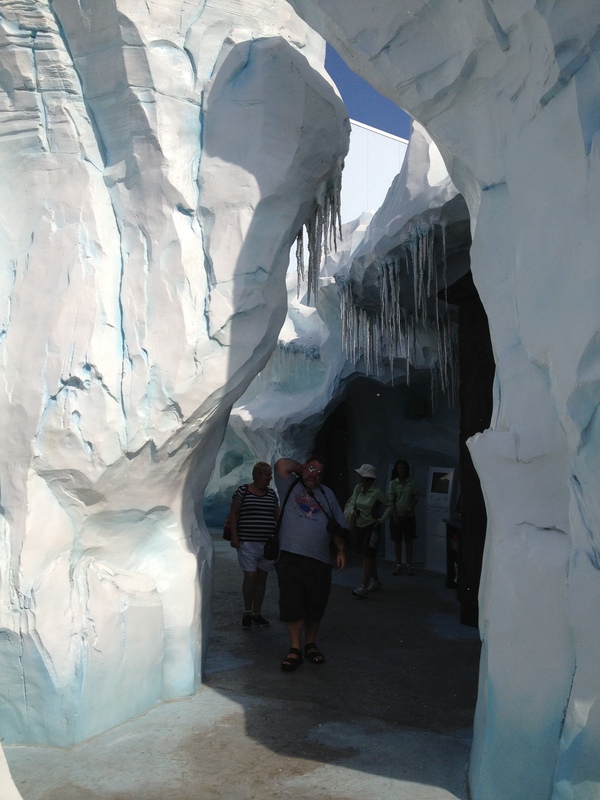 It’s one of the up charge tours I described in the Main Entrance park at the very beginning. 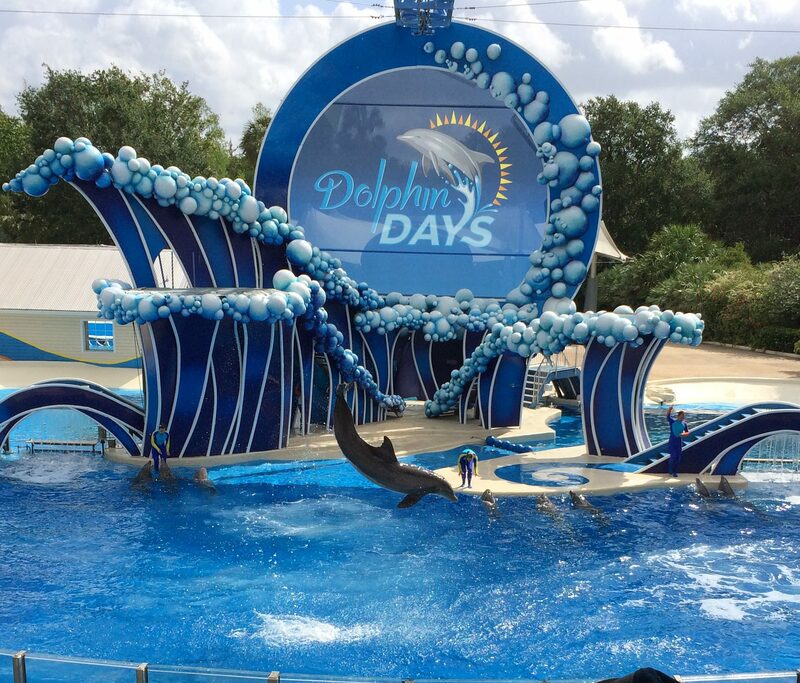 The tour is about 45-60 minutes long but you get to see how SeaWorld rescues, rehabilitate, and in many cases, releases the animals back into the wild. 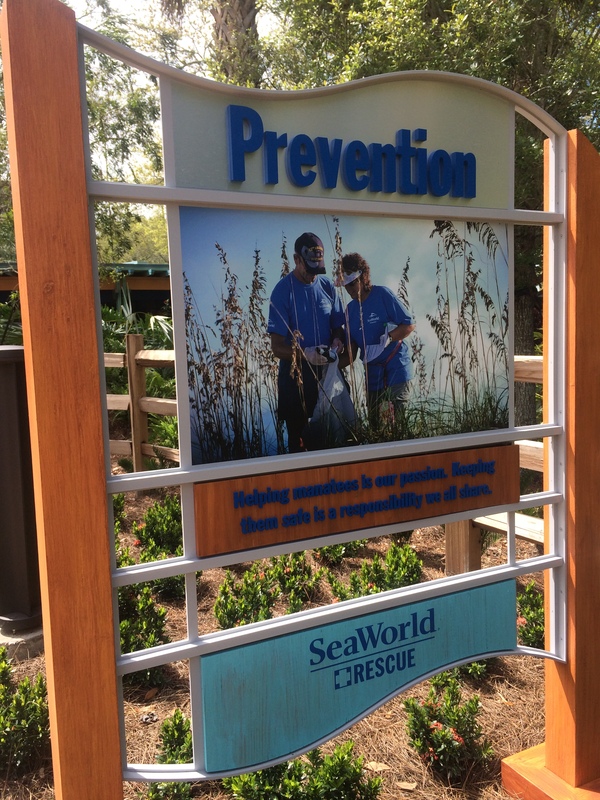 You’ll also learn how SeaWorld works and cares for its animals in the park as well. 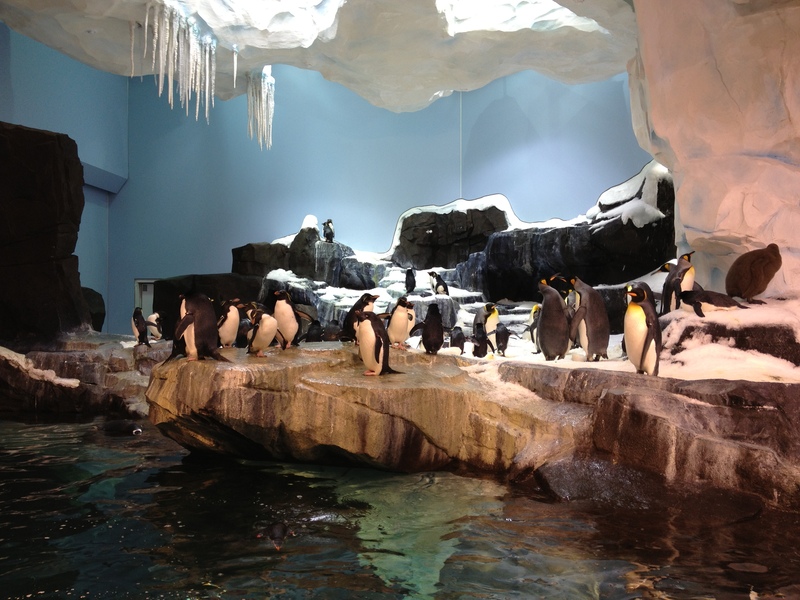 This is the meeting place for the Behind the Scenes Animal Rescue & Rehabilitation Tour. 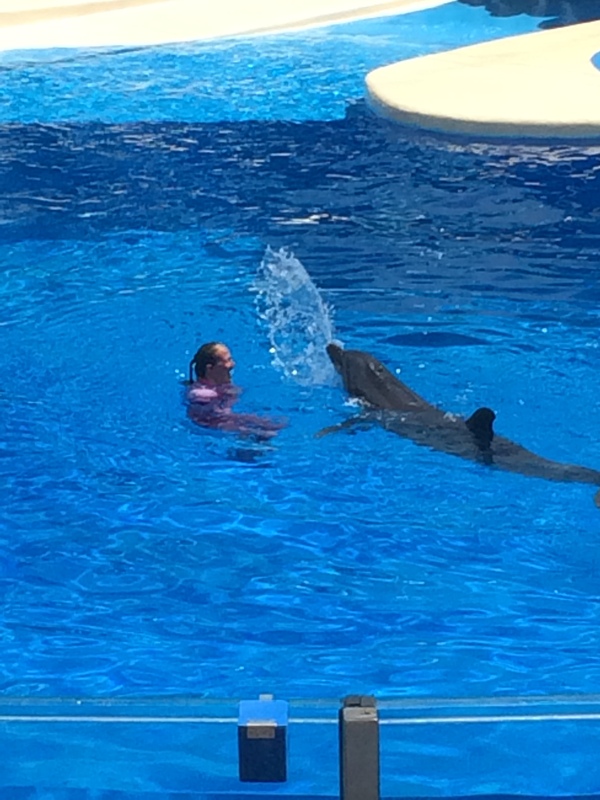 Here’s my edited video of this tour. 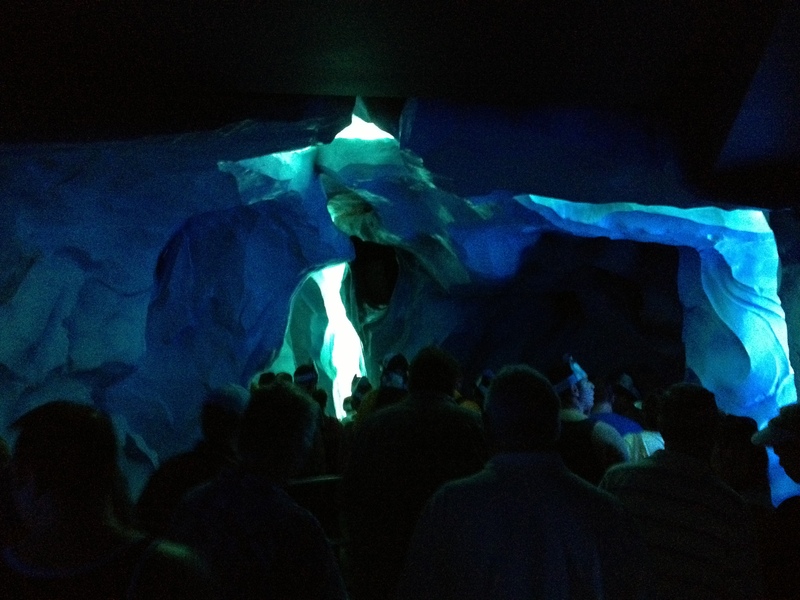 Next is an attraction called Turtle Trek. 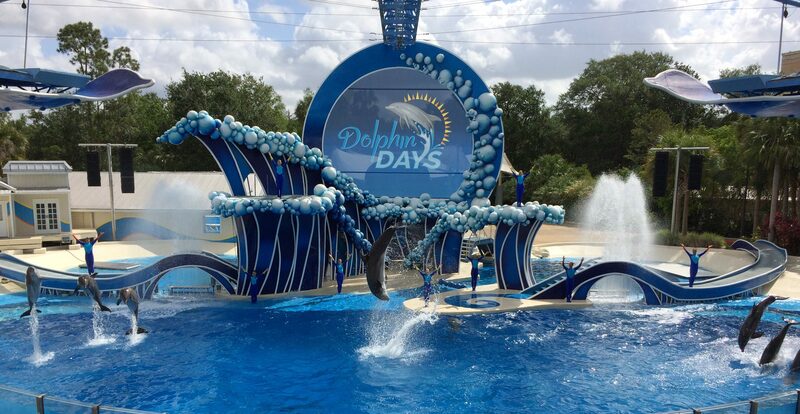 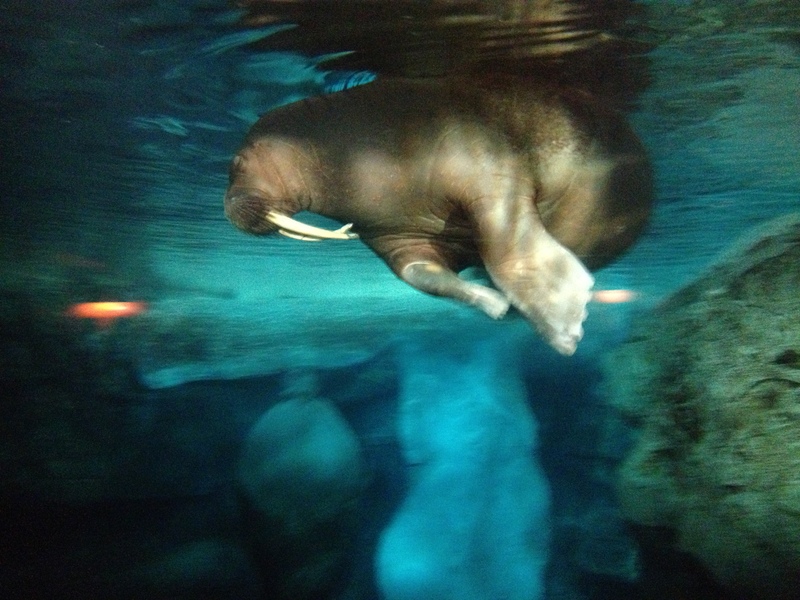 This attraction opened here in 2012 and replaced the former Manatee Rescue attraction which you’ll see in this video. 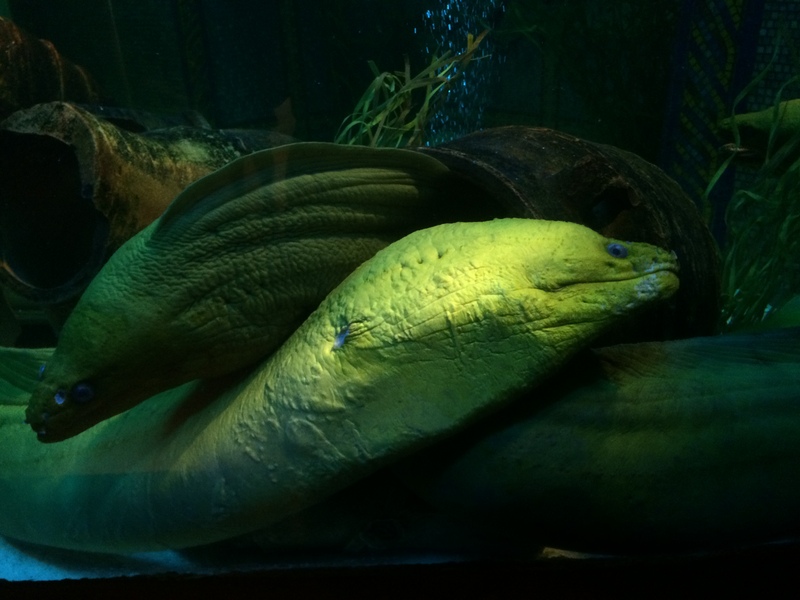 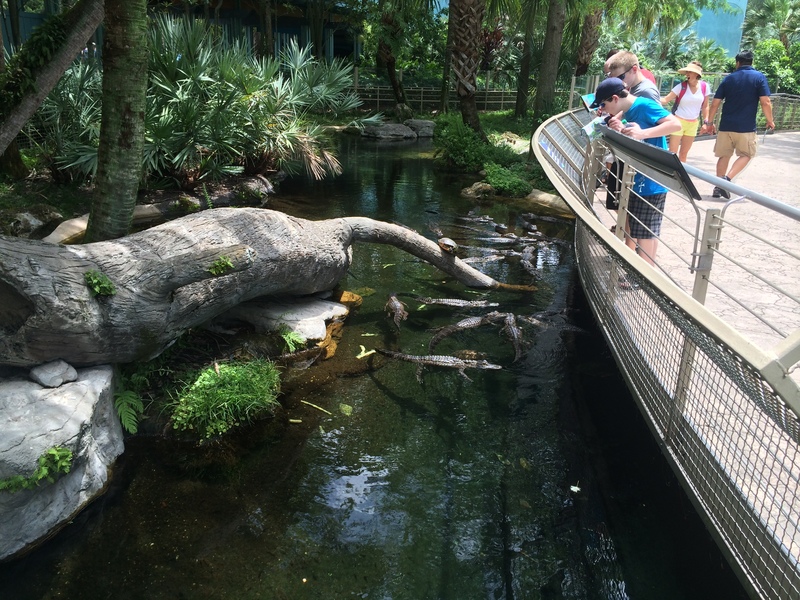 This attraction is an indoor and outdoor attraction that features rescued Sea Turtles and West Indian Manatees that can be viewed both indoors and outdoors as well as American Alligators that are outdoors as well. 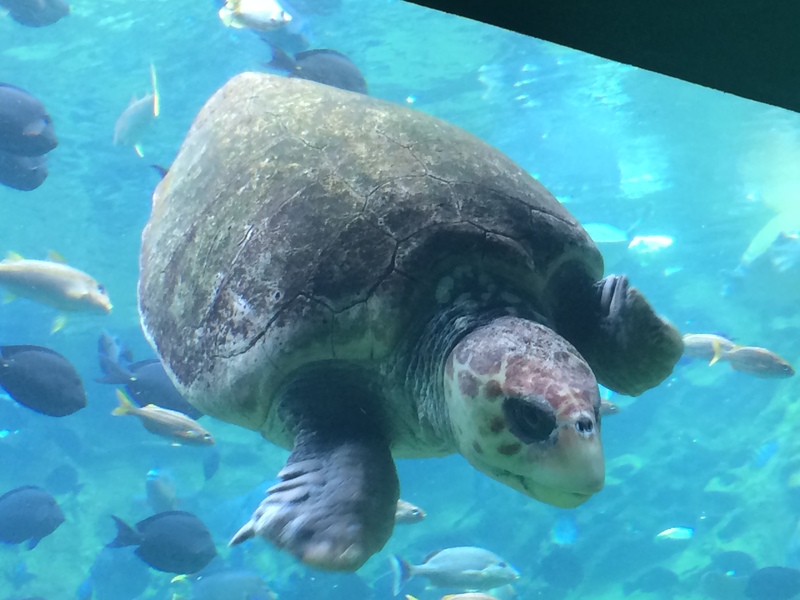 This attraction features the worlds first 360 degree domed theater featuring a completely computer generated film following the life of a Sea Turtle from the time she hatches to the time she returns to the same beach to lay her own eggs. 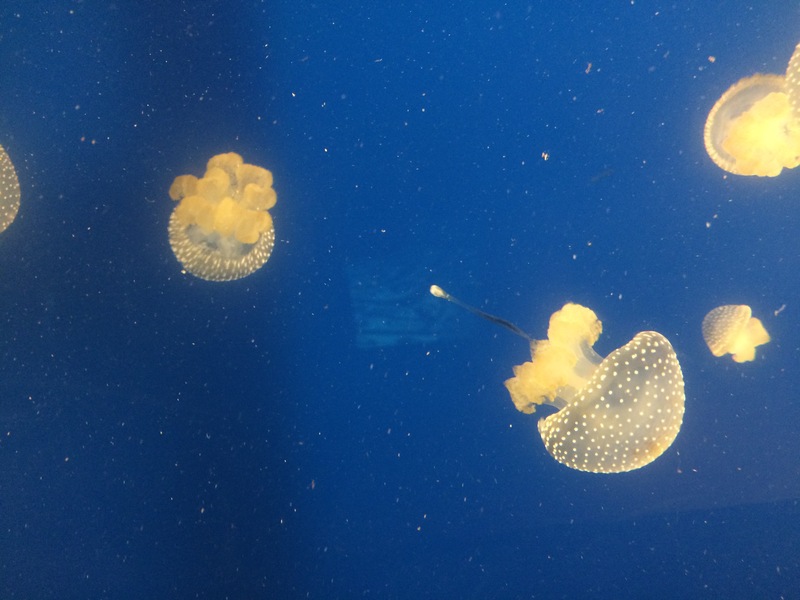 It really is an incredible experience as you really feel like your swimming through a group of jellyfish, escape a commercial fishers net that is equipped with a TED (Turtle Excluder Device), and many other adventures. 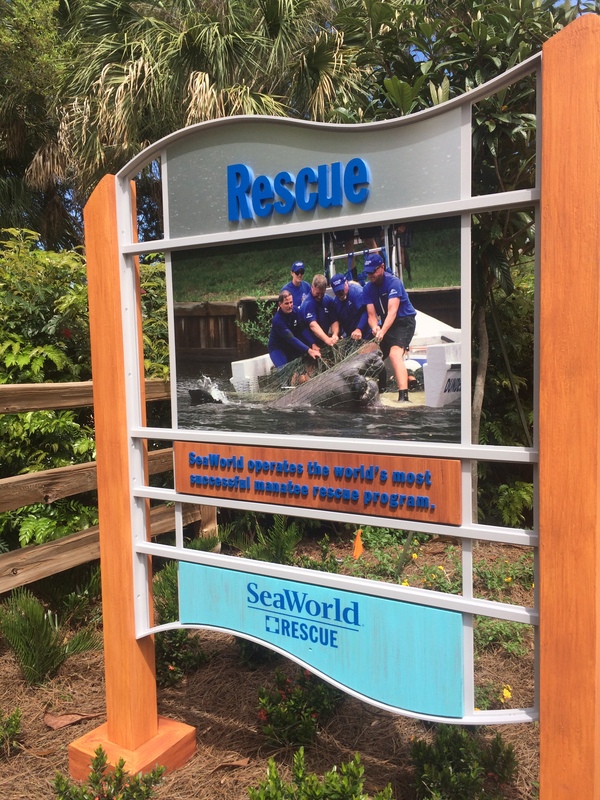 The Building in the background is the show building and the other picture tells you what SeaWorld does from rescue to recovery to release. 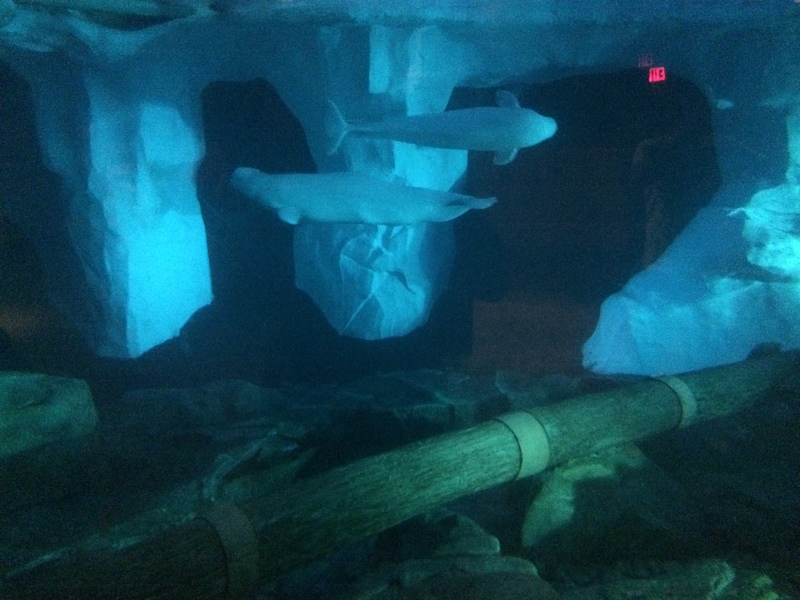 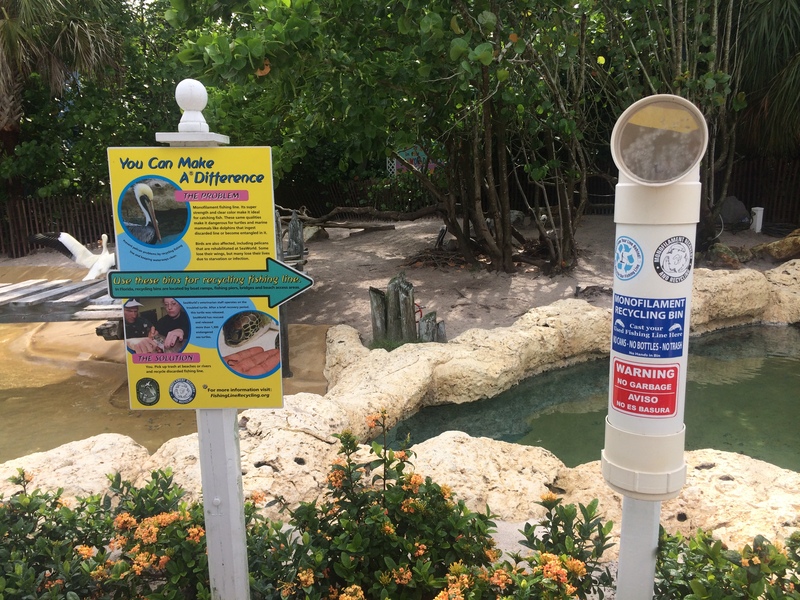 There also is the Manatee rehabilitation facility behind this exhibit that shows how manatees are rehabilitated and the facilities that are needed to maintain the habitats. 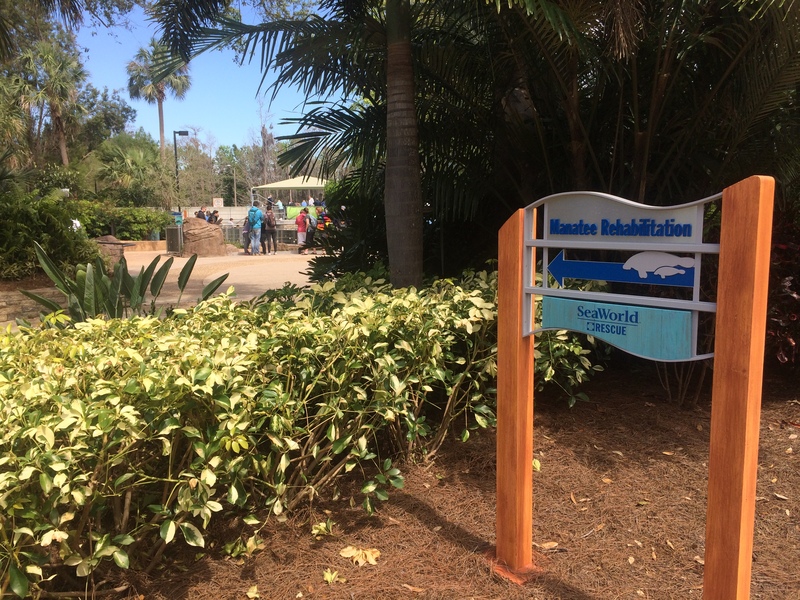 You’ll see several displays explaining what injures these gentle giants and what you can do to help mitigate their injuries by slowing down in designated manatee “no wake” zones and disposing of trash in the proper receptacles. 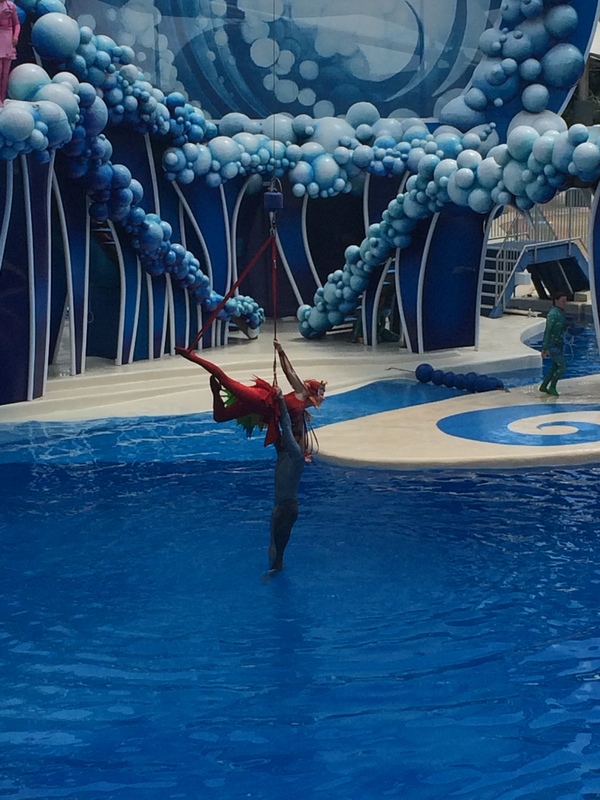 SeaWorld also runs a weekly show called Sea Rescue which has been and will be filmed at this park as well as their other parks in San Antonio and San Diego. 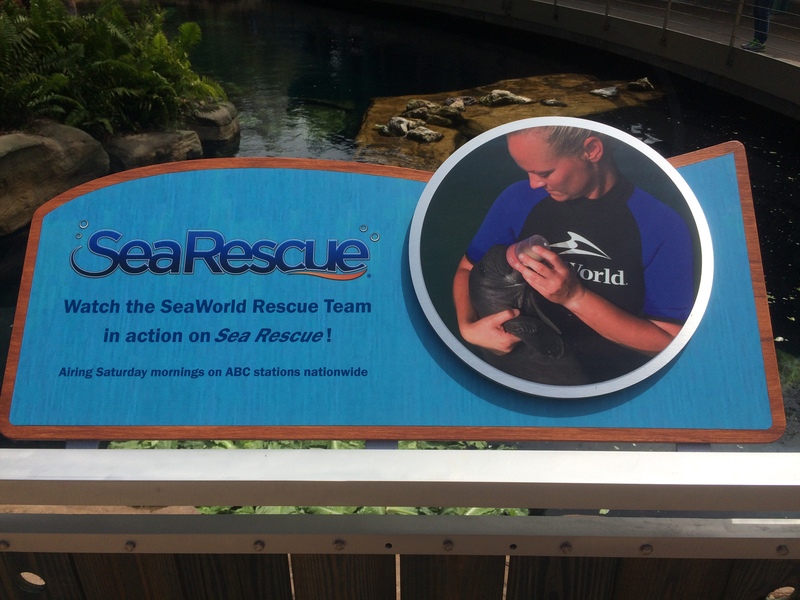 That show goes out “in the field” to rescue injured wildlife and then takes you through the rehabilitation process. 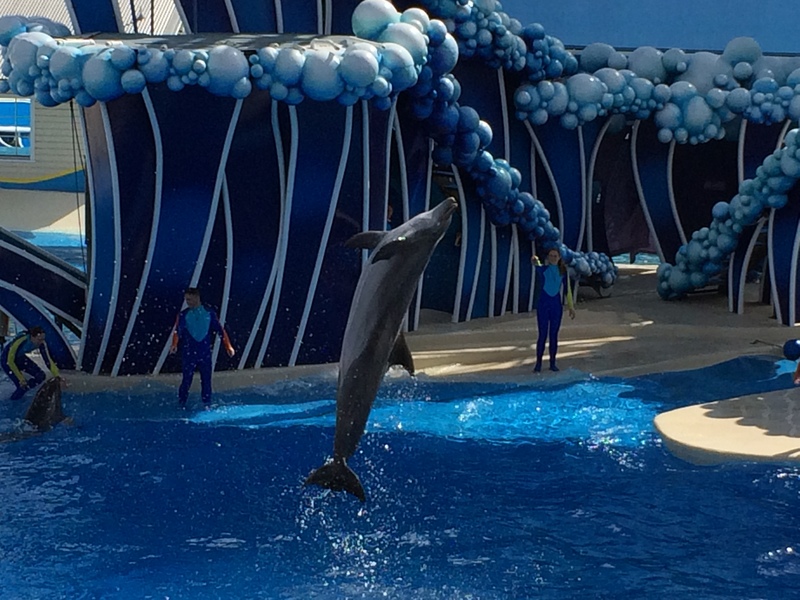 Check you local listings for show times. 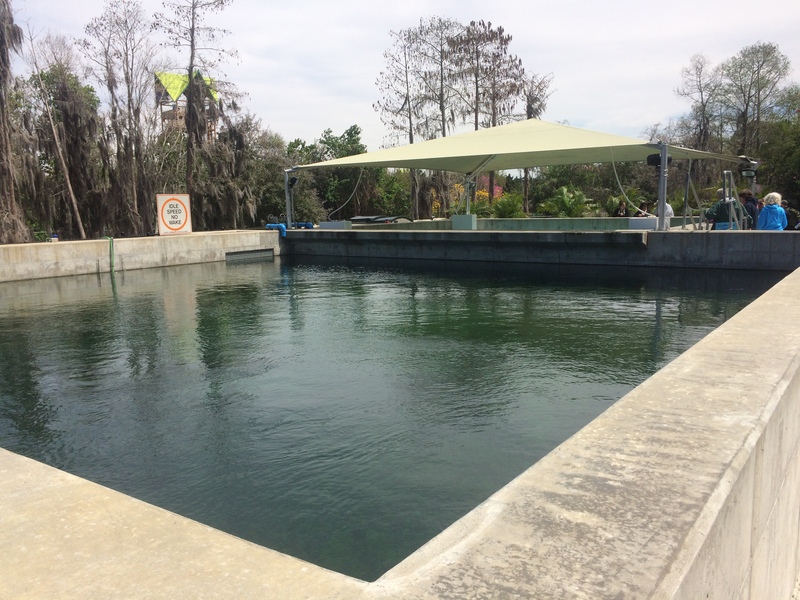 Next is the actual rehabilitation pools and the infrastructure needed to maintain the manatee habitats. 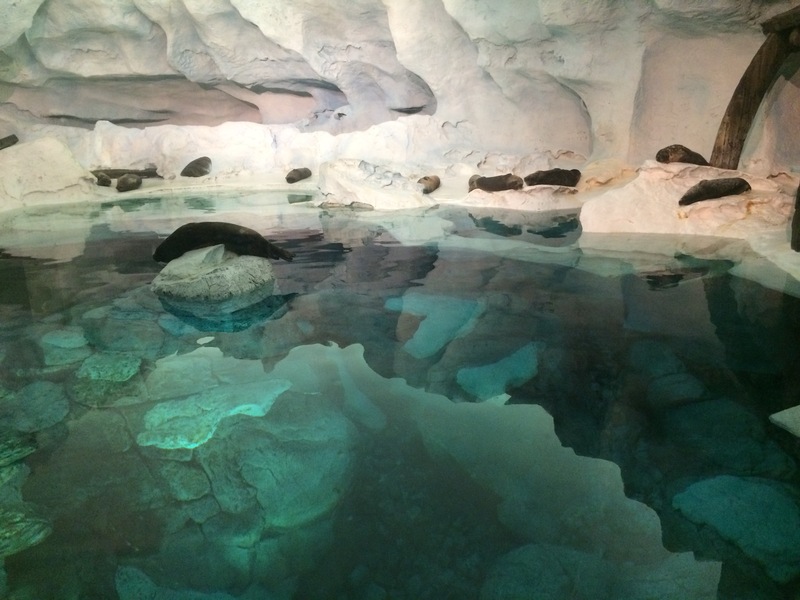 In the above photos, you’ll see that there are two pools. 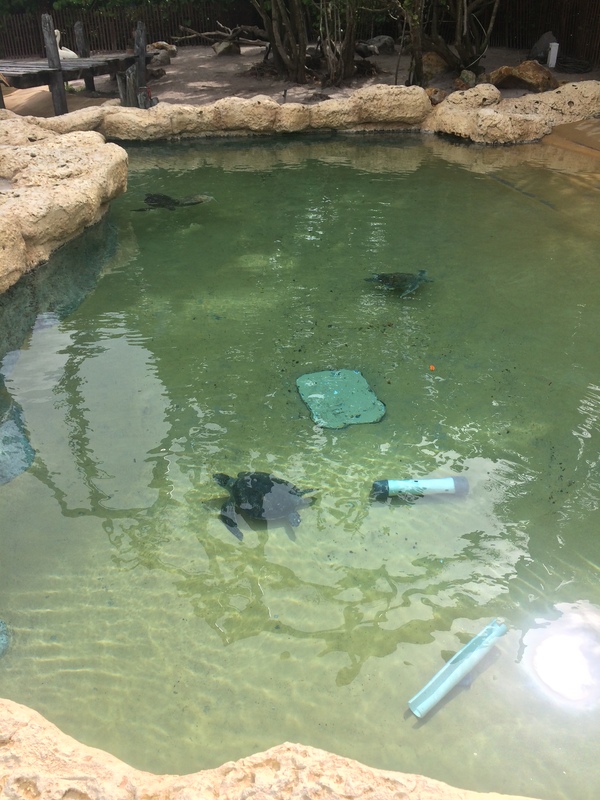 The first one had nothing in it but the second pool had two rescues, one from cold stress, and the other from a boat strike. 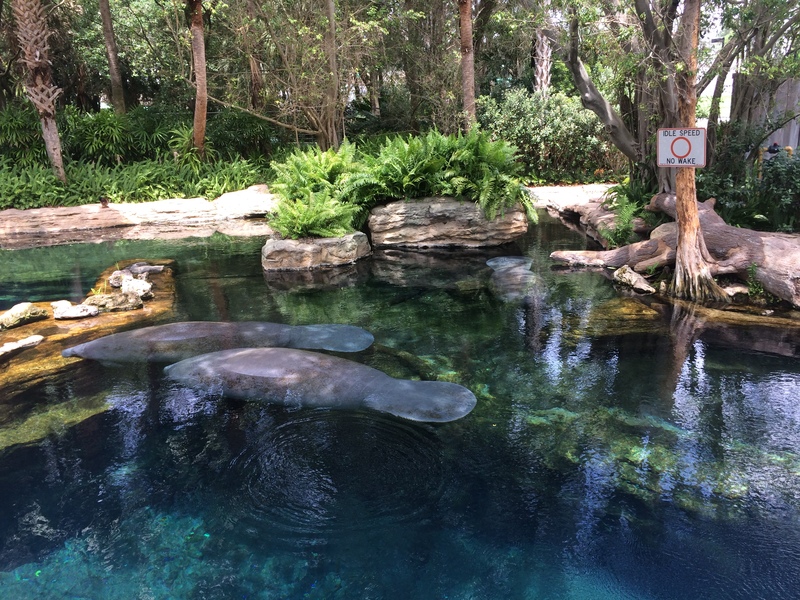 Manatees are susceptible to cold stress if the water temperature gets below a certain temperature and that usually occurs during the winter months. 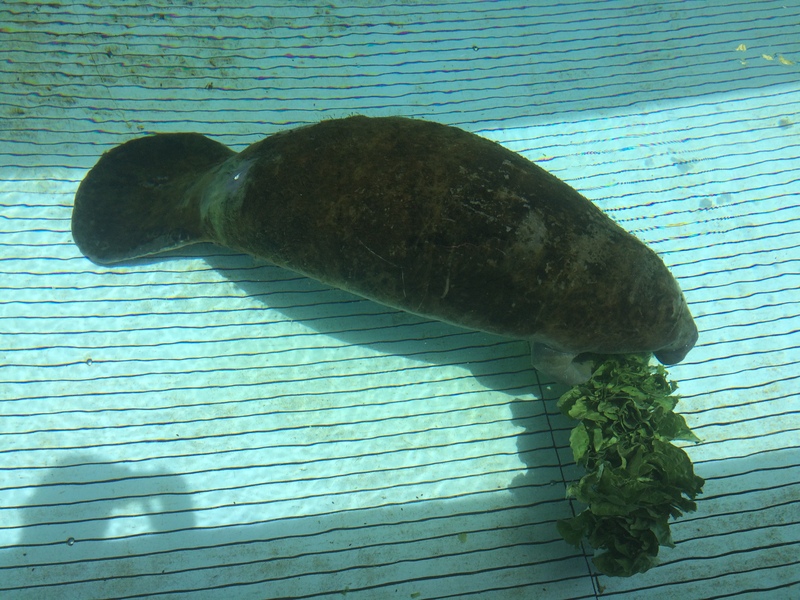 That is why manatees will seek out places where the water is warm, usually near a natural spring where the water is at a constant 72 degree Fahrenheit, or a man-made facility like a power generating plant that uses water to keep its machinery cool. 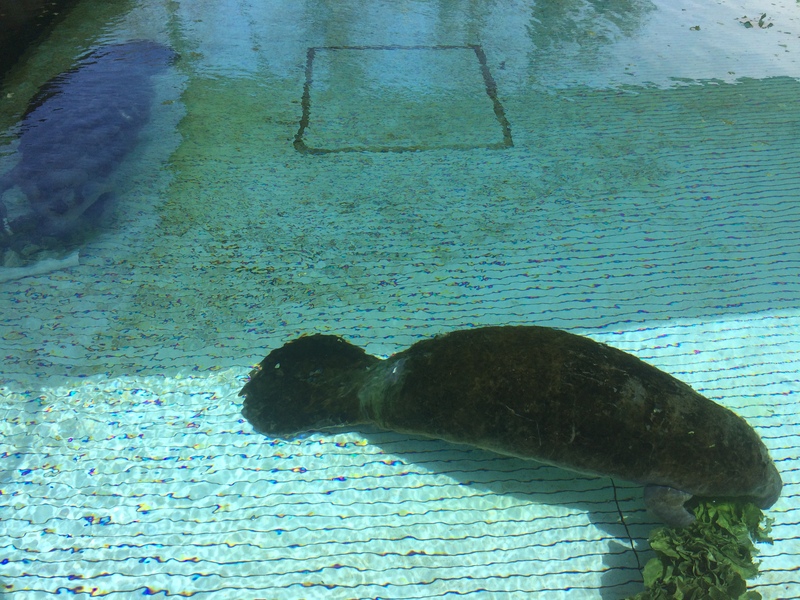 The other manatee suffered a boat strike which broke several bones which is why it is important to observe the “no wake” signs. 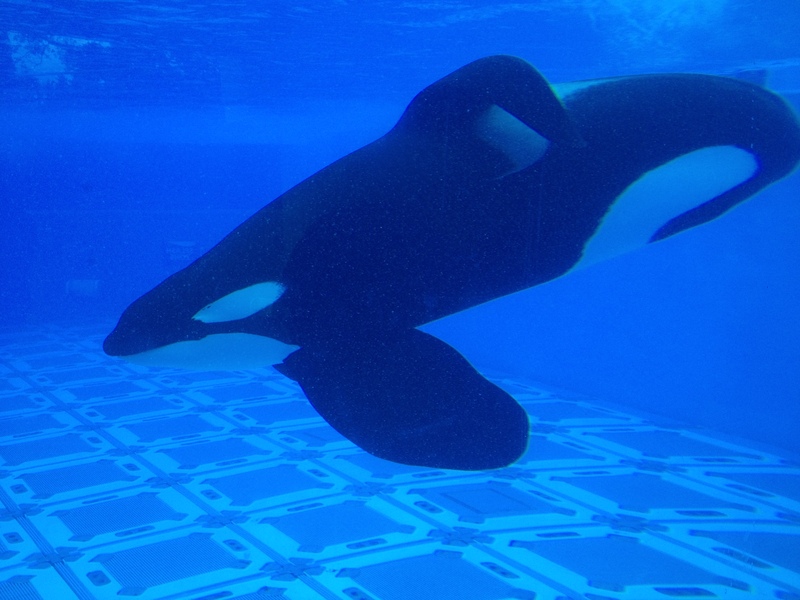 The pool they are in is equipped with a fast rise floor which can rise in as little as ten seconds. 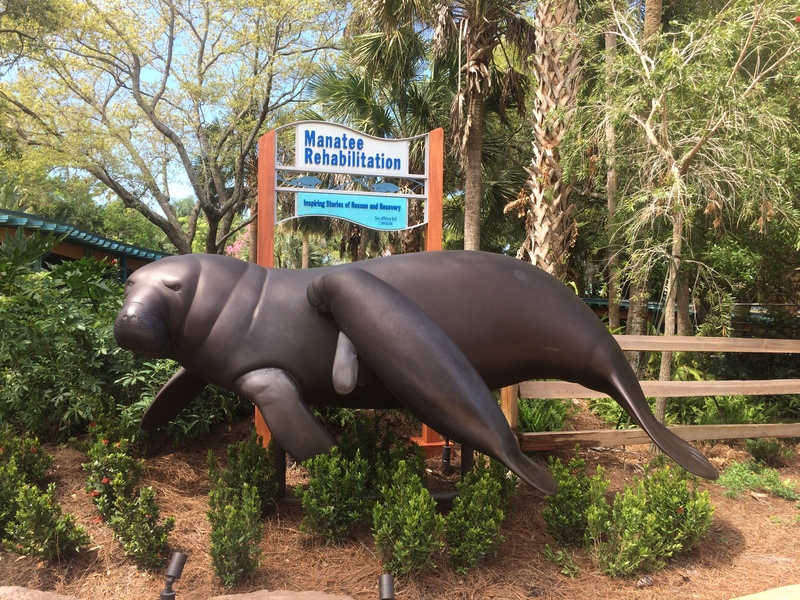 That allows the veterinarian staff to examine, treat, and even perform surgery without stressing the manatee by moving them to another area. 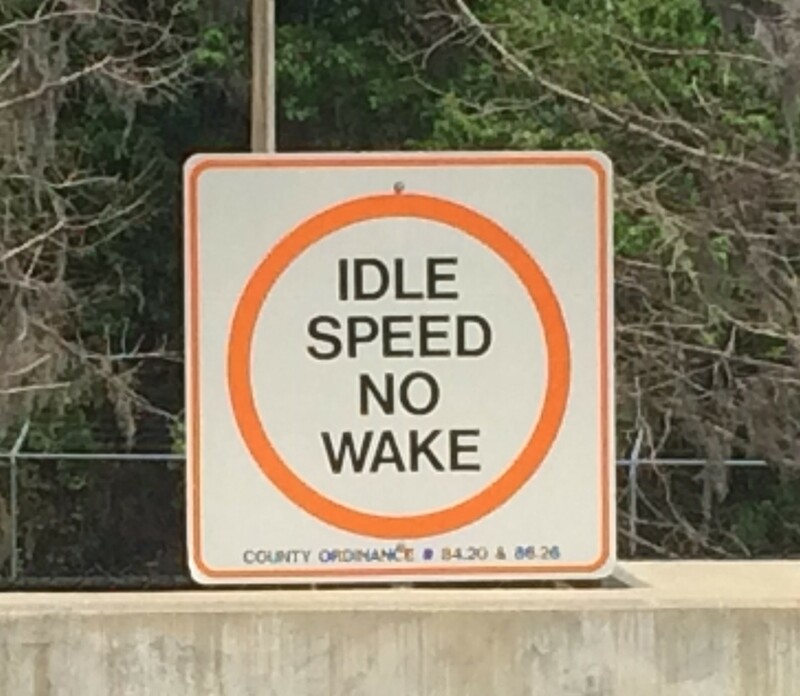 Please slow down to an idle speed when you see these signs or you risk injuring these gentle giants which hover just below the surface of the water. 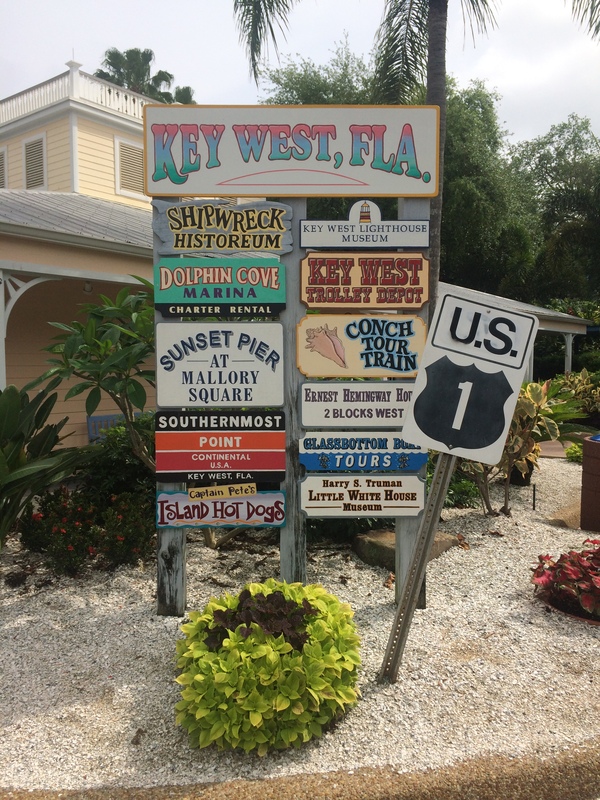 You also risk severe fines if you are caught speeding through these areas. 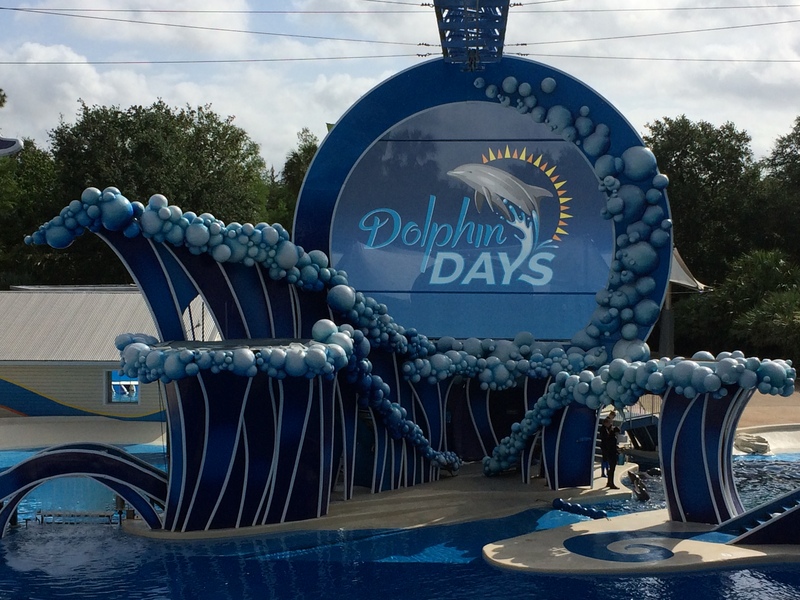 Next up is a beautiful show called Dolphin Days. 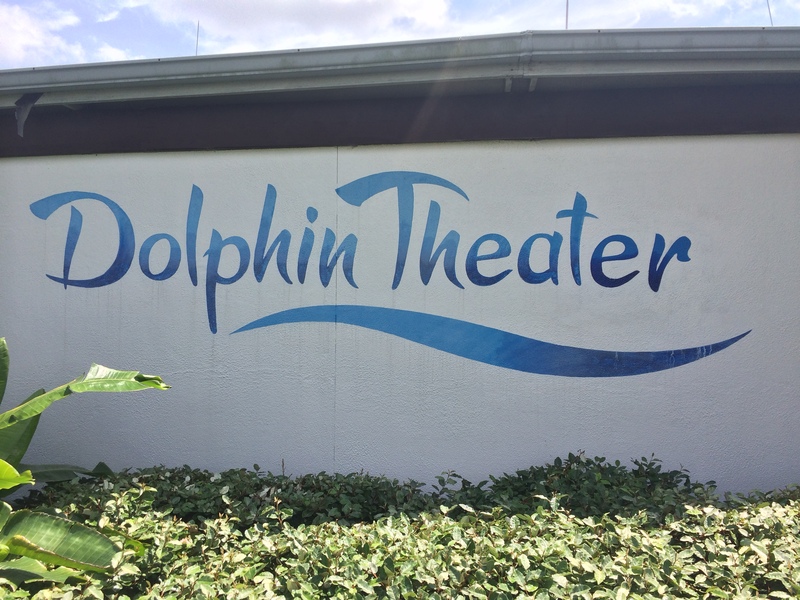 This show is located in the Dolphin Stadium which used to be called the Whale & Dolphin Stadium as this is where the Killer Whales (Shamu) used to perform until 1984 when Shamu Stadium was built. 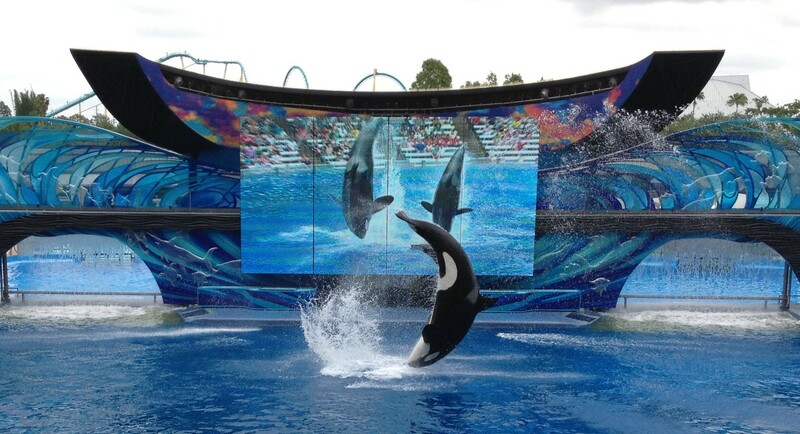 The original show pool was much larger than it is now as the pool was reconfigured after the Killer Whales were moved into their new stadium. 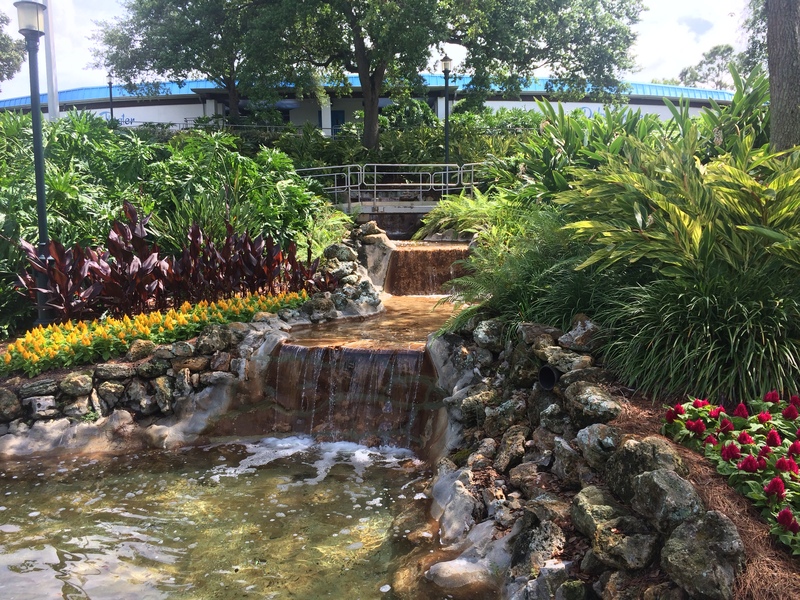 This stadium is well decorated on the inside and the outside with lots of flowers, plants, and waterfalls surrounding the outside of the stadium. 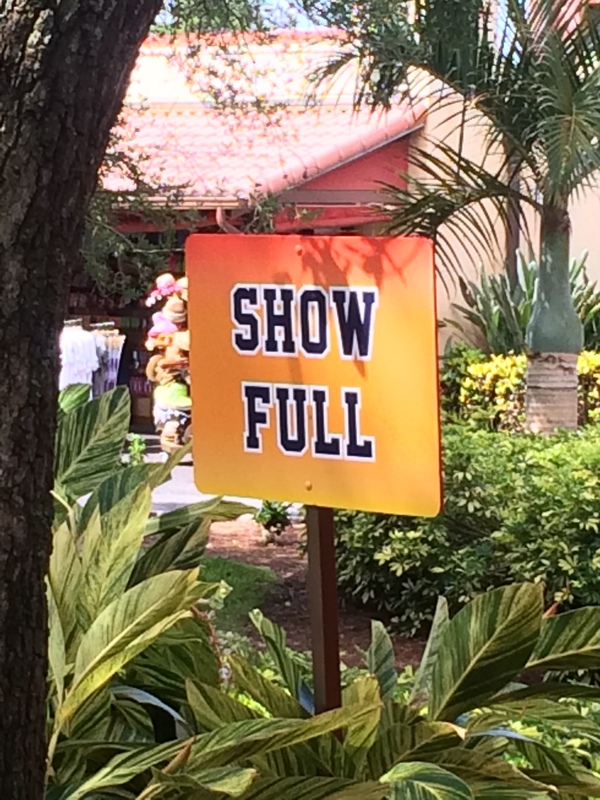 Now, on to the show! 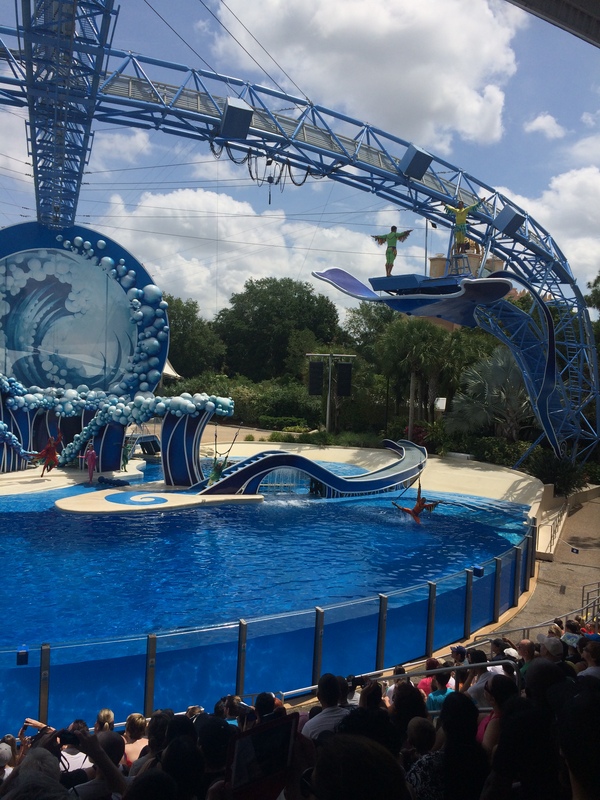 This show is more of an educational show than it’s predecessor but it still has animal behaviors and water works where the trainers are able to get into the water and interact with the animals. 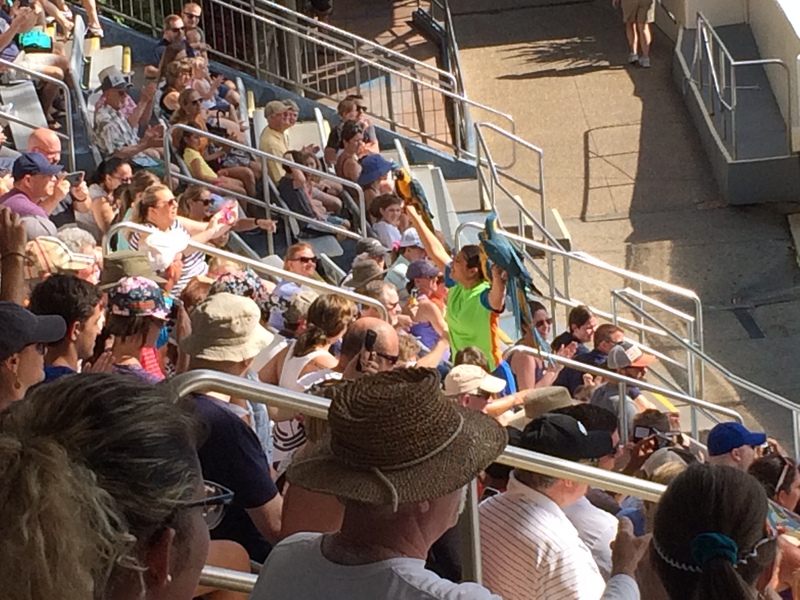 They still use the parrots and other birds as well. 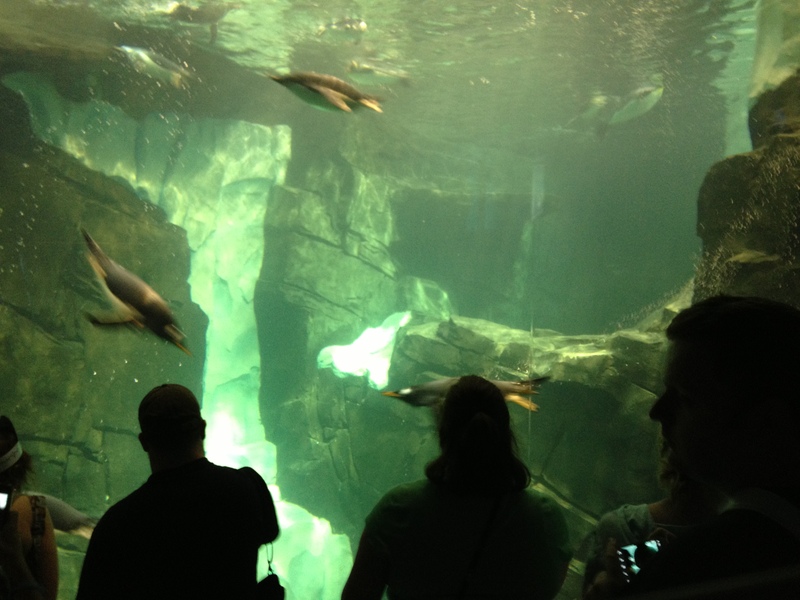 Here are some of the learning experiences you’ll see during the show. 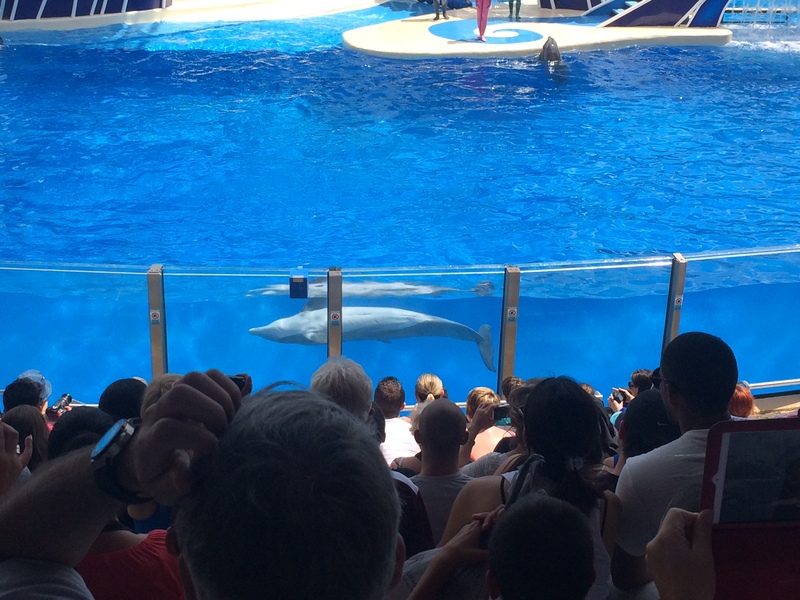 They talk about things like animal husbandry, how they care for the animals, and other things including their mental and physical enrichment. 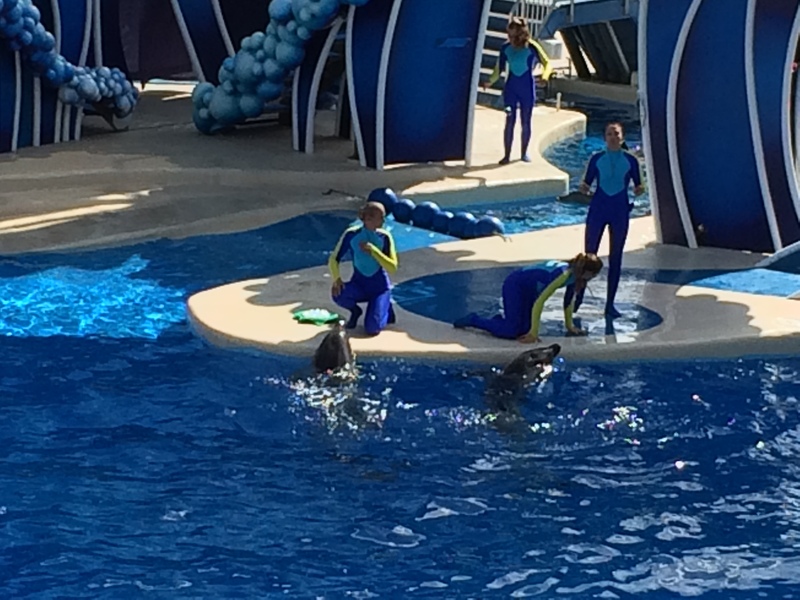 Then there are the interactions with the trainers which is a beautiful thing to watch. 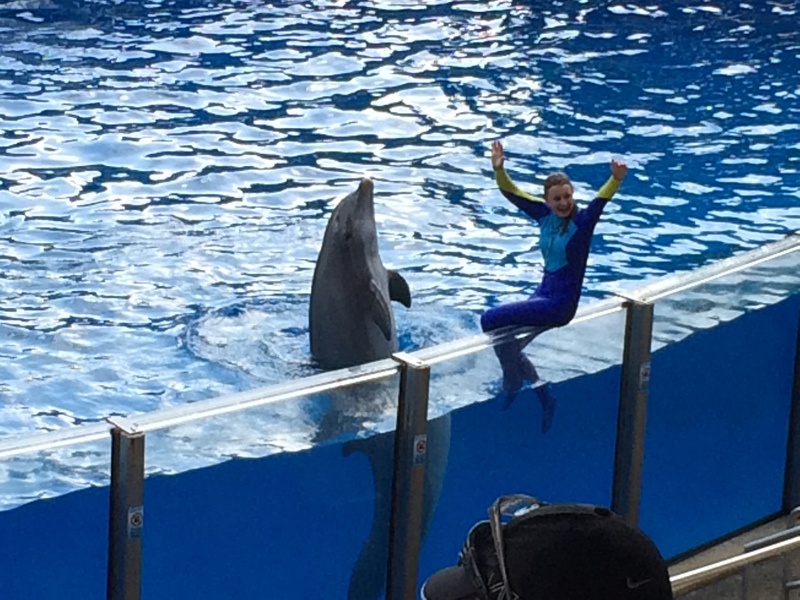 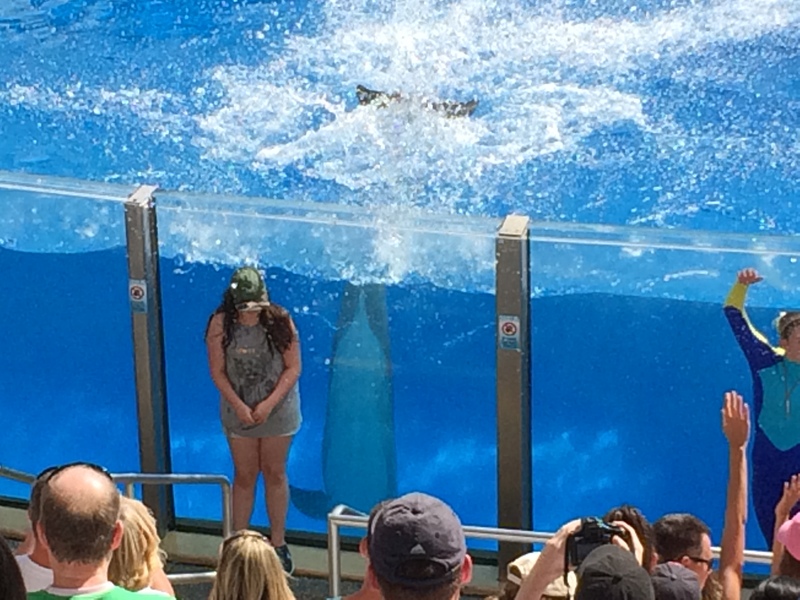 It just wouldn’t be a dolphin show without getting a little kid wet. 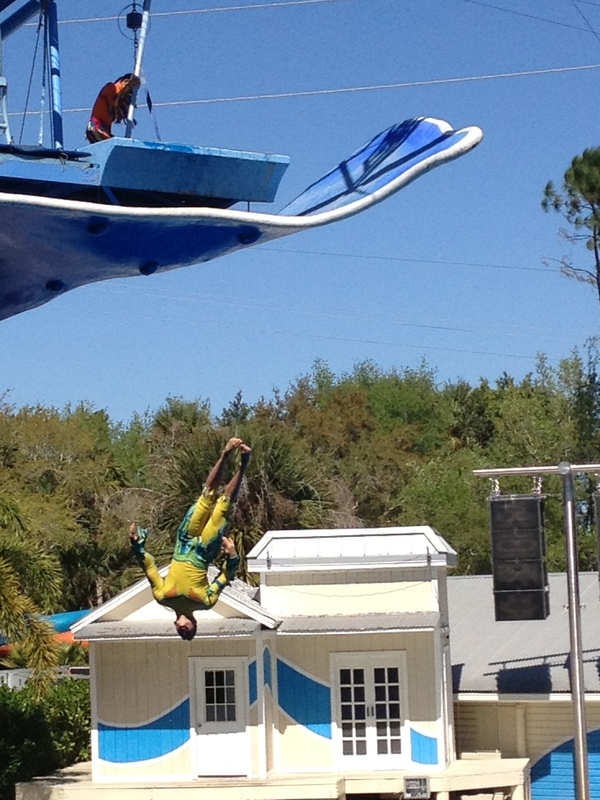 Now for the grand finale! 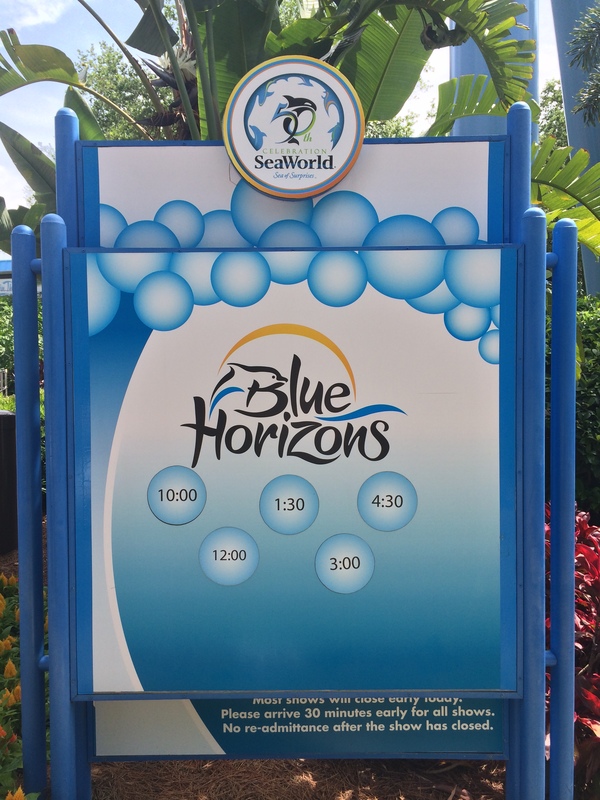 Next up is the previous show called Blue Horizons which ran here for many years until 2017. 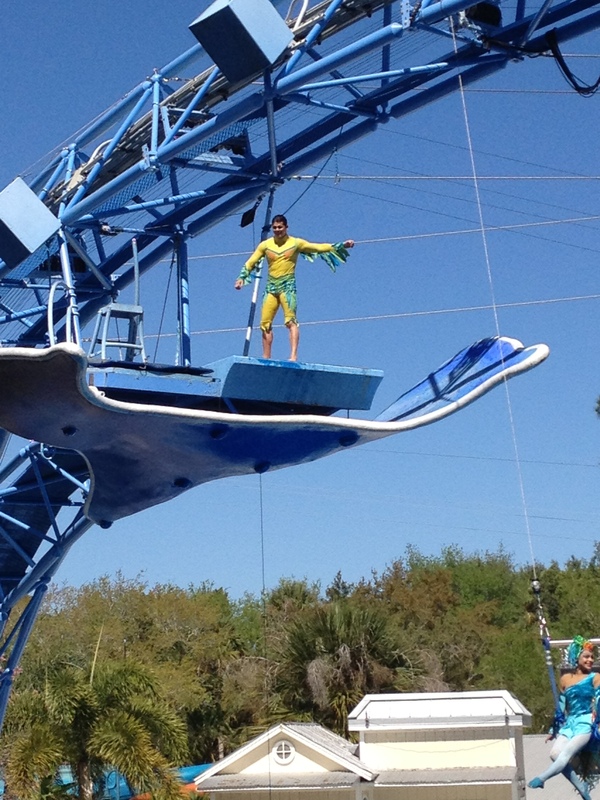 The actual show itself featured Macaws, Atlantic Bottlenose Dolphins, human acrobats, and a large bird. 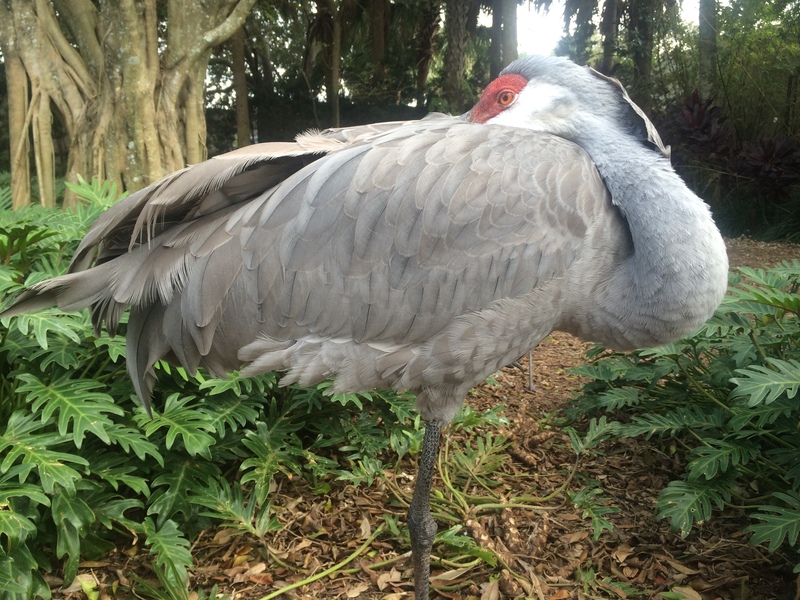 Unfortunately, Bob, the Andean Condor (the worlds largest bird) died of old age in 2014 so the park is using another large bird in his place. 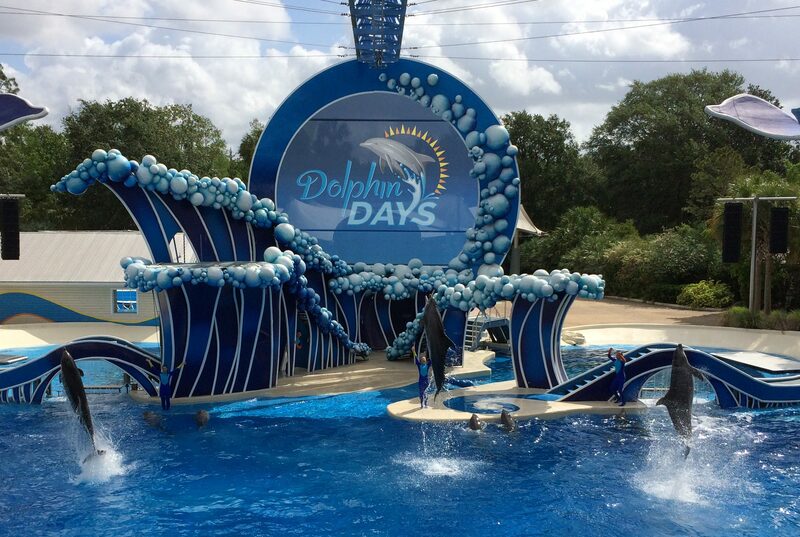 I believe this show opened here in the early 2000’s and was so successful, that a copy of this show opened at SeaWorld San Diego in California, USA a few years ago. 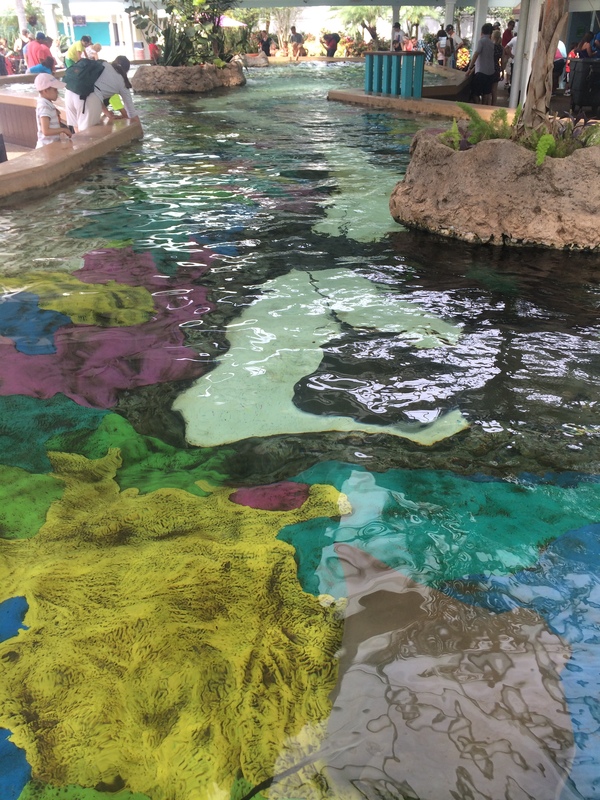 That does it for the Sea of Shallows so we’ll journey on to our next area. 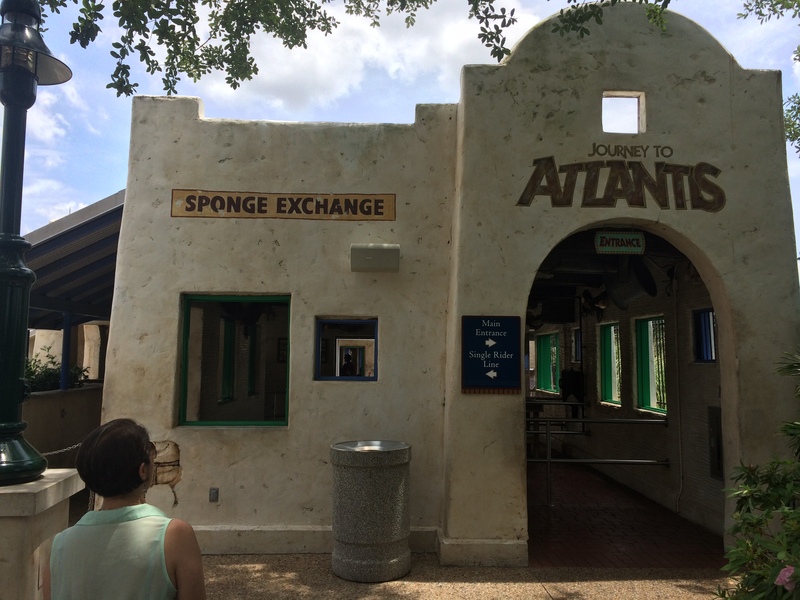 This area contains just two rides, an aquarium, two gift shops, and restrooms that are all themed to the legends of the sea. 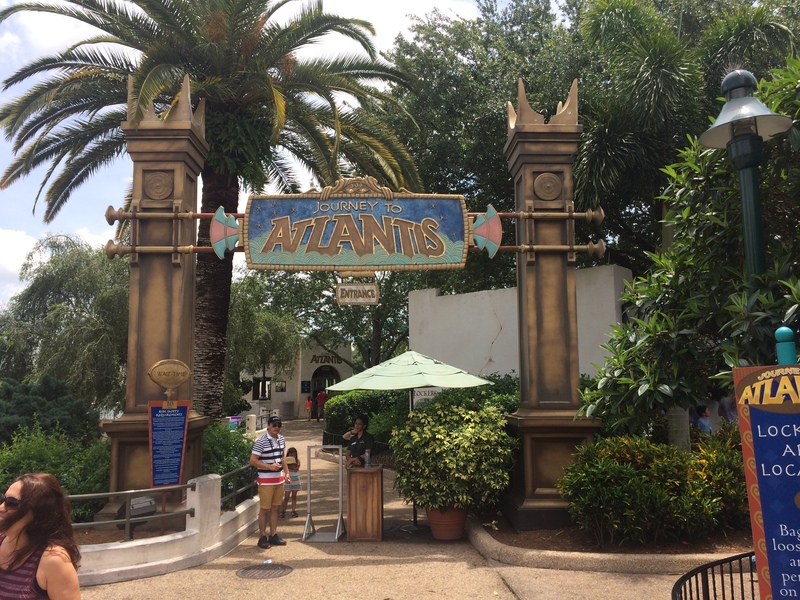 The first one is one of the first Water Coasters ever built called Journey to Atlantis. 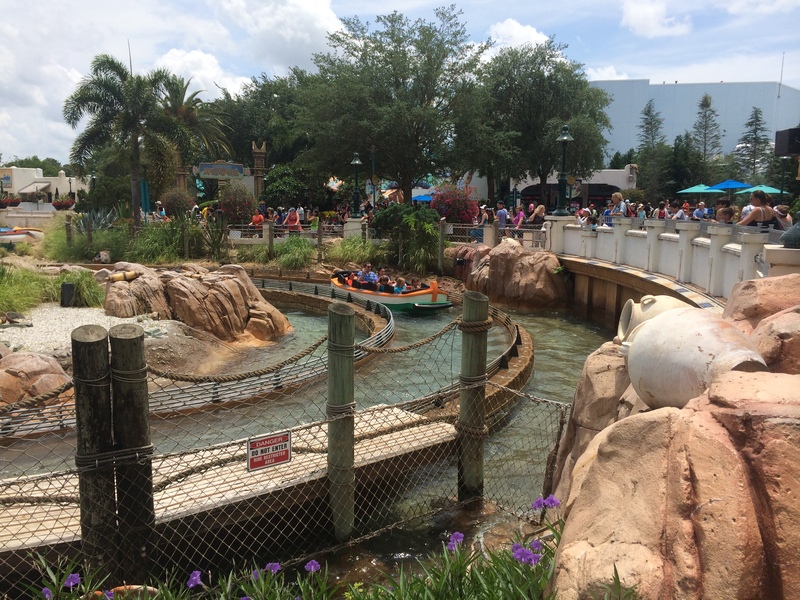 A Water Coaster is a roller coaster and log flume combination. 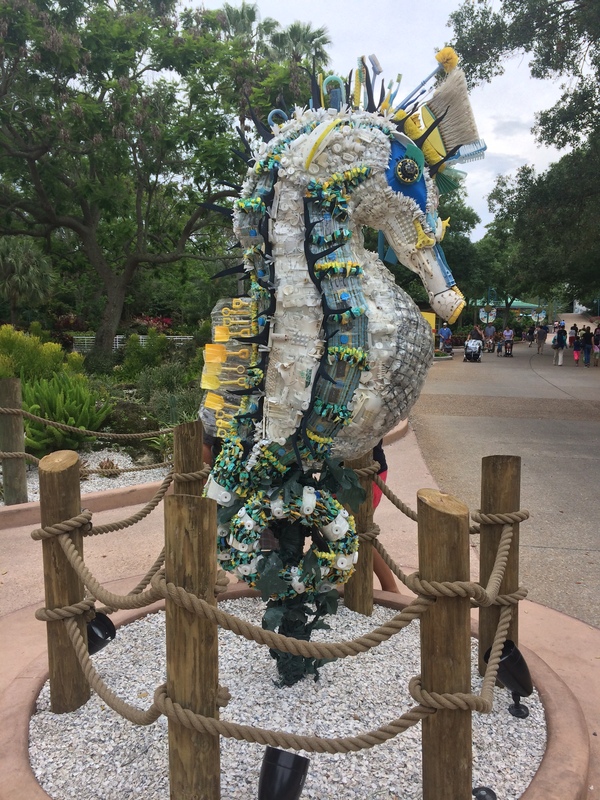 This one is themed to the lost continent of Atlantis with a magical Seahorse called Hermes as your guide. 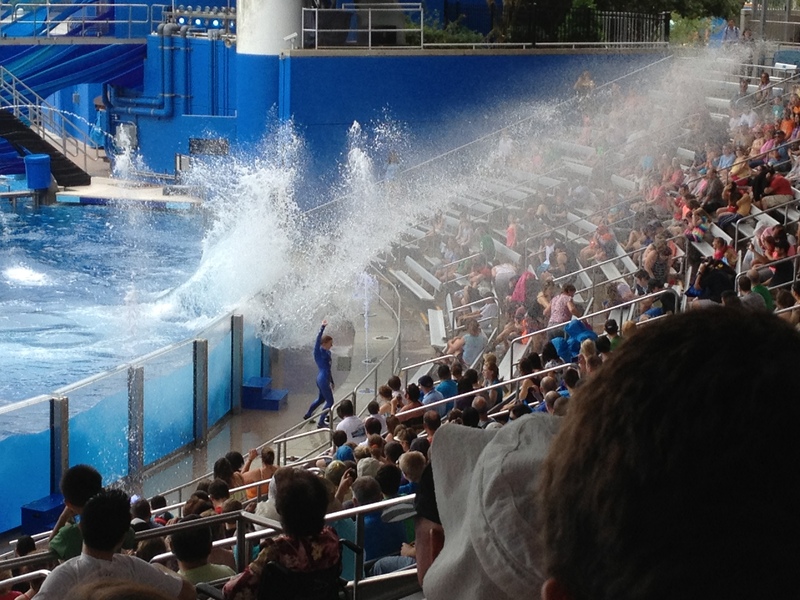 I recommend sitting in the middle two rows if you don’t want to get soaked as the front row gets drenched, but not in the way you would think and I’ll show that to you later on. 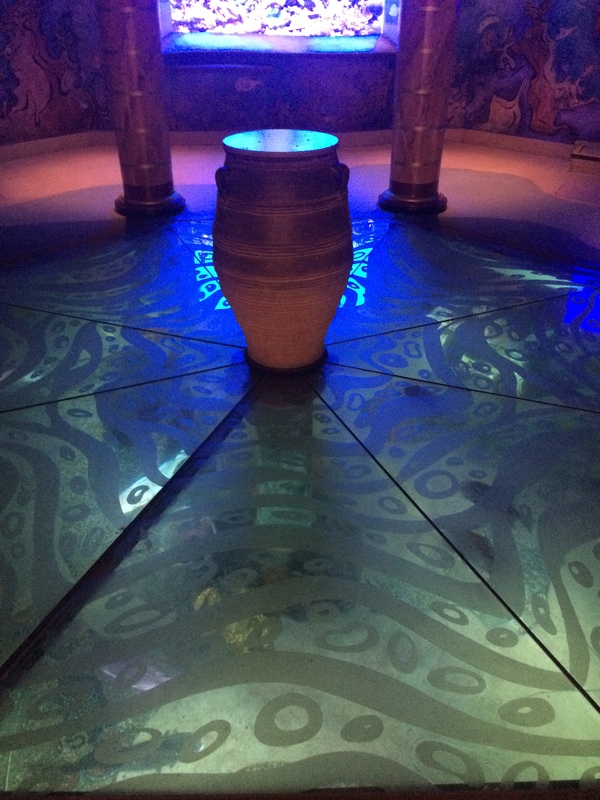 Hermes takes you underwater to see Atlantis and you are welcomed at first, but things go quickly from good to bad as you somehow anger the gods. 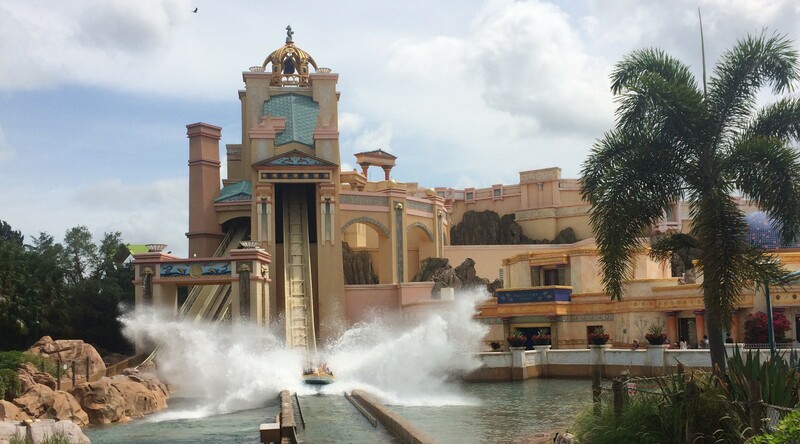 You then go up two lift hills and then down the main drop to a splashdown, then turn around where a set of seven water cannons that might be manned by park guests to soak riders. 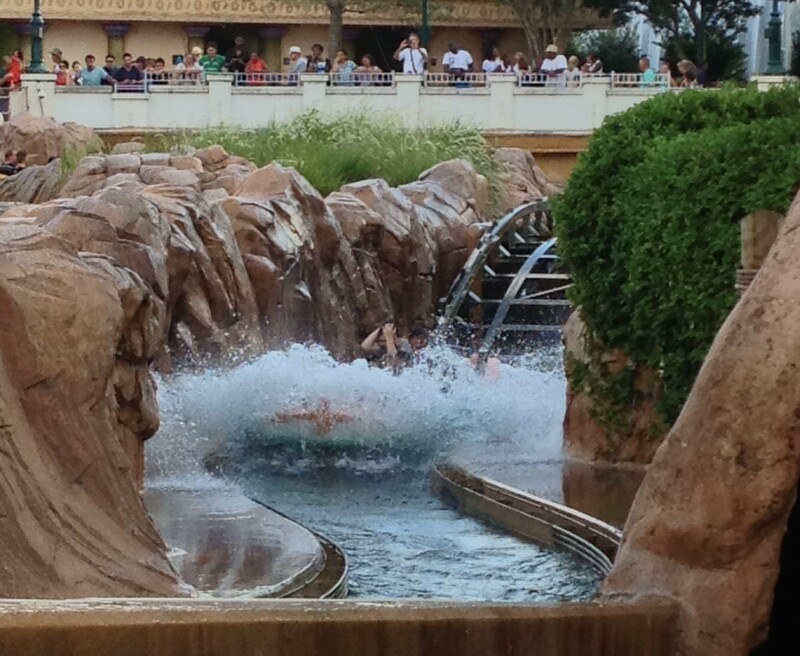 Once you get through that, you go down a small drop into a ravine where the front row gets soaked. 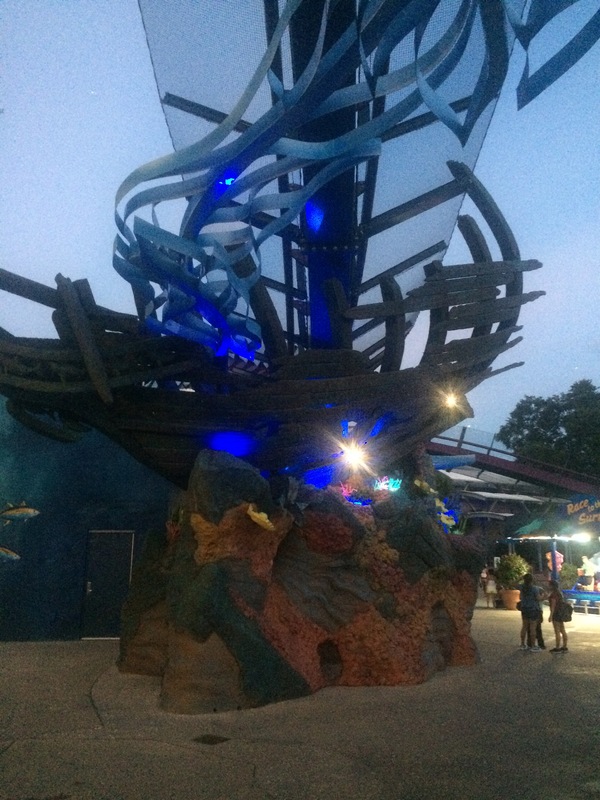 Then you go up a third lift hill where you encounter the roller coaster part by going through a ships graveyard and then a twisting drop in the dark. 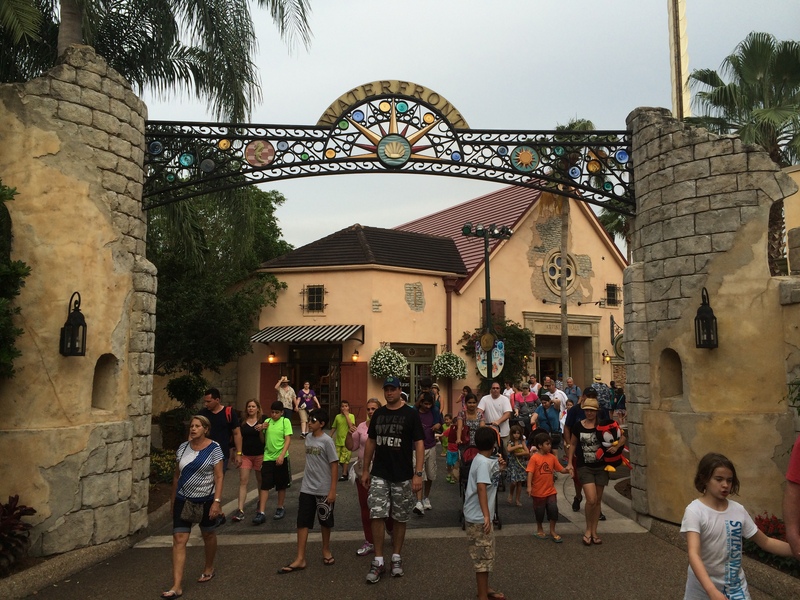 Then you exit the ride and go through the gift shop. 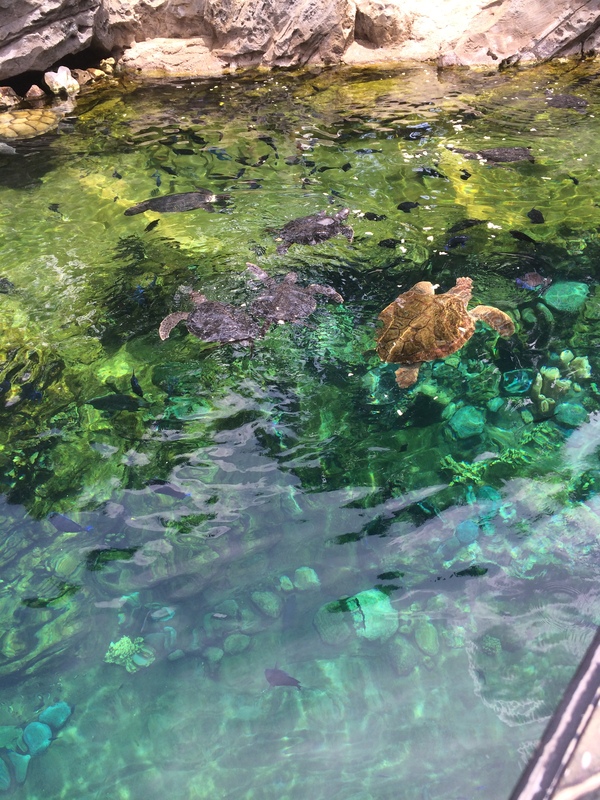 What many people don’t know is that there’s an aquarium at the back of the gift shop that has aquariums all around you as well as above and below you. 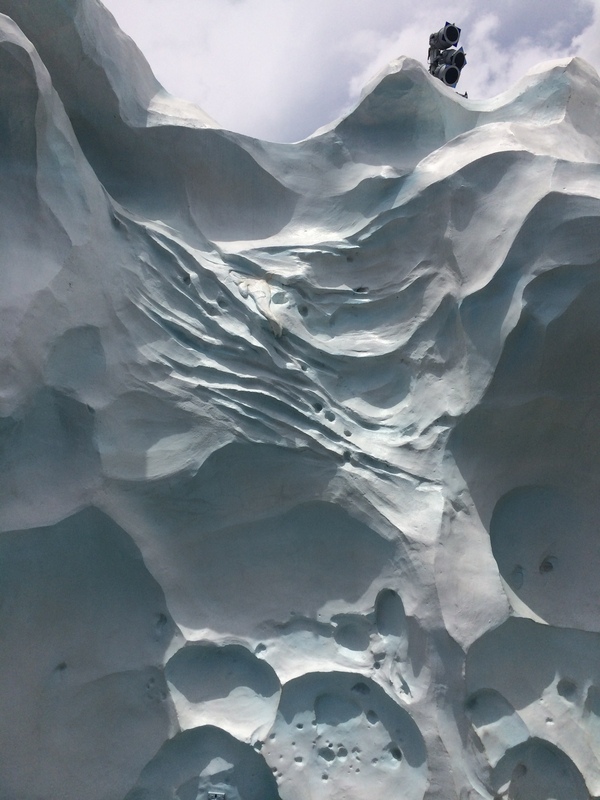 Here are a few pictures with scenic elements around the ride including this photo on the roof of the gift shop. 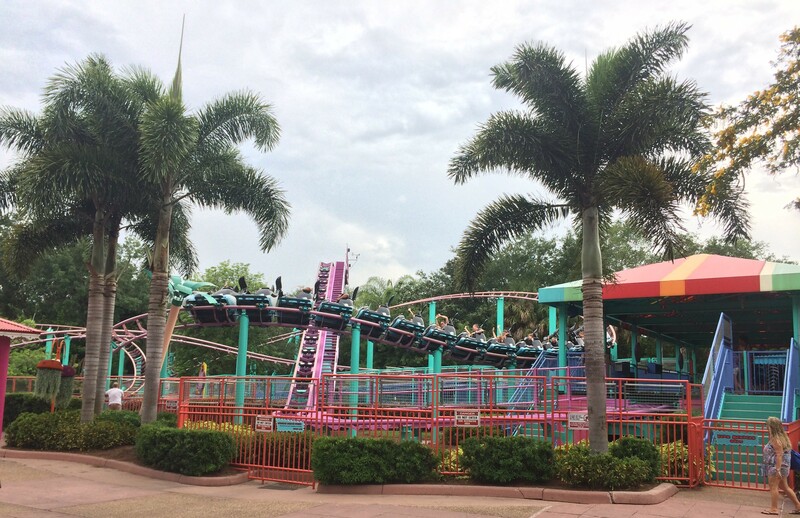 This coaster Water Coaster was built by Mack Rides and opened here in 1989. 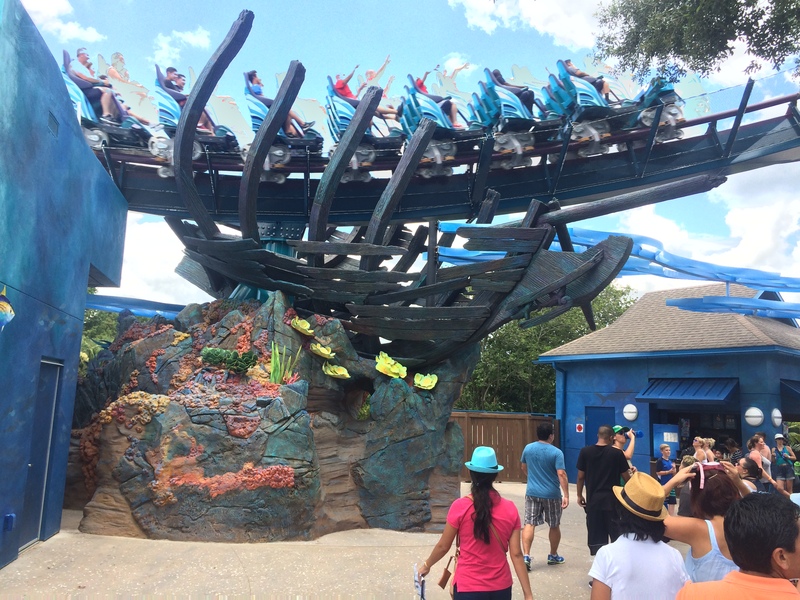 Here’s my off ride video of the ride. 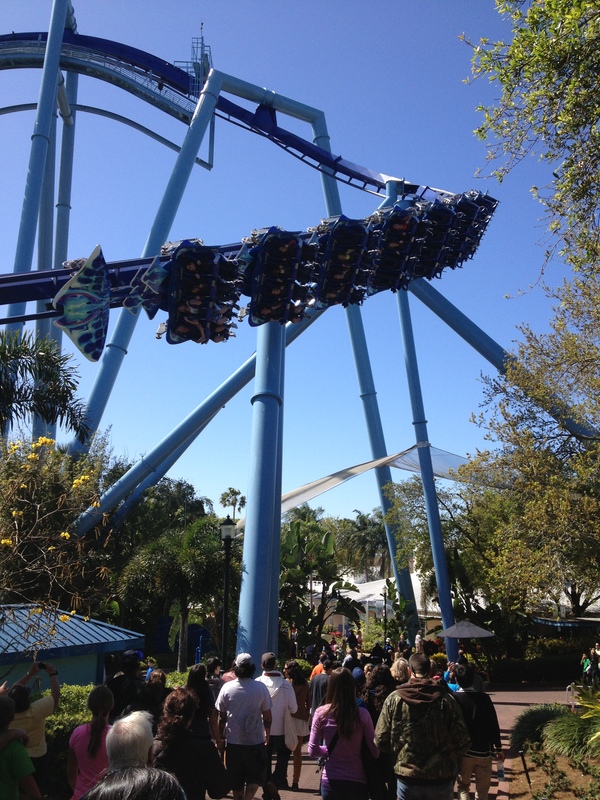 The next ride is a floorless steel roller coaster from B&M. 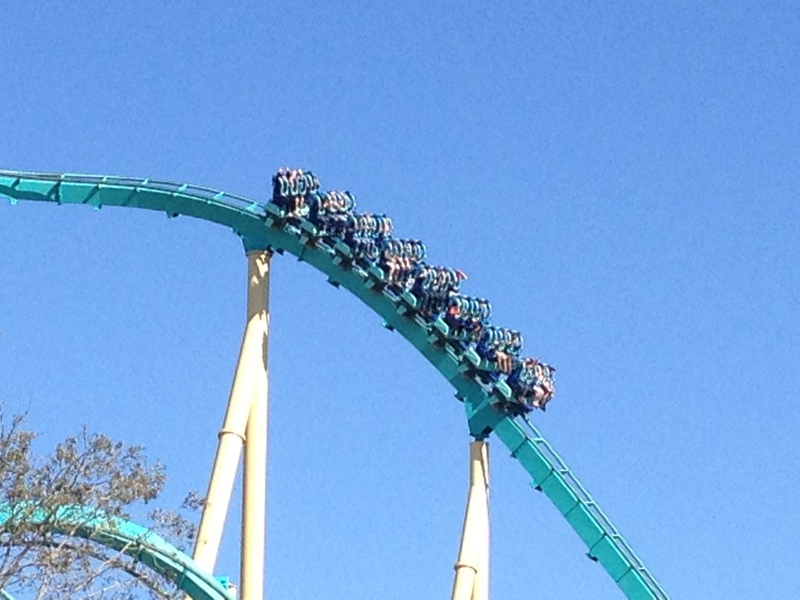 A floorless coaster is a coaster that has no floor with the track below the train. 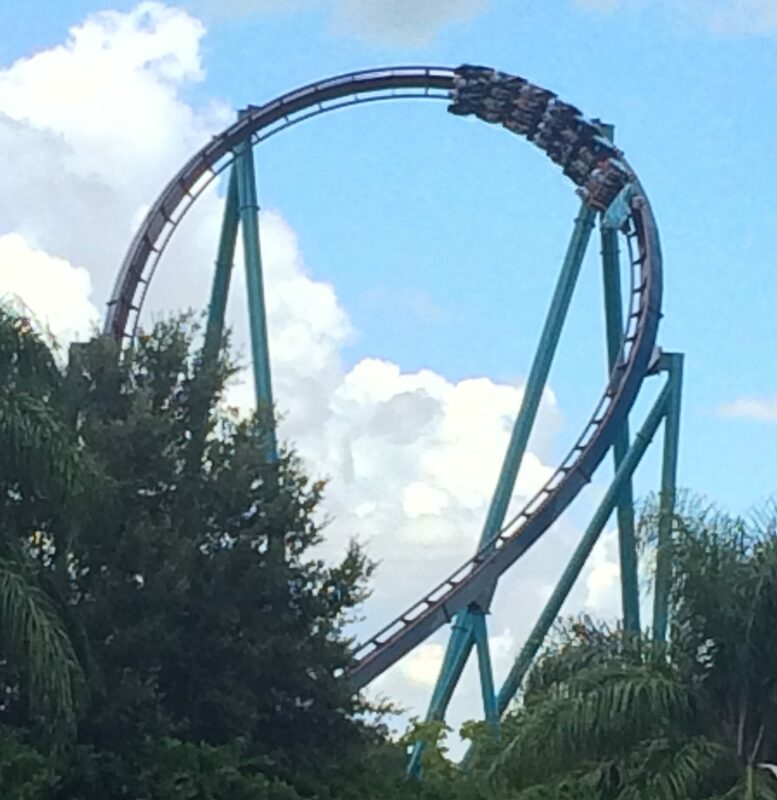 This coaster opened here on June 1, 2000 and is 4,177 feet long, 149 feet high, has 7 inversions, a top speed of 65 mph, and a ride time of just over two minutes. 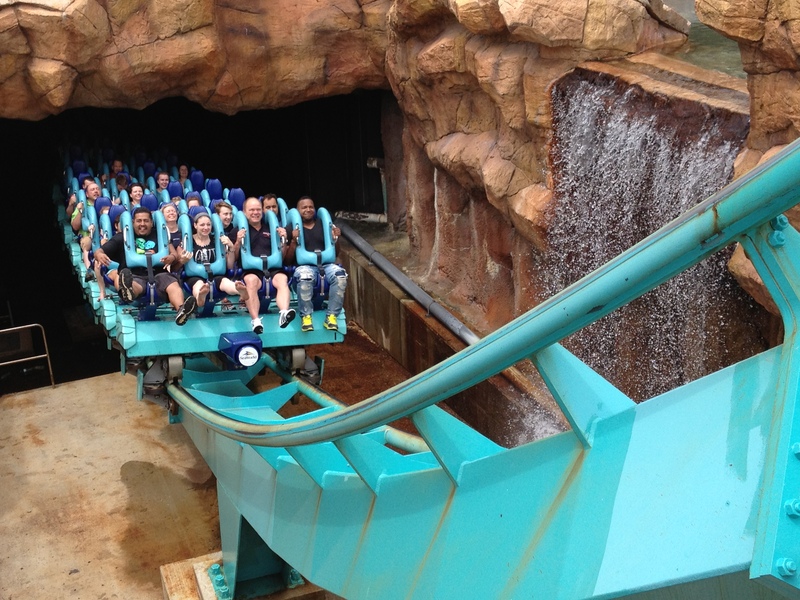 I recommend front row for first time riders and then back row third seat over (middle right seat) in the back row for some nice zero-g air-time. 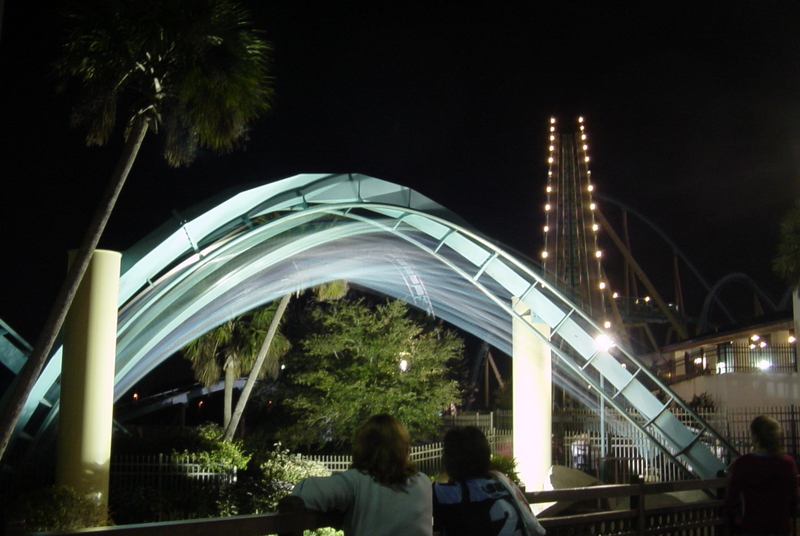 Here’s a nice night shot of the final inversion called a corkscrew and then an off ride view of the ride. 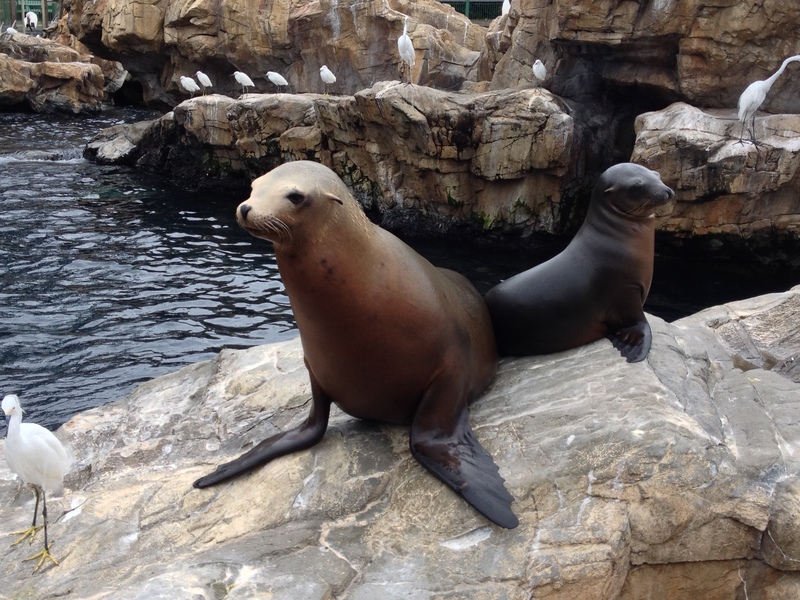 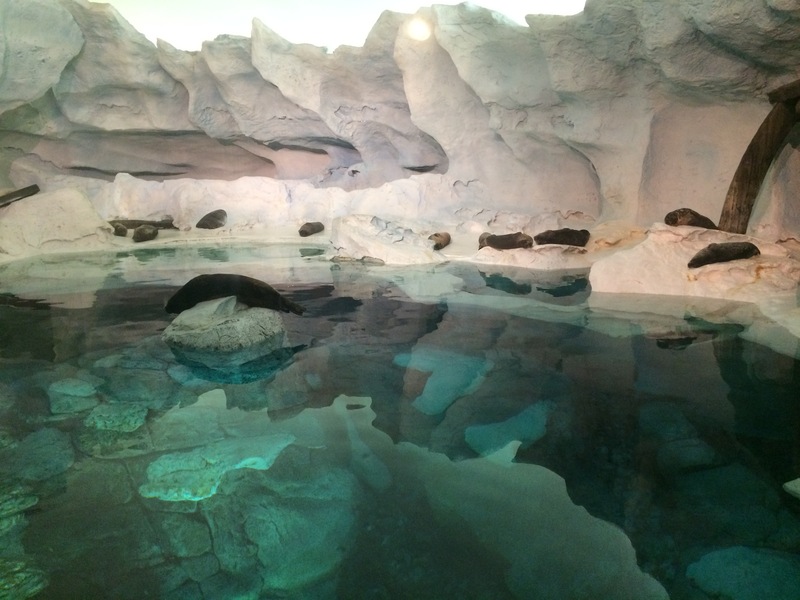 The animal sounds are the California Sea Lions in the Pacific Point Preserve enclosure. 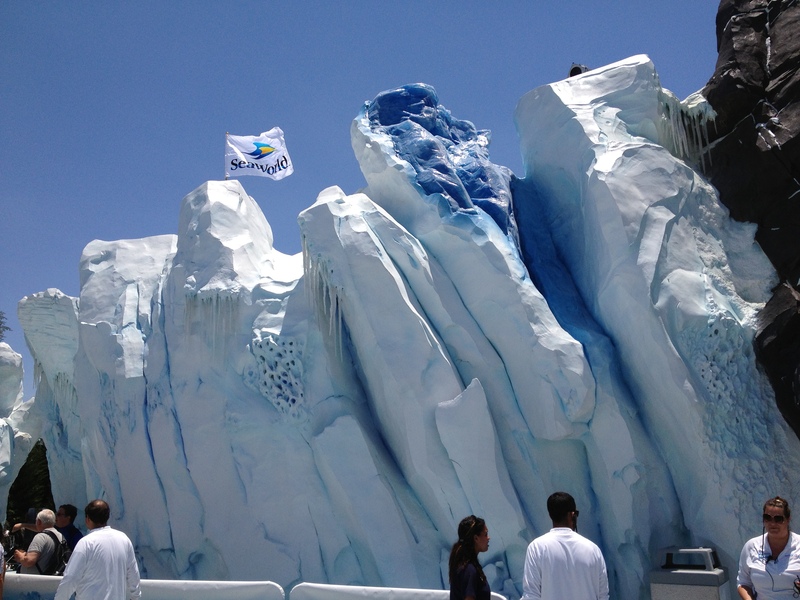 That finishes up the Sea of Legends so we’ll put on our winter clothing (it’s not really cold in this area as it is outdoors in Florida) and trek into our next area. 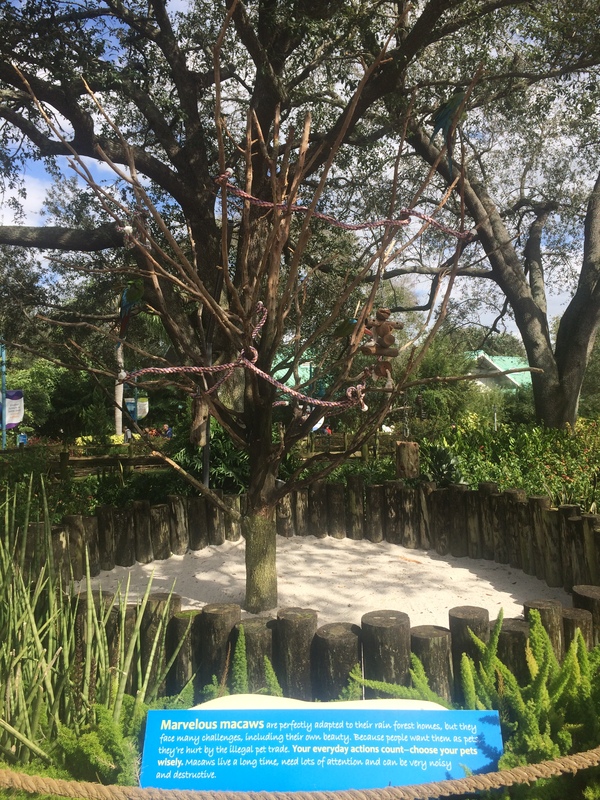 This area is pretty small as it only contains one ride, a gift shop, a restaurant, an animal observation area, and a character meet and greet location. 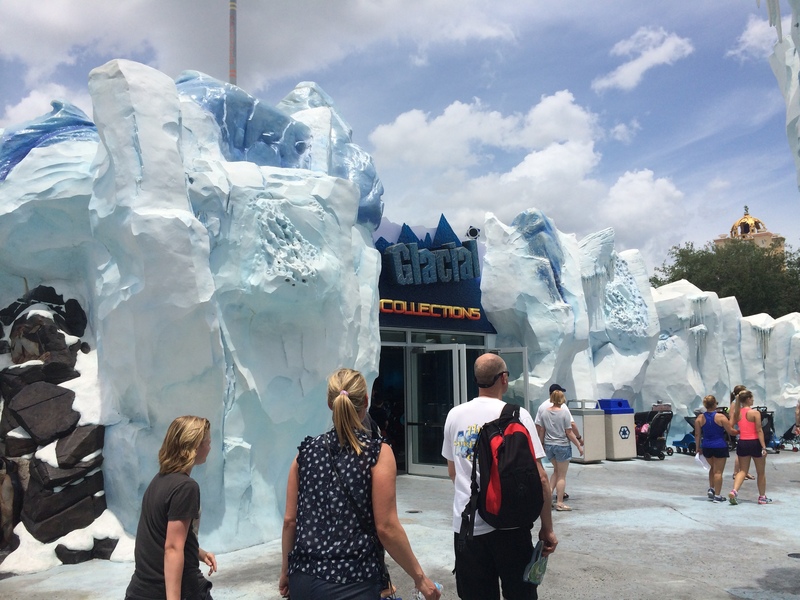 It opened here in 2013 and replaced the Penguin Plaza which opened here in the 80’s. 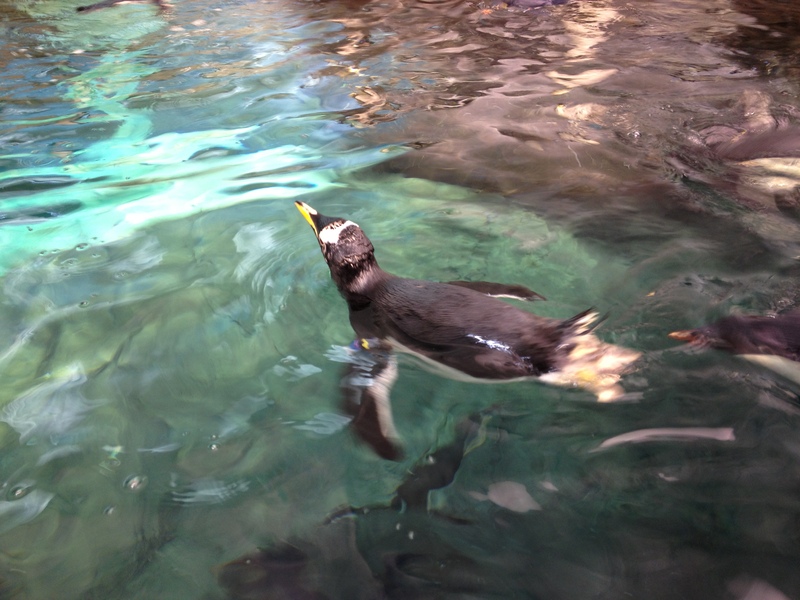 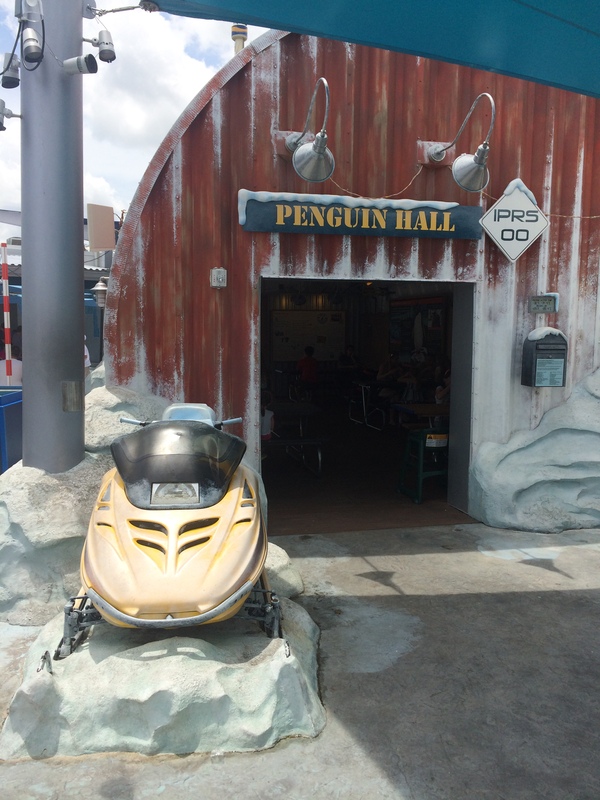 This area still has the penguins, restaurant, and gift shop, but it added a new dark ride called Antarctica: Empire of the Penguin which follows Puc, a Gentoo Penguin from birth to his first venture into the water, and finally, ends at an indoor open air penguin habitat. 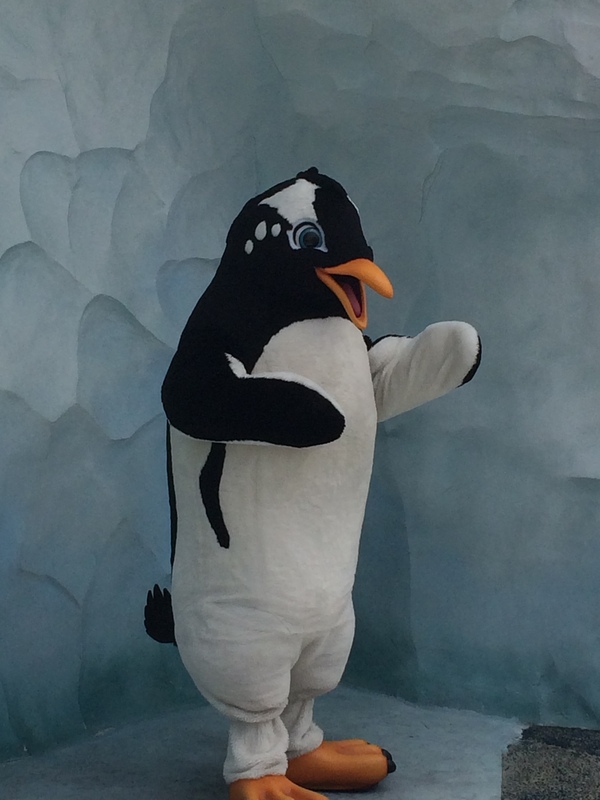 Here’s a walk-through of the original Penguin Plaza and Penguin Encounter. 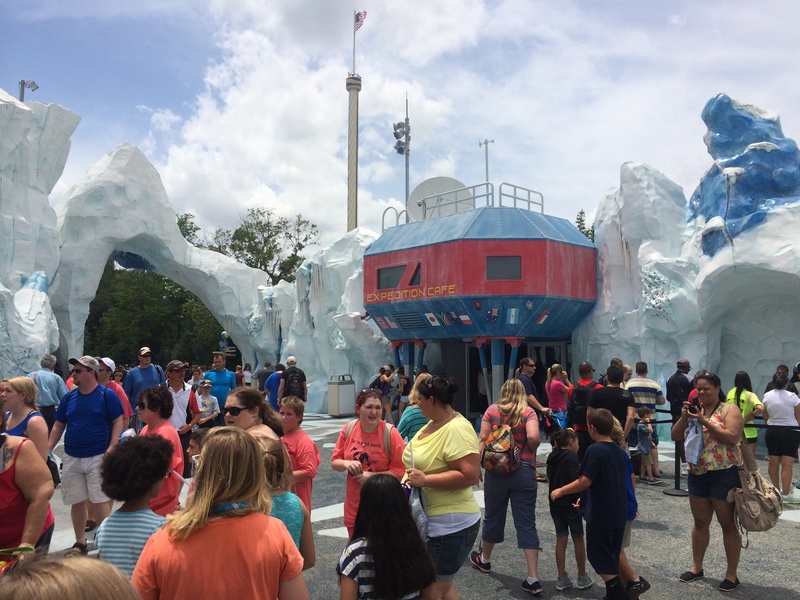 This area is designed to make you think you’re in the Antarctic Base Station with huge glaciers all around you. 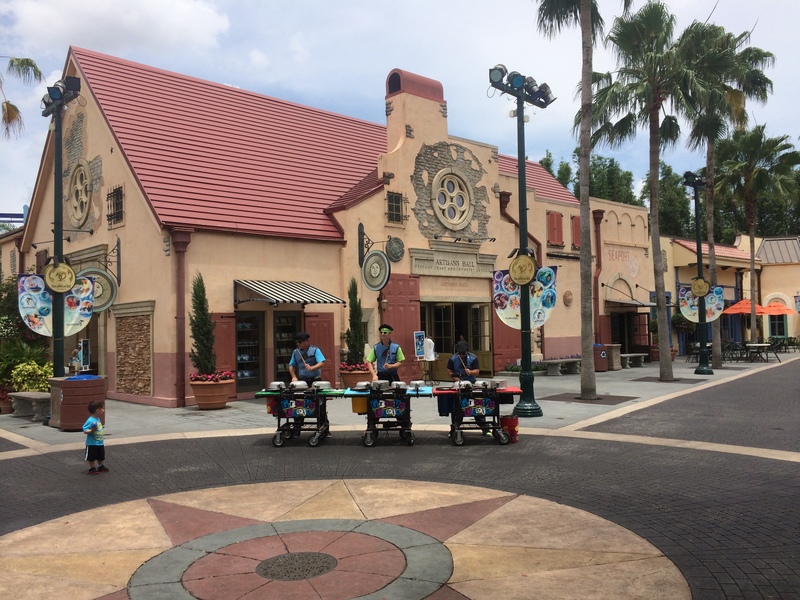 There also is a counter service restaurant that serves different types of food from American to Italian called the Marketplace. 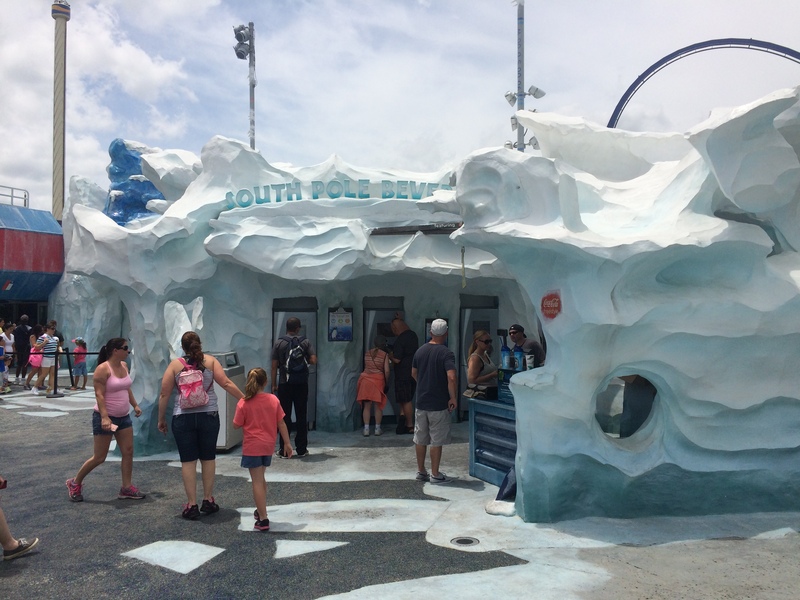 There’s also a gift shop called Glacial Connections and a soda fountain called the South Pole Beverages which has its own unique soda flavor. 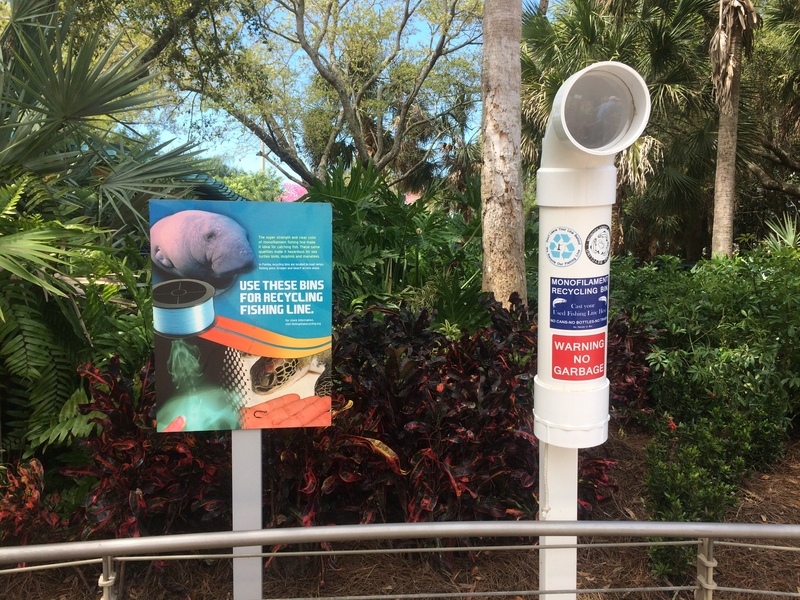 They also sell a refillable souvenir cup that has a RFID chip in it that keeps track of how much carbon you saved from entering our atmosphere by refilling your cup and not using a paper cup. 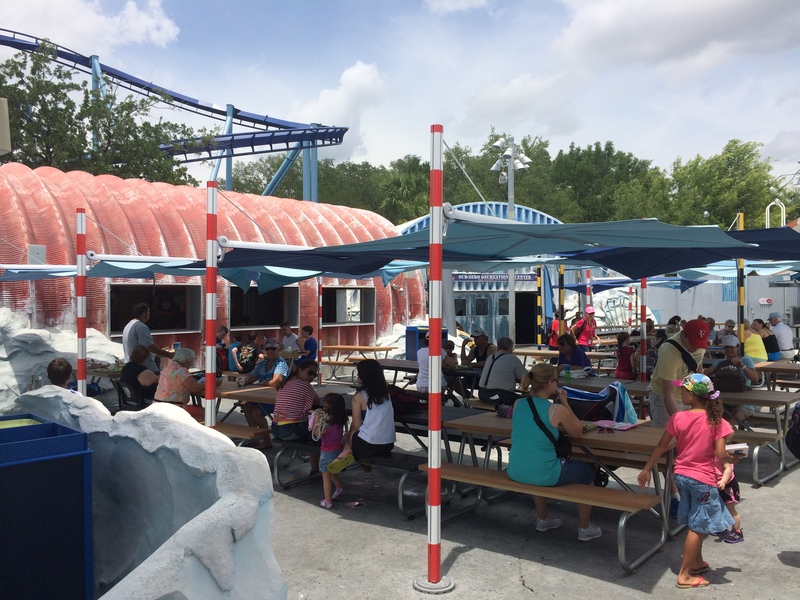 You can escape the heat and eat in the air-conditioning by going through the outdoor area and entering the blue building. 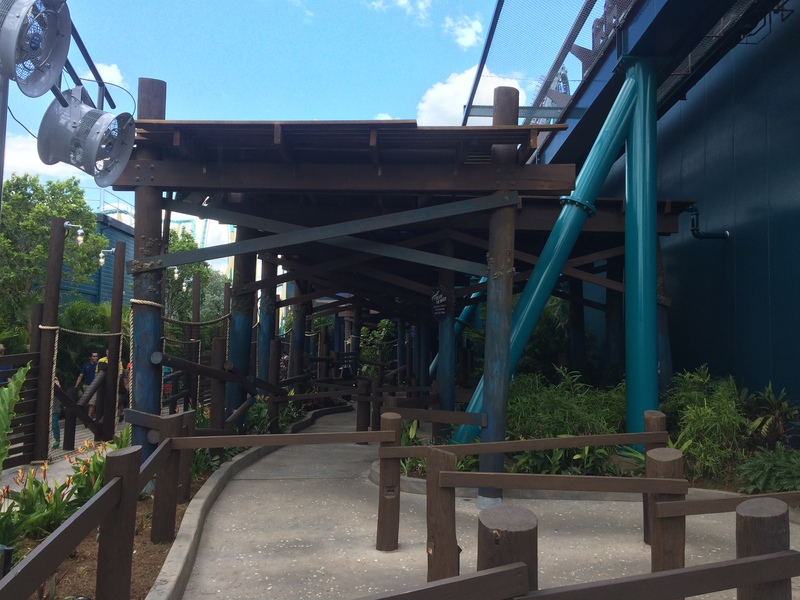 Here’s a walk-through of the area that was shot on opening day and includes the theme song of the ride. 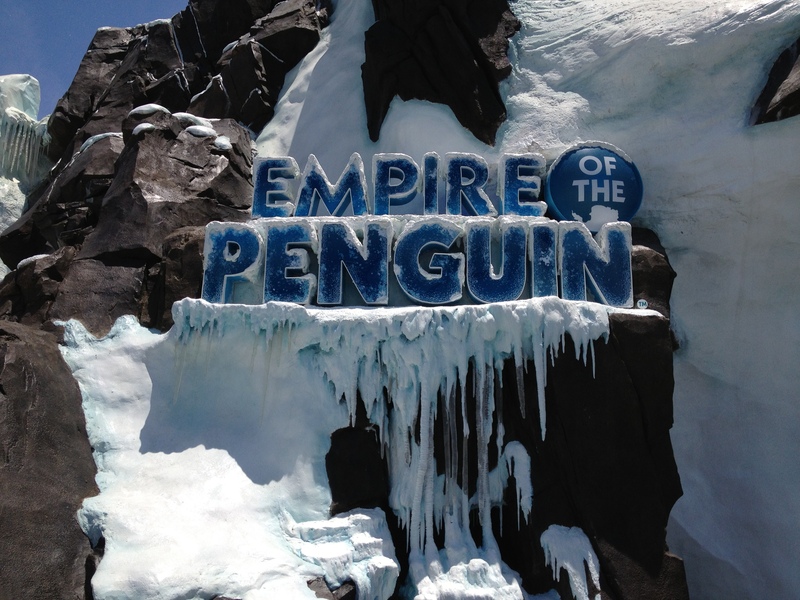 The one ride in this area is called Antarctica: Empire of the Penguin and it really is a nice ride but be warned, it does get cold in this ride as you end up in a penguin habitat with no glass so you are literally in their climate. 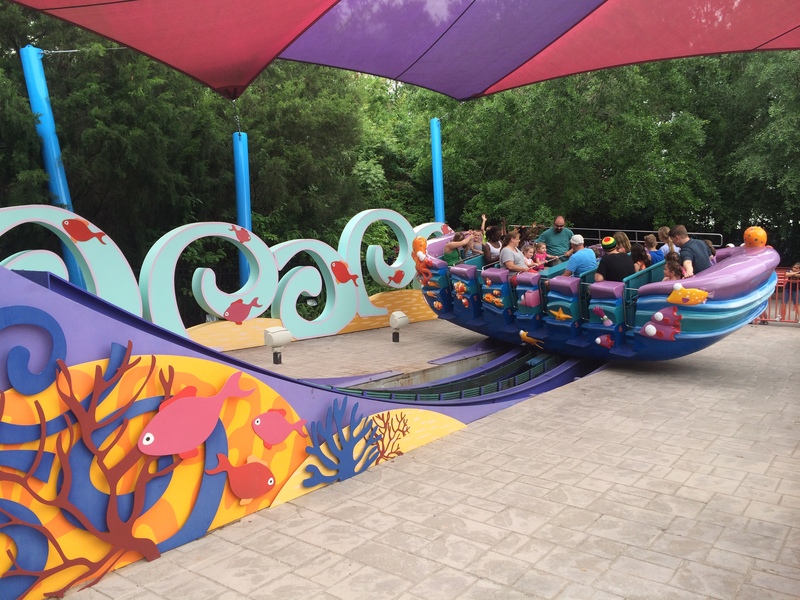 This ride is a new trackless ride vehicle that relies on a programmed path for each ride vehicle that communicates with the other ride vehicles around it. 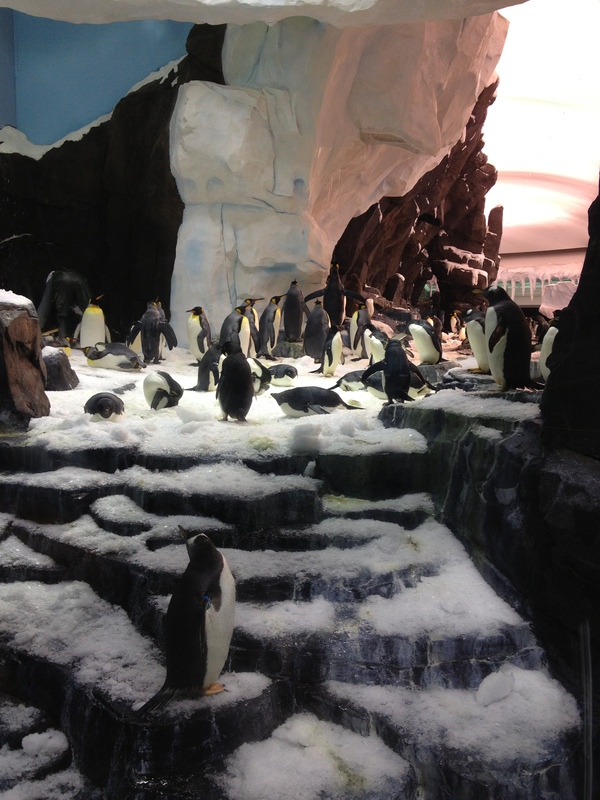 You can still see the Penguins exhibit without riding the ride, you’ll just need to enter the main entrance and follow the signs for the exhibit. 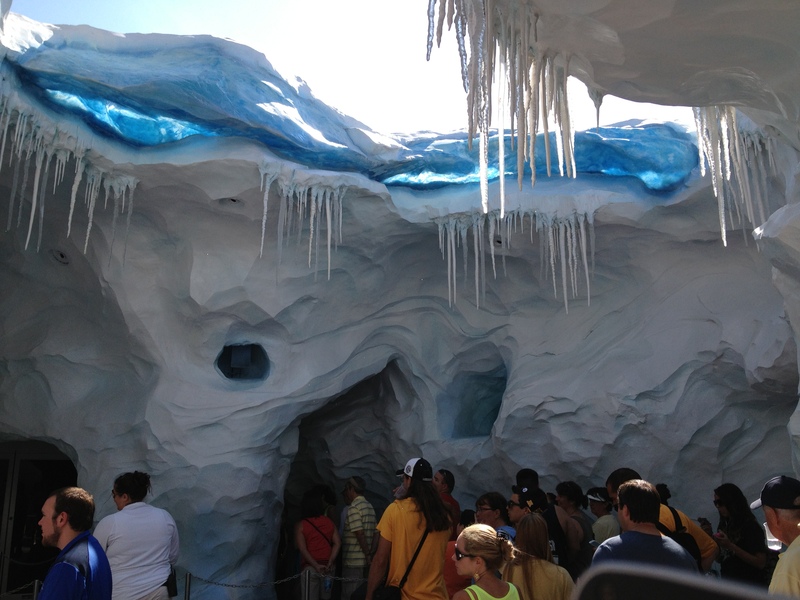 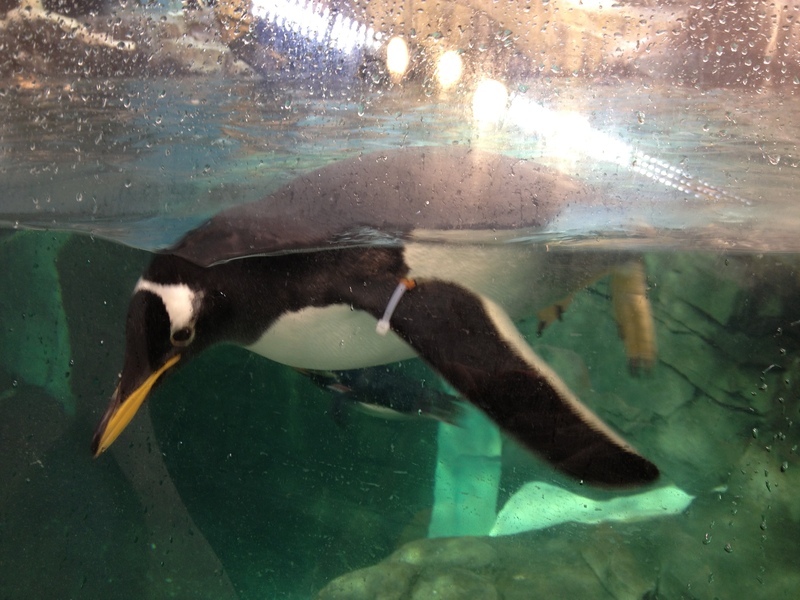 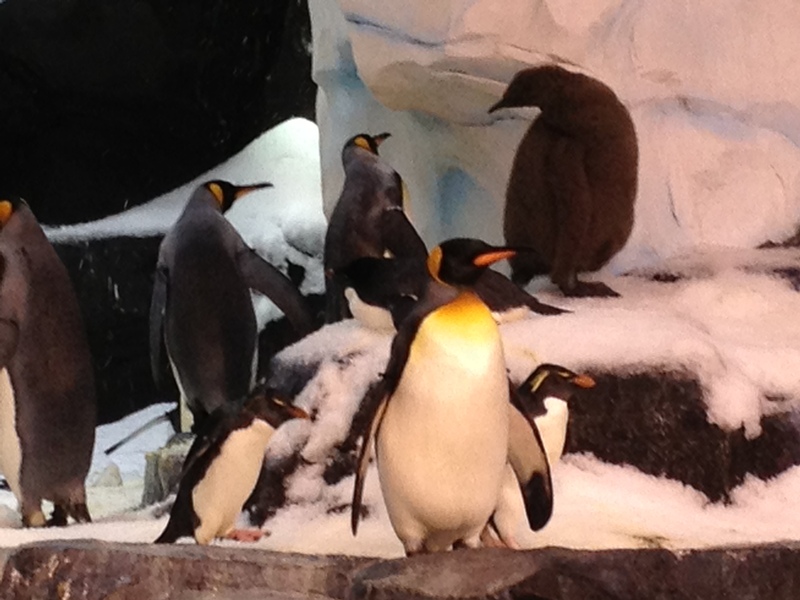 Here are the photos of the penguin habitat when you exit the ride. 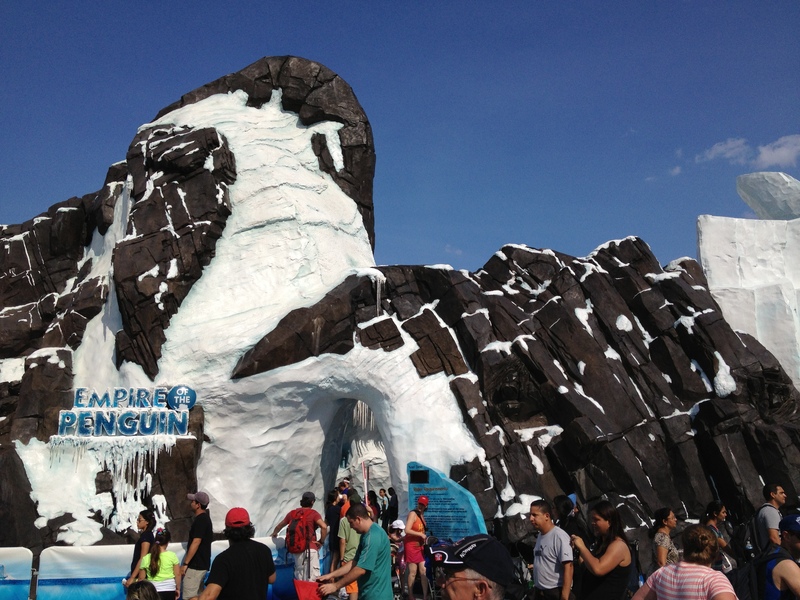 Here’s an on ride video that includes the opening day performance of the theme song and the penguin habitat. 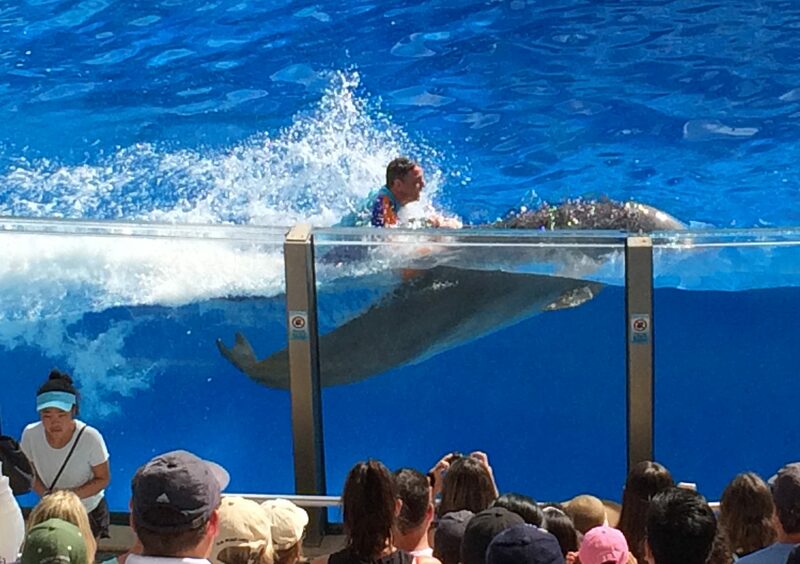 Skip to the 8:20 mark if you don’t want to see the opening ceremony. 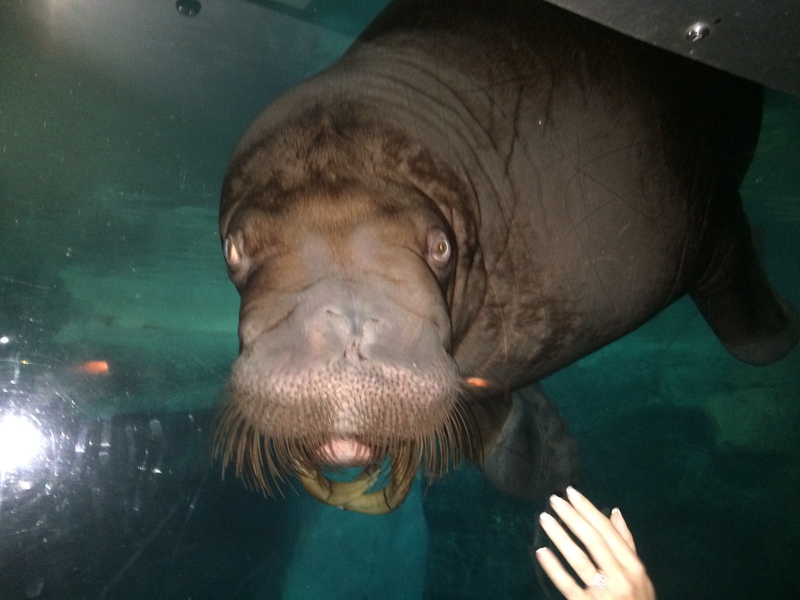 You can also meet Puc here if you want. 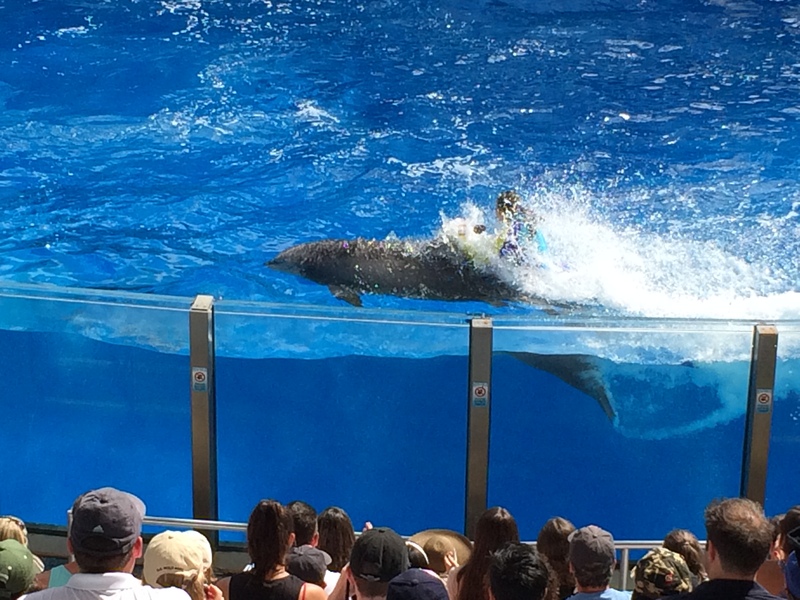 Can you see the hidden Shamu in this photo? 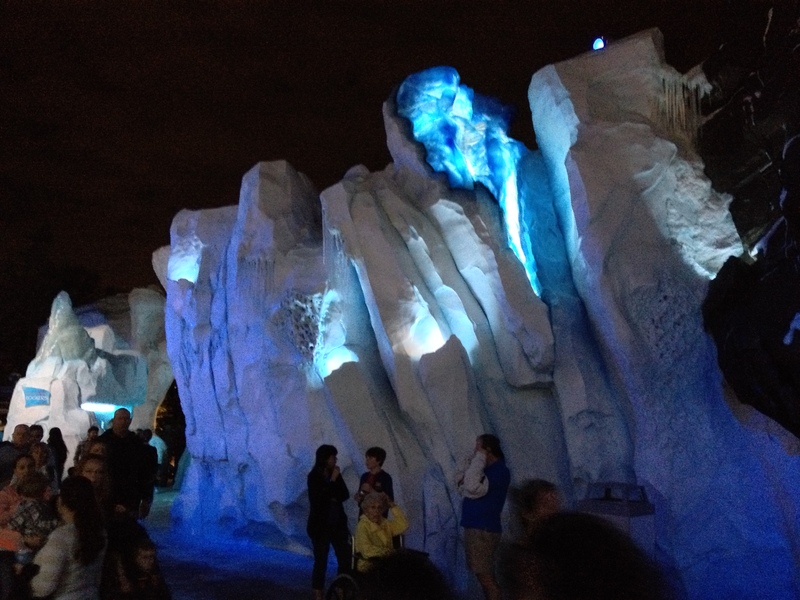 This place really lights up well at night with the glowing icebergs. 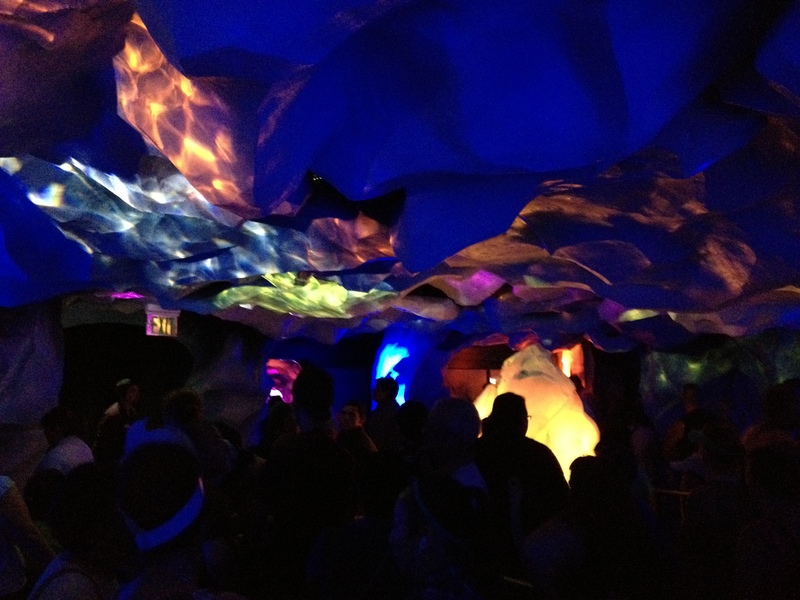 It really is incredible and well worth staying till nighttime to see it. 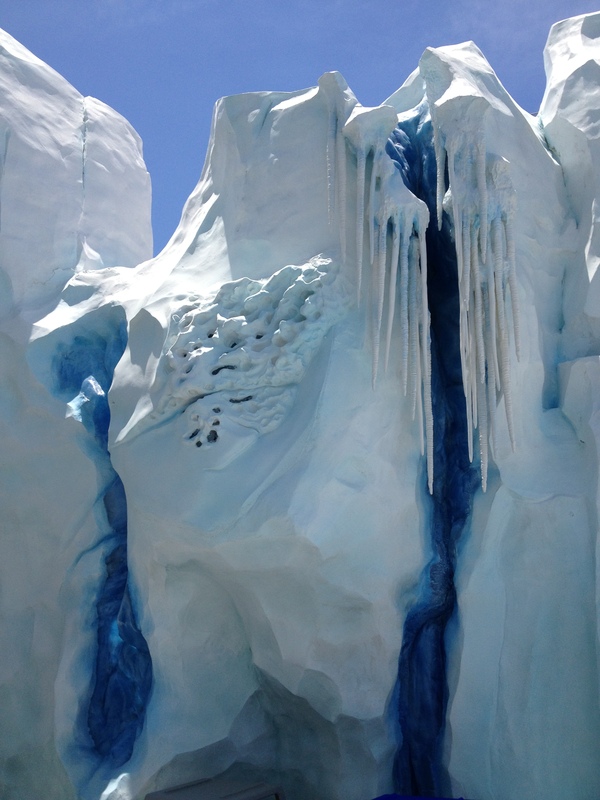 Next, we’ll leave the Sea of Ice and take off our winter clothes and put them away and disembark our ship and walk into our next area. 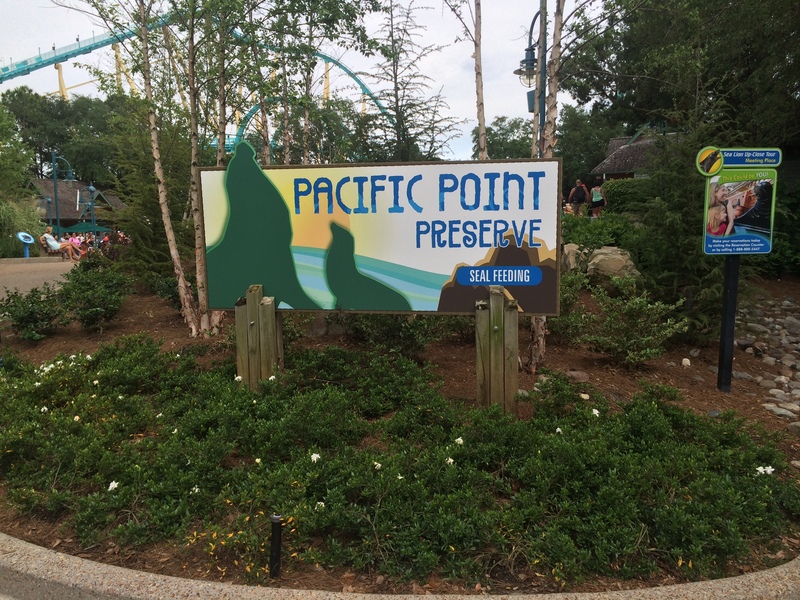 This area contains most of SeaWorld’s restaurants, some gift shops, two shows, a ride, and an animal interaction area called Pacific Point Preserve which houses California Sea Lions that you can feed them for an additional fee at certain times of the day. 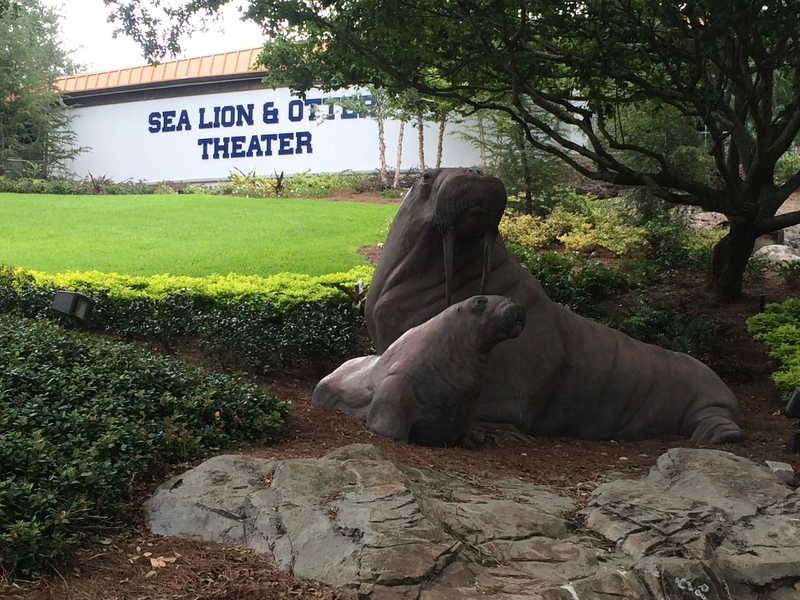 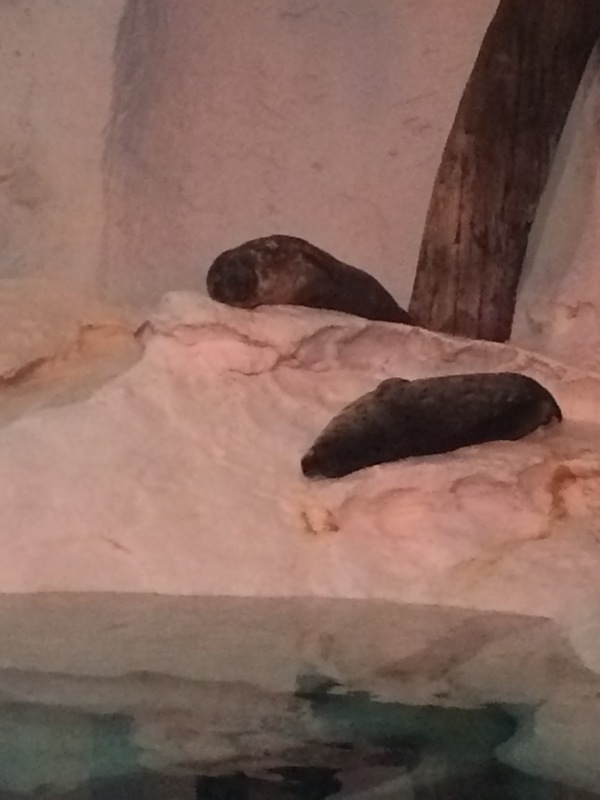 Now the we’ve fed the Sea Lions and washed our hands, we’ll go see some more Sea Lions as well as otters and a Walrus perform next door at the Sea Lion and Otter stadium next door in a comically hilarious show called Sea Lion High. 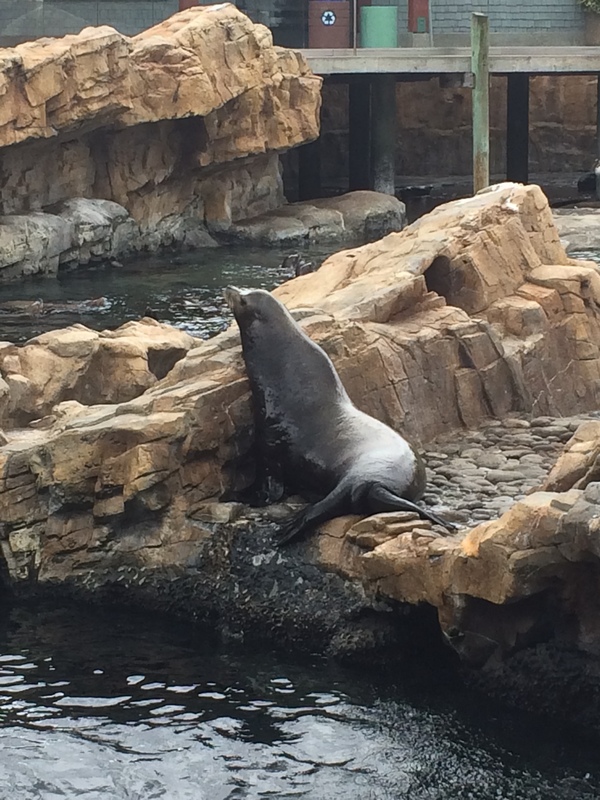 This stadium has been here ever since the park opened in 1974 and there’s always been a Sea Lion and Otter show here since the opening day. 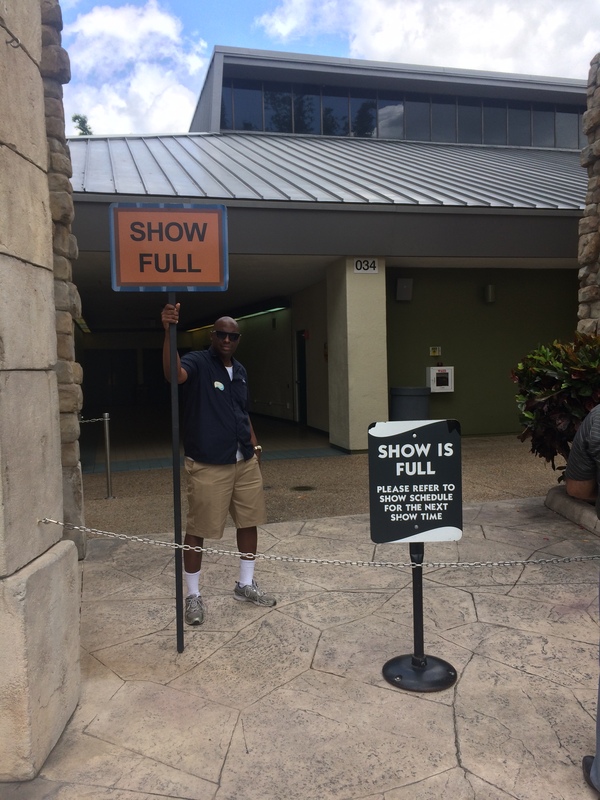 I recommend getting here at least 30 minutes prior the show starting as you can see the School Crossing guard mock and generally have fun with the guests as they enter the stadium. 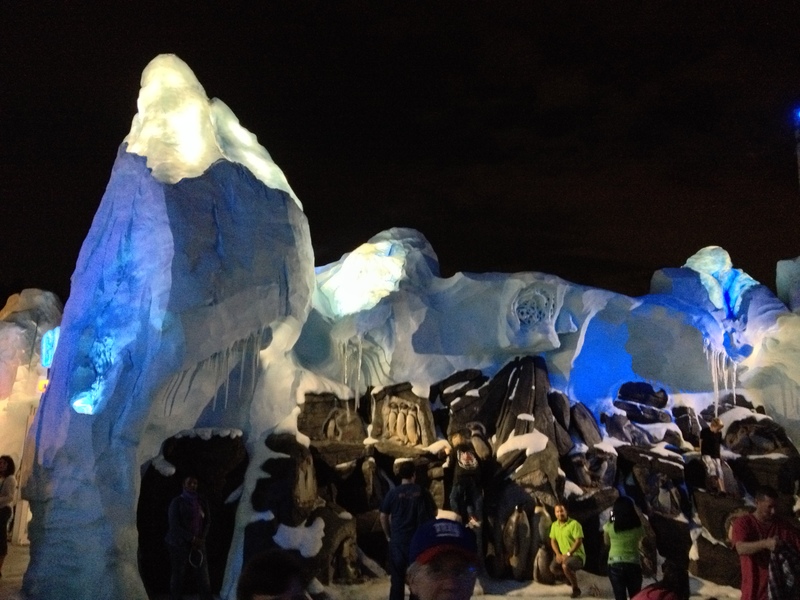 If you get to the stadium but don’t want to participate with the Crossing Guard, then I recommend you enter the stadium at the top by walking up the ramp from the main walkway. 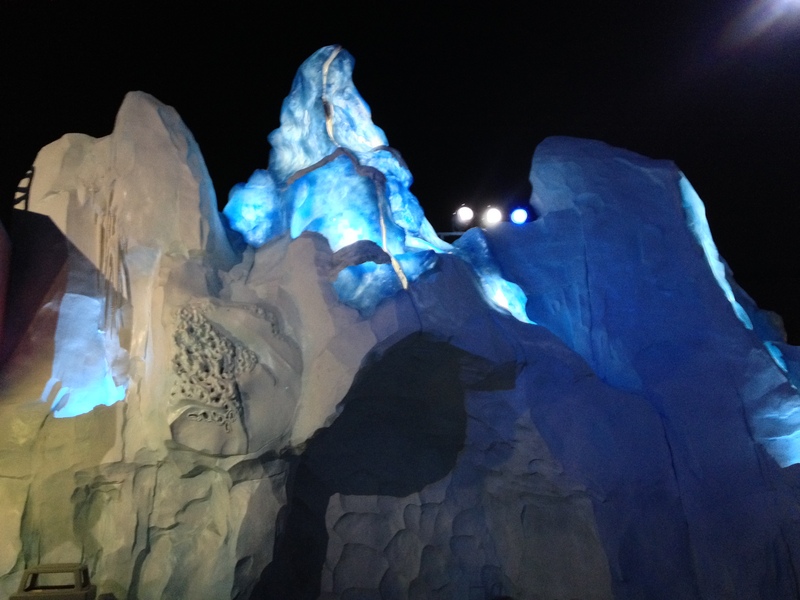 This show does change with the season, during Halloween there’s a Halloween overlay and during Christmas there’s a Christmas themed show. 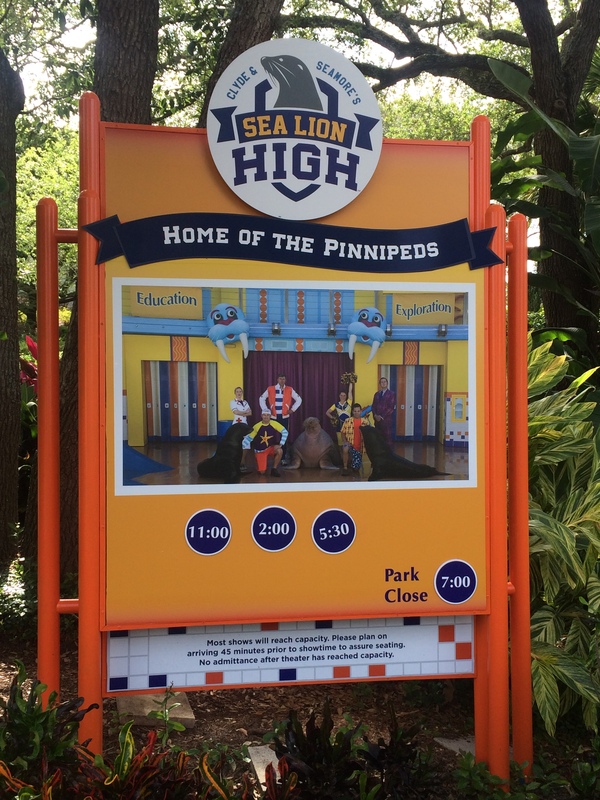 During the summer, they’ll run two shows, Sea Lion High will run during the day and Sea Lions Tonight will run at night when the park is open after dark. 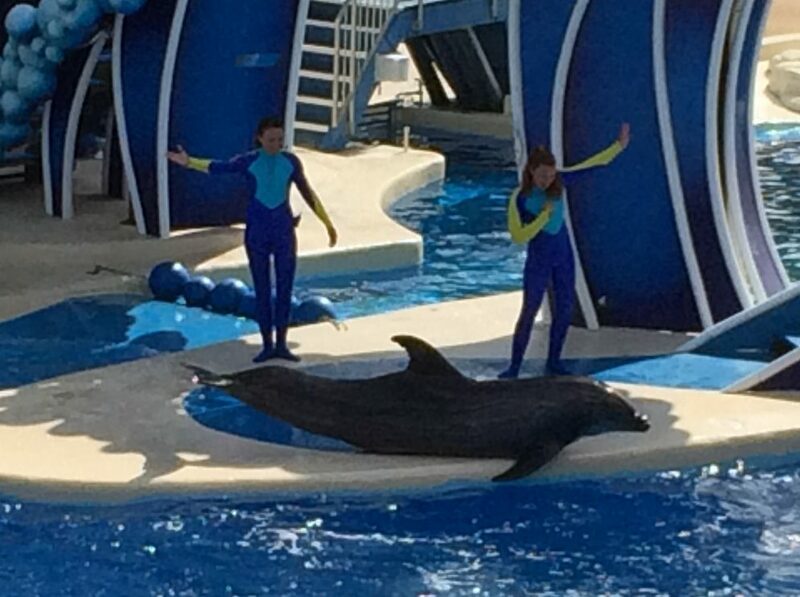 Here’s the School Crossing Guard pre show as well as a lesson in how the trainers work with the animals in teaching them a new behavior and finally the music teacher will teach us the school fight song. 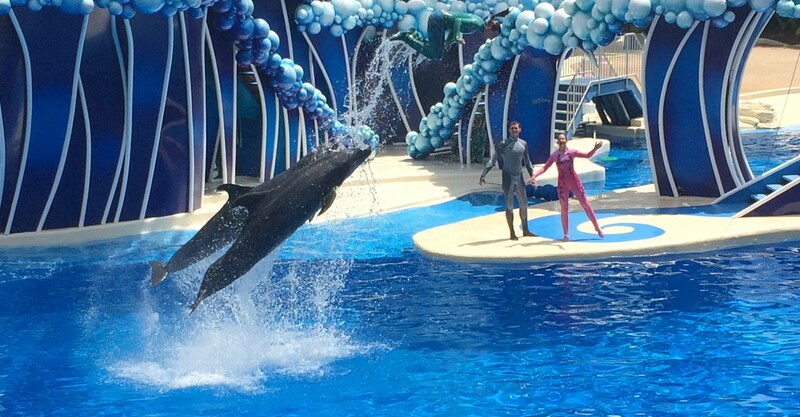 Here’s the full show. 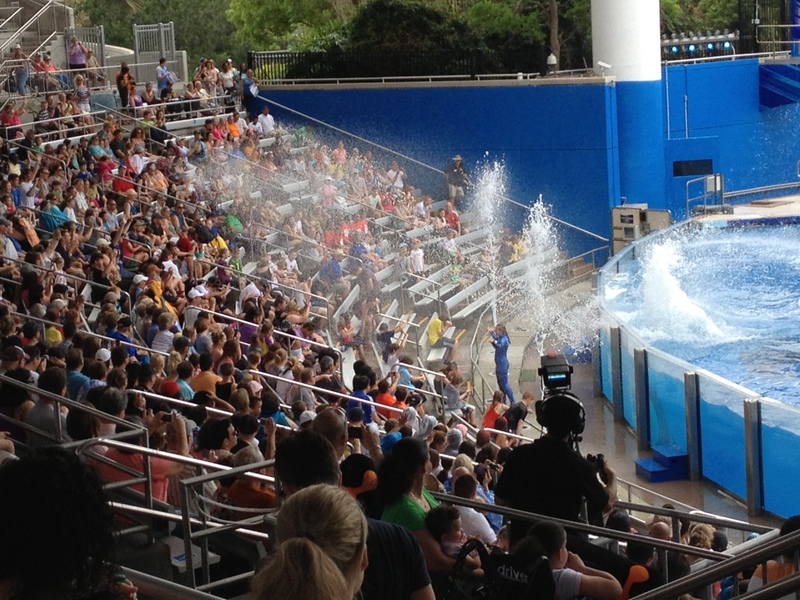 Pay attention to those “soak zone” seats as they really do get wet. 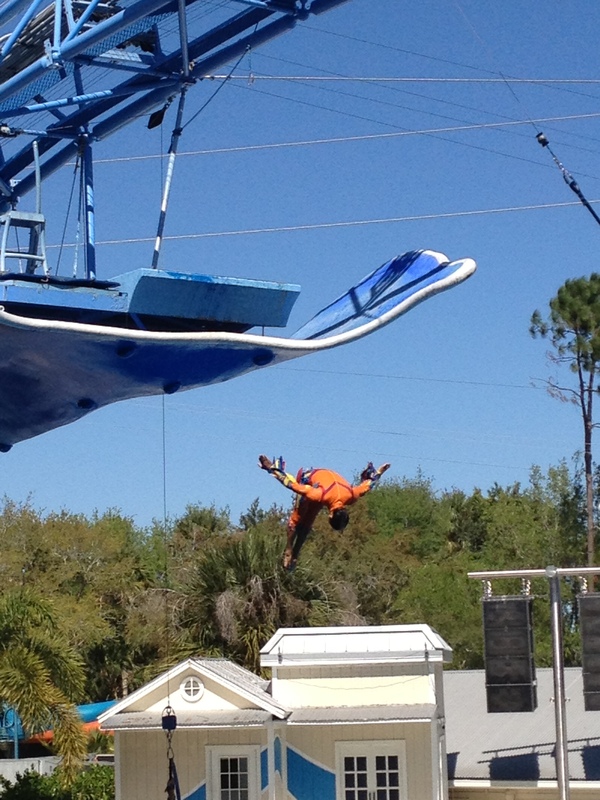 For those that remember the old pirate show, well here they are. 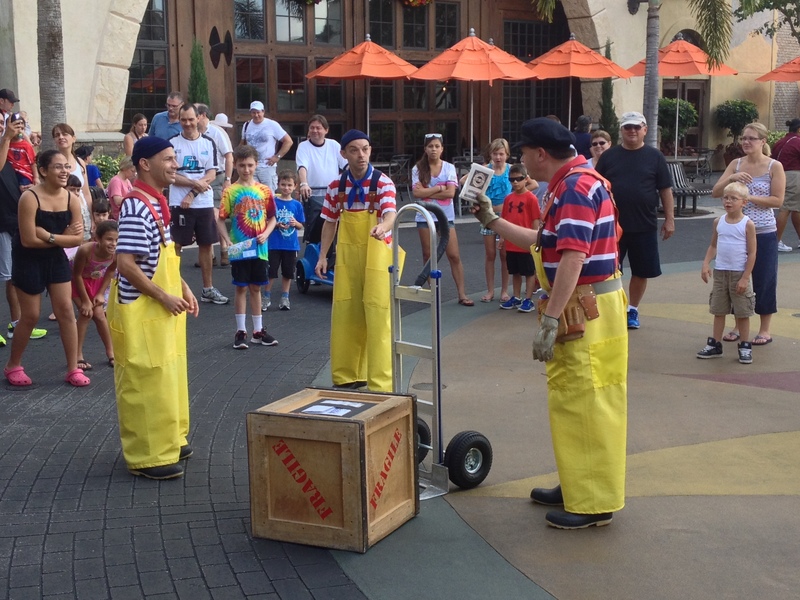 The first one is the Pirate mime pre show followed by the full show. 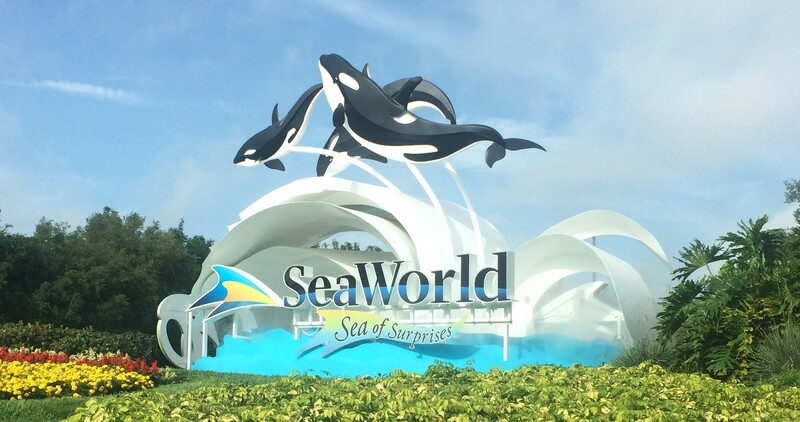 We’ll leave the Sea of Delight for now but will be back here at the end of the day as there’s more to explore in this area. 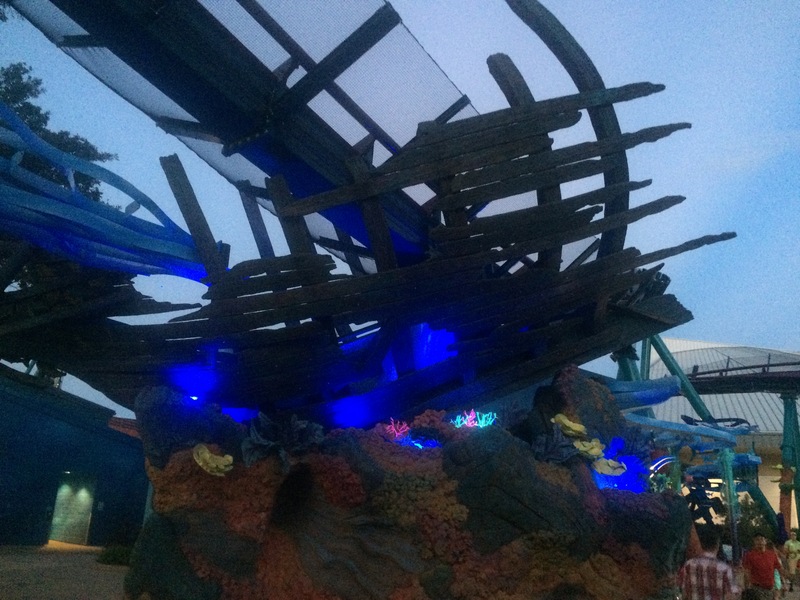 In this area, we’ll explore the mysteries and terrors of the deep. 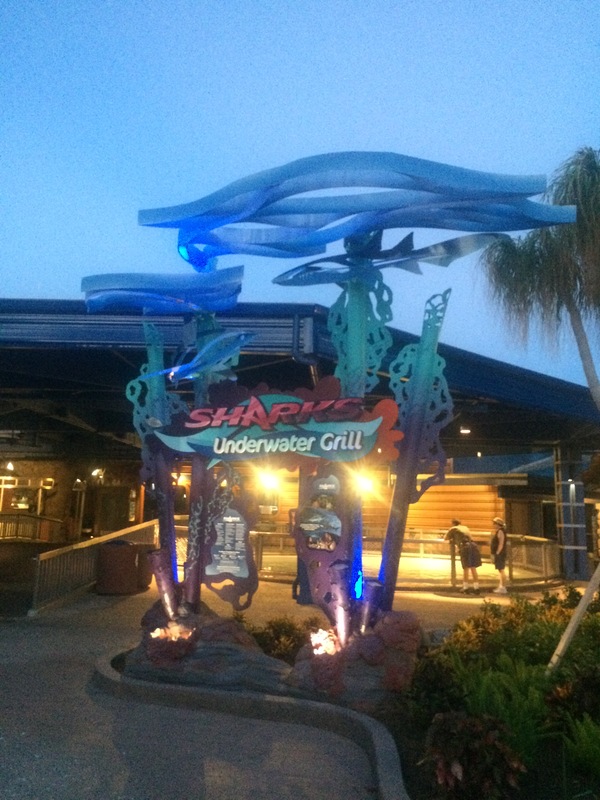 There was one show, two attractions, several animal observation areas, restrooms, a gift shop, a garden area, and the parks best restaurant called Sharks Underwater Grille. 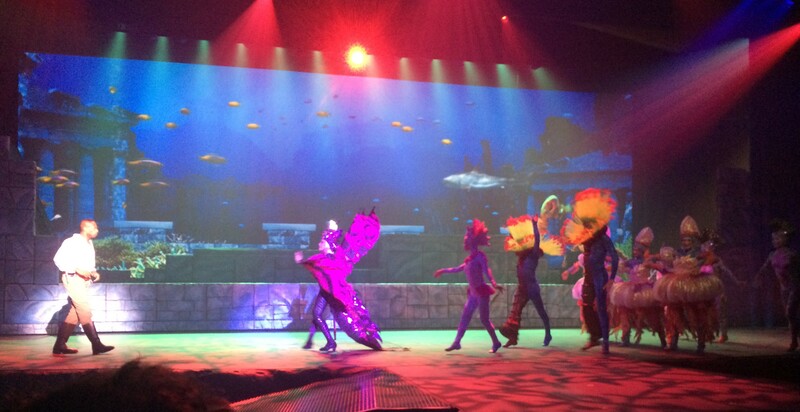 When we enter the Sea of Mystery, we also enter a new sub area called…. 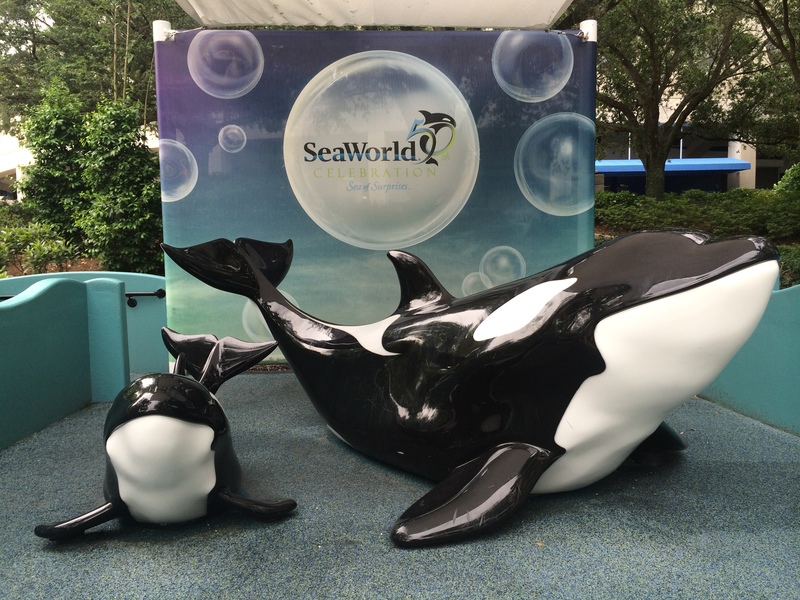 The one thing that SeaWorld does well is education and there are several educational spots in this area. 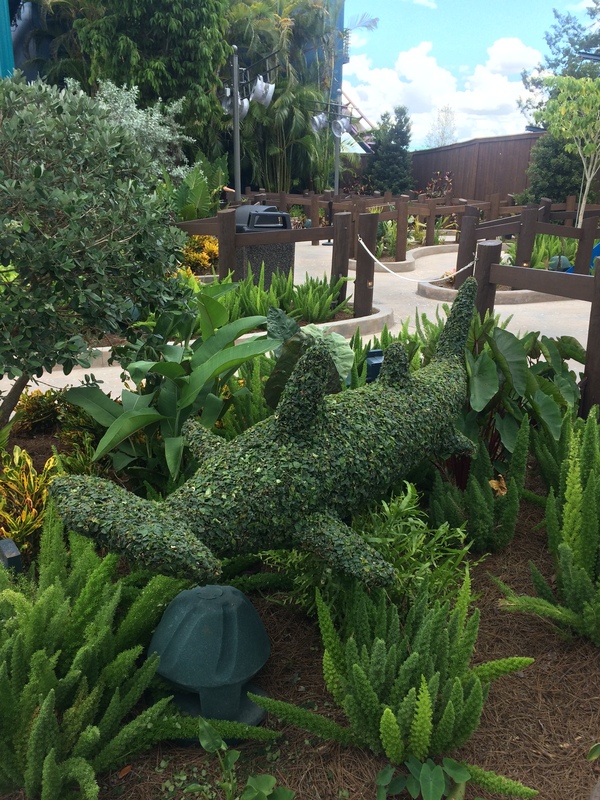 The first attraction we come to is the Shark Encounter. 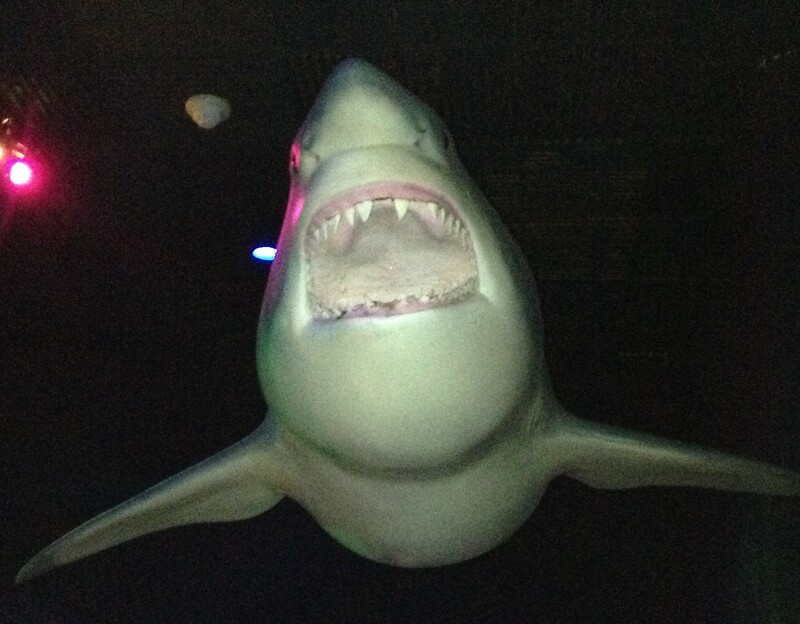 This attraction opened in the 80’s and originally had a show which featured a show host and three screens that talked about the facts and myths about sharks. 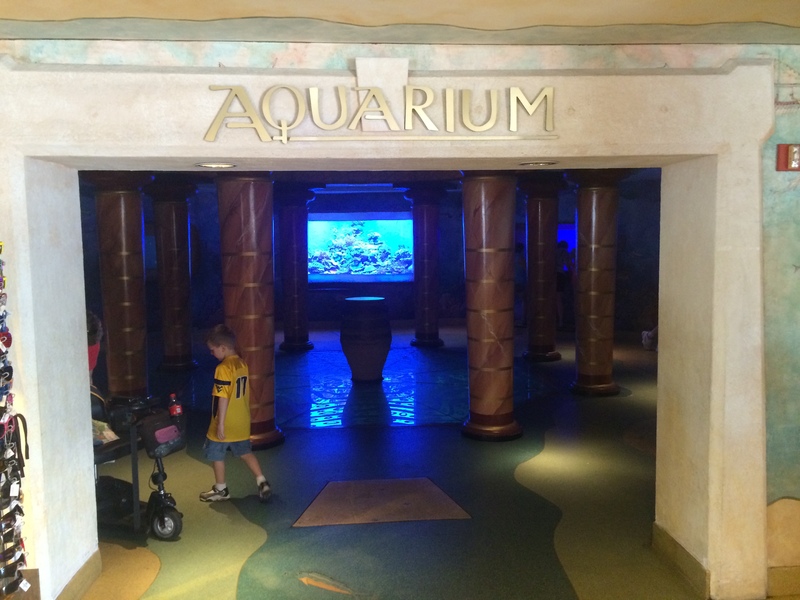 You would you would cross a bridge over a pool of small sharks and enter the show room where the Sharks Underwater Grill is now and see the show and movie. 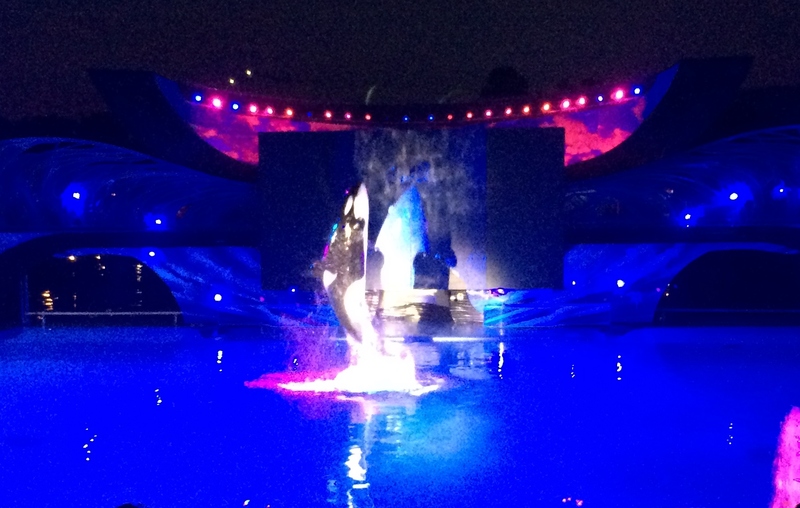 The three screens would then retract at the end of the show revealing the tank with the larger shark species. 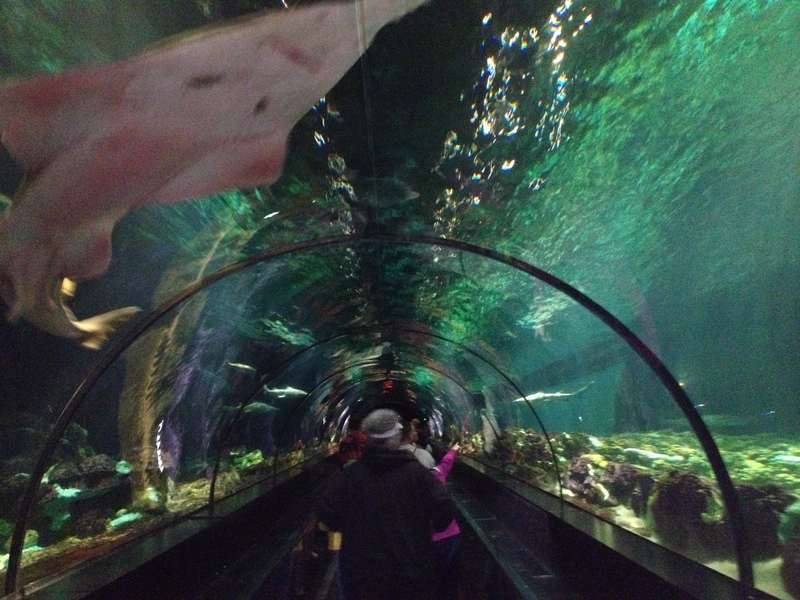 Then you would work your way down to the tube with the moving walkway in it that takes you slowly through the tube where you can see many different species of shark including the Sawfish that isn’t actually a member of the shark family, it’s actually a member of the ray family and I’m not talking about Ray Charles either and it is a critically endangered species which means this species is likely to be extinct if things aren’t done to help save the species. 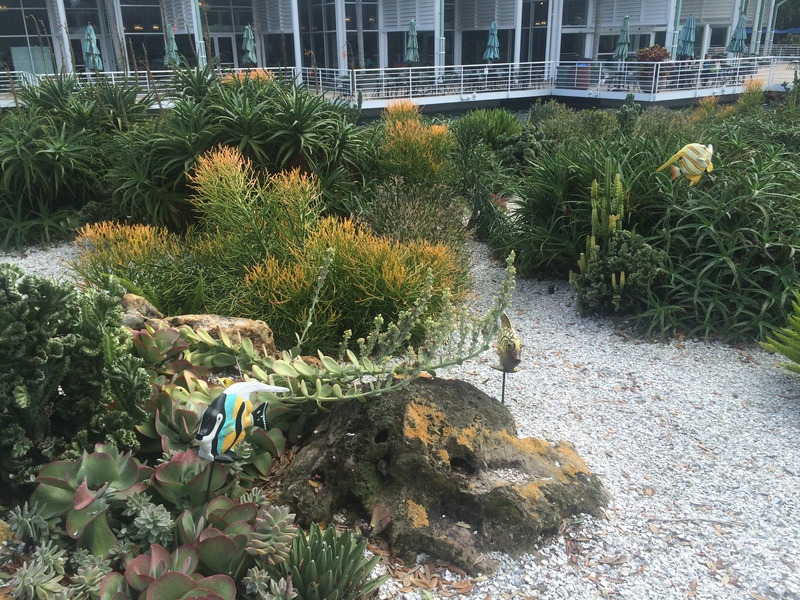 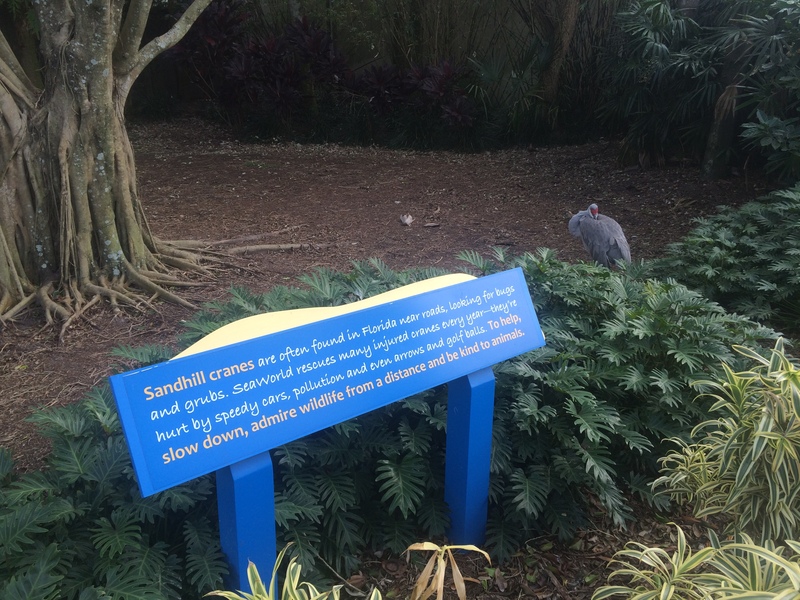 The photos below are of the birds in the habitats just outside of the entrance to the exhibit. 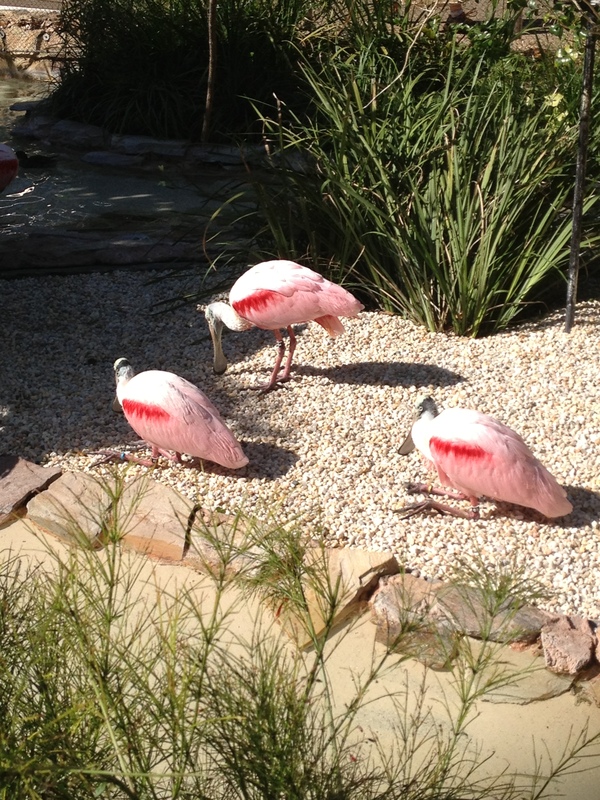 Two of the photos are of Roseate Spoonbills which are native to Florida along Florida’s Gulf Coast and Central Florida’s Atlantic coast in the Merritt Island National Wildlife Refuge which is adjoined by NASA’s Kennedy Space Center. 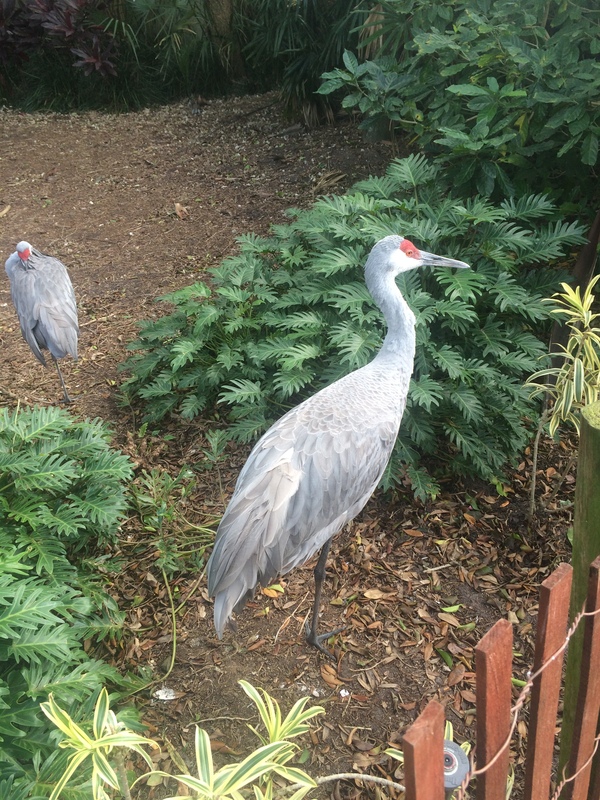 I’m not real sure what the two small grey birds are but they are beautiful none the less. 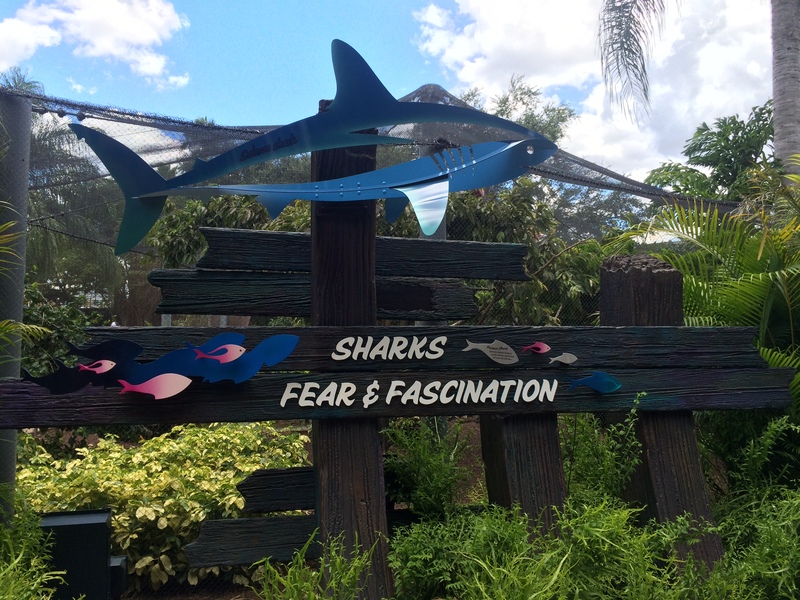 This attraction was later expanded to include other terrors of the deep like barracuda, Lion Fish, Moray Eels, and other dangerous animals. 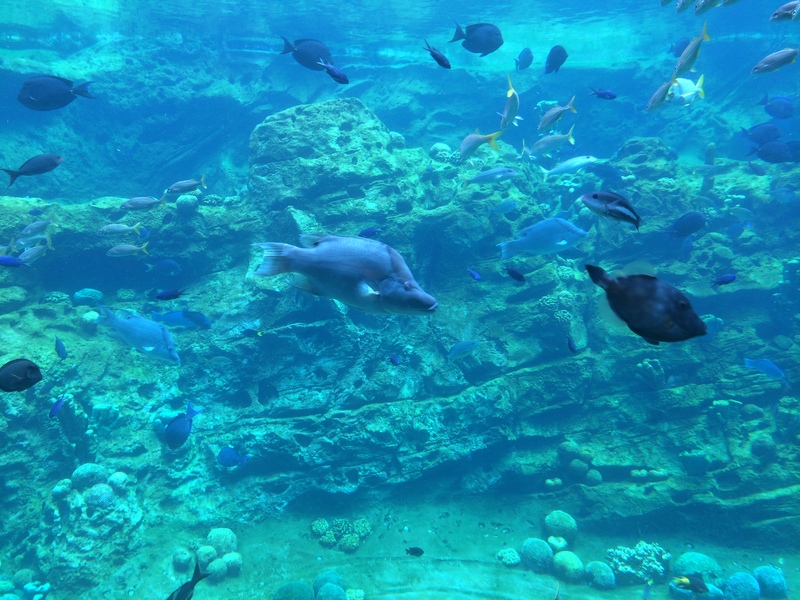 There’s a large walk-through coral reef tunnel when you first walk in that’s really beautiful and has a huge selection of fish that call the coral reefs home. 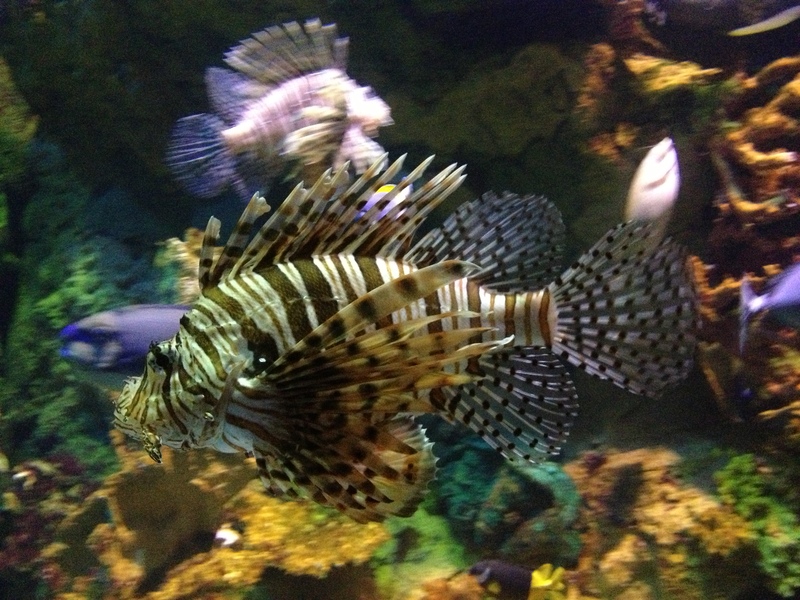 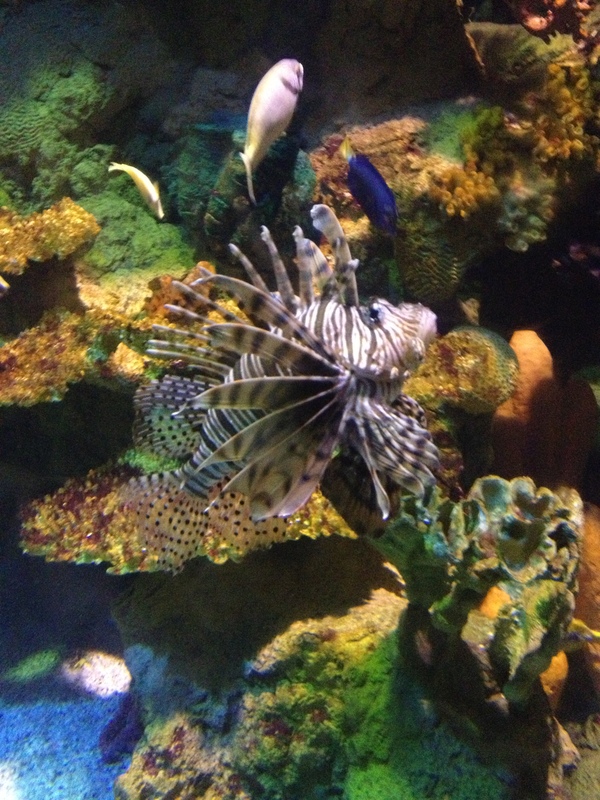 Hopefully I’ll take some better photos of those animals and habitats on my next visit to SeaWorld Orlando but I do have two photos of the beautiful but dangerous Lion Fish. 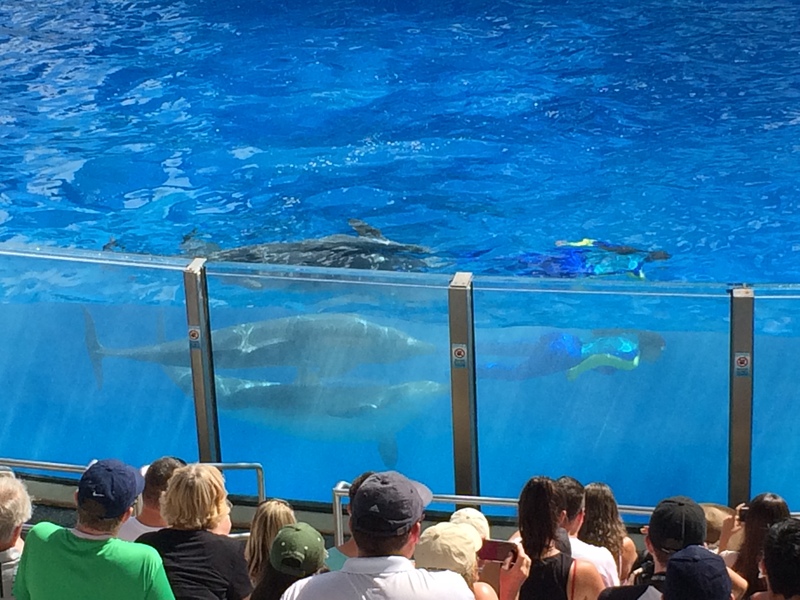 Next we’ll enter the Shark tube. 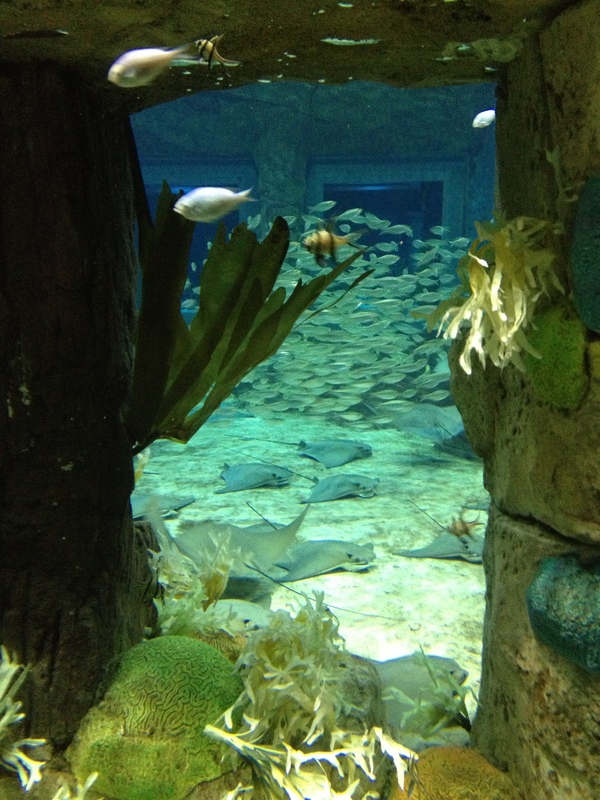 Earlier I talked about the Sawfish and here it is, swimming over the top of the tube. 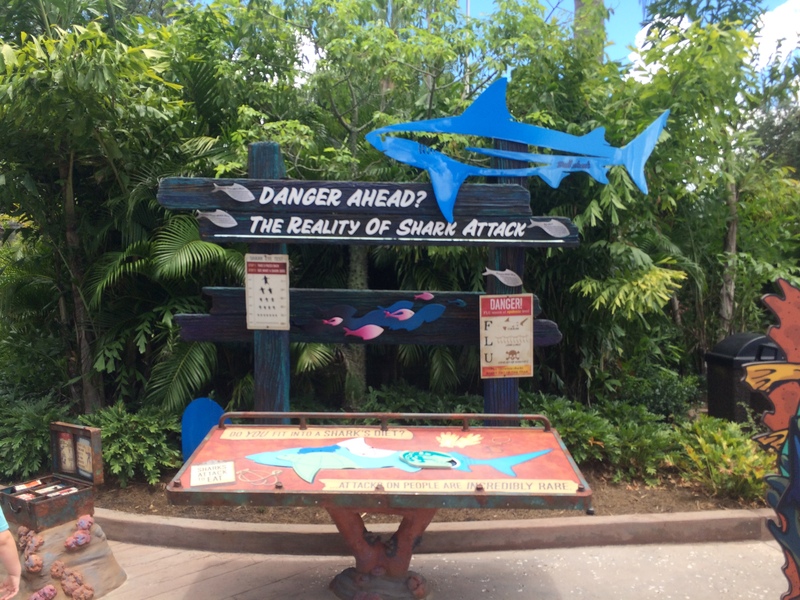 Here’s a walk-through video I shot of the Shark Encounter. 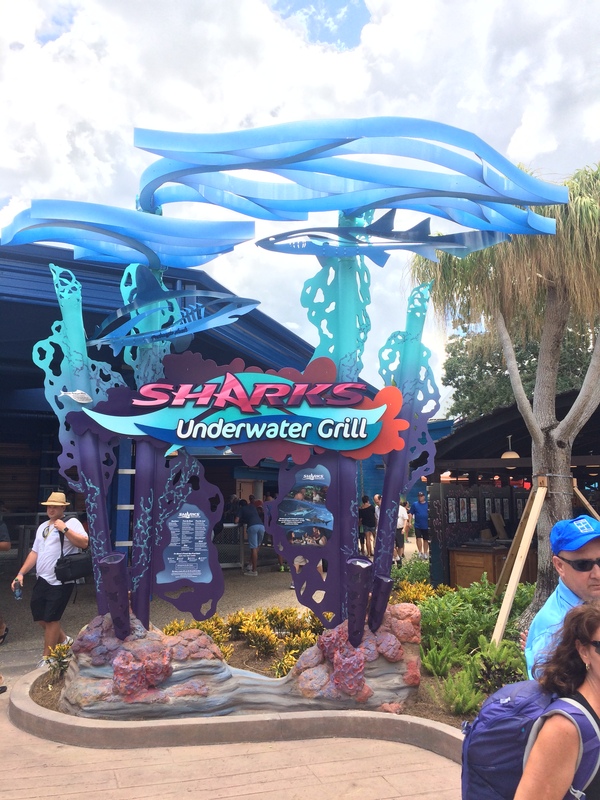 When this attraction was expanded, the theater was removed and a restaurant called Sharks Underwater Grill was installed and this restaurant is really good and expensive so reservations are recommended. 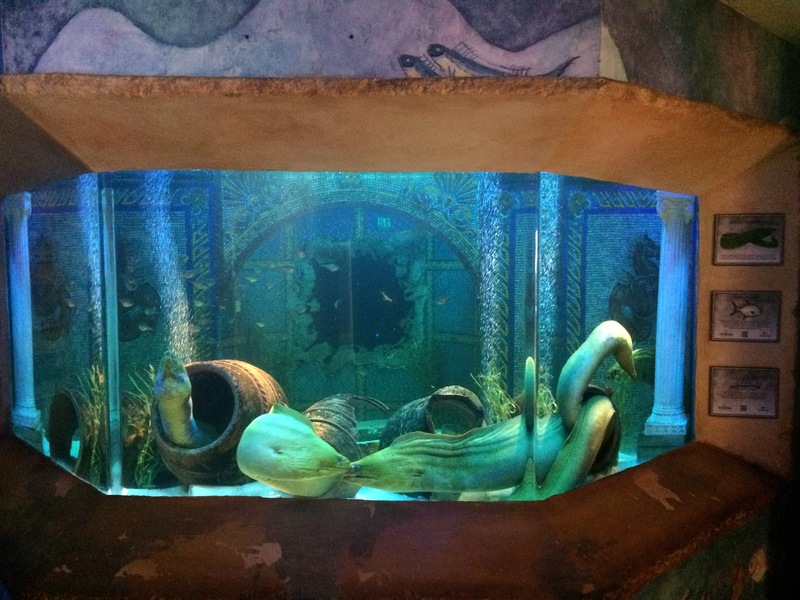 You can eat while watching fish swim by or you can have a drink at the bar that are small aquariums themselves. 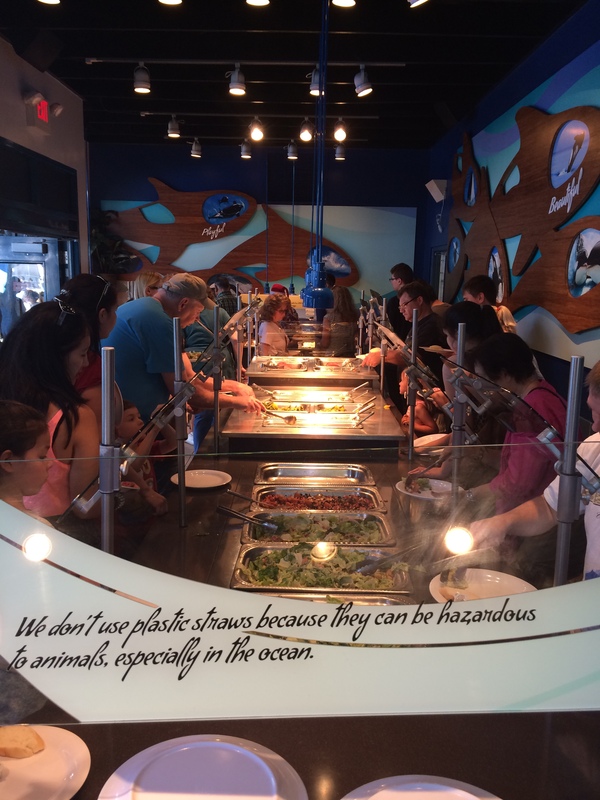 This is SeaWorld’s upscale restaurant and I really do recommend this restaurant if you have the time and money to spare. 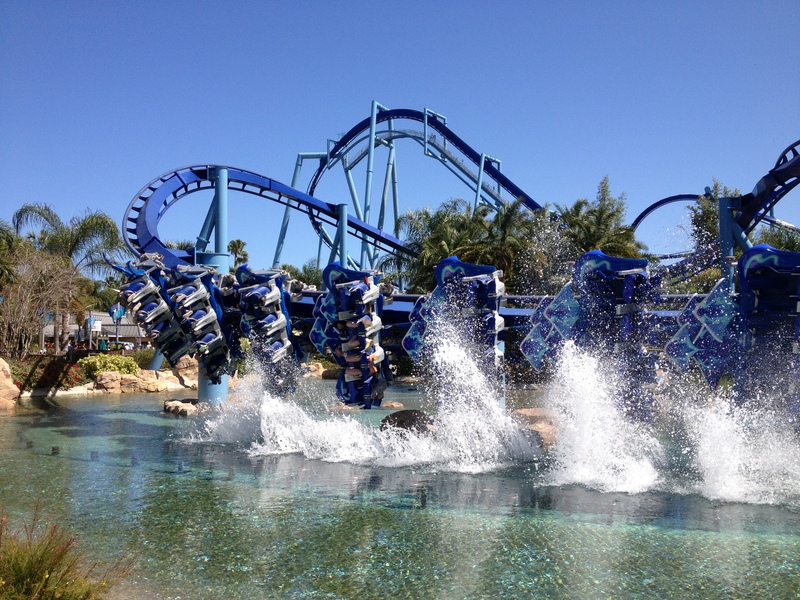 Next up is truly an amazing roller coaster called Mako. 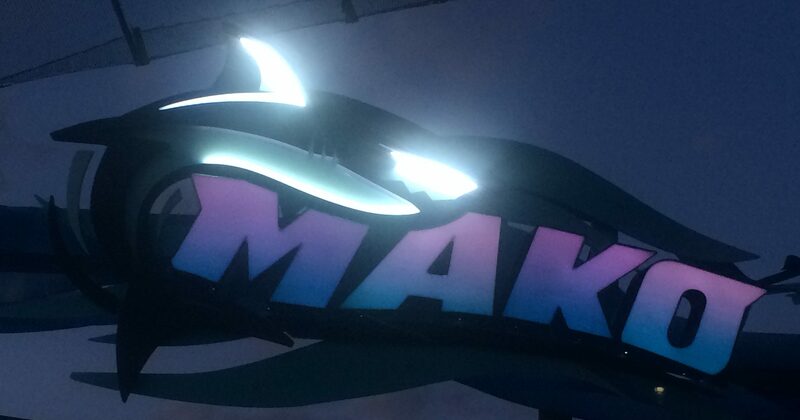 Mako was aptly named after the fastest shark in the ocean and this coaster doesn’t disappoint. 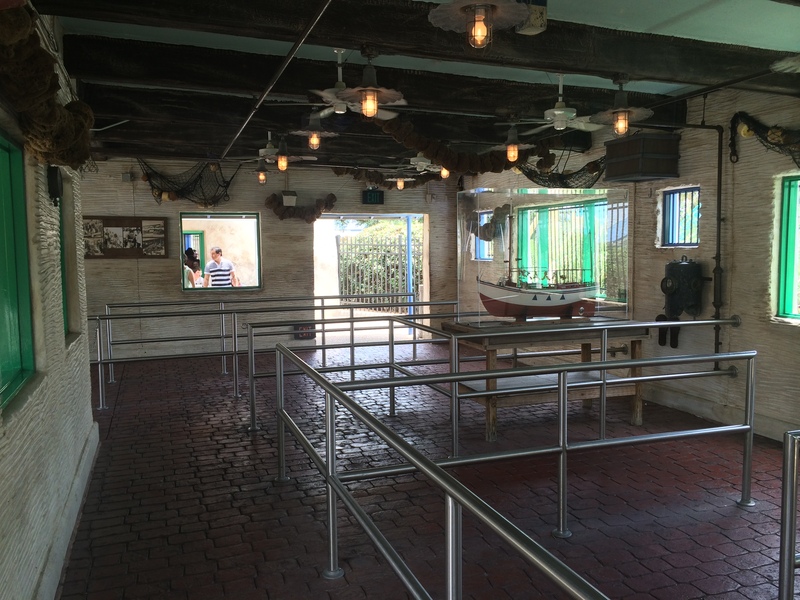 Remember, in Shark Wreck Reef, you are underwater and you are the shark so you enter the queue that is designed to approximate the floor of the ocean and then you enter the station house under a simulated dock. 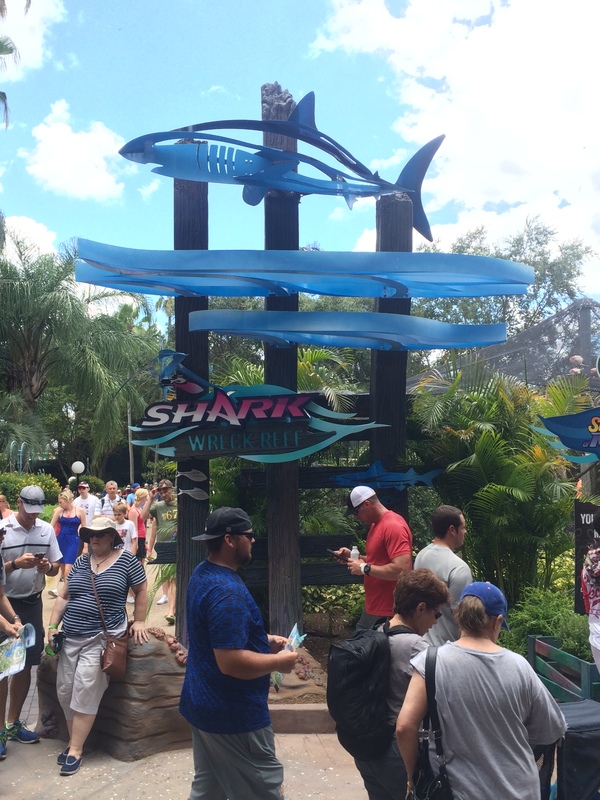 Then you climb the stairs and board you own shark train, pull down your “T” style lap bar and prepare yourself for an exhilarating ride. 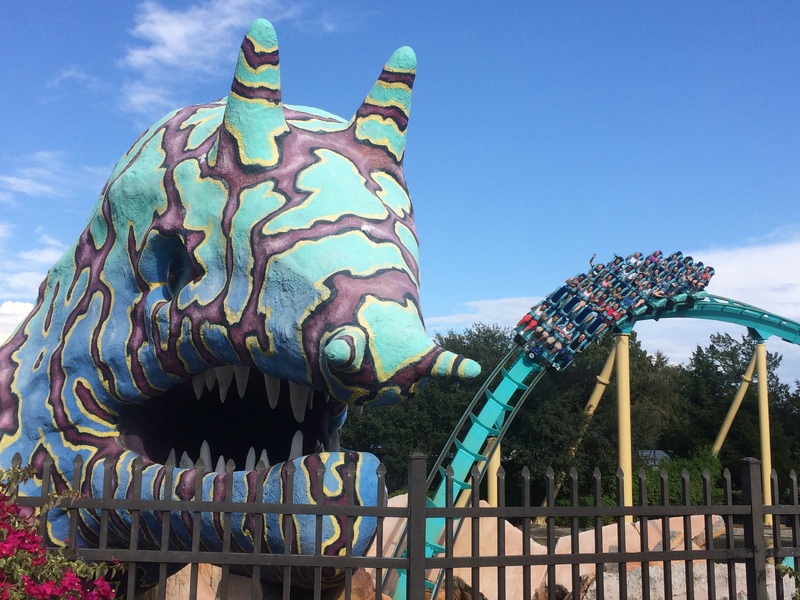 This coaster was built by B&M (Bolliger & Mabillard) and opened here on June 10, 2016. 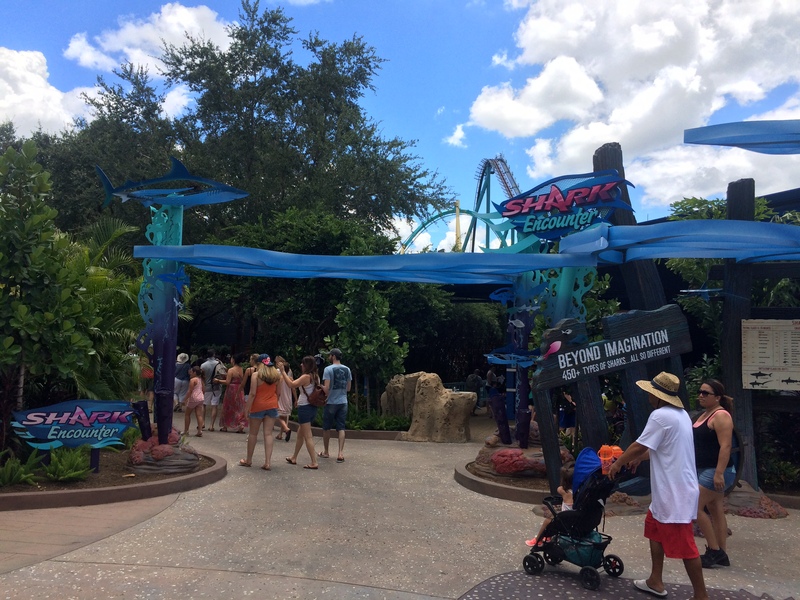 Mako is a Hypercoaster meaning it is between 200 and 299 feet tall and doesn’t invert (go upside down) so the standard over-the-shoulder restraints are not needed. 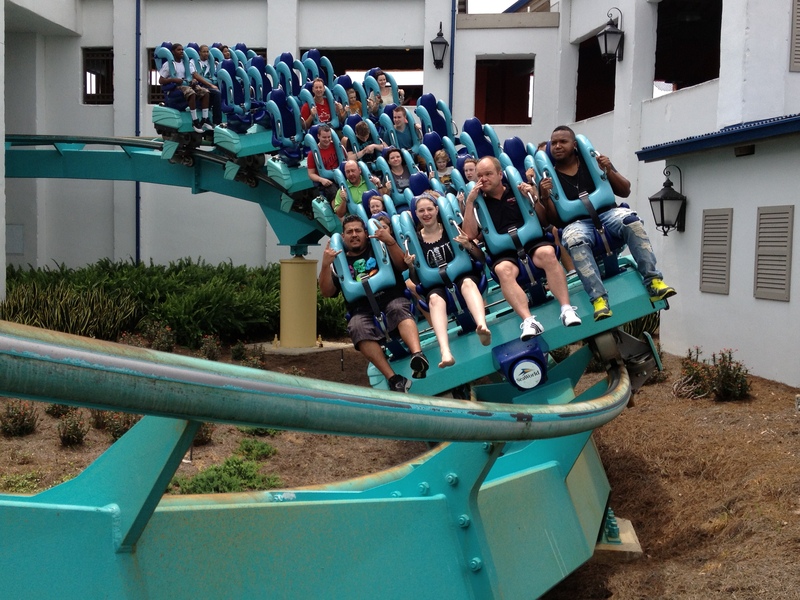 In other words, Hypercoasters like this one are built for pure speed and air time which this coaster has a lot of. 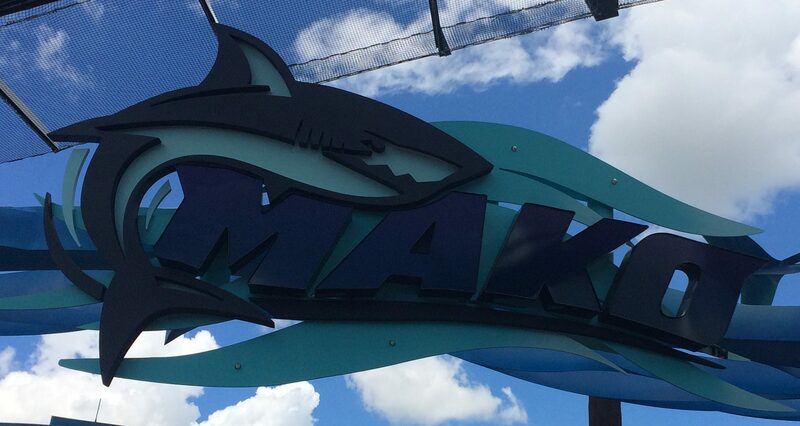 Mako is 200 feet tall, 4,760 feet long, and has a top speed of 73 mph making it the tallest, fastest, and longest coaster in Orlando. 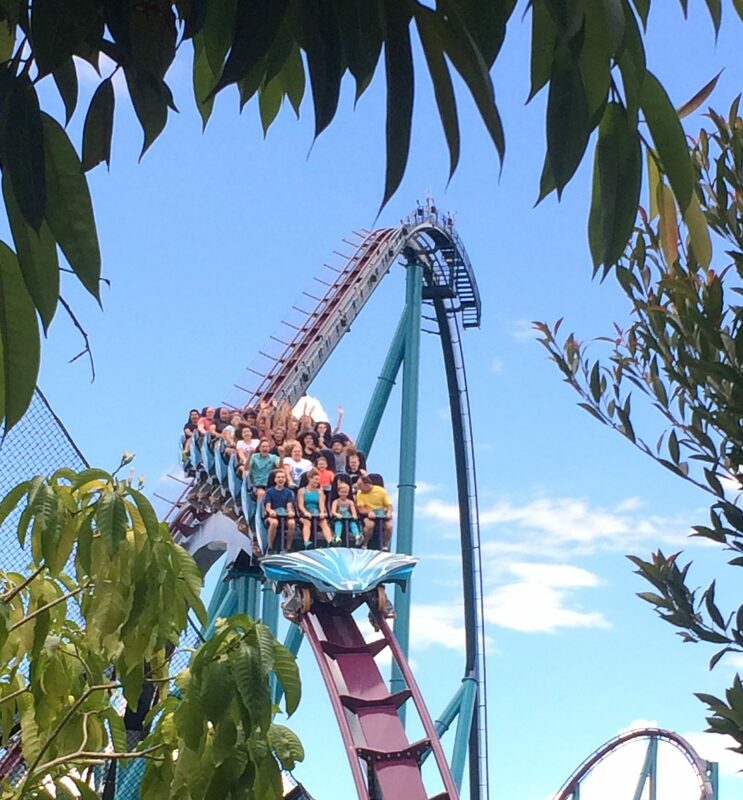 Here’s my off ride video from my YouTube channel. 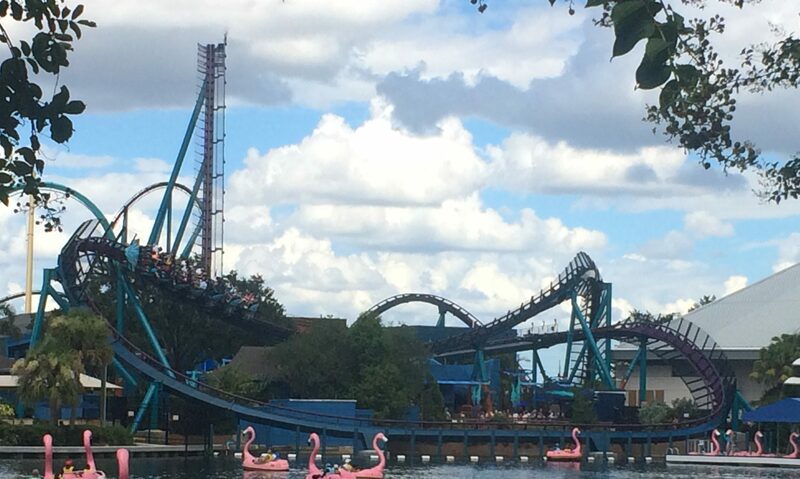 Here’s an on ride video from Theme Park Review’s YouTube channel. 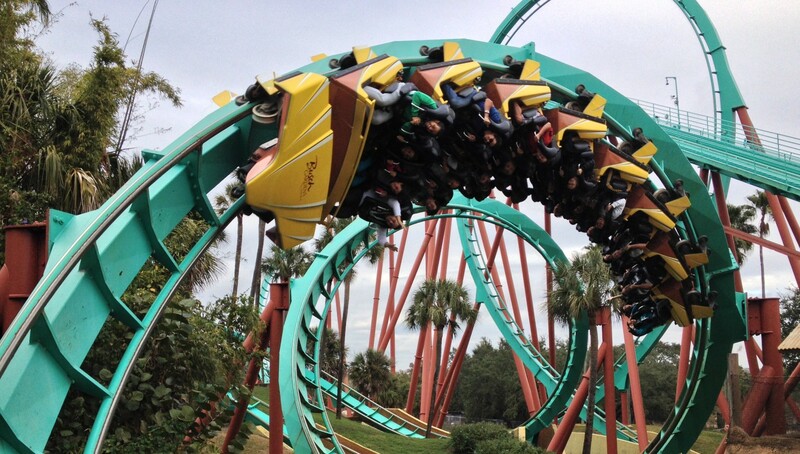 Make no mistake, just because it doesn’t have inversions doesn’t mean that this coasters is, in any way, boring. 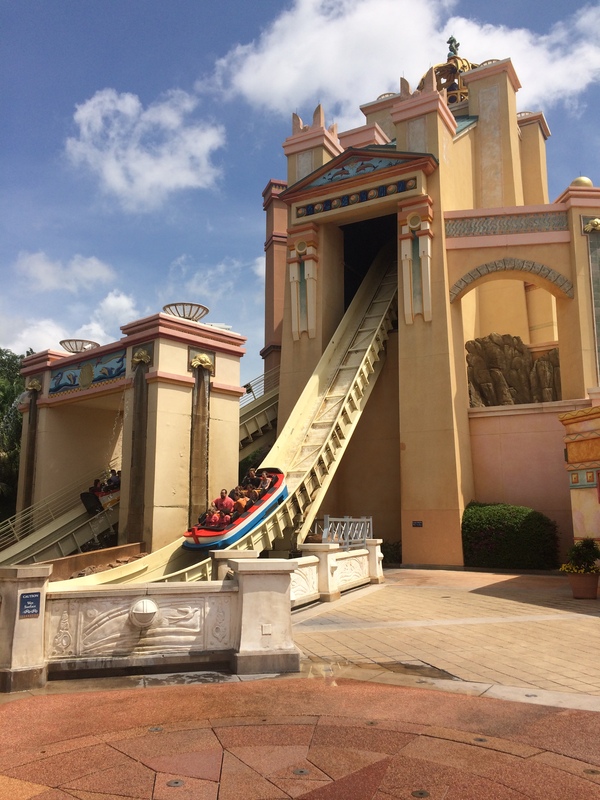 This coaster has incredible amounts of air time where you are floating over the tops of those hills and the first drop is incredibly steep as well. 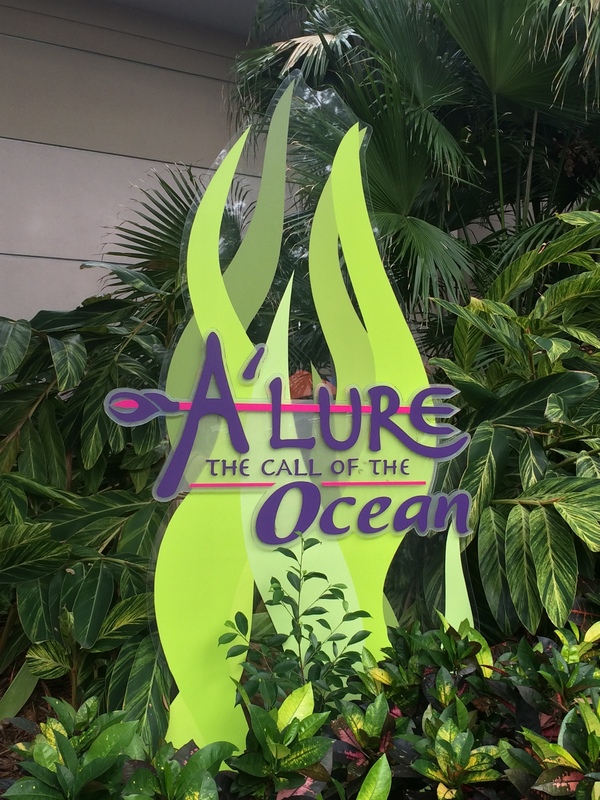 Next up on the park map is an indoor stage show called “Alure The Call of the Ocean” which has since closed down to be remodeled for a new show. 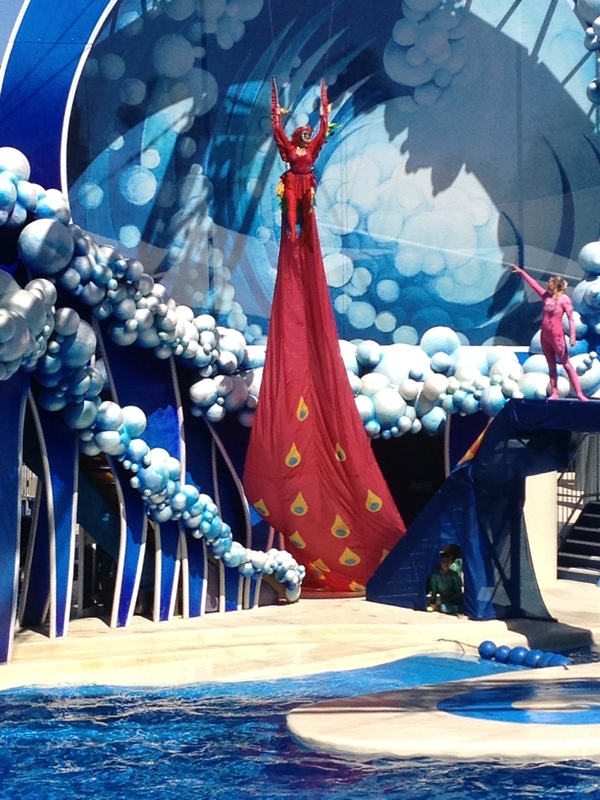 This was a cirque style show that has some really nice costumes and set pieces as well as some really good acrobatics. 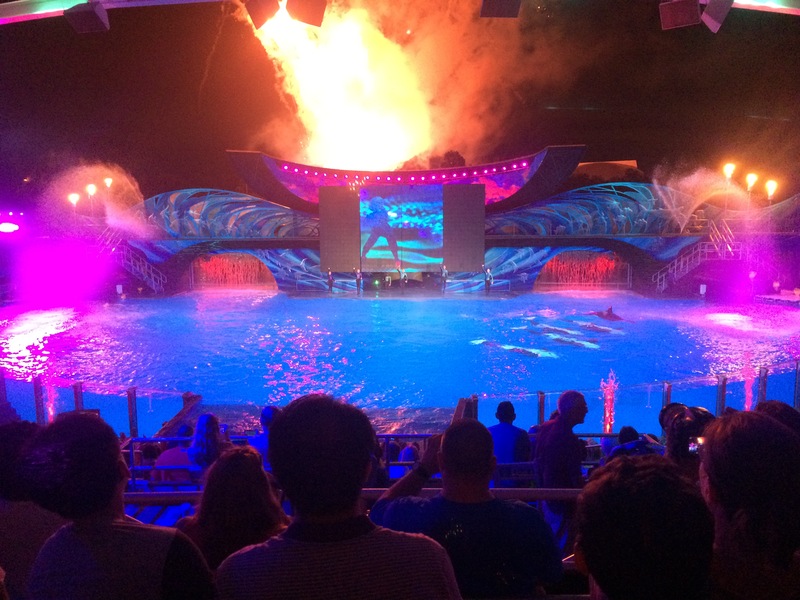 The show starts with an animation of a fisherman casting his line in the ocean and then being pulled into the sea during a sudden storm. 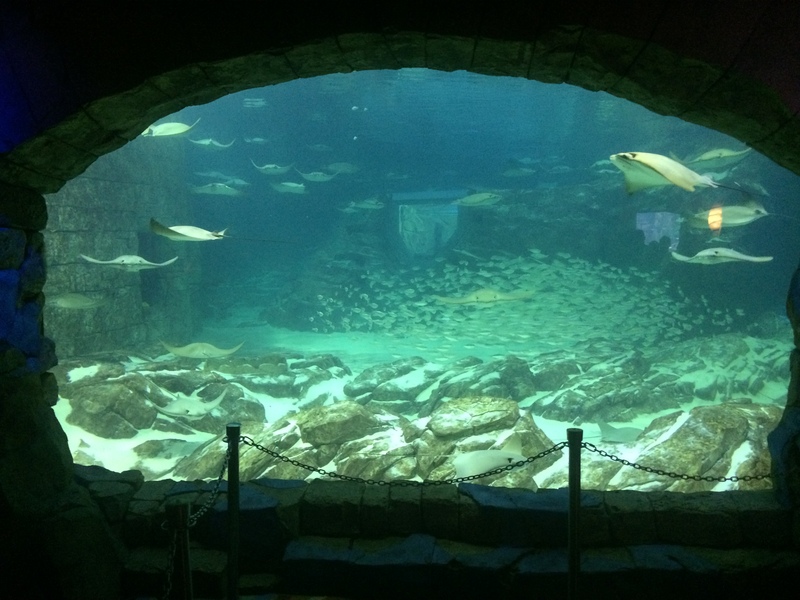 The fisherman then swims to the bottom where he meets all the sea creatures and catches the eye of the princess. 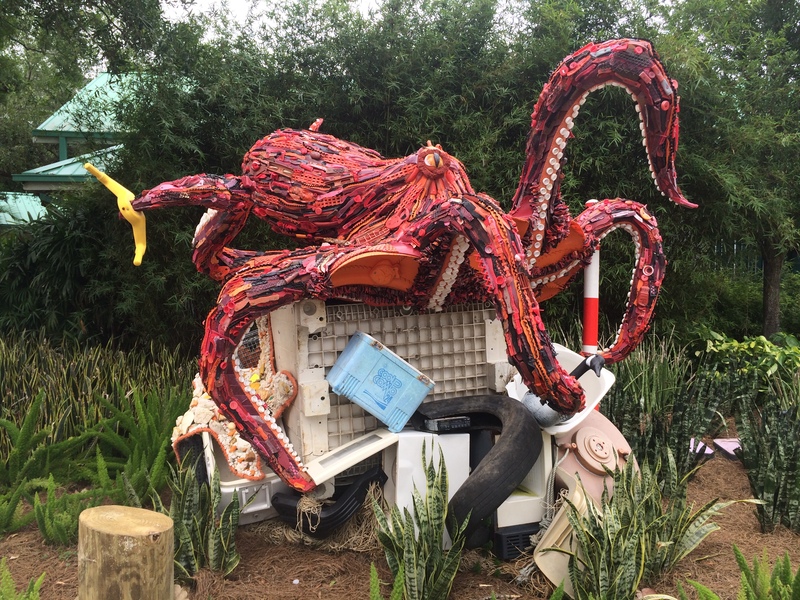 Then the queen sees this and she does not like what she sees and the battle is on. 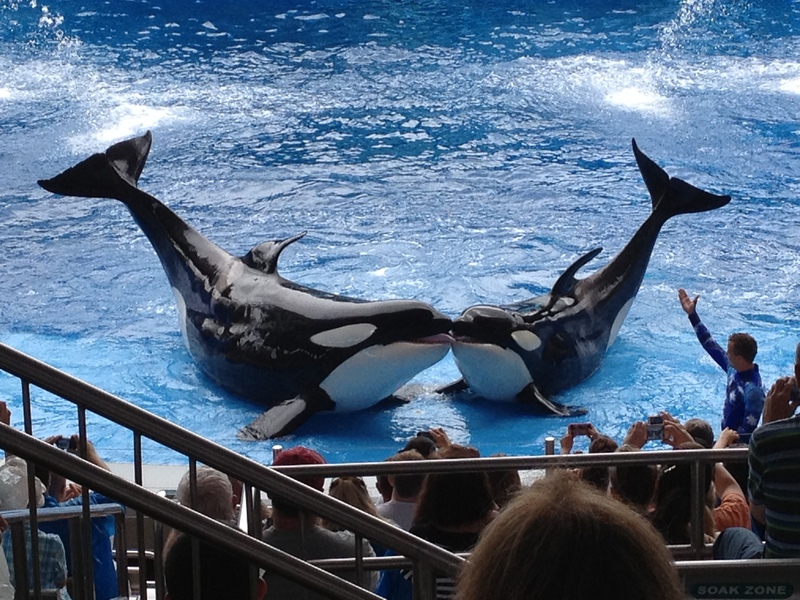 In the end, the queen is vanquished and the princess is now a queen and the two live happily ever after. 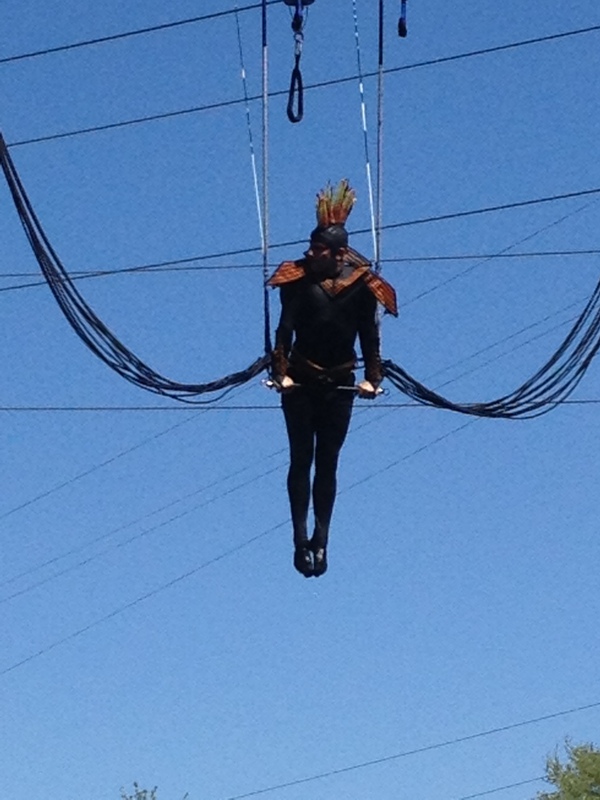 This is a decent show and worth seeing at least once. 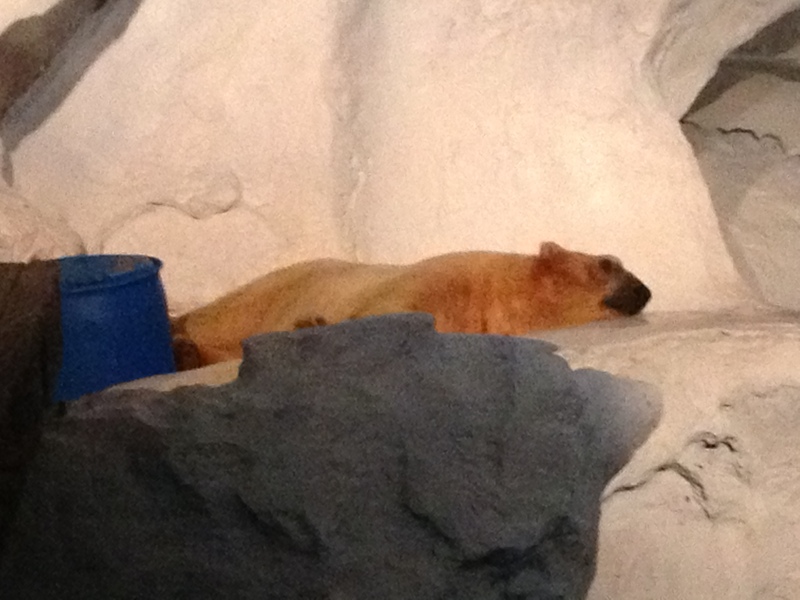 It is also a good way to rest you feet, cool off in the air conditioning, and be mildly entertained at the same time. 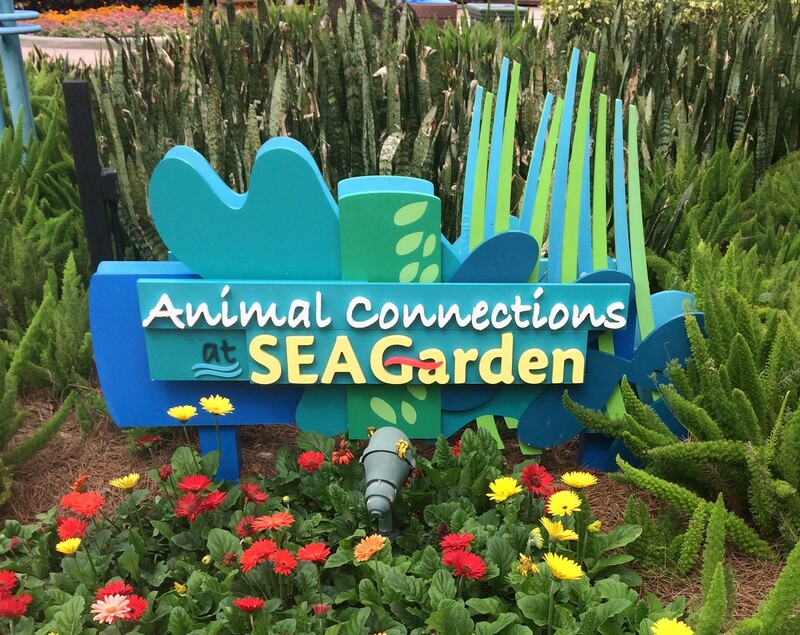 Next up is the Animal Connections, Sea Garden, and the Terrace Garden Buffet. 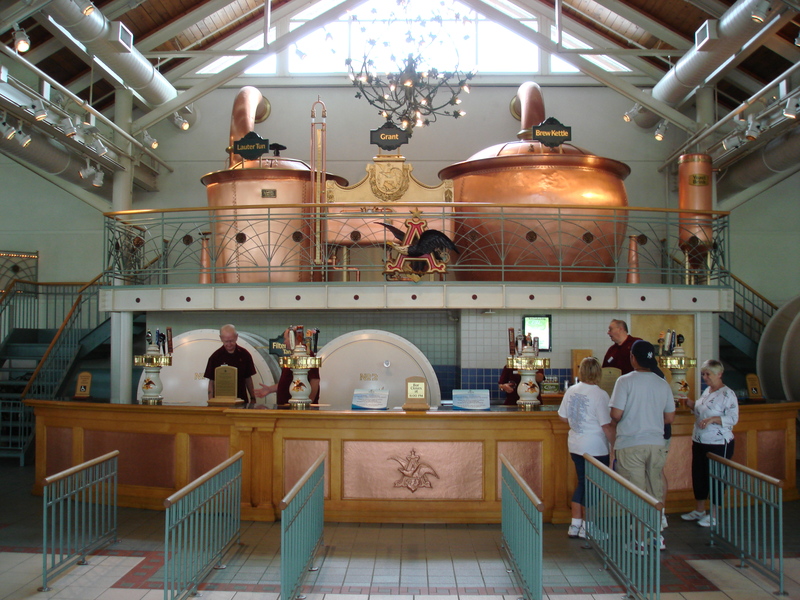 These areas used to be known as the Clydesdale Hamlet and Hospitality House with the Beer Masters School, free Anheuser Busch tasting, a counter service restaurant, and a small Anheuser Busch gift shop inside. 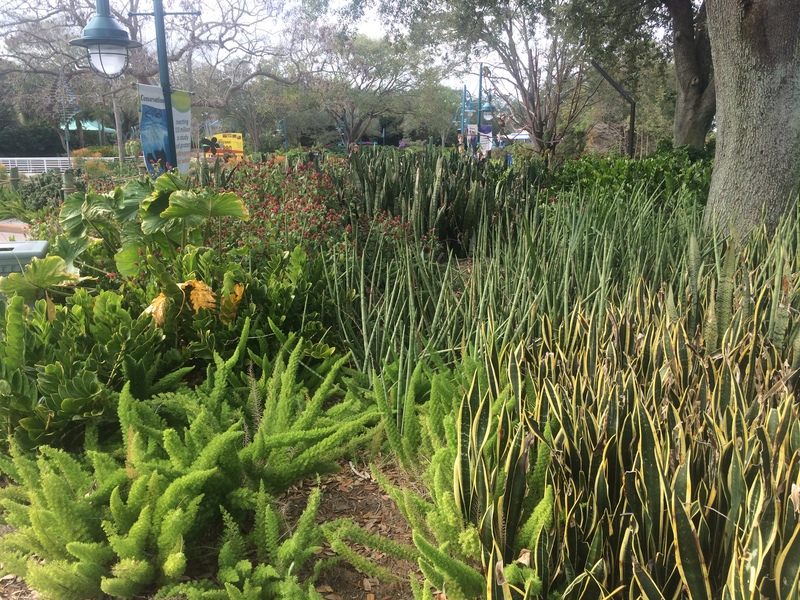 Here are some photos of what this area used to look like followed by a before and after video. 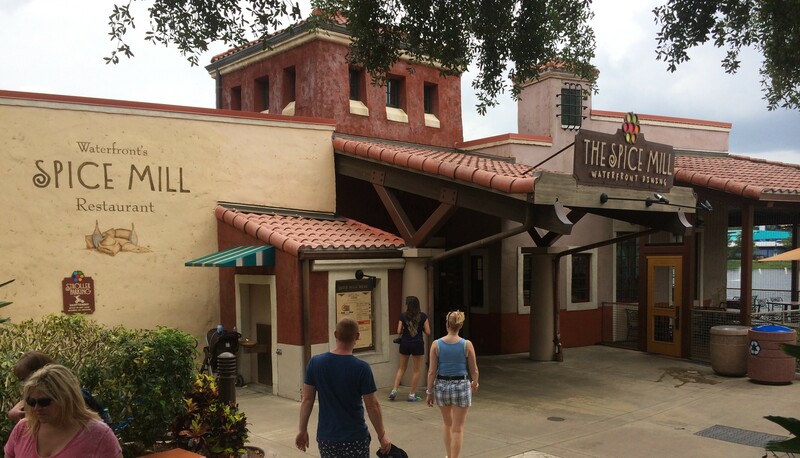 The Terrace BBQ is a counter service restaurant that serves Barbeque ribs, chicken, salads, and southern style sides like coleslaw and baked beans. 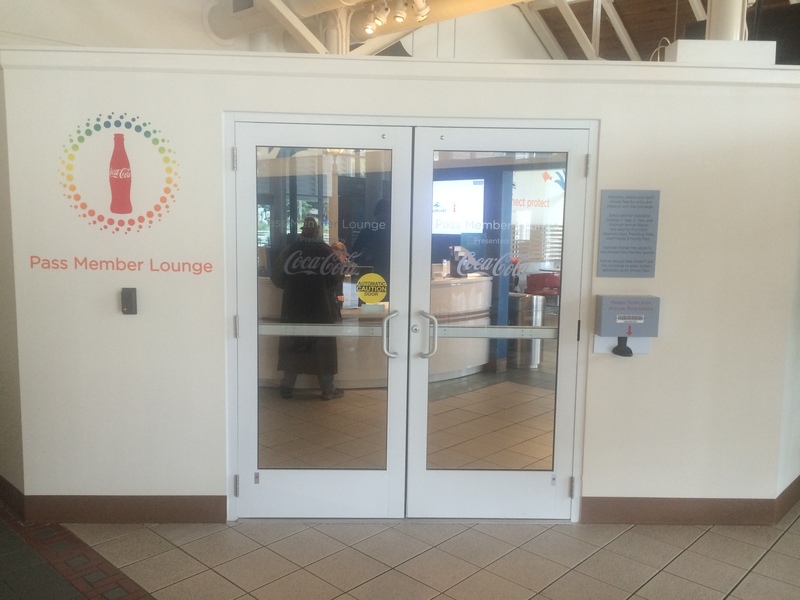 You can also get alcoholic beverages here as well. 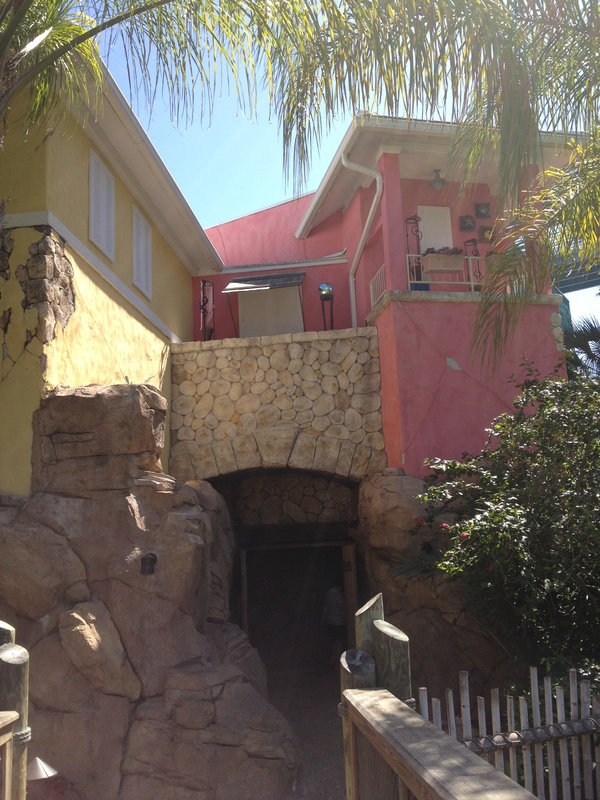 Off to the right inside he same building as the Terrace BBQ is a special area reserved just for the 1 or 2 year Platinum annual passholders only called the Annual Passholder Lounge. 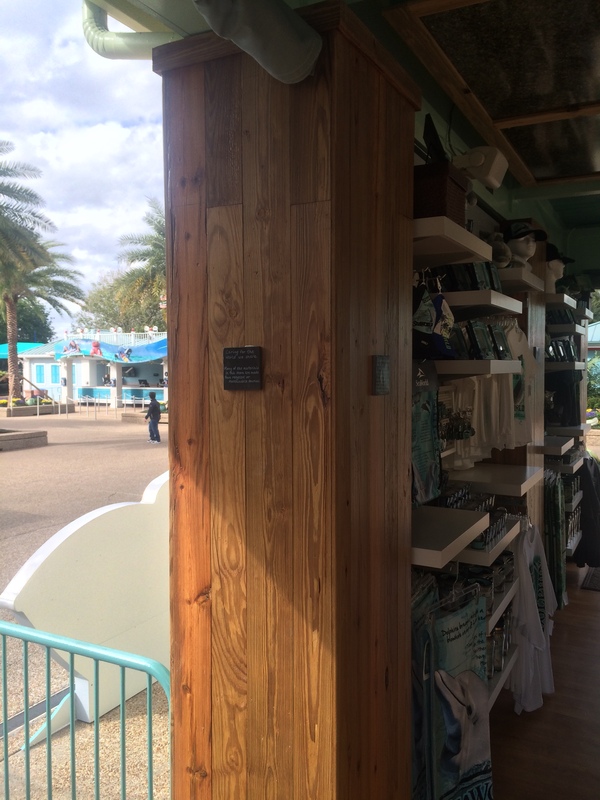 Inside this area is a concierge desk where you can buy special passholder merchandise, make reservations, ask questions, and purchase reserved seating, and other things. 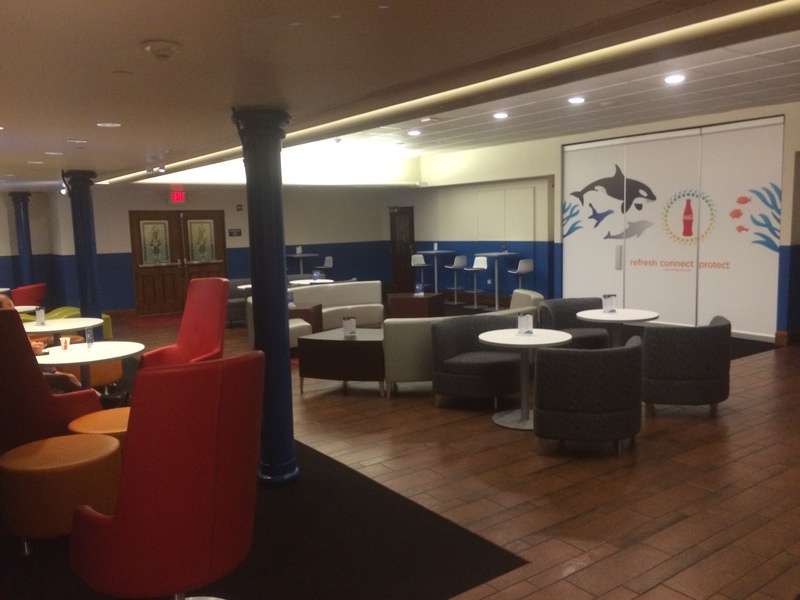 There is a beautiful lounge that also has a free Coke Freestyle sampling machine as well as very comfortable seating, a passholder only food menu that will be brought to you, and a free charging station for your phone. 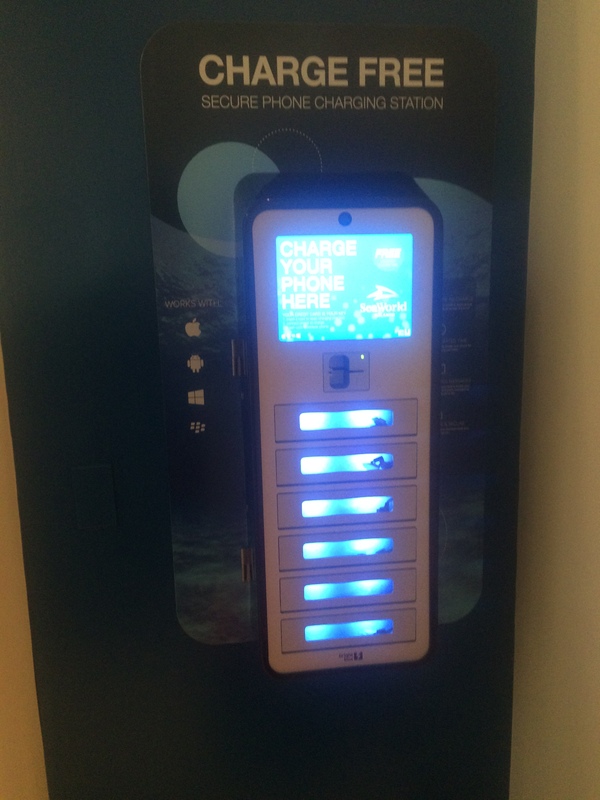 That same charging station will cost $1.99 outside this area and will fully charge your phone in about 30-45 minutes. 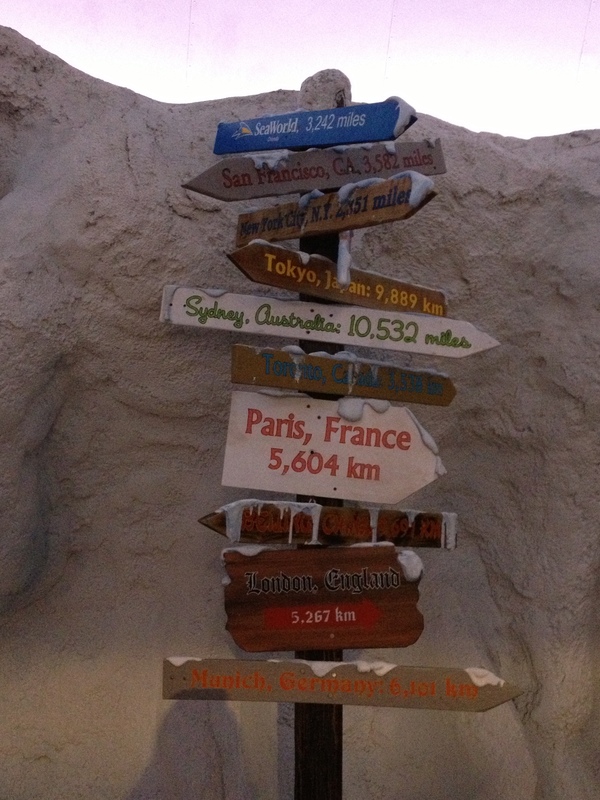 The wi-fi is also very strong in this location as well. 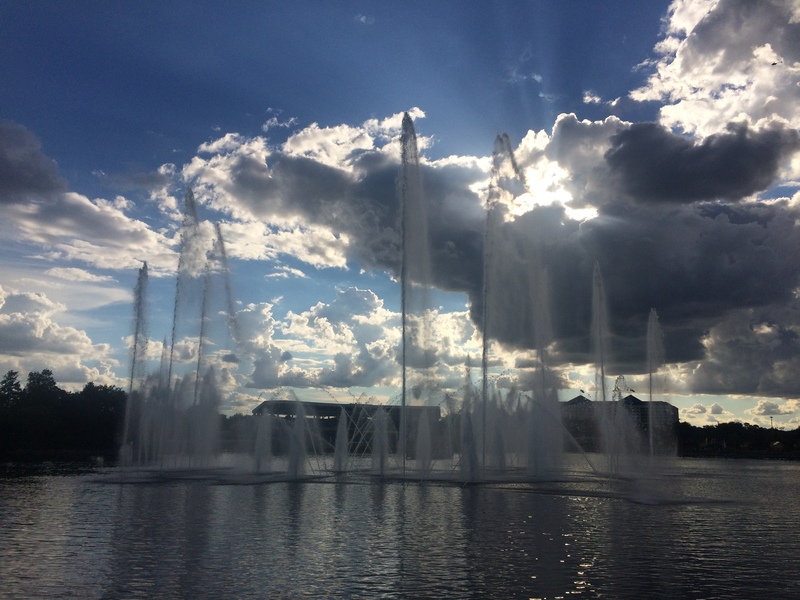 It is a great place for us Platinum passholders to escape the crowds and recharge our natural and technological batteries. 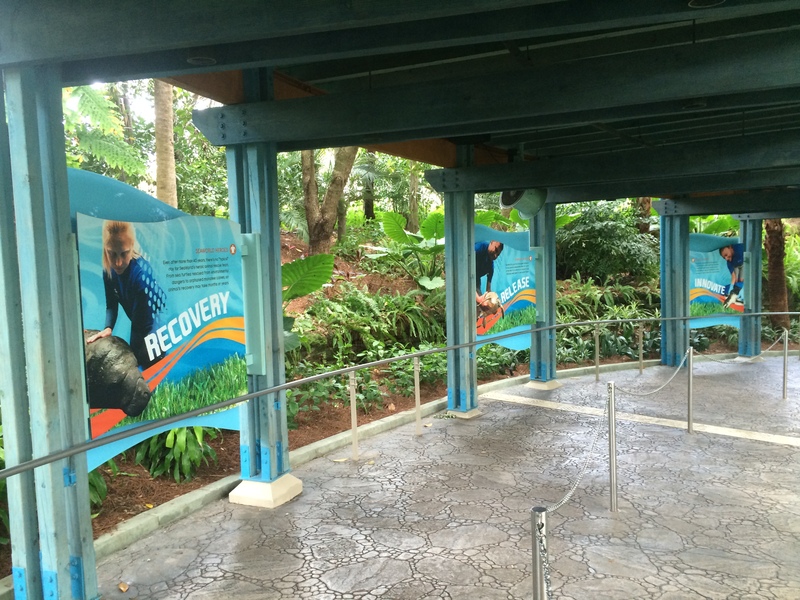 Here are some photos of what the area used to look like when Anheuser Busch owned the parks. 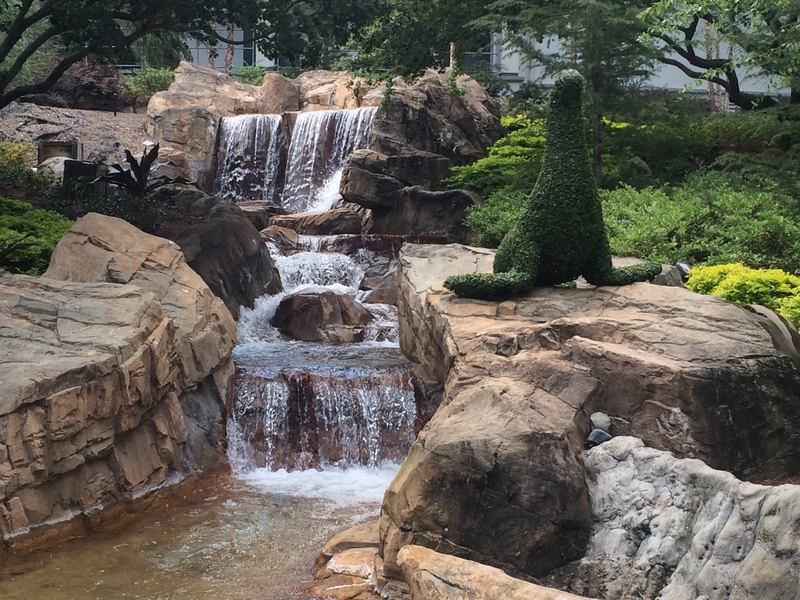 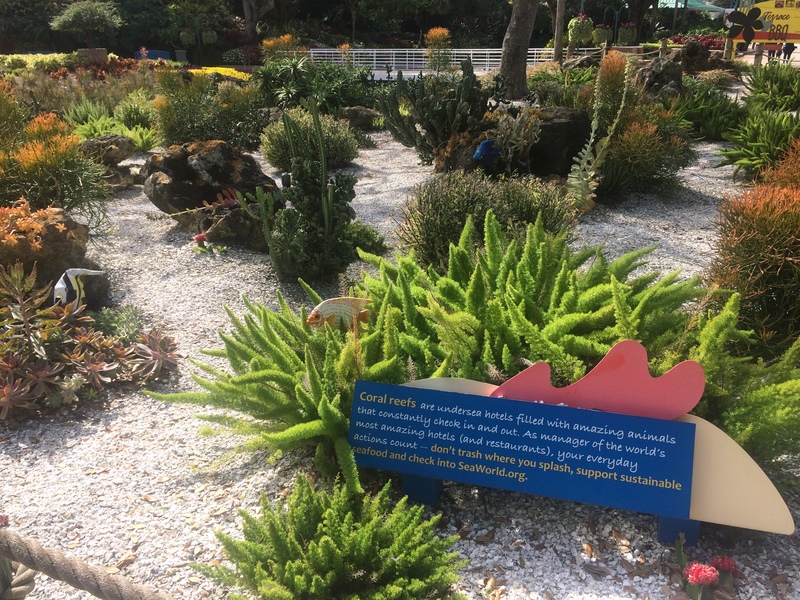 What was the Clydesdale Paddock is now the Sea Gardens landscaped with plants that are arranged to resemble coral reefs, and plants you’d see underwater. 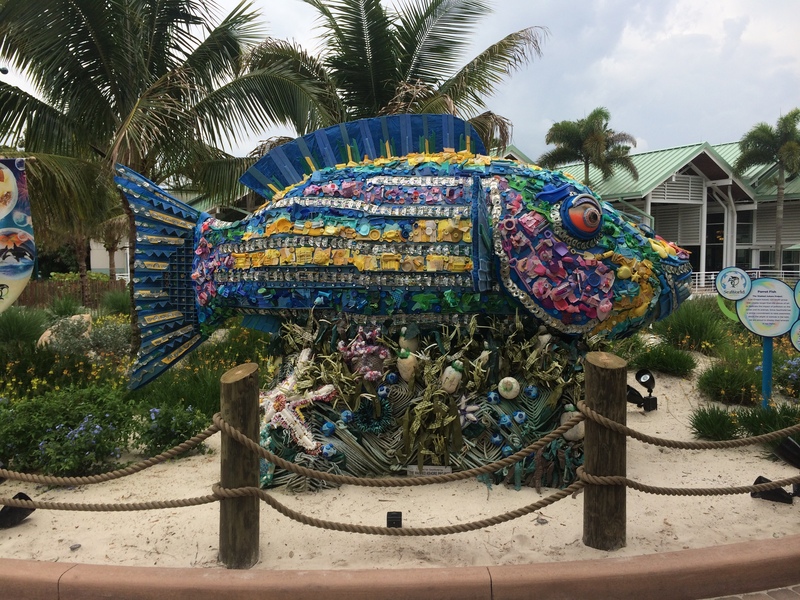 You’ll also see several sculptures from the Washed Ashore Project that were made up of things that had washed ashore. 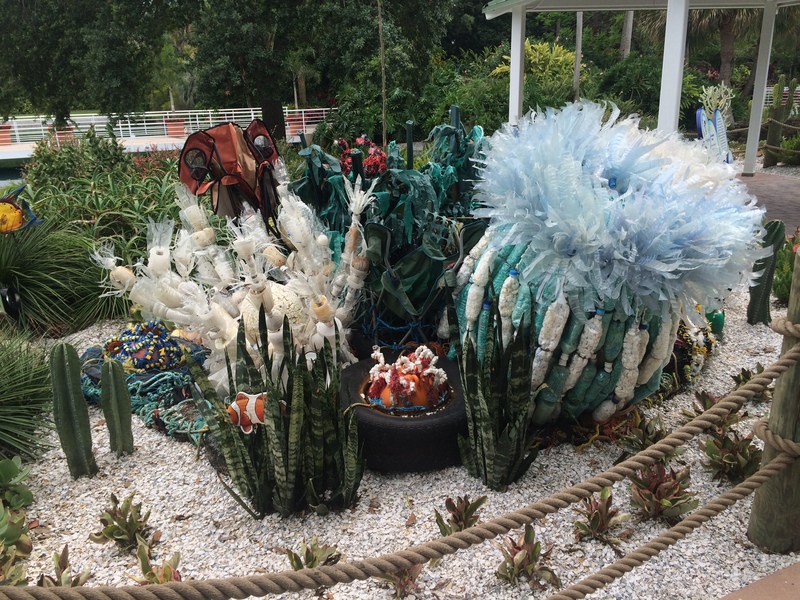 Those displays have since moved on to another park but they are still beautiful and disturbing at the same time seeing that they’re made up of things that washed ashore. 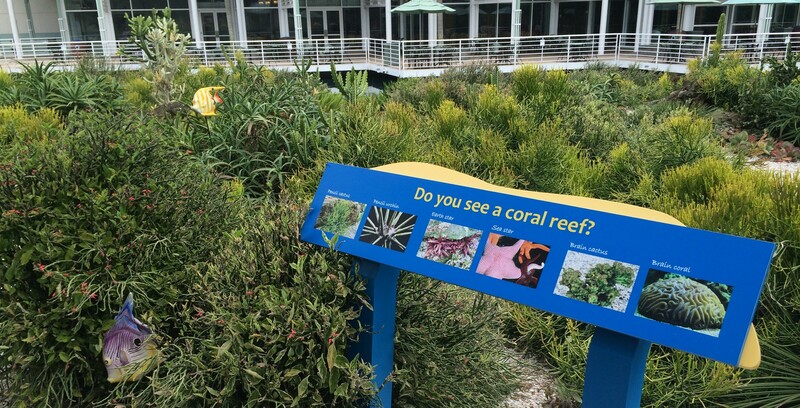 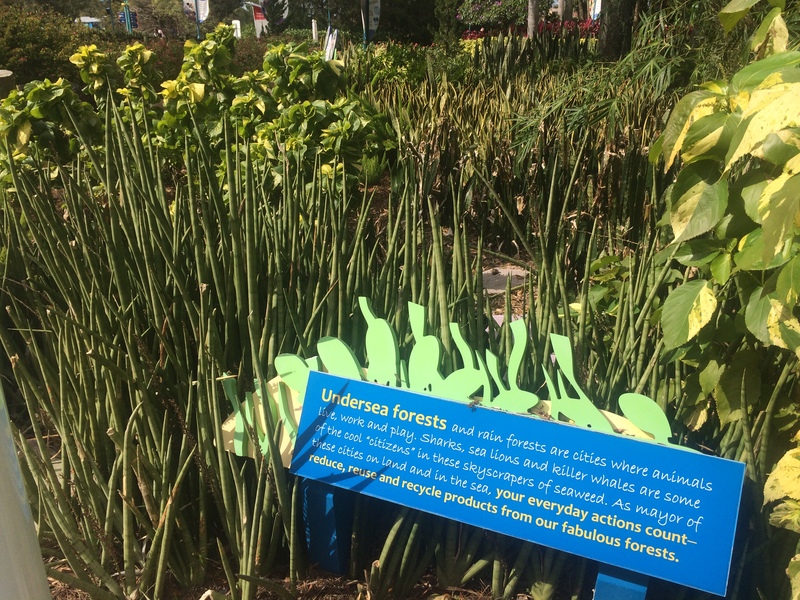 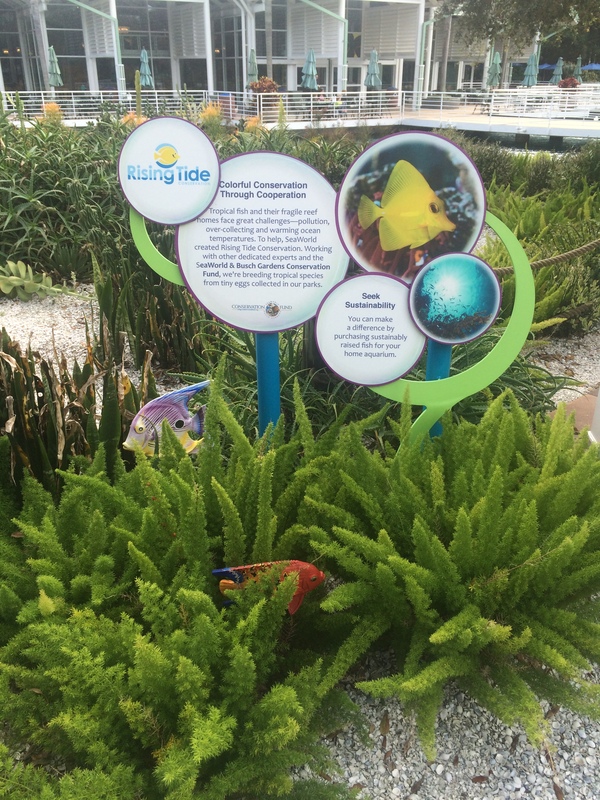 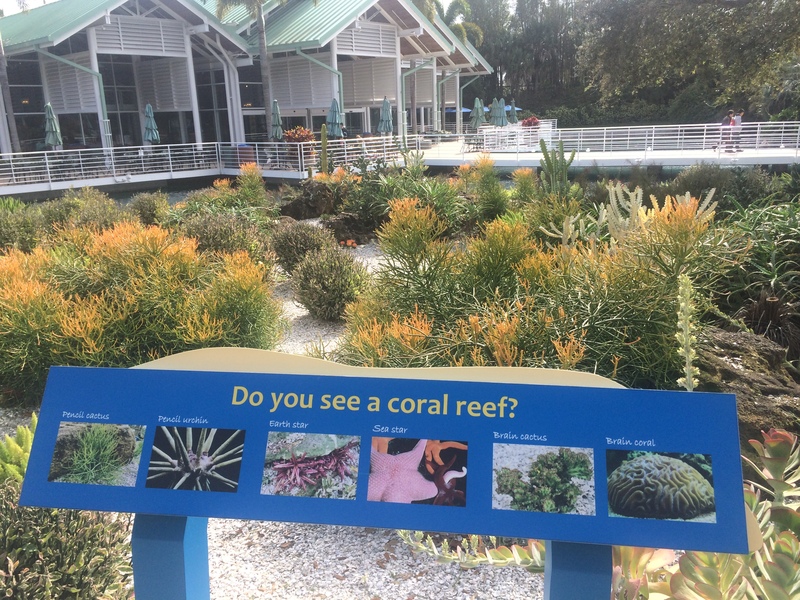 In the SeaGarden, you’ll learn about the life in the undersea environment and what you can do to help clean it up through the use of creative gardening and several plaques that are placed throughout this area. 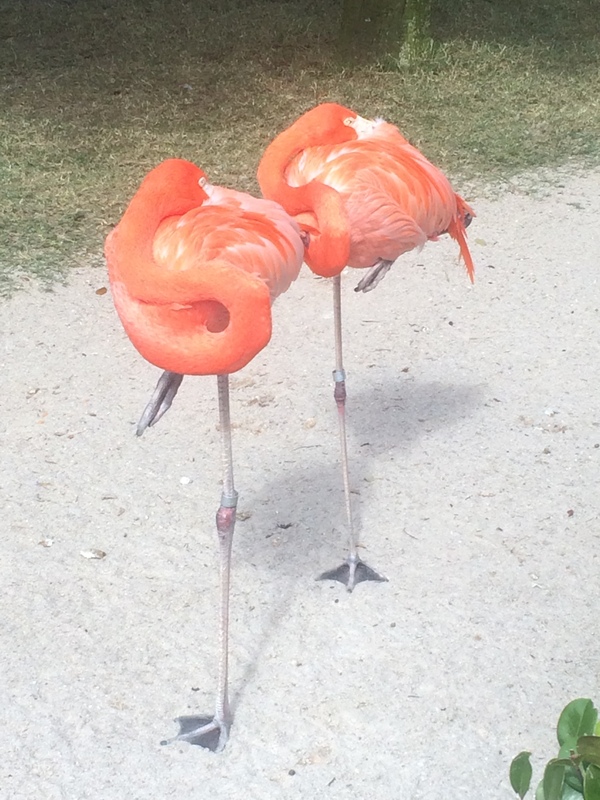 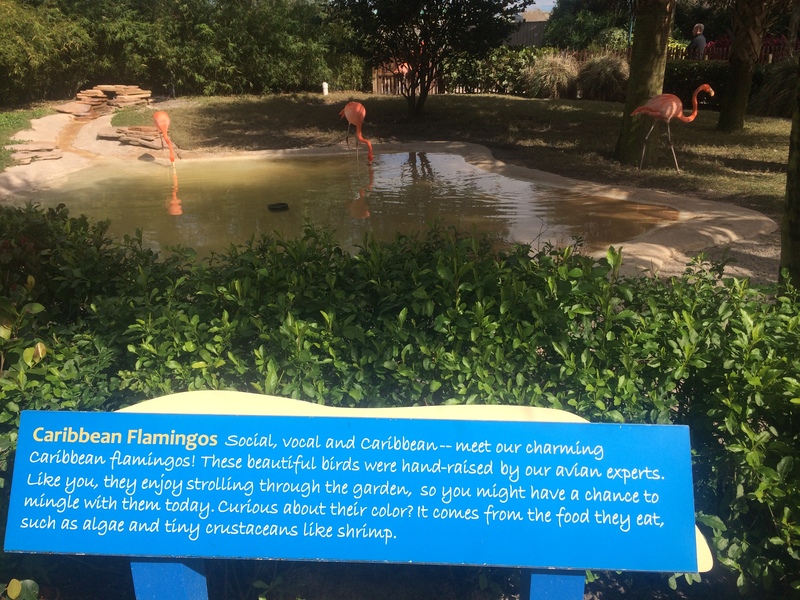 There’s also a few animal encounters in the back like these Pink Flamingos and Sandhill Cranes as well as an area where you can meet, touch, and learn about certain animals at different times of the day. 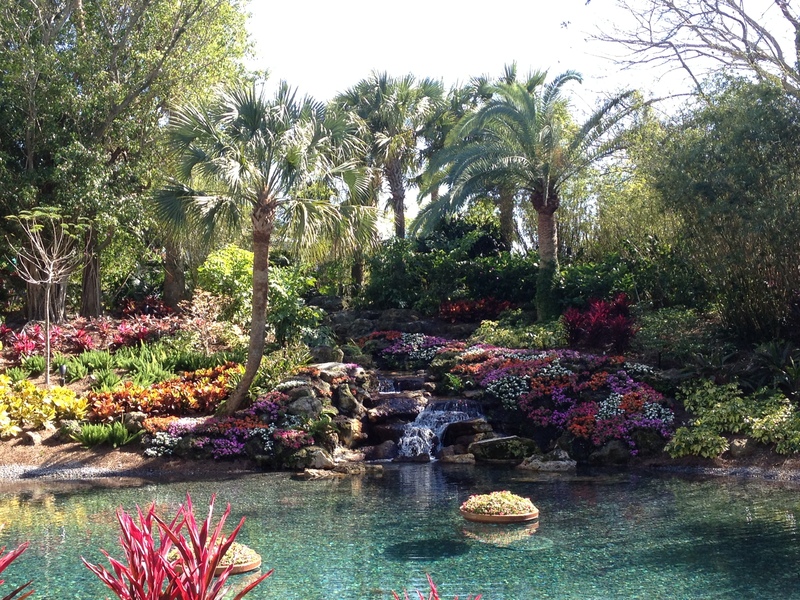 There are some beautiful picture spots here as well. 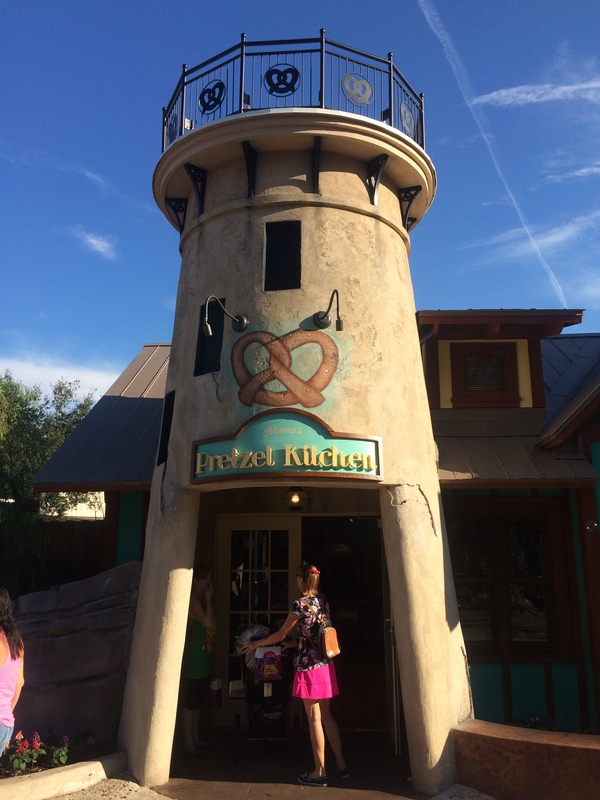 Up next is a new installation called Mama’s Pretzel Kitchen where you can get huge and unique pretzel creations that are big enough to be a meal themselves. 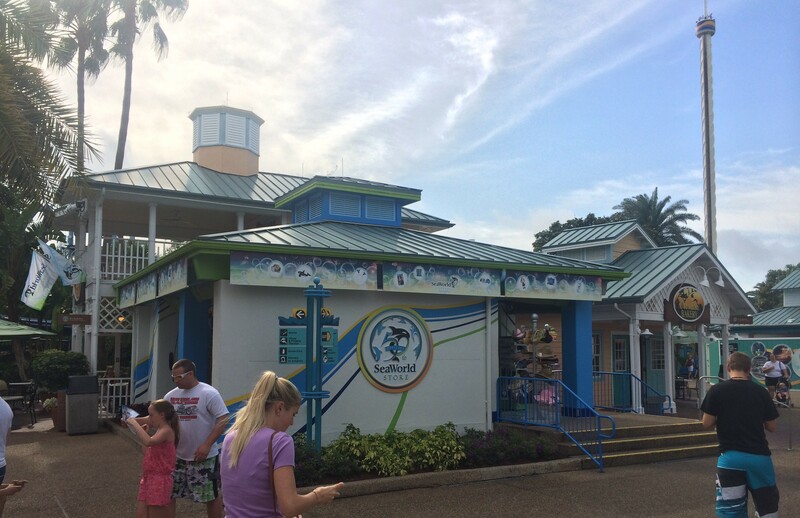 This building took the place of the midway area where you could try your hand at some games of chance/skill to win a prize. 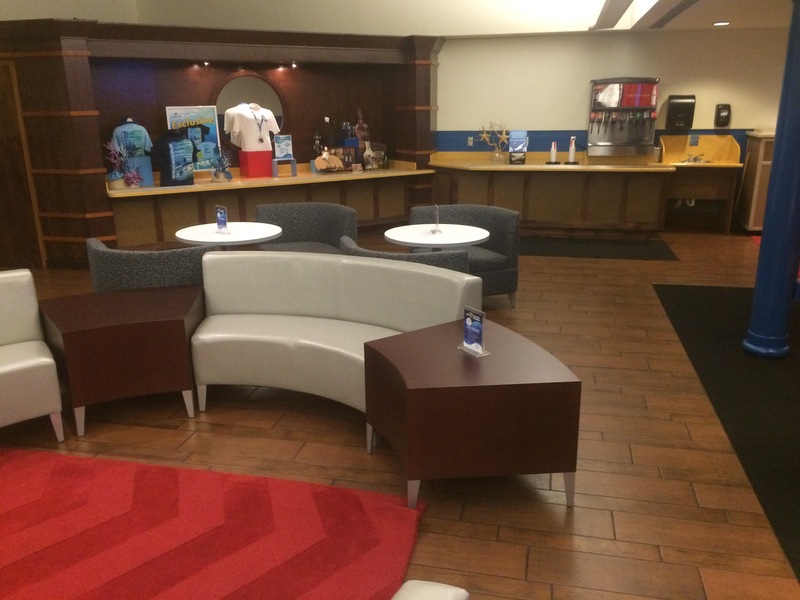 You can also get soft serve ice cream and coffee in the parks former games building. 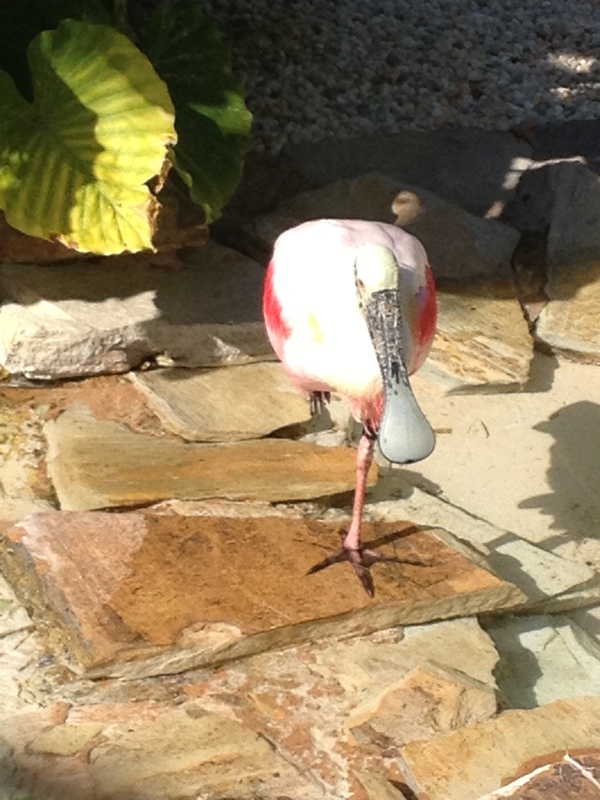 After we’ve strolled through the gardens and had our fill at the Buffet. 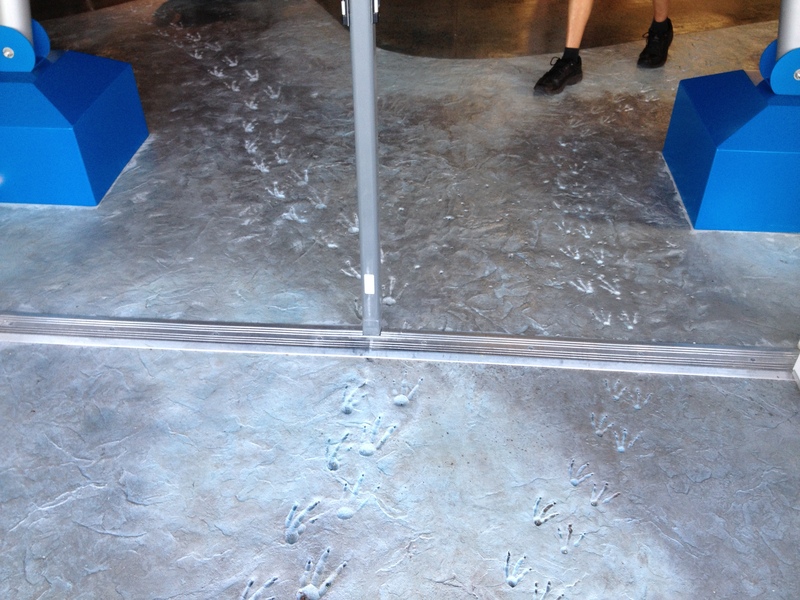 You can let you kids run wild in the…. 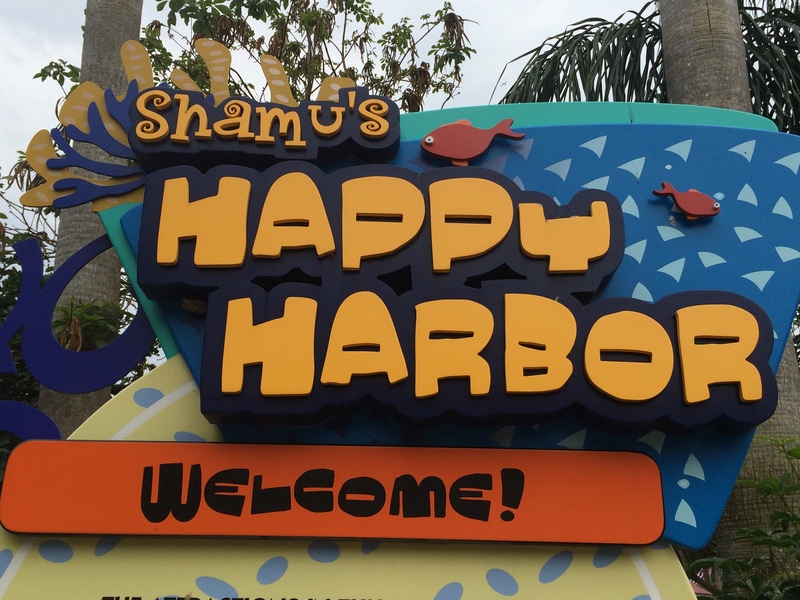 This area was formerly known as Shamu’s Happy Harbor and it is basically an area where the little ones can have fun playing in a giant four-story climbing structure, riding pint-sized rides, getting wet, and playing arcade games. 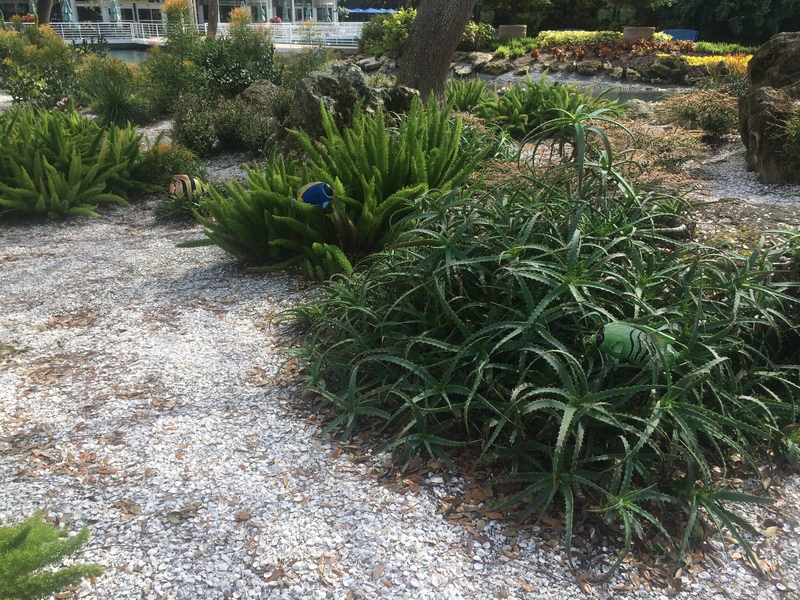 There are several things for the kids absolutely tire themselves out on in this area. 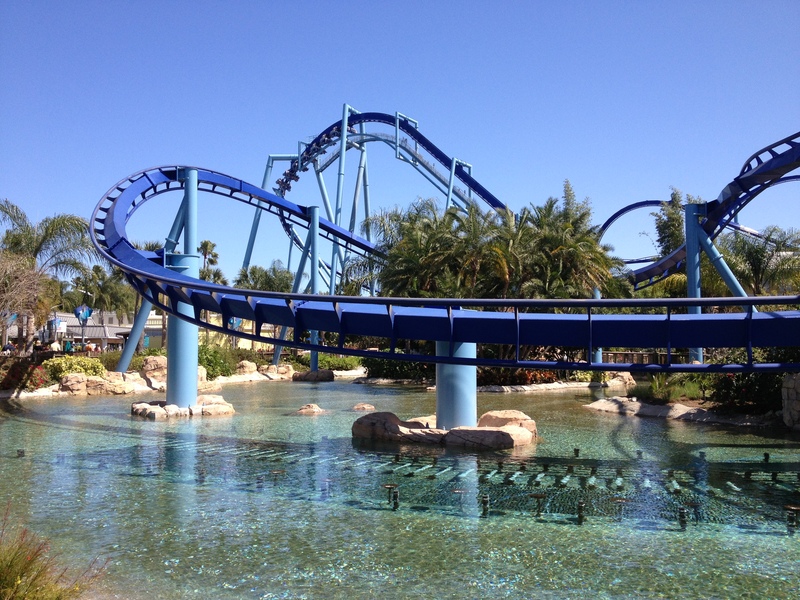 The rides include Shamu Express, a Force Three family roller coaster from Zierer that opened here on May 5, 2006. 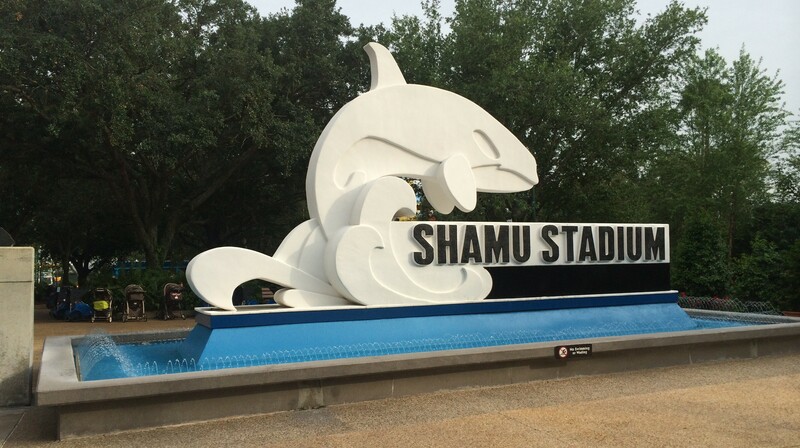 The entire family can ride this coaster and all the cars in the train are in the shape of Shamu. 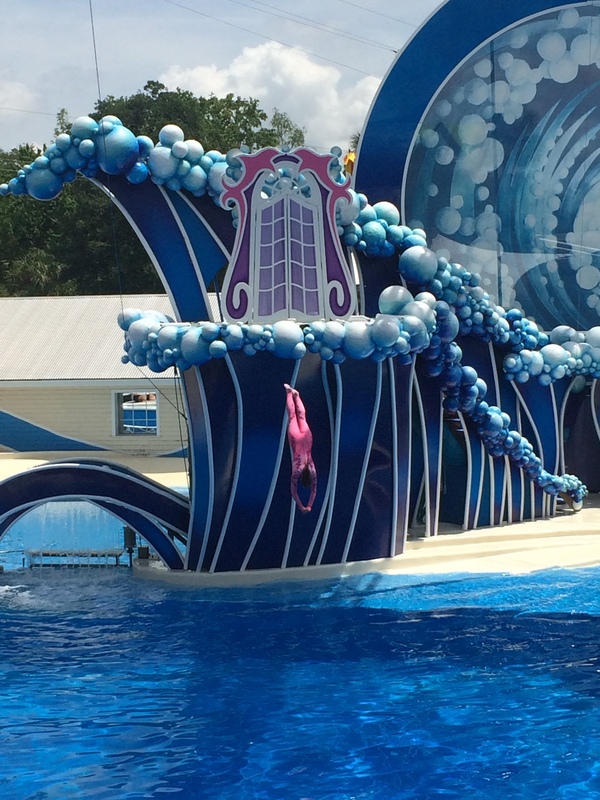 There’s the Jazzy Jellies which is a balloon tower type ride that rises to the top. 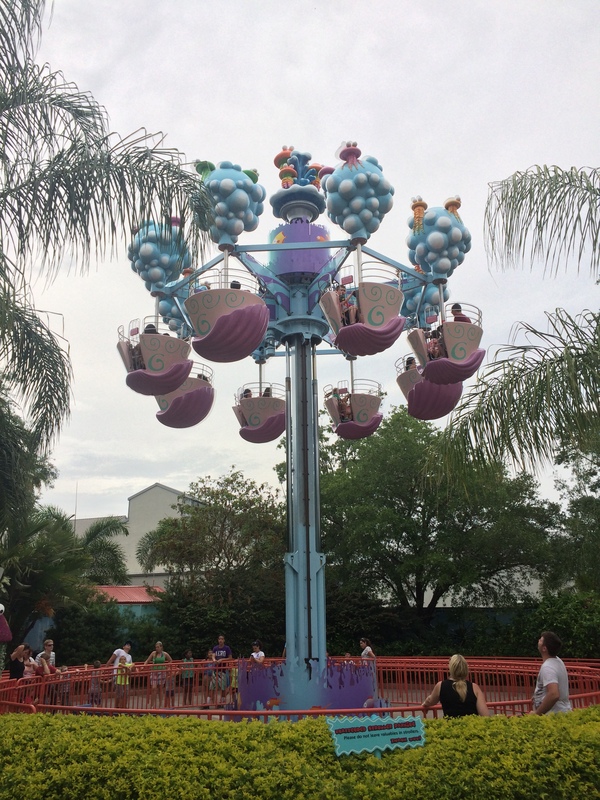 Each balloon also spins as much or as little as the rider wants it to. 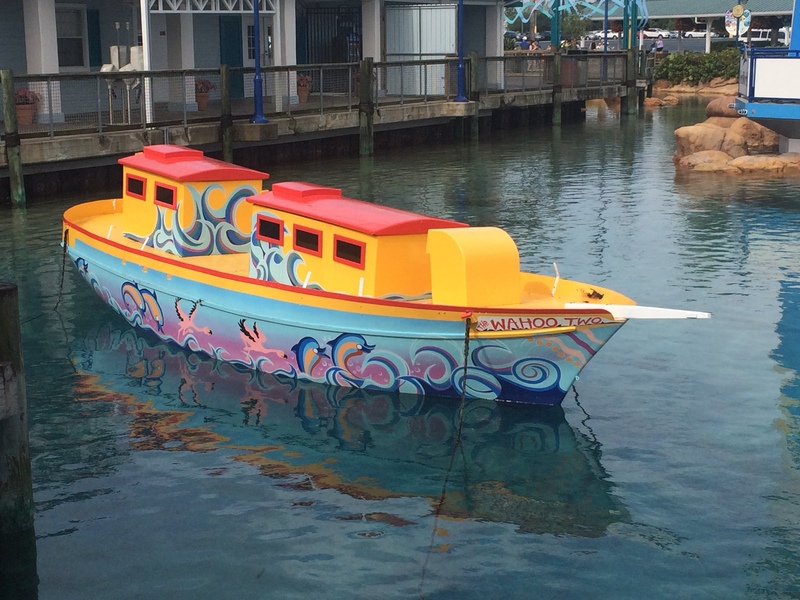 There’s the Rockin’ Tug Ride called the Ocean Commotion from Zamperla that spins as it rocks back and forth. 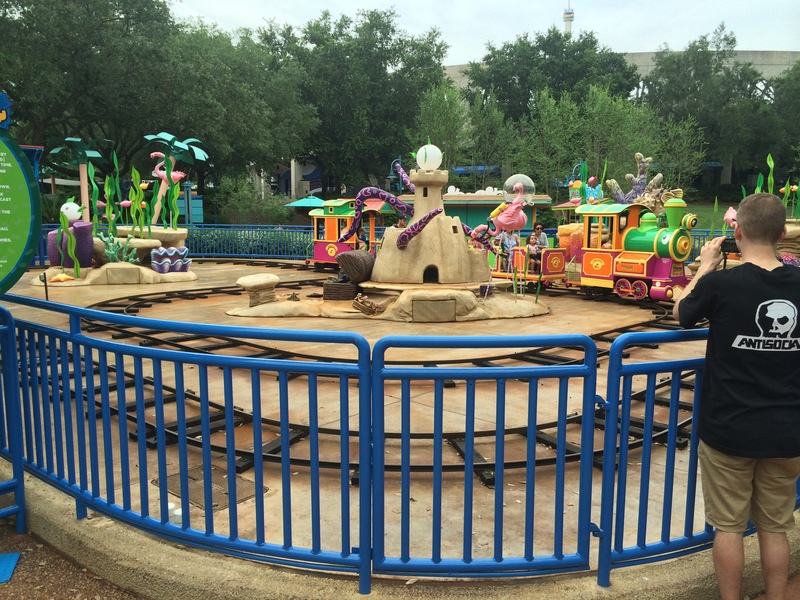 and a train ride for the kiddies. 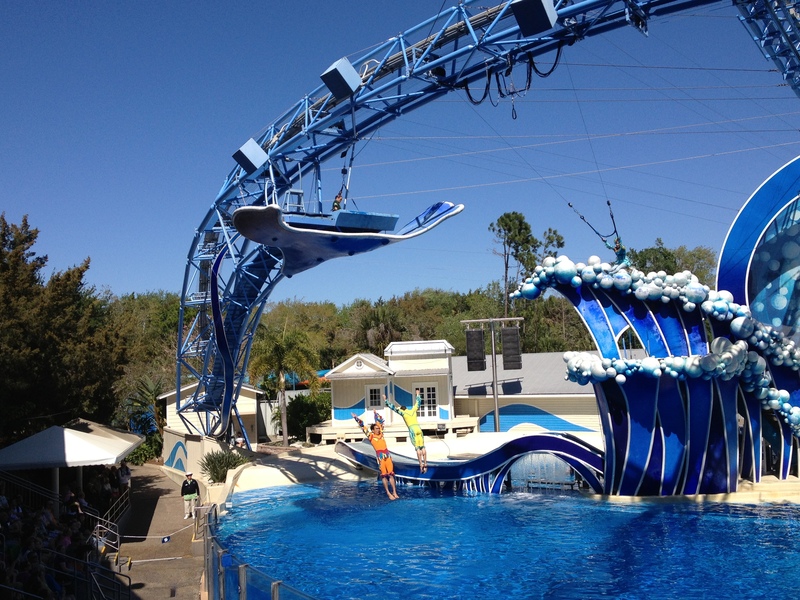 There are also several activity areas including the Wahoo Two and a giant, four-story net climb and slide area. 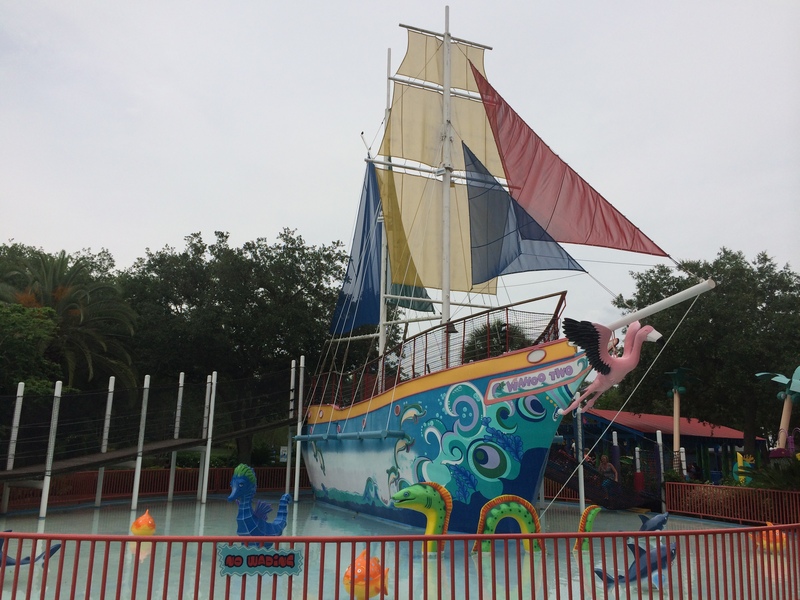 There’s also the Sea Carousel that is populated by Sea Horses, Dolphins, squid, and other sea creatures. 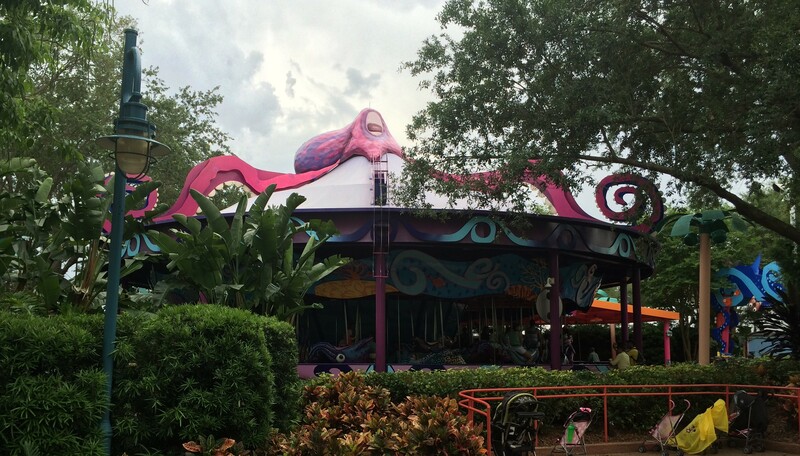 What would a park be without a carousel. 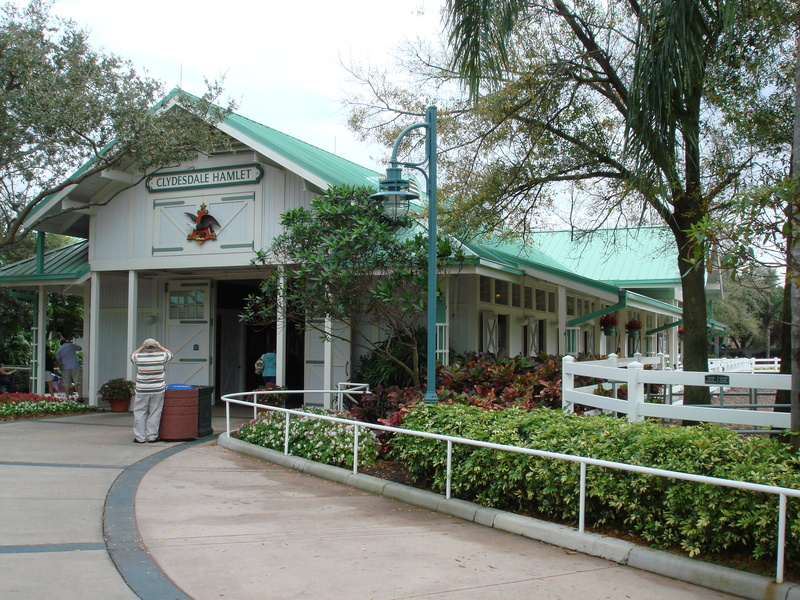 I believe this carousel was built by the Carousel Works Company but I’m not sure, it opened here in 2007. 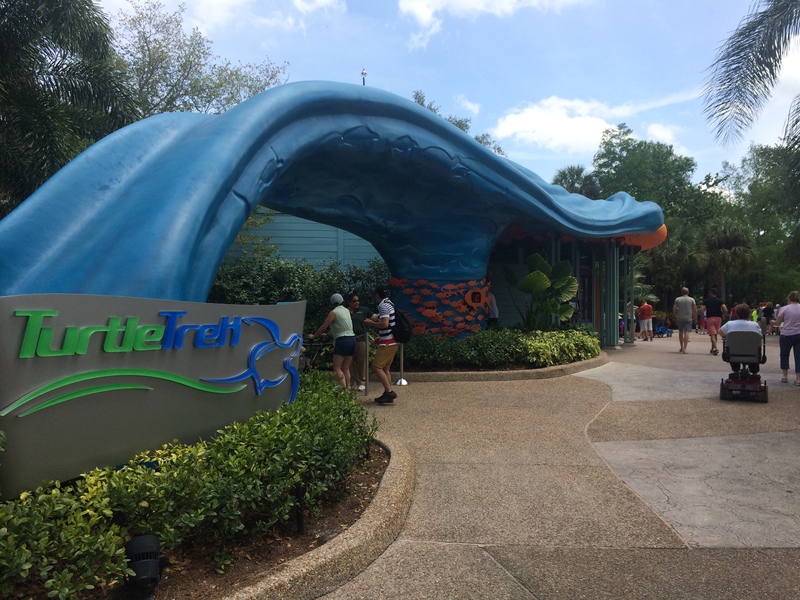 The other rides include kiddie Frog Hopper ride which opened here in 2007, and the Swishy Fishies which is a spinning teacup ride which opened here in 2006. 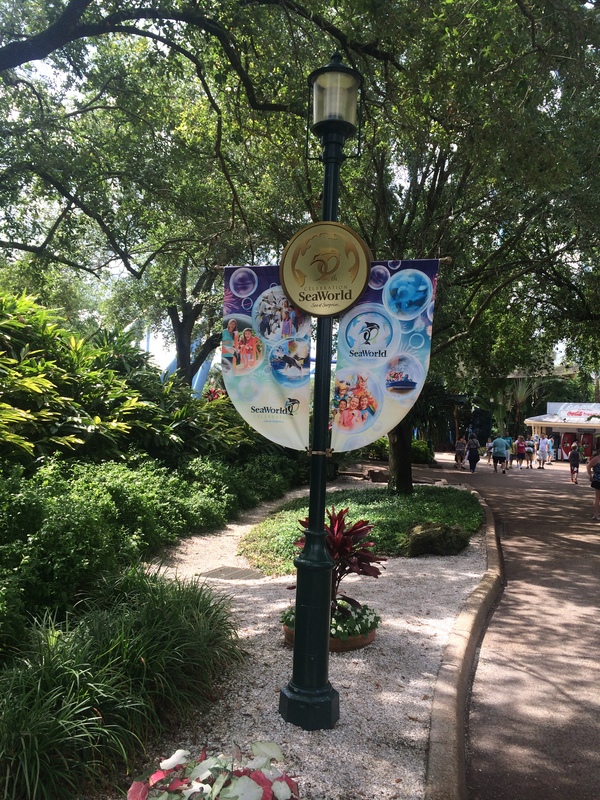 Up next is the parks signature area. 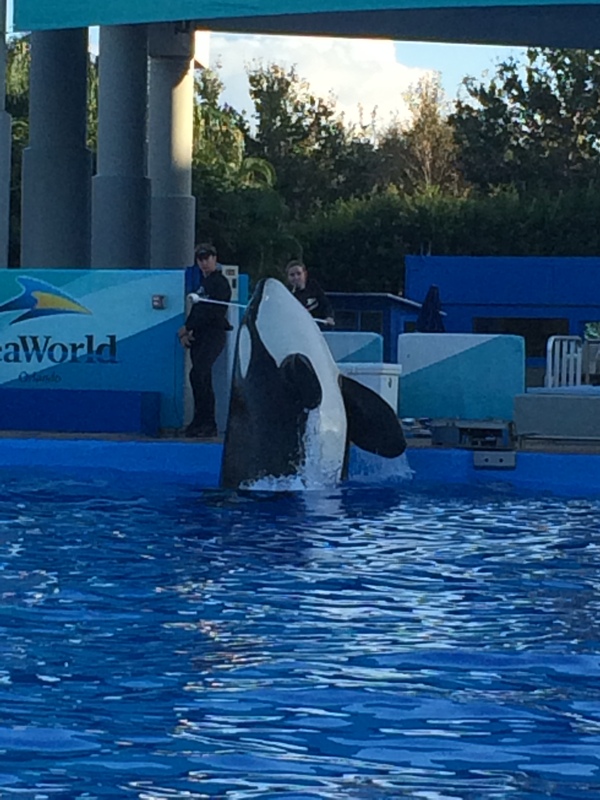 This area contains the beautiful and huge Orcas, the parks signature animals, you may know the as Shamu. 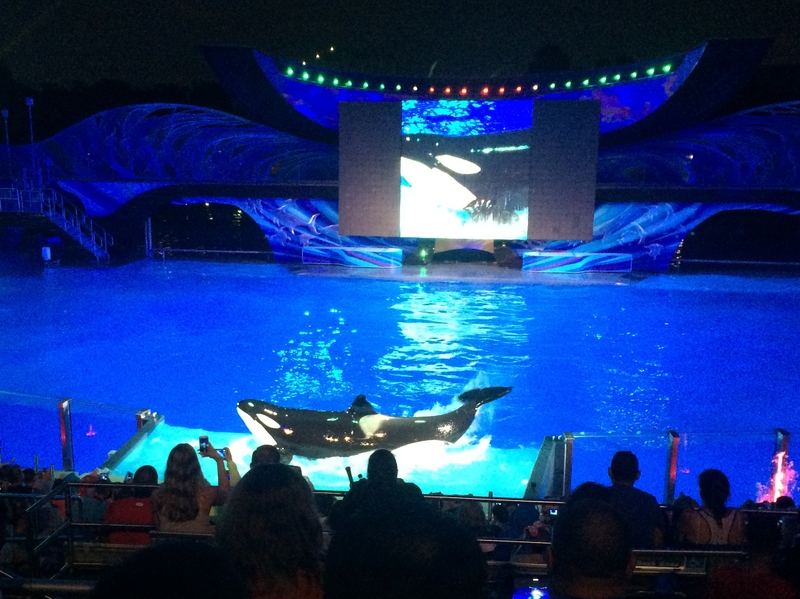 There is only one show called One Ocean, several animal observation areas, a reservation only dinning experience called Dine with Shamu, two gift shops, two food stands, one attraction, and restrooms. 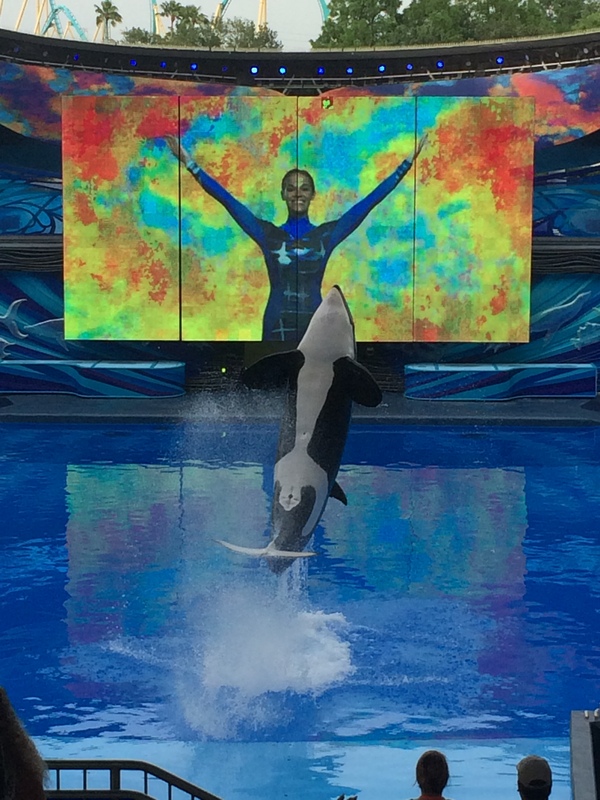 This is the parks signature show featuring the parks famous Killer Whales, also known as Orcas, everyone calls them Shamu as that is the parks trademarked name they use to represent all the Orcas. 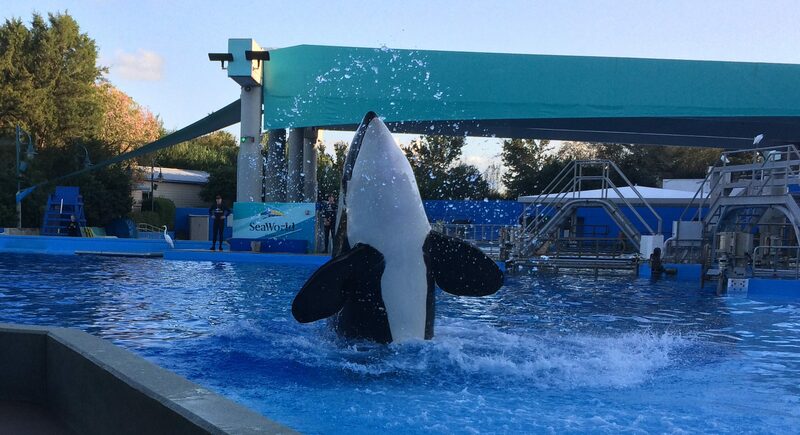 Shamu was actually the original Orca at SeaWorld in San Diego, California, USA. 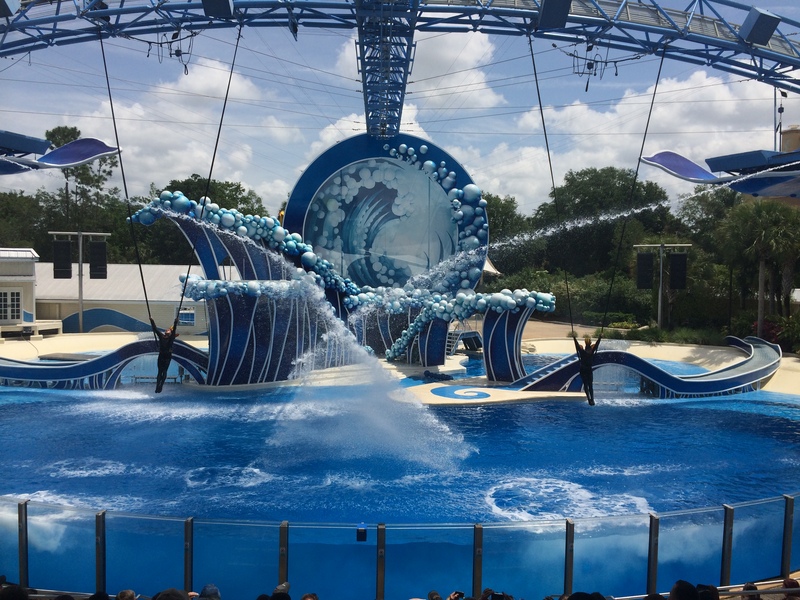 There are currently two shows that are at this location, the first one is called Ocean Discovery which is mainly an educational show that talks about the natural abilities of the Killer Whales and the other one is more of a broadway style show called One Ocean. 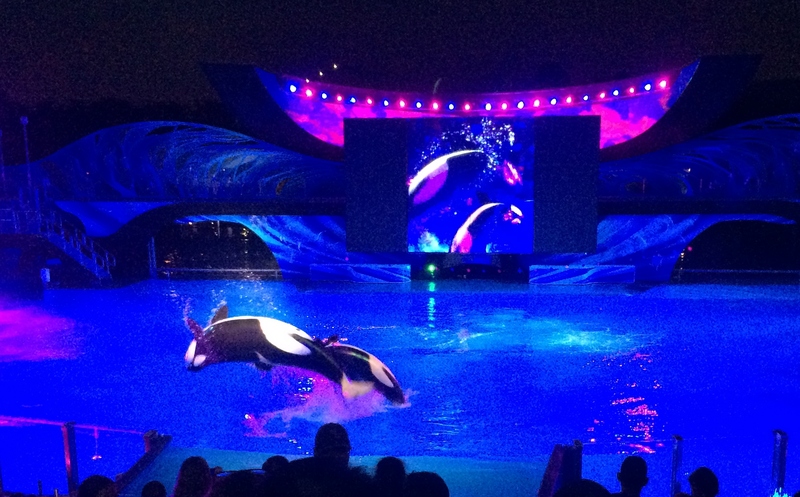 Those shows are performed at different times each day inside Shamu Stadium which was built in 1984 and can hold up to 3,500 people per show which can fill up quickly especially during the busy tourist seasons so I do recommend you get there at least 30-45 minutes early to insure that you get a good seat, otherwise, you might be sitting in the corners or in the Splash Zone. 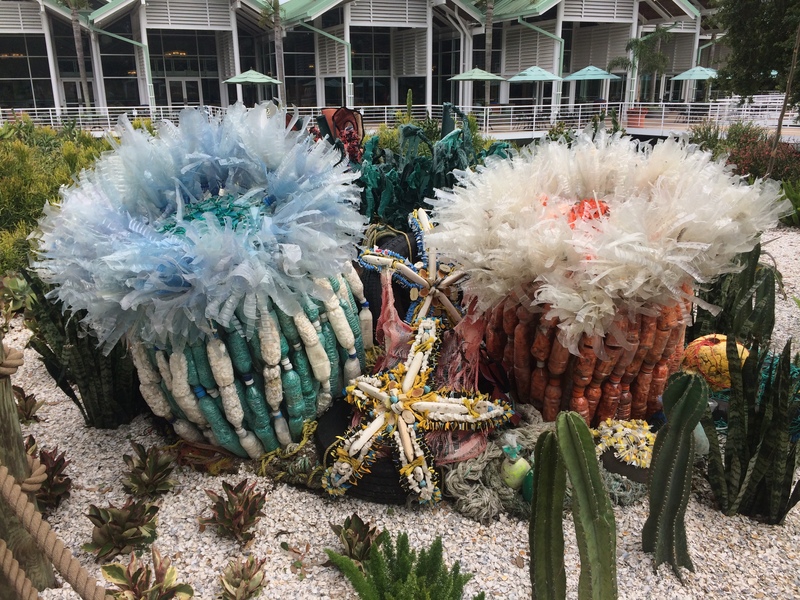 This show really is an incredible show that teaches us that what we do, impacts our environment and all the oceans across the world. 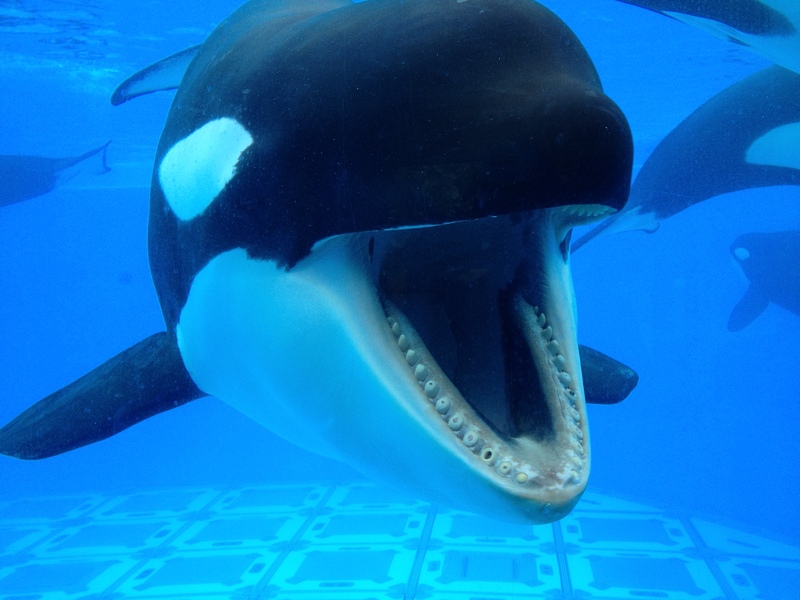 There’s one thing the Killer Whales do very well and that is getting people very, VERY, WET! 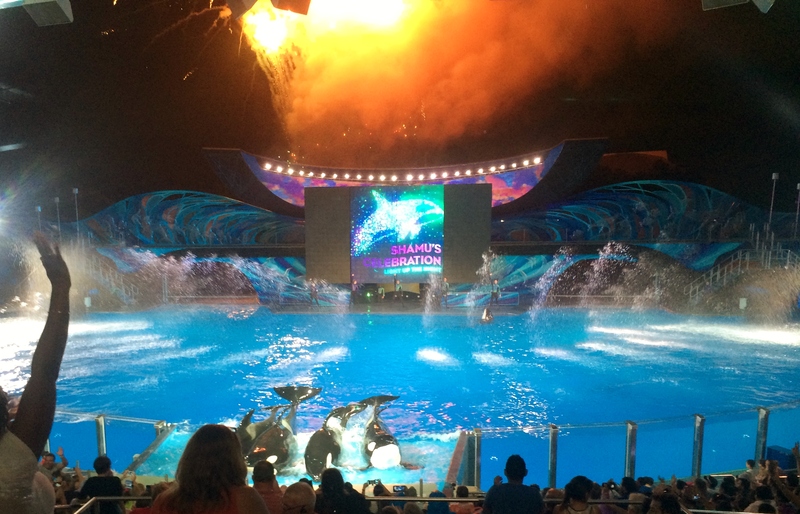 SeaWorld also put on a spectacular night-time show called Light up the Night during the summer months with fireworks at the end of each show and it really is a show that is not to be missed as there re several behaviors in this show that aren’t in the One Ocean show during the day. 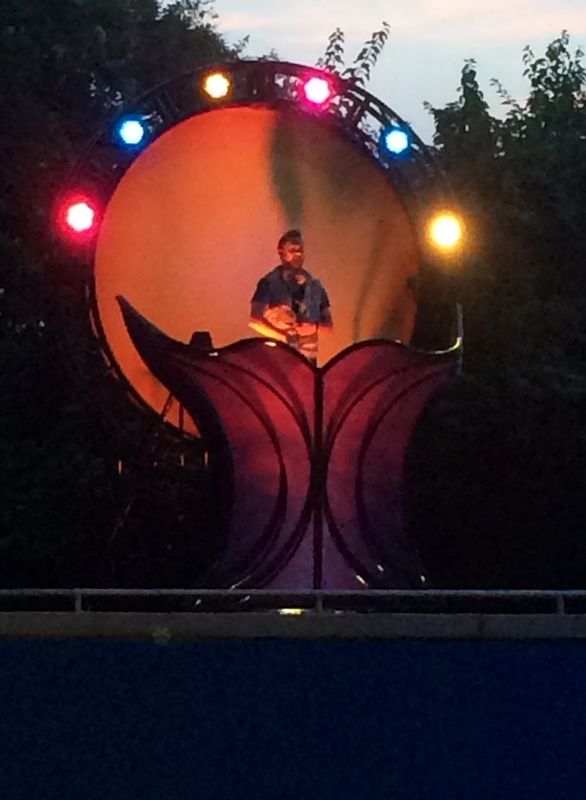 This show also features a DJ that plays popular songs before the show and is also a part of the show. 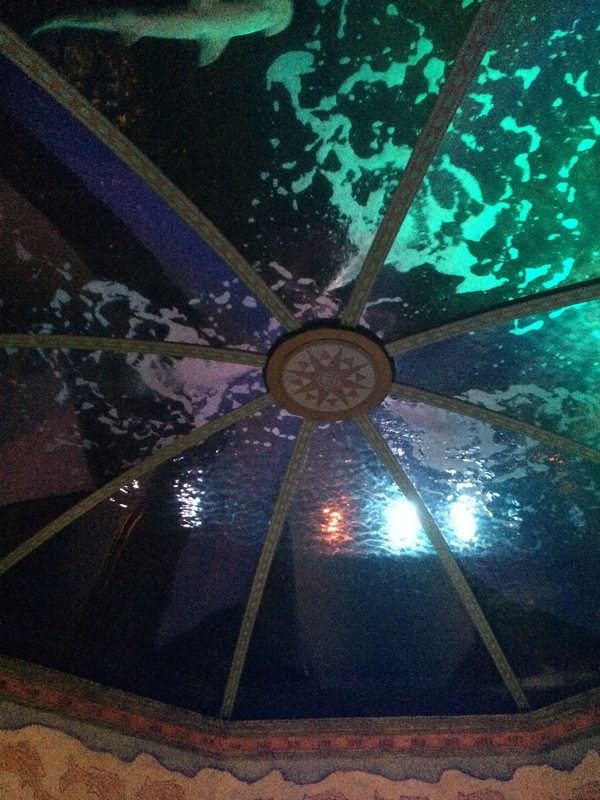 Here is a full video of the show from Behind the Thrills YouTube channel. 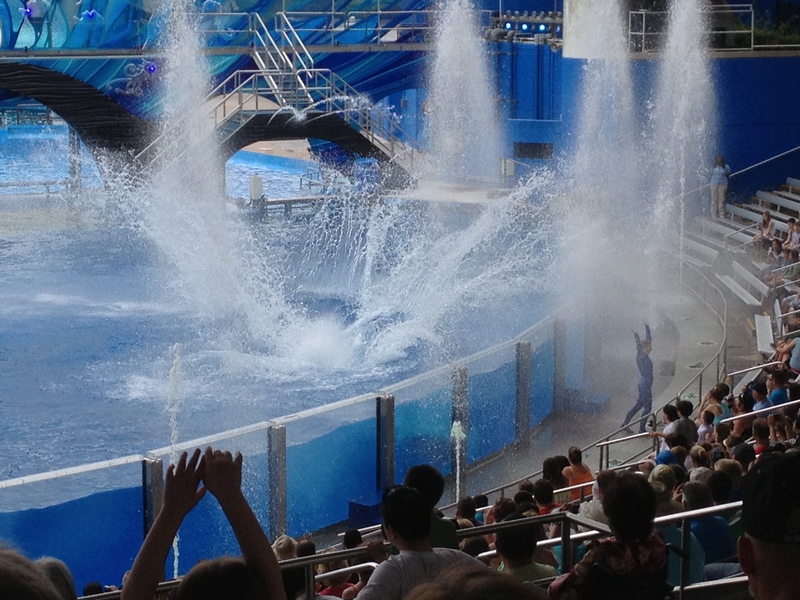 I definitely recommend you not miss these shows. 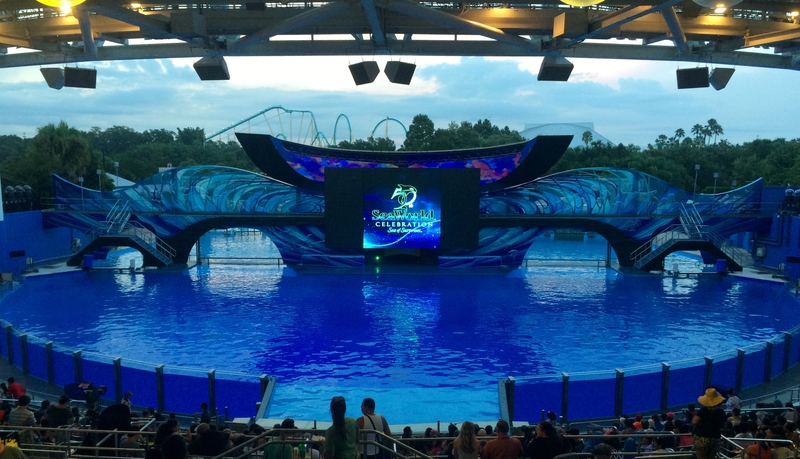 If you see only one show during your visit, this should be One Ocean and Light up the Night if you’re here during the summer months. 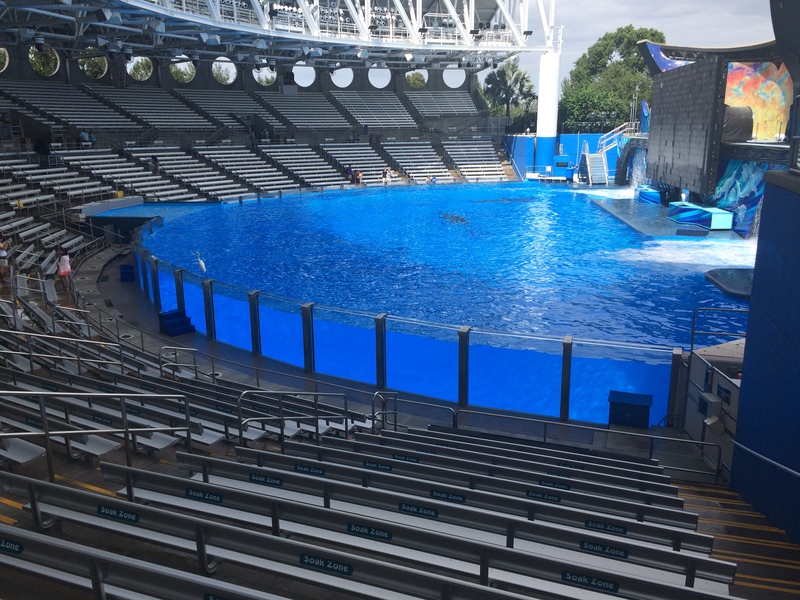 I recommend you sit in the upper seating area as close to the middle as possible so you won’t get wet. 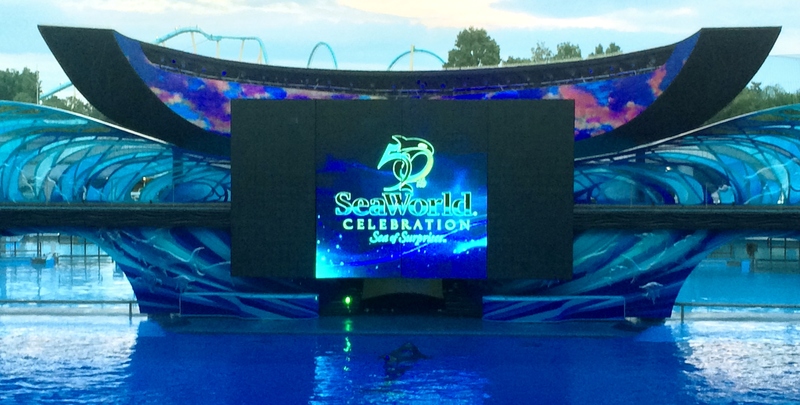 There are different shows depending on the season in addition to the One Ocean shows during the day. 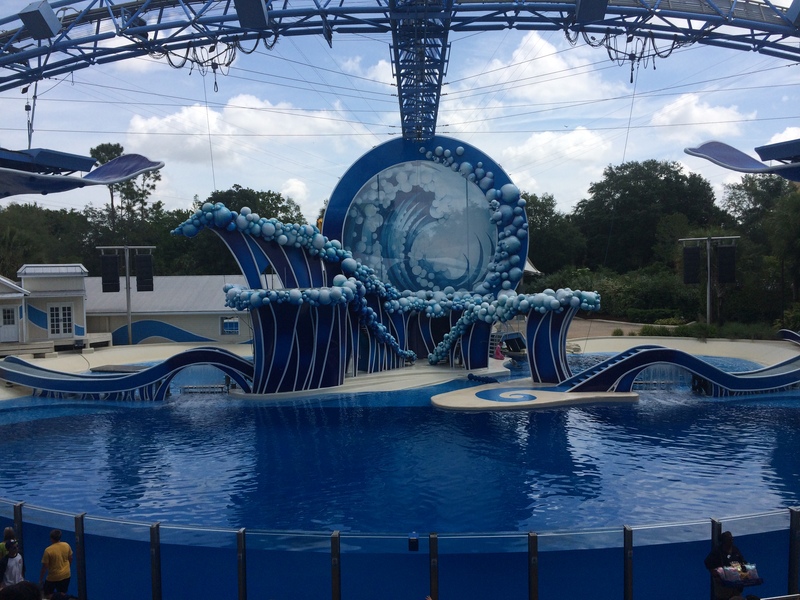 So during the summer, there will be an additional show or two at night featuring different music and pyrotechnics, and during Christmas, there will be a really beautiful Christmas themed show at night that is set to Christmas music. 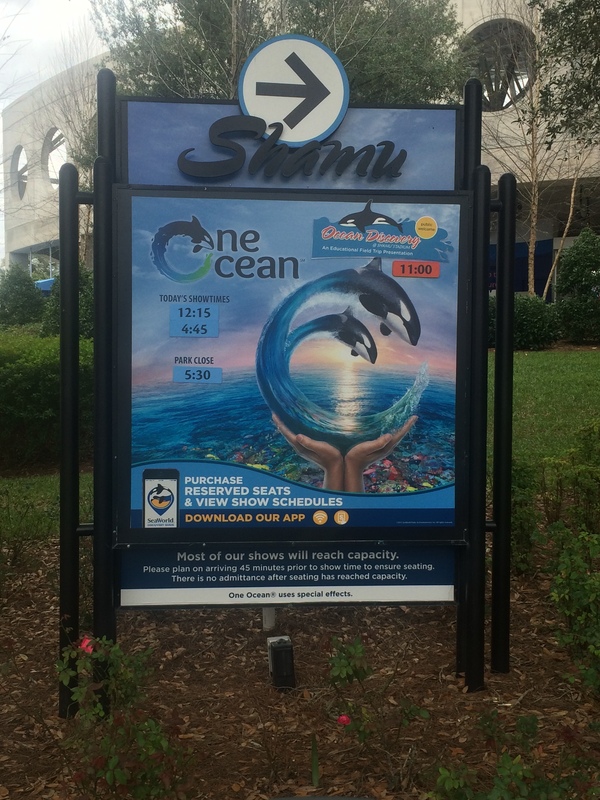 There are also a few photo spots around the outside of the stadium, one even has a permanent photo booth installed as well. 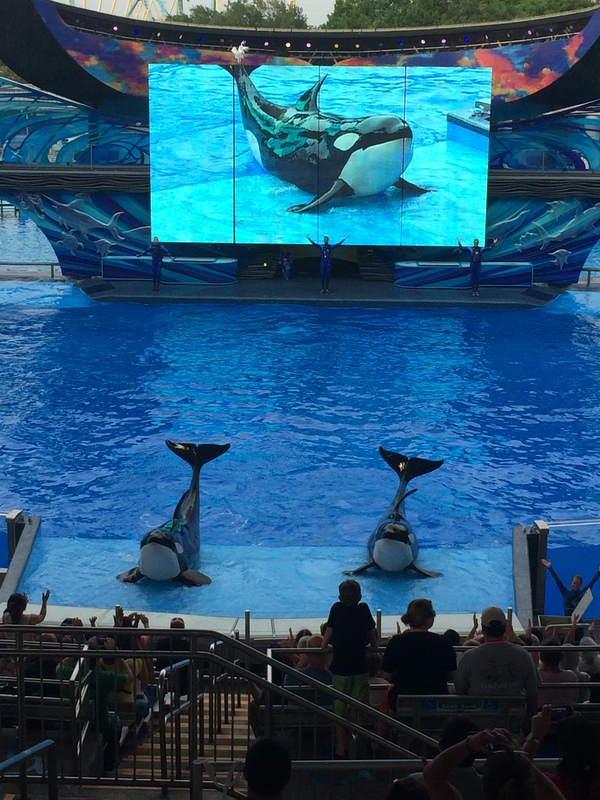 The stadium remains open after the shows so you can see these magnificent Orcas swimming in the main show pool, if they happen to be there. 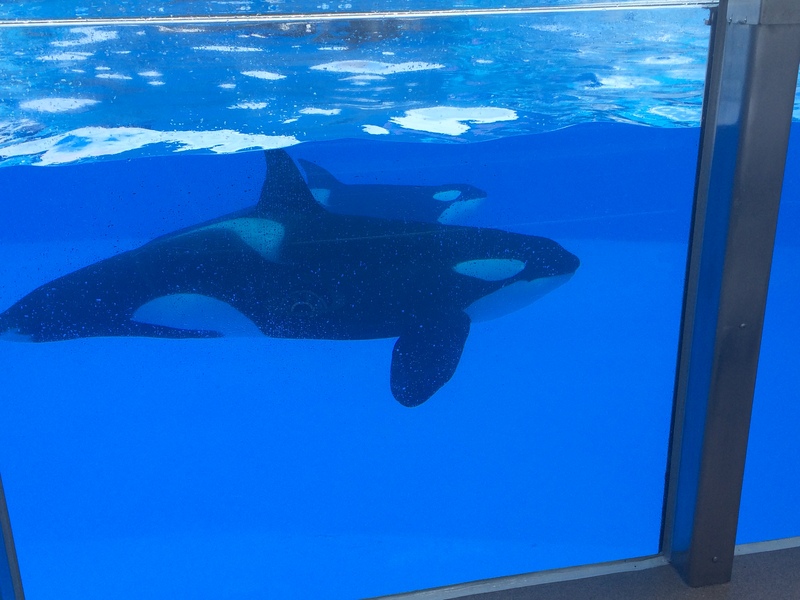 Around the back side of the stadium is the Shamu Up-close area where you can see the Killer Whales underwater if they’re in that pool and the Dine with Shamu dinner show. 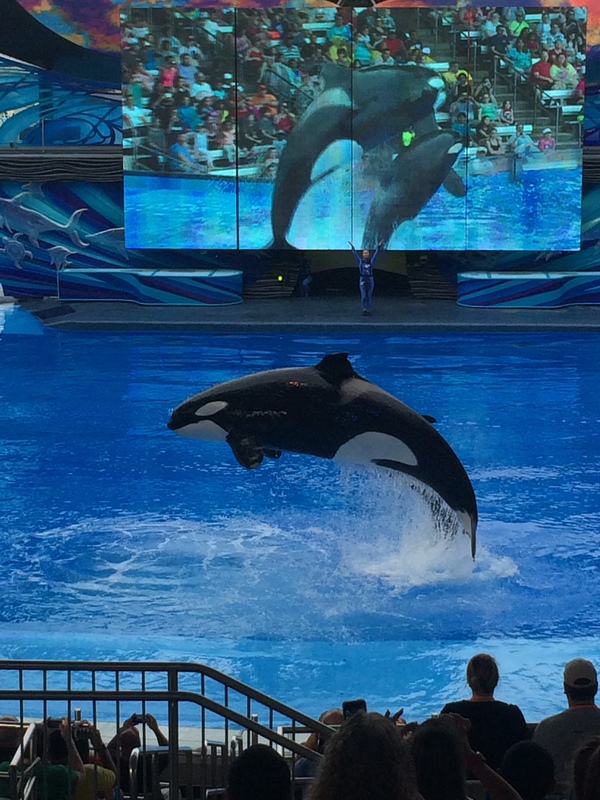 Some of you may recognize some of the Orcas in the photos above but here is a list of the current Orcas that call Shamu Stadium home. 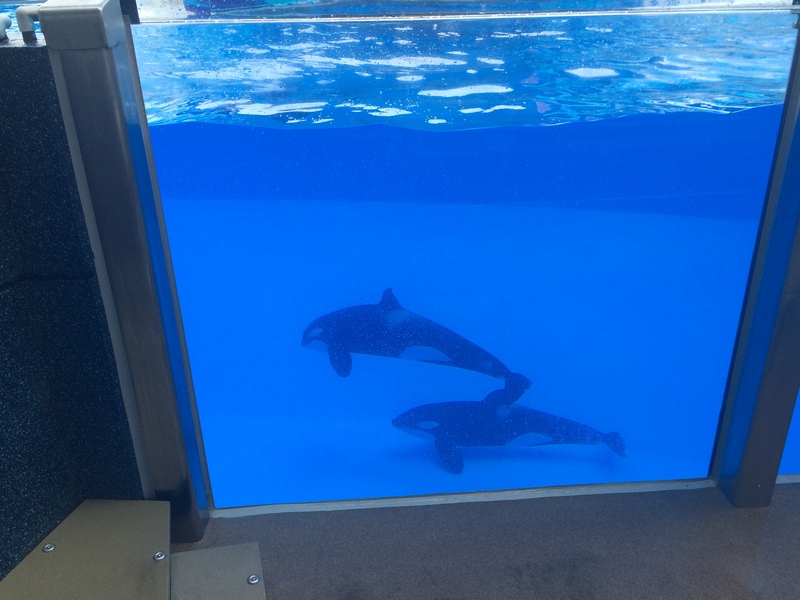 There’s Katina and Tillikum which were both wild caught orcas, the captive born whales are Kayla, Trua, Nalani, Malia, and Makaio. 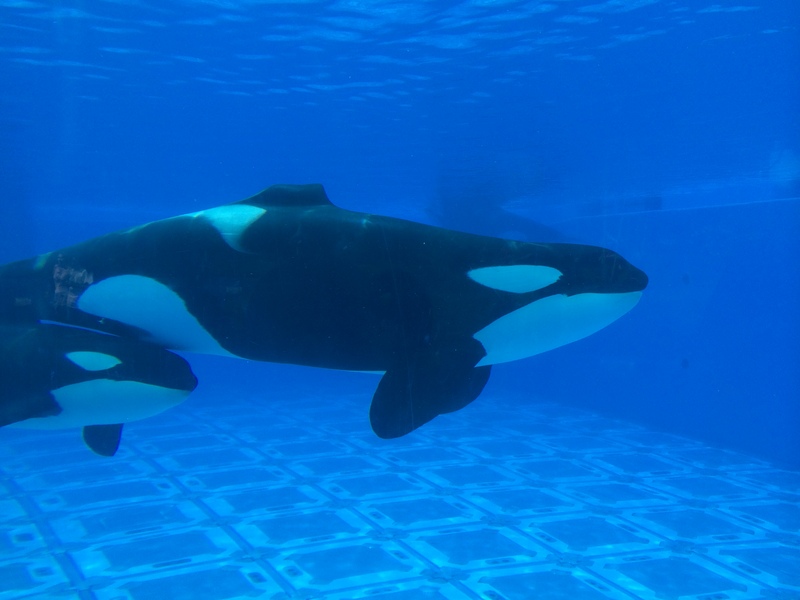 Nalani is Katina’s daughter that was born in 2006 and Makaio is the son of Tillikum and Katina. 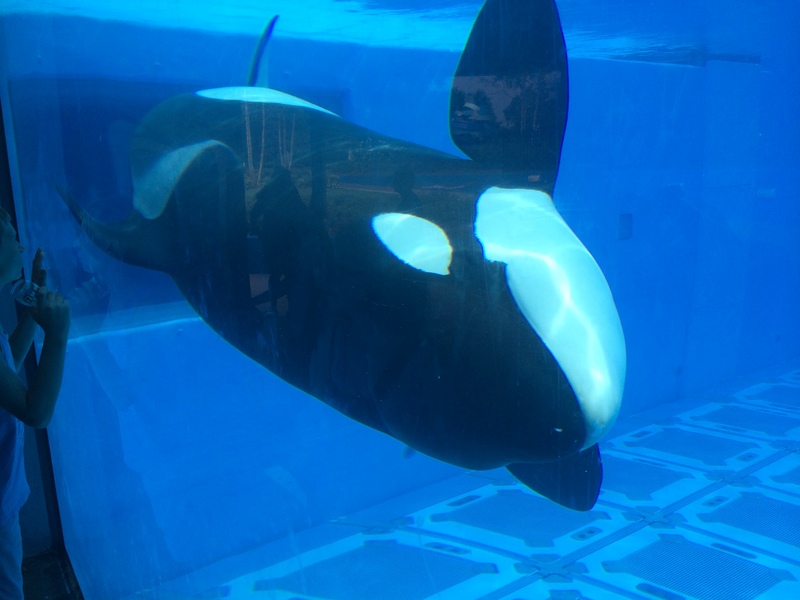 The thanks go to Anti-Blackfish Movement on Facebook. 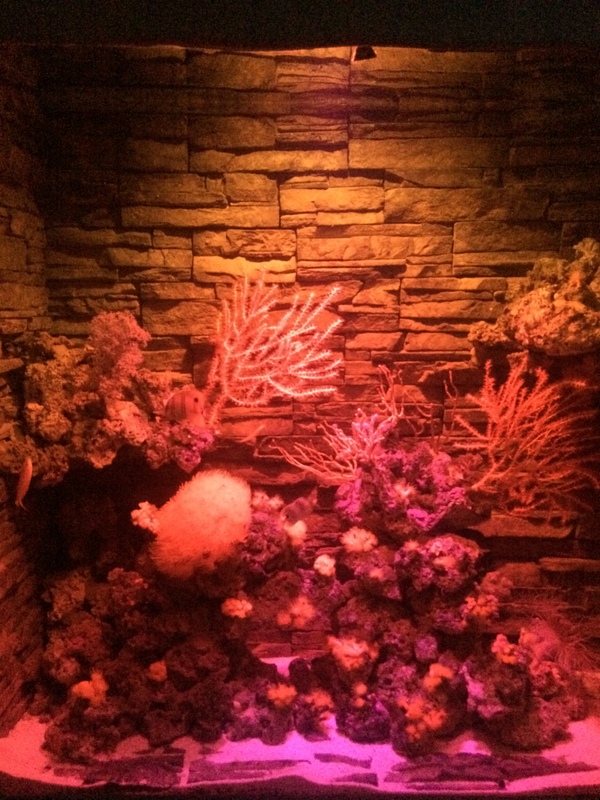 This is a special, reservations only, dinner that I highly reccommend everyone do at least once. 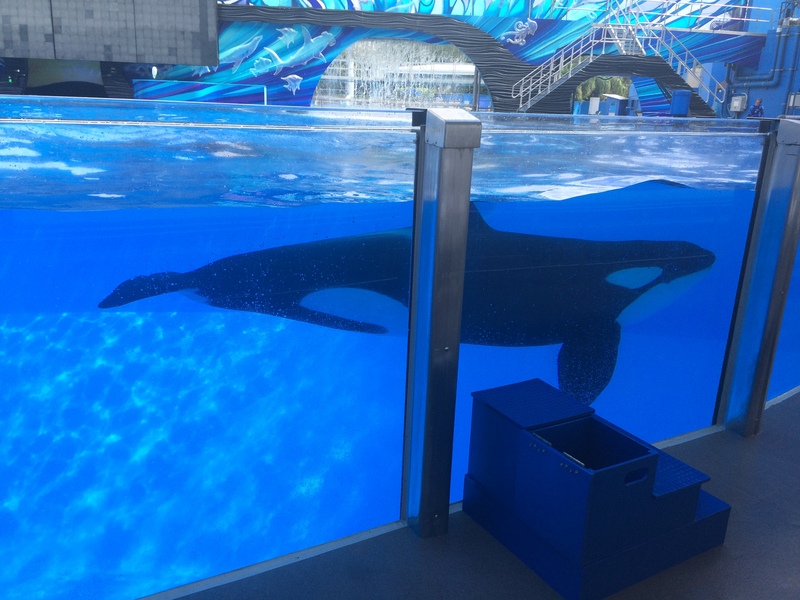 I would make reservations the day before you visit the park as seating is limited. 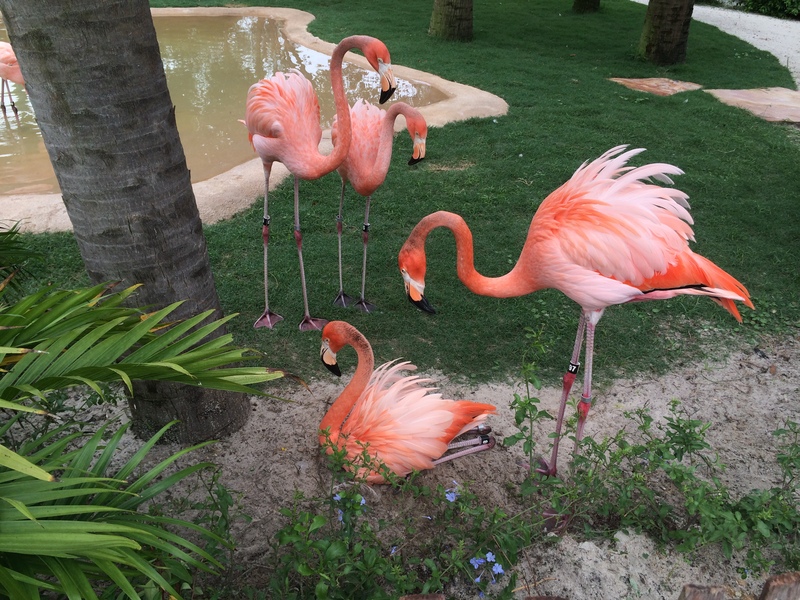 It is a buffet style dinner and the food is really, really good and the seating area is outdoors in a covered patio next to the observation pool. 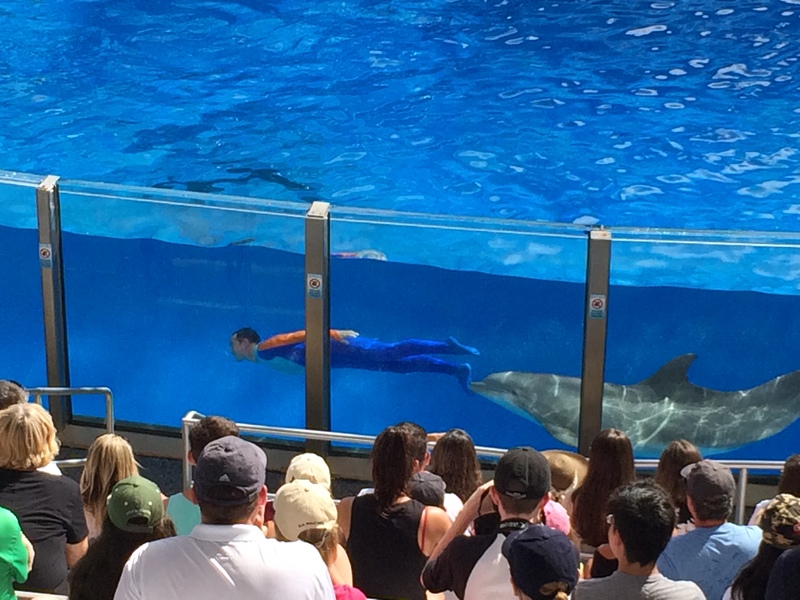 You are given about an hour to eat and then the show begins. 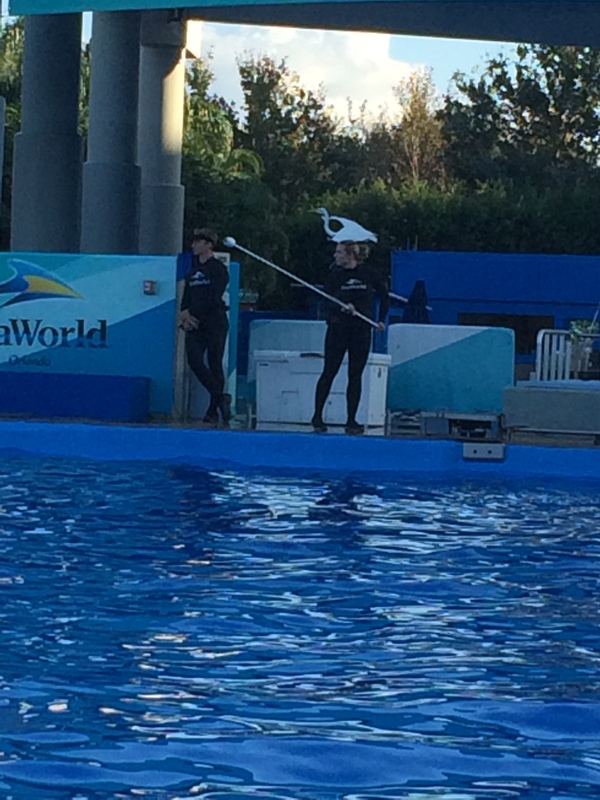 It really isn’t a show per say as they basically show you what goes on behind the scenes. 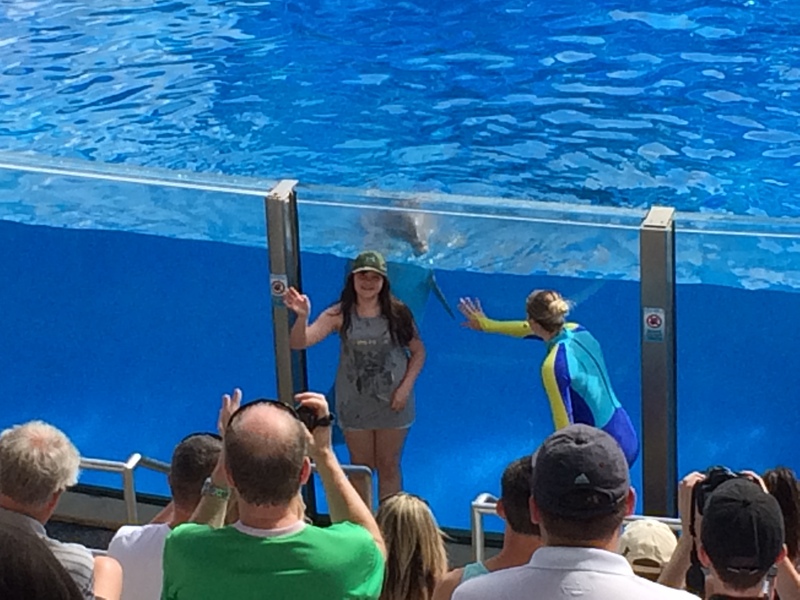 You also get to learn about the personalities of some of the whales as well. 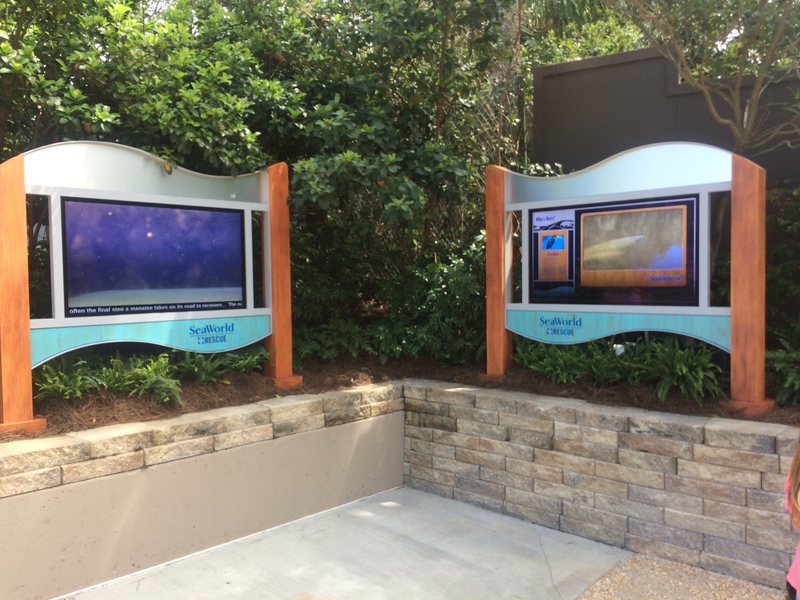 These are the displays that are just outside the Shamu Up-close viewing area. 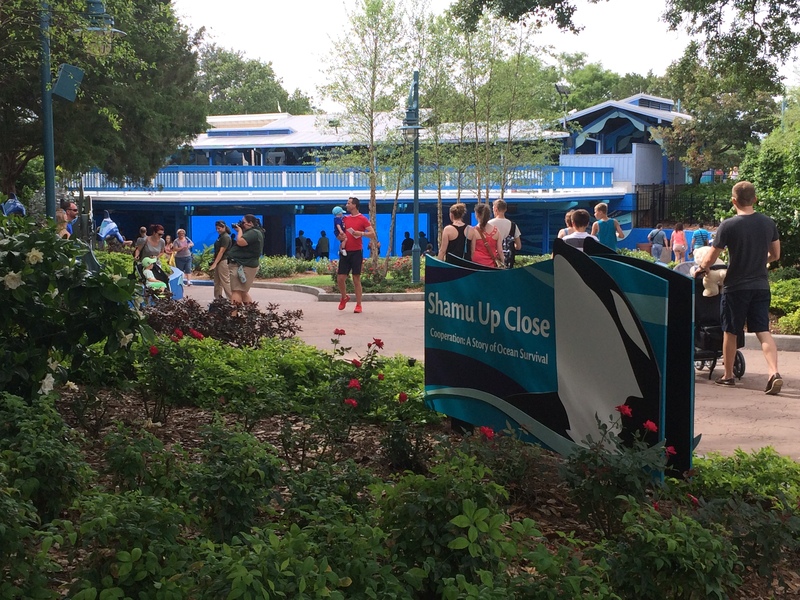 The check in area for Dine With Shamu is in this area as well. 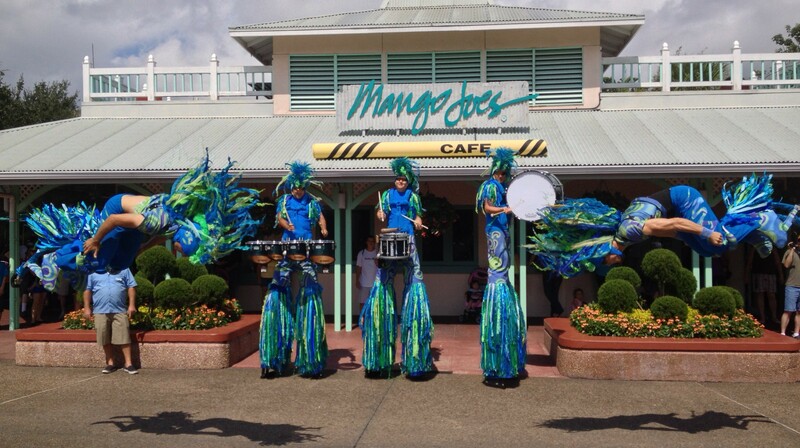 Just outside of Shamu Stadium is the Mango Joe’s restaurant which is a counter service restaurant with outdoor covered seating. 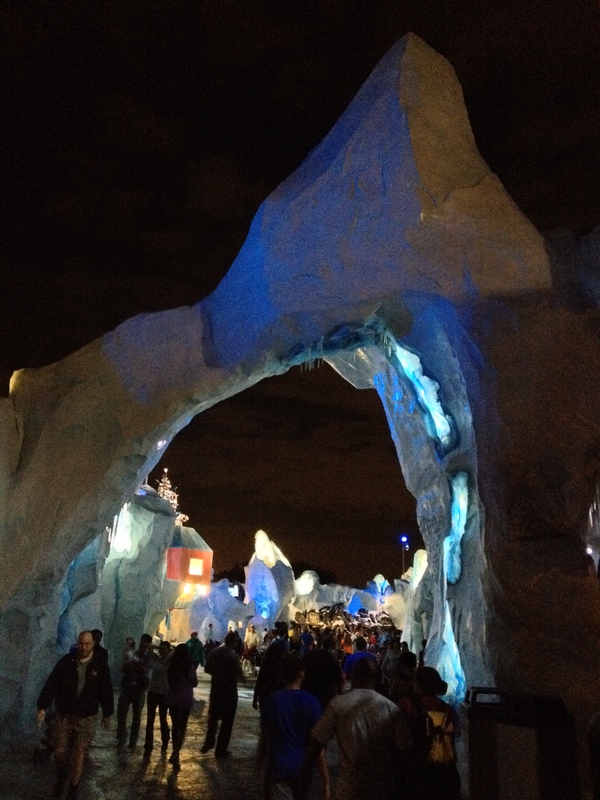 This is where some of the seasonal street performances do their shows as well. 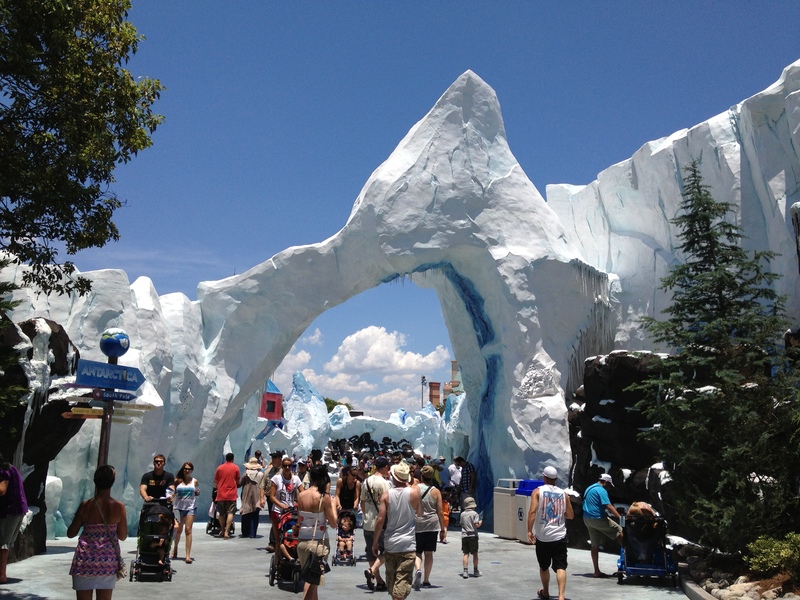 Up next, we’ll travel to the North Pole. 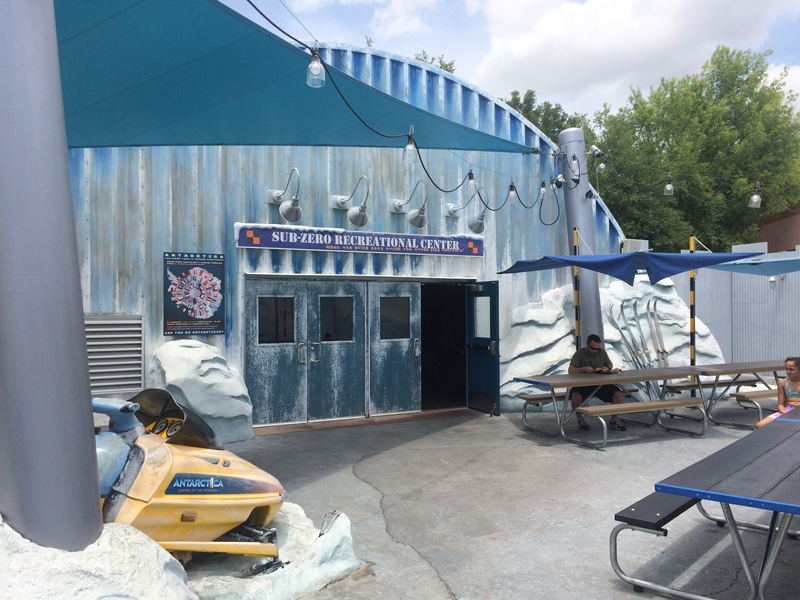 This attraction is called Wild Arctic and is one of the first motion simulators in the area and it is similar in style (not ride experience) to the Star Tours simulators at Disneyland Park in Anaheim and Disney’s Hollywood Studios in Orlando. 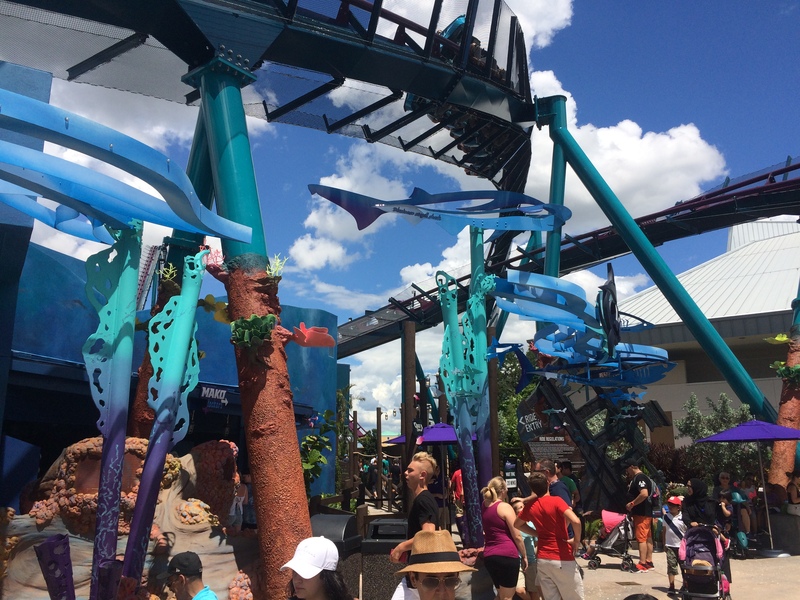 There’s both a stationary and a motion part of the ride so everyone can experience this attraction. 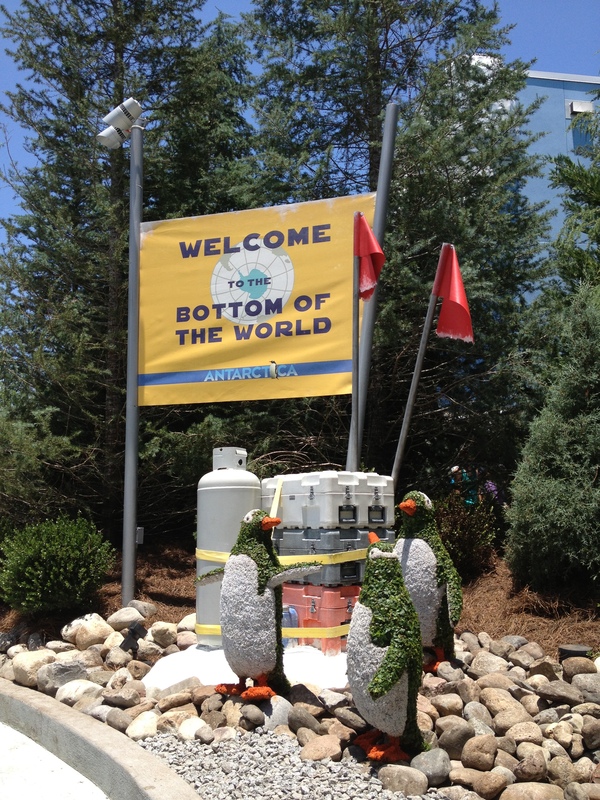 The story is that you are taking a trip to the north pole base station in a new submersible helicopter. 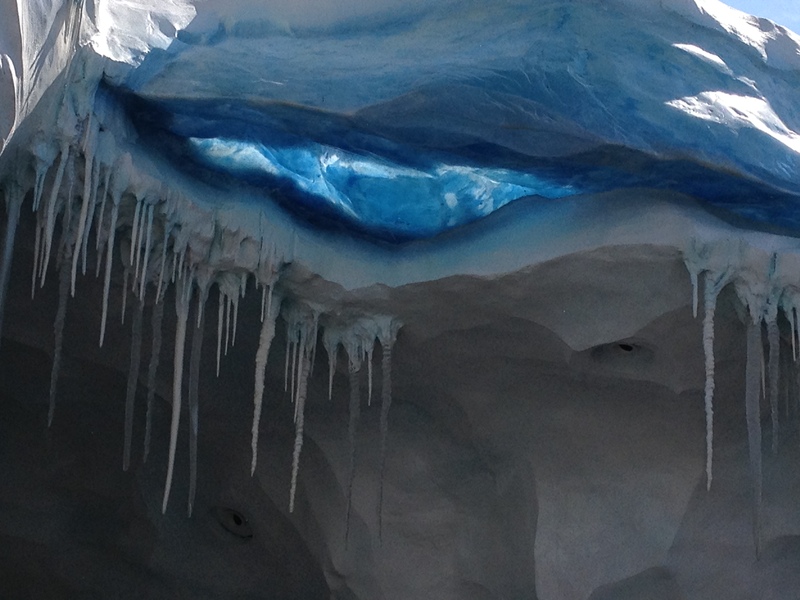 You go through tight chasms, land on a glacier that is calving. 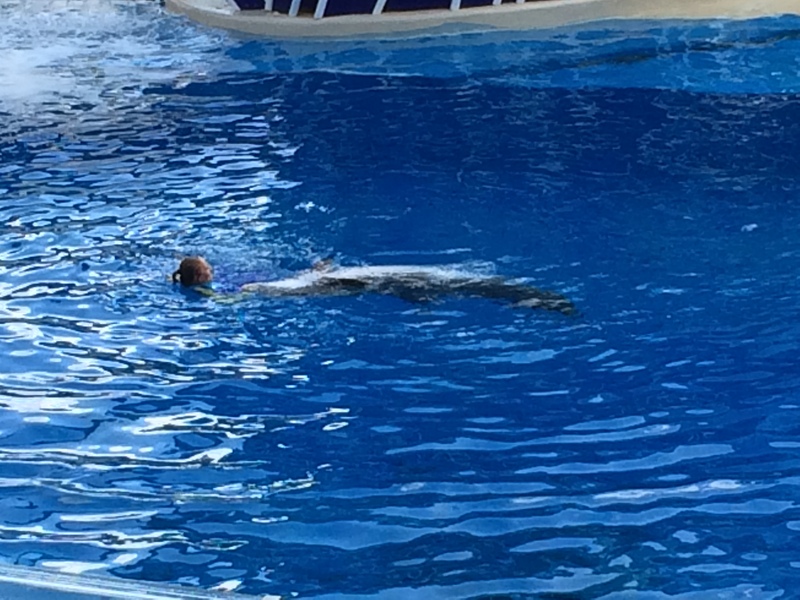 You also submerge and see the rare Narwhal whales. 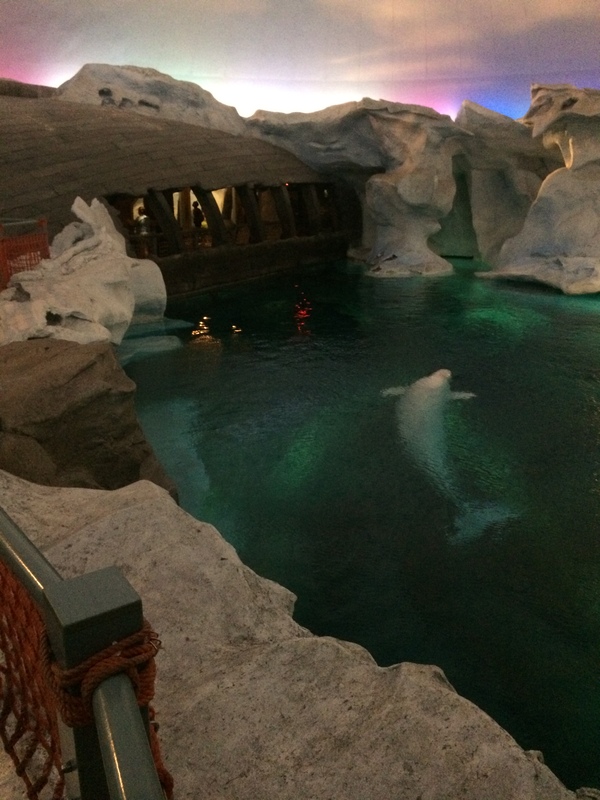 Once you land at the base station, you exit to see polar Bear, walrus, and Beluga Whale habitats themed around an old wooden sailing ship that was locked in ice. 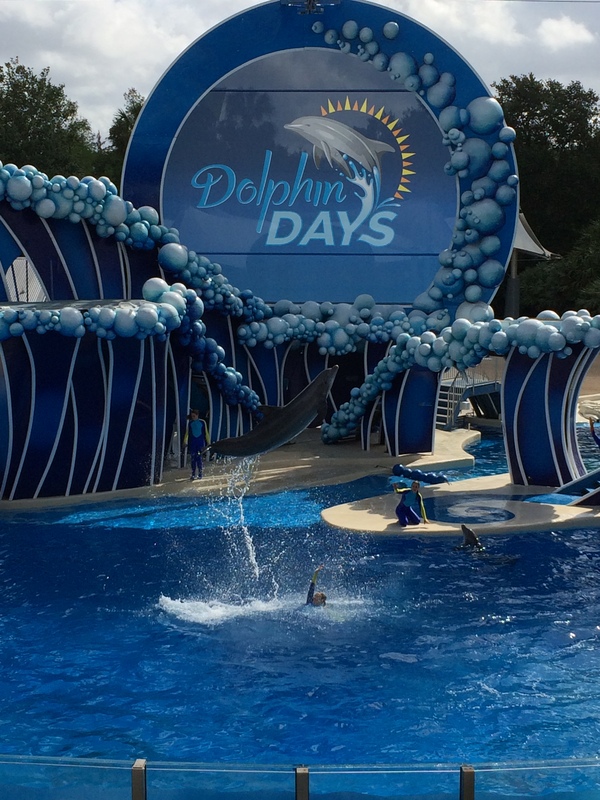 This area opened in 1992 and has been thrilling families ever since. 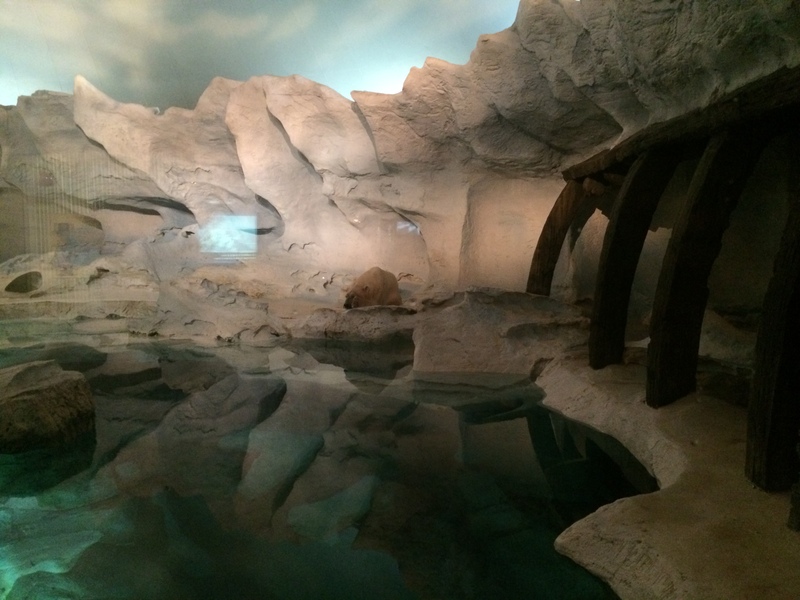 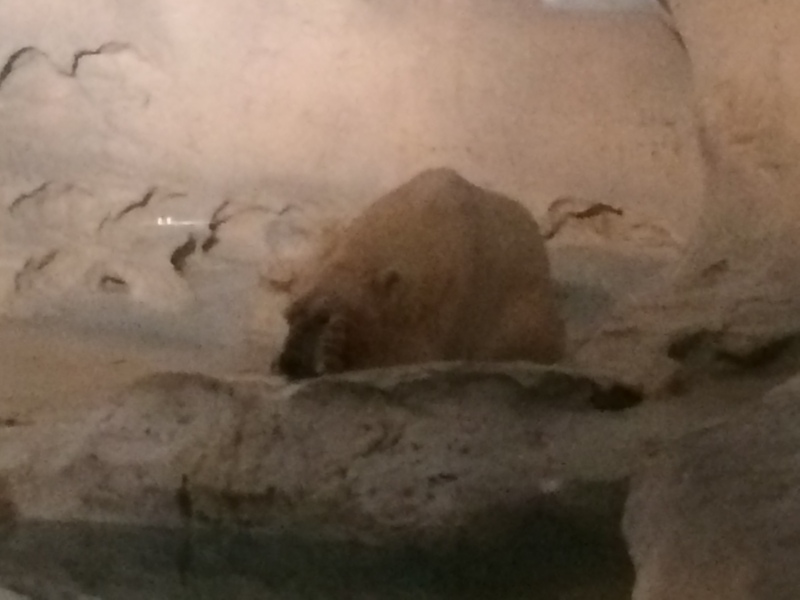 There were two polar bears when this attraction first opened but one of them died of old age a few years ago and the other one die in 2014. 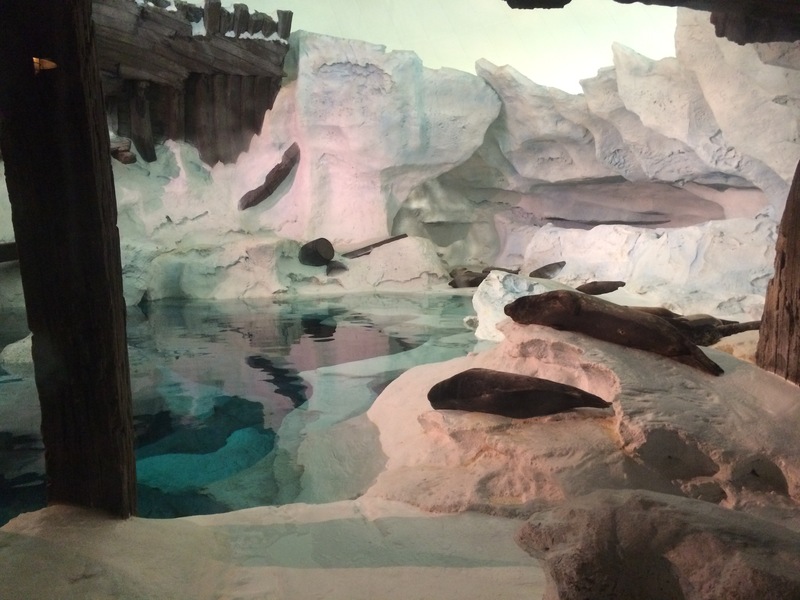 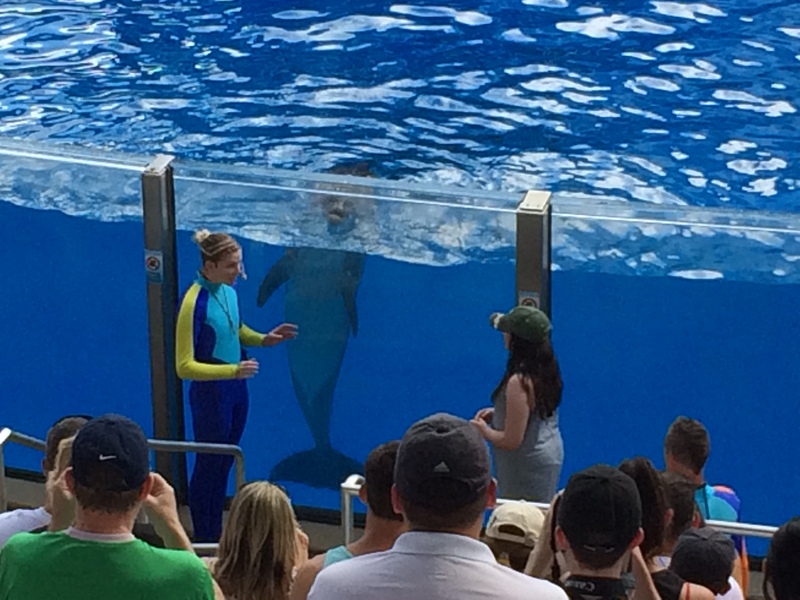 SeaWorld has temporarily put in several Sea Lions to fill the enclosure. 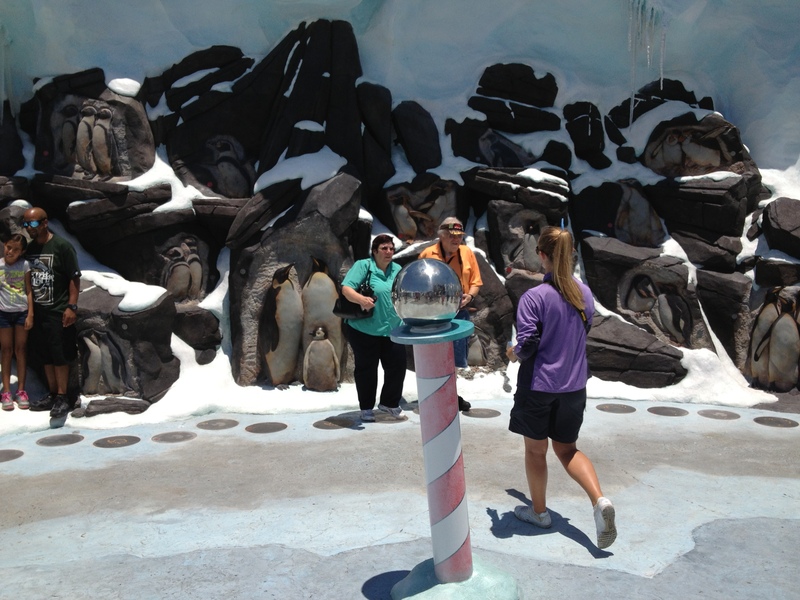 During the Holidays, the simulator changes over to the Polar Express. 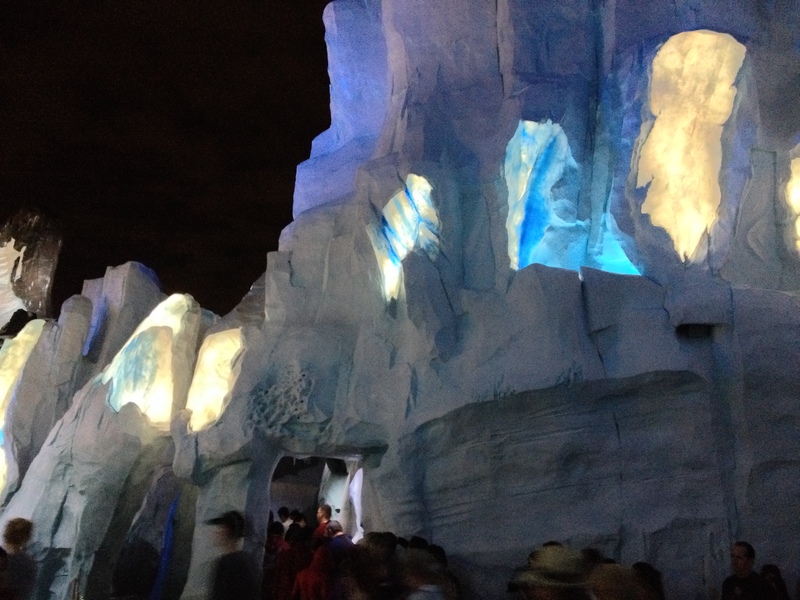 This experience is related to the movie of the same name in which you board the train to the North Pole. 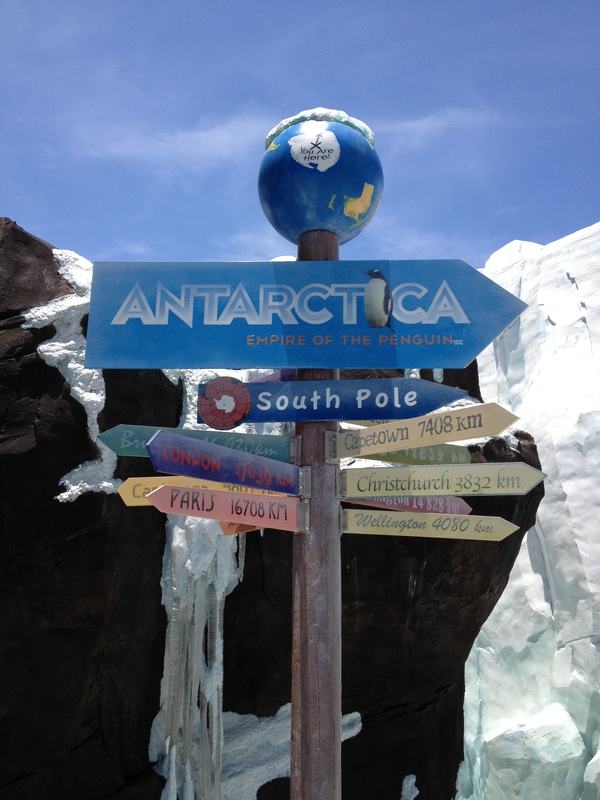 It’s been a while since I rode the Polar Express but I do remember there being a story along the way to the North Pole. 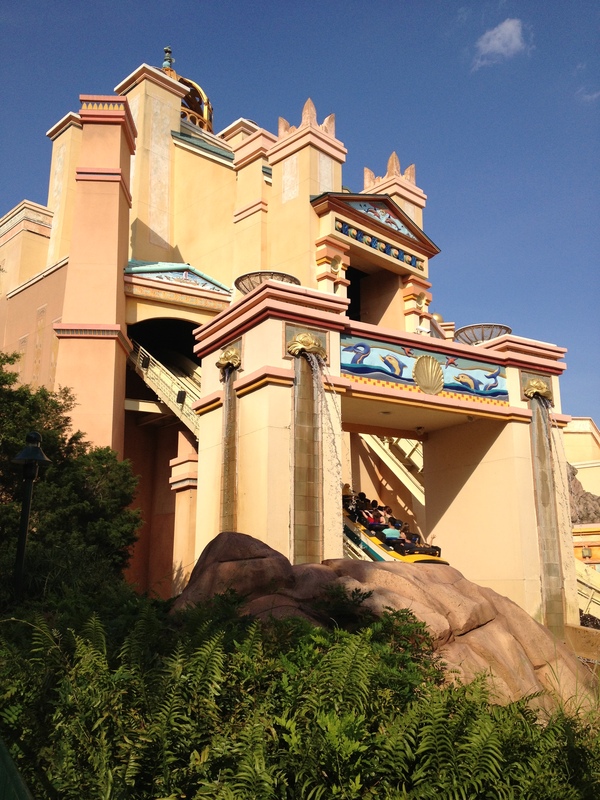 It is a nice ride if a bit dated but it still is worth a ride. 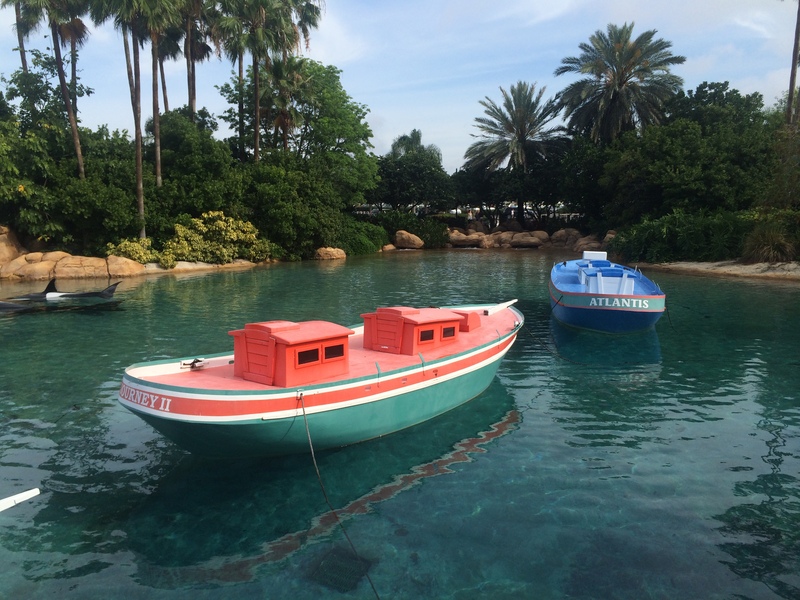 Next we cross Sea World Lake and enter a Mediterranean village. 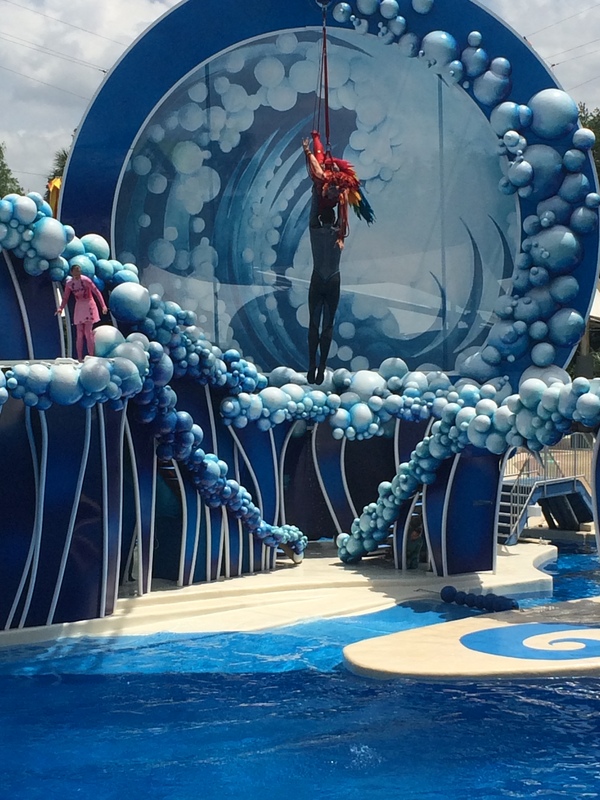 We’re now done with the Sea of Power so we’ll walk across SeaWorld Lake and finish exploring the Sea of Delight. 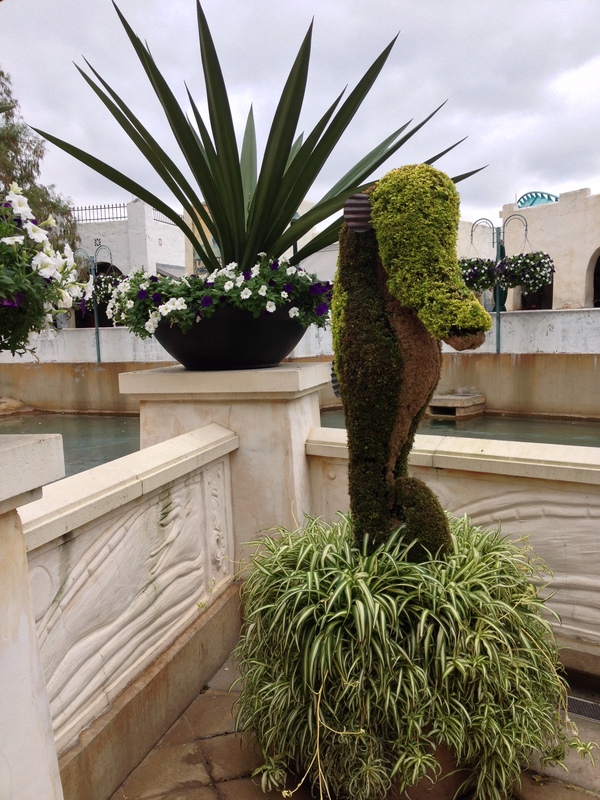 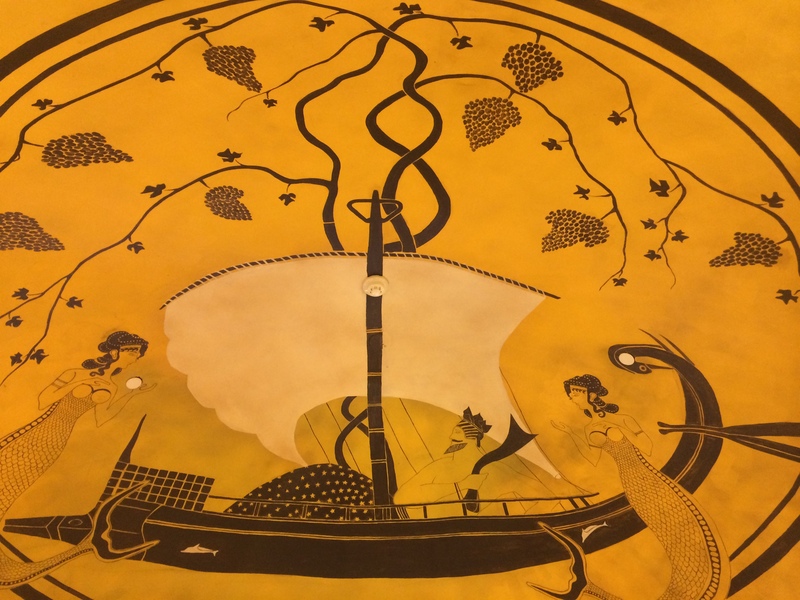 Within the Sea of Delight is a sub section that is themed to a seaside Mediterranean village called…. 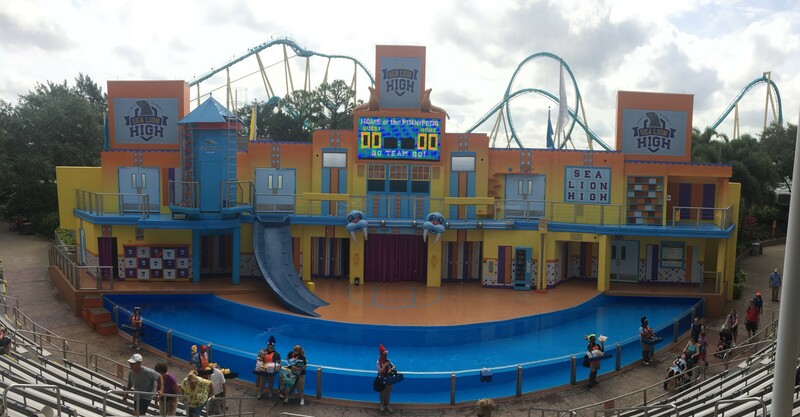 This sub-section of the Sea of Delight mainly has restaurants and gift shops but it does have one ride and one show. 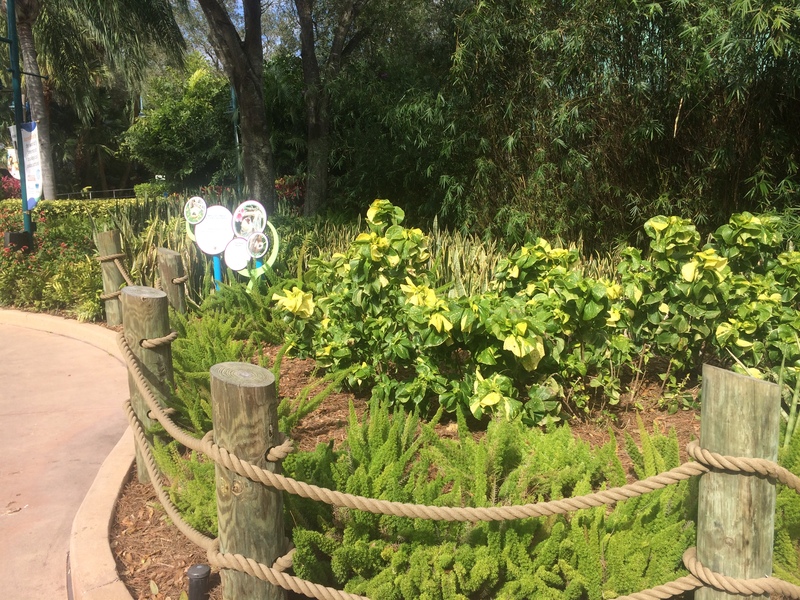 This area used to be the Hawaiian Punch Village which had the one ride and two shows, the additional show was a preview show for the Polynesian Luau dinner show. 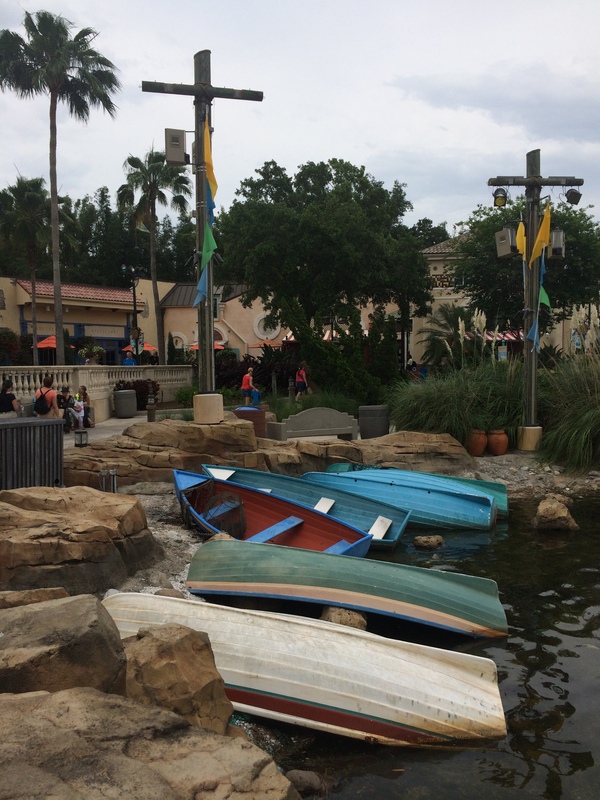 This area was rethemed into the Waterfront area in 2003 which added many shops and restaurants. 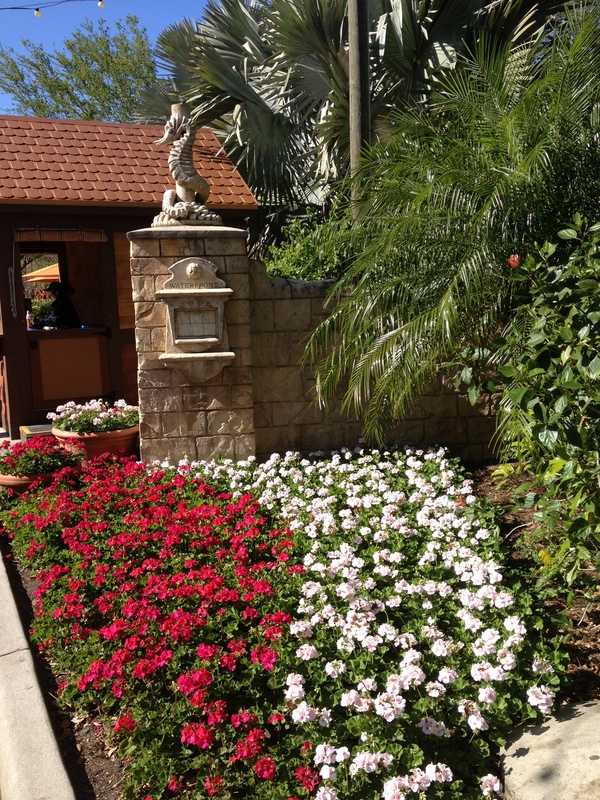 The first one we come to after crossing the lake in a restaurant called the Seafire Inn. 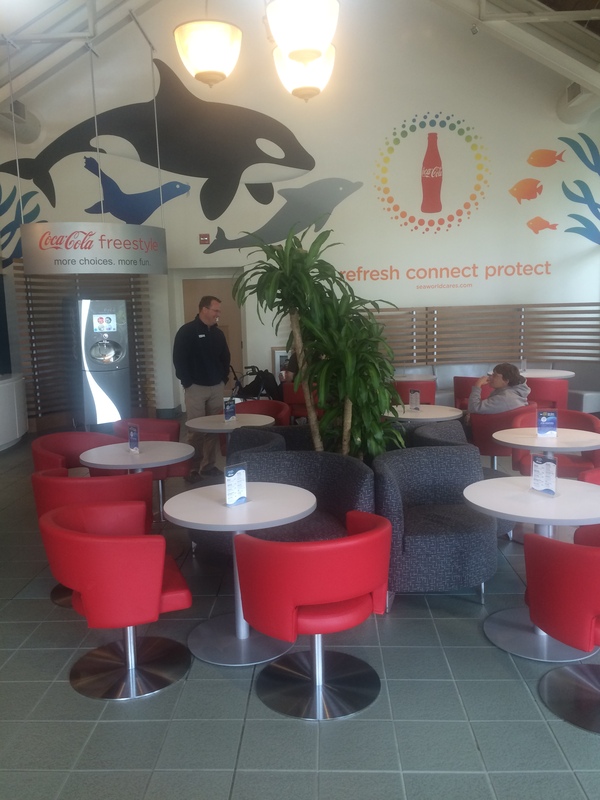 This is a counter service restaurant that does have indoor and outdoor seating and featuring an assortment of different foods from American to European to Asian. 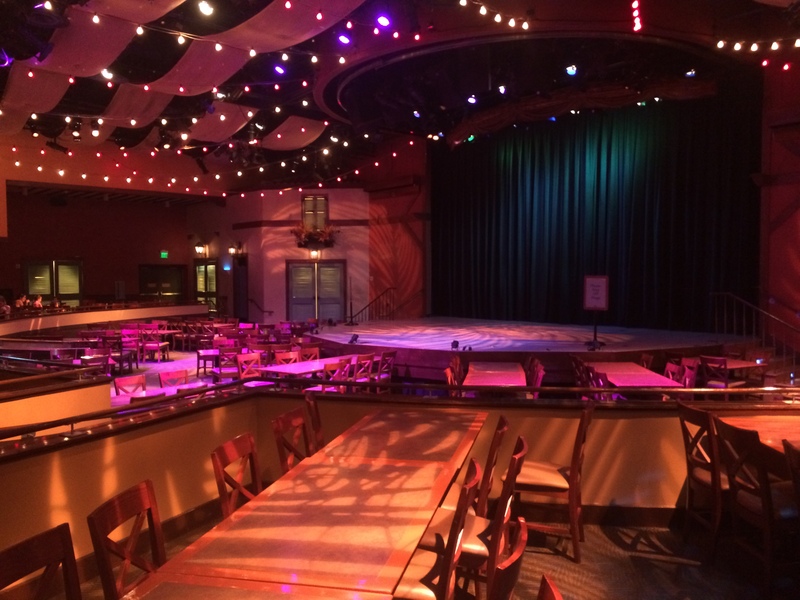 You’ll see there’s a room with a stage in it and this used to be where the Polynesian Luau dinner show used to be. 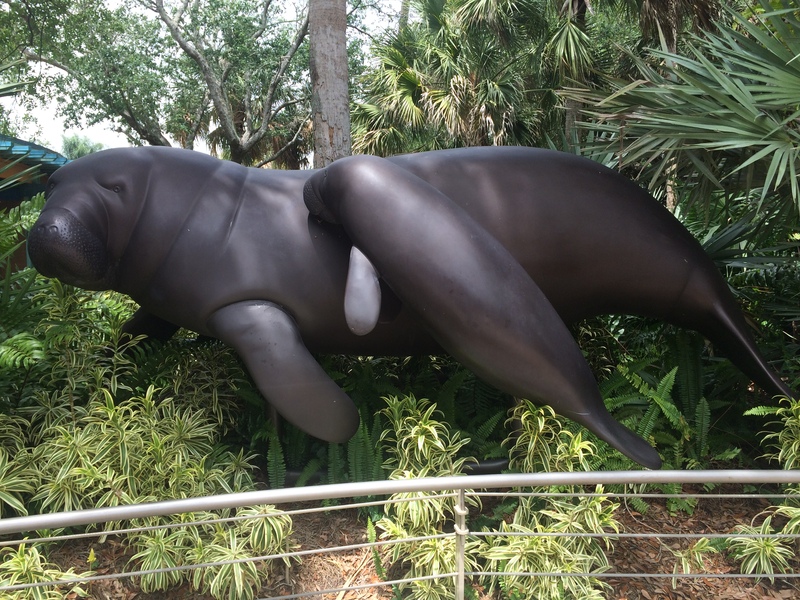 They brought out the food to your table and you selected what you wanted and they were all Polynesian dishes. 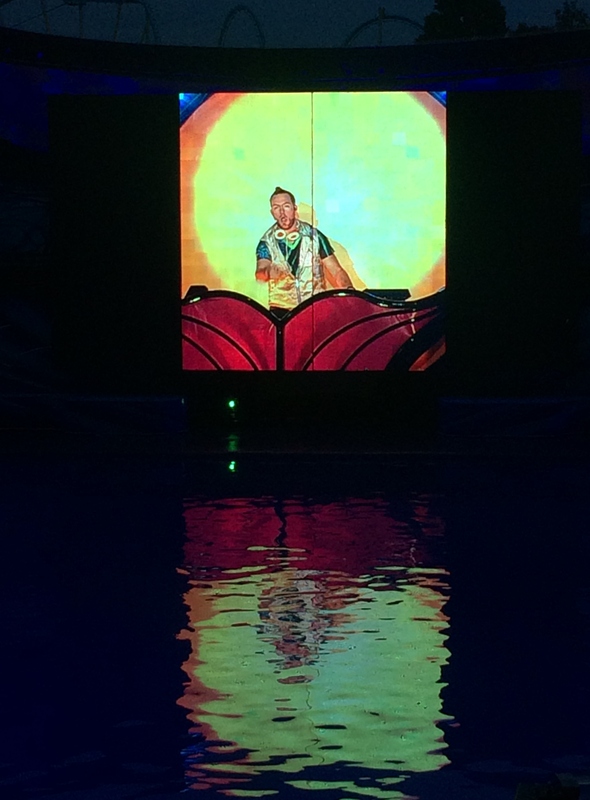 Then the show began and it was all traditional Polynesian music with different types of Hula Dances and Polynesian Fire Dances. 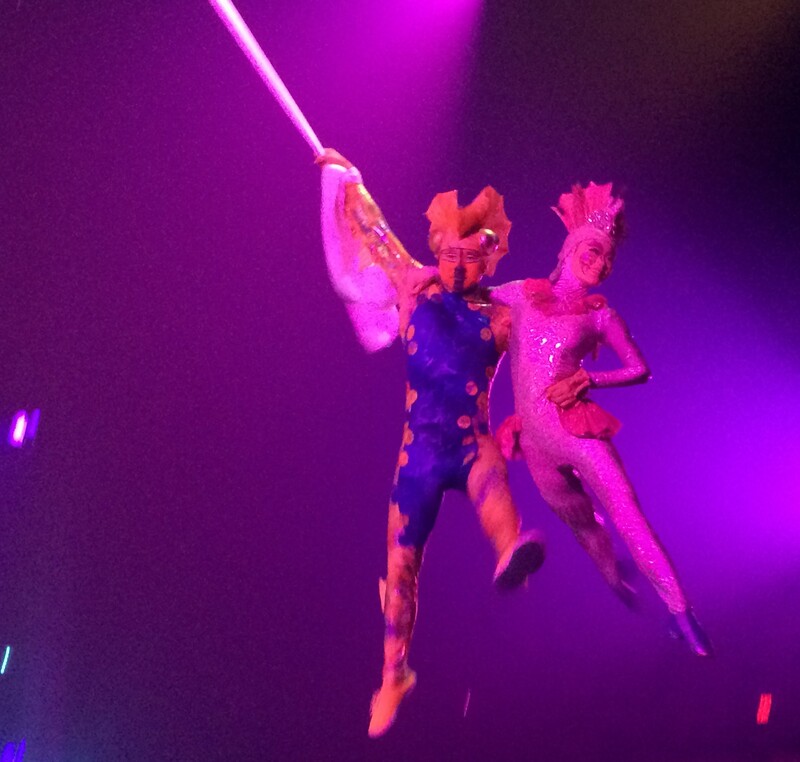 It really was a great show and the food was really good. 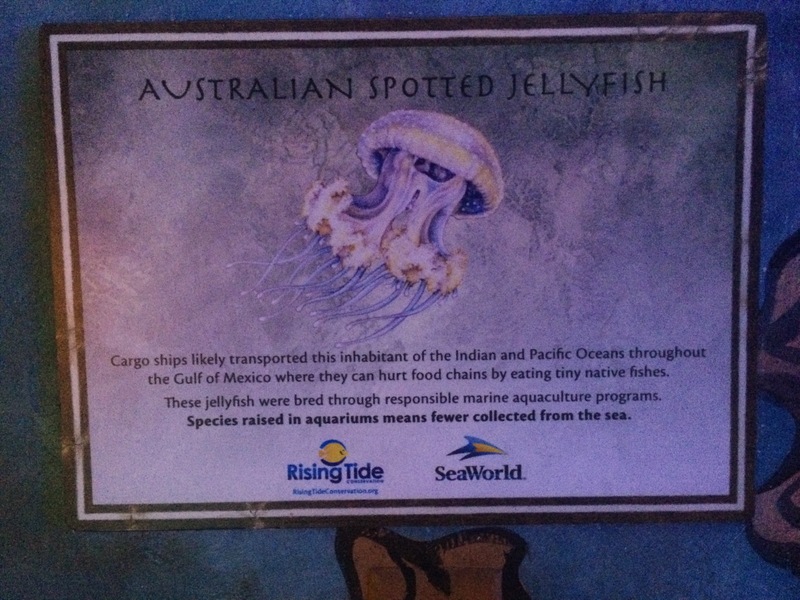 I have yet to have Mahi Mahi that was better than I had here. 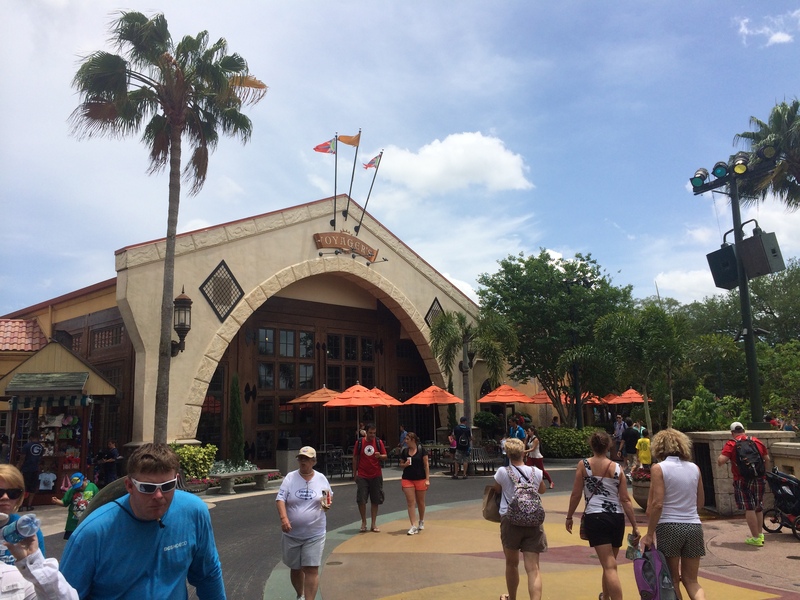 Next up are various shops that sell everything you could want. 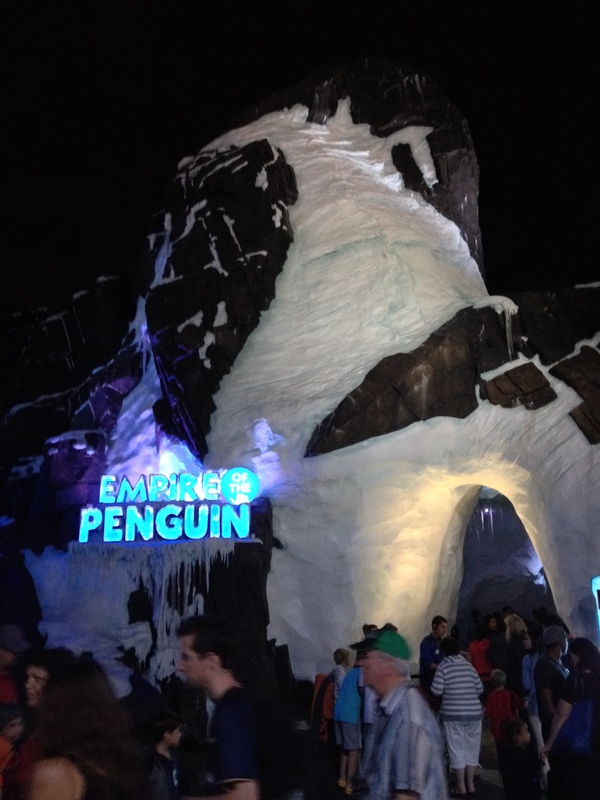 After we do some shopping, we’ll head inside for a show in the Seaport Theater. 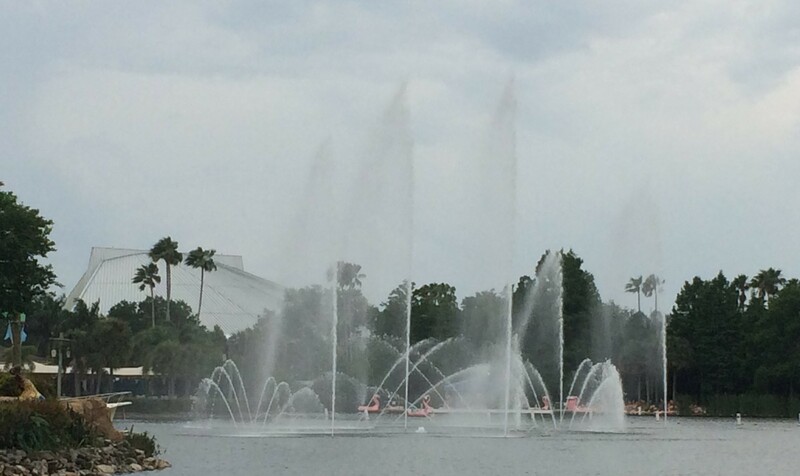 This area used to be home to an indoor choreographed fountain show which really was pretty good in its day. 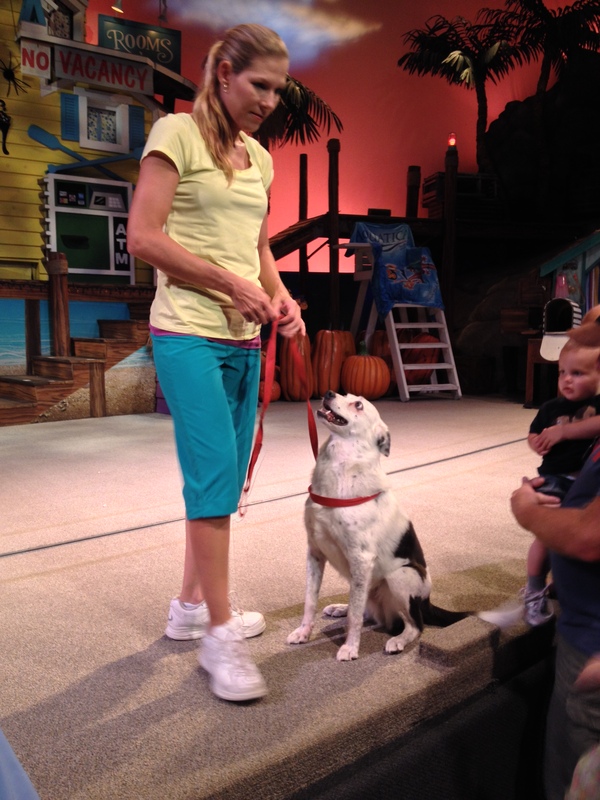 It was later replaced by a stage show which then made way for the current show called Pets Ahoy where you can see cats, dogs, pigs, skunks, birds, ducks, and other animals that were rescued from the local pet shelters, star in their own show. 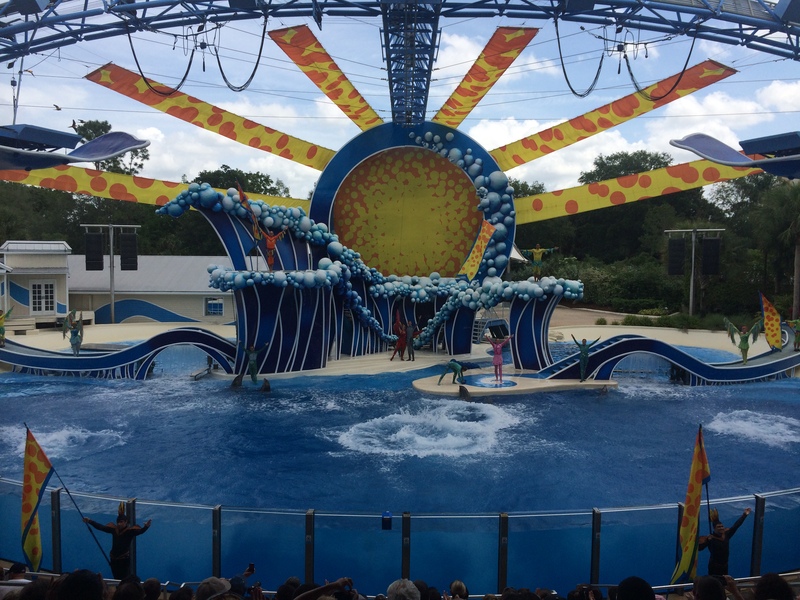 This really is a nice and fun show and I recommend you see this if for nothing else, to get out of the heat as it is air-conditioned. 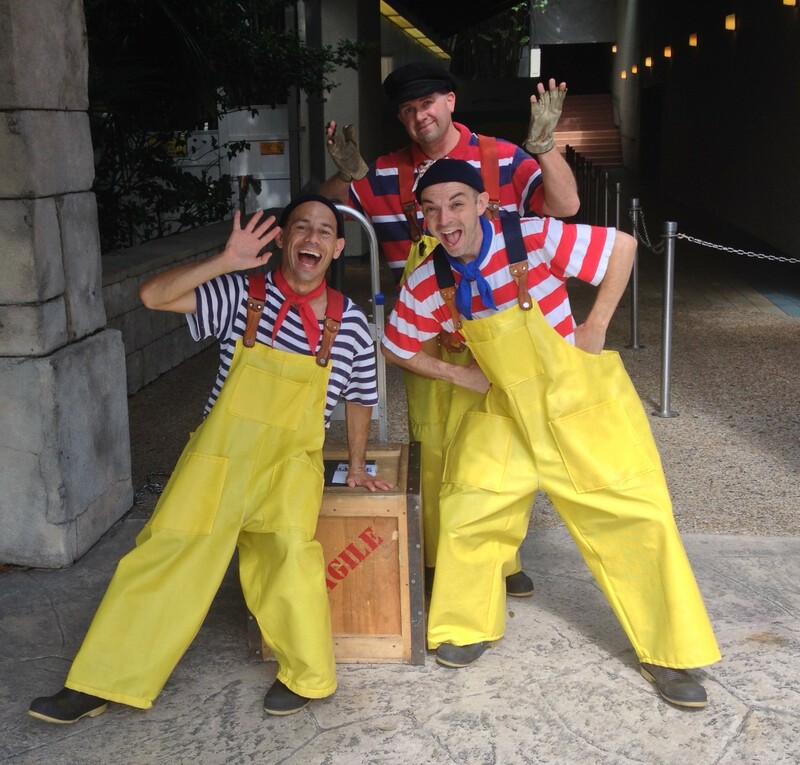 Outside the entrance is another location where you can see some of the seasonal street shows, this one is called “The Longshoremen”. 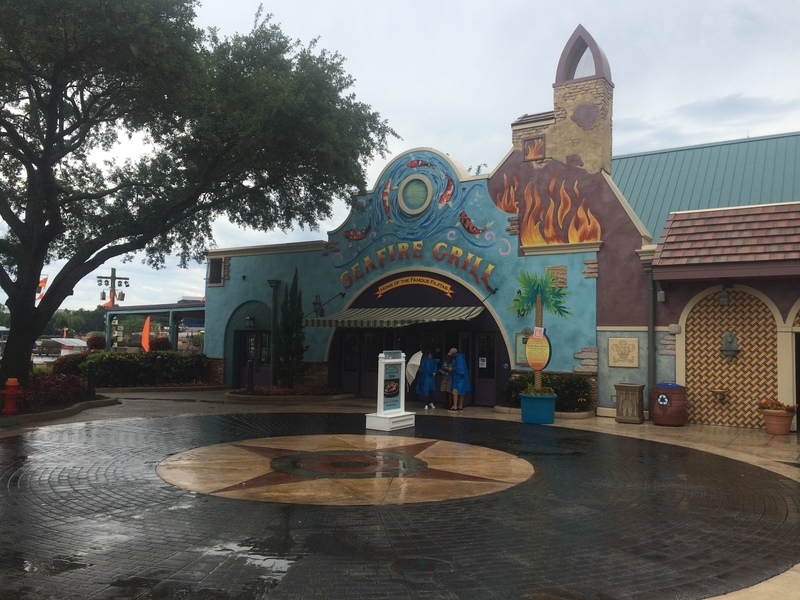 This restaurant serves Bar-B-Que food and it also is a counter service restaurant as well. 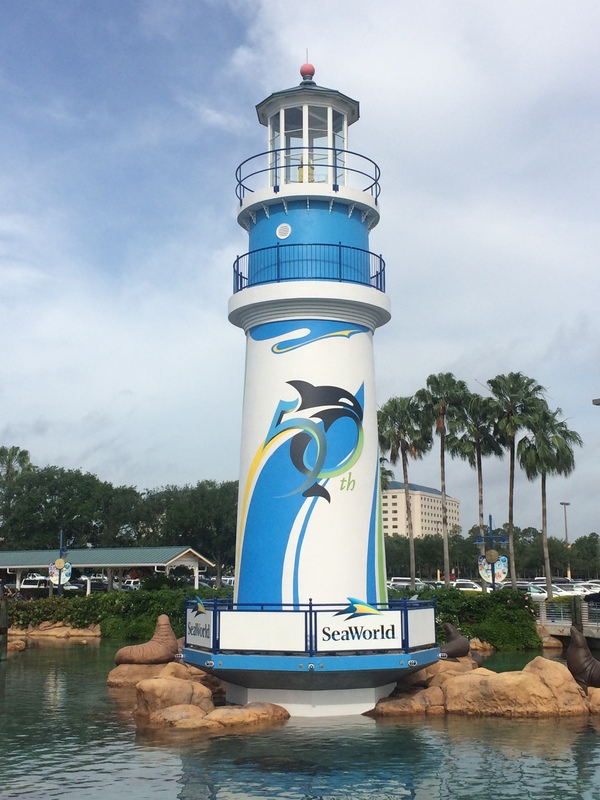 Next up is SeaWorld’s oldest operating ride called the Sky Tower. 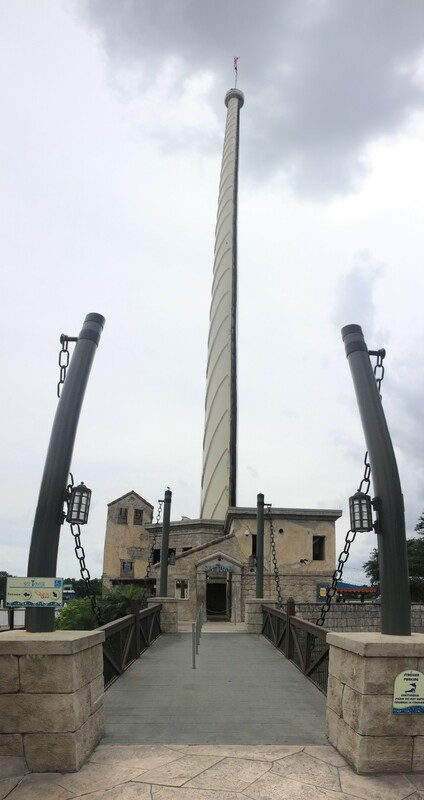 This attraction is currently the tallest attraction in Florida standing at 335 feet tall. 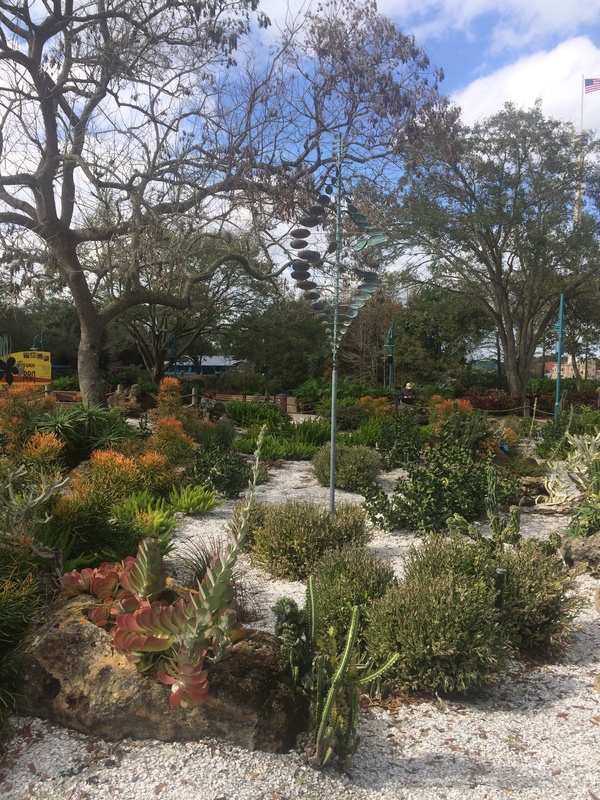 This is called a Gyro Observation tower which means it rotates as it rises to the top for a beautiful view of the Central Florida area. 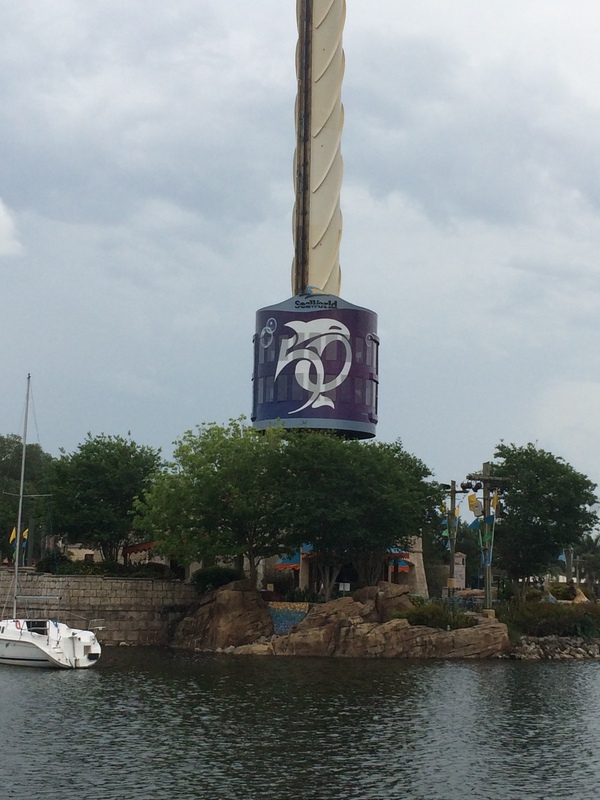 I can remember seeing EPCOT’s Spaceship Earth being built from this tower as a kid. 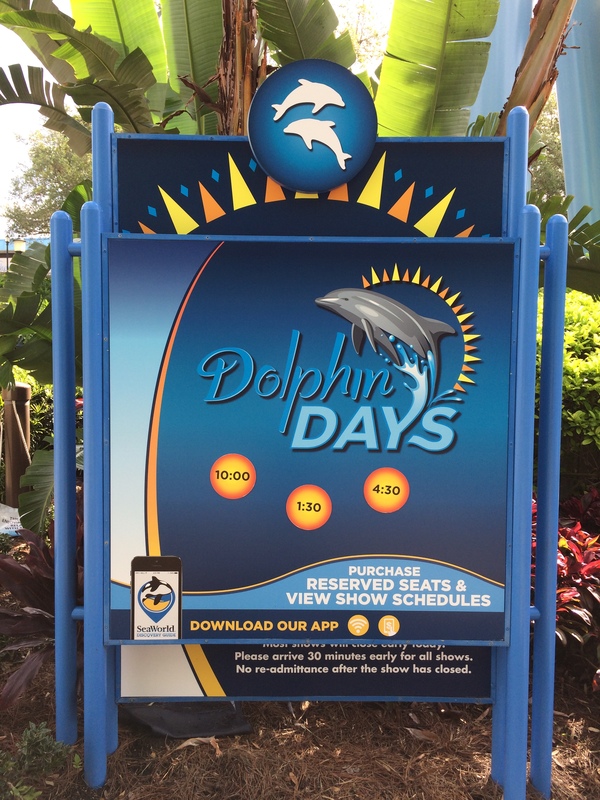 This ride opened about a year after SeaWorld Orlando opened and until lately, was an additional charge to ride unless you had an annual pass. 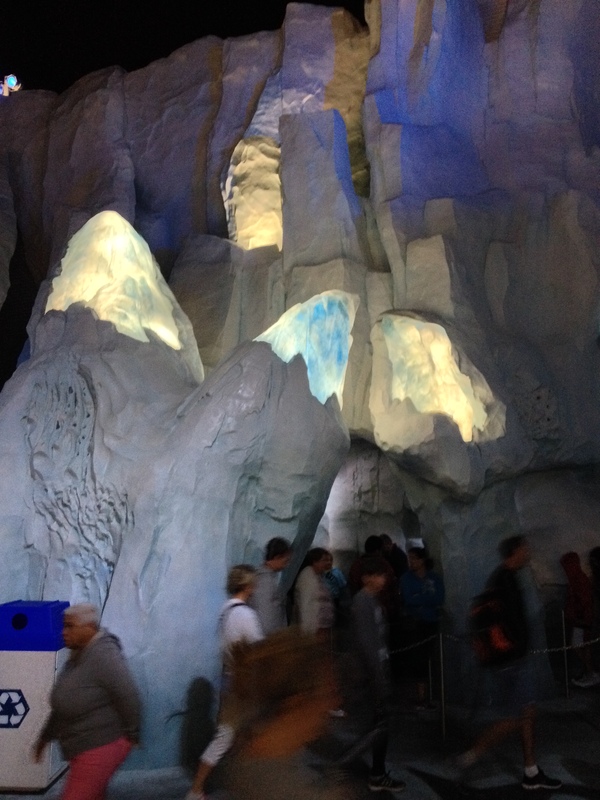 Here’s an on ride view from the Sky Tower. 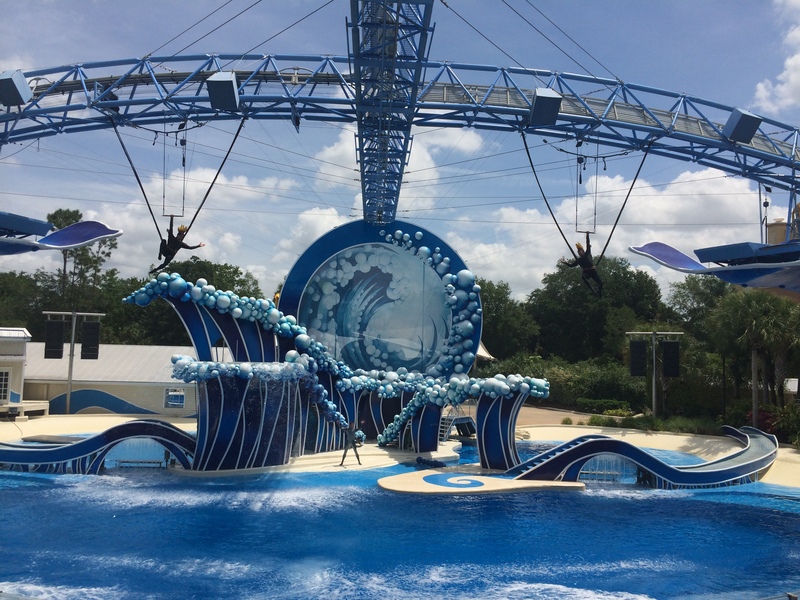 Next up is pearl diving, a SeaWorld tradition going back to the Japanese Village . 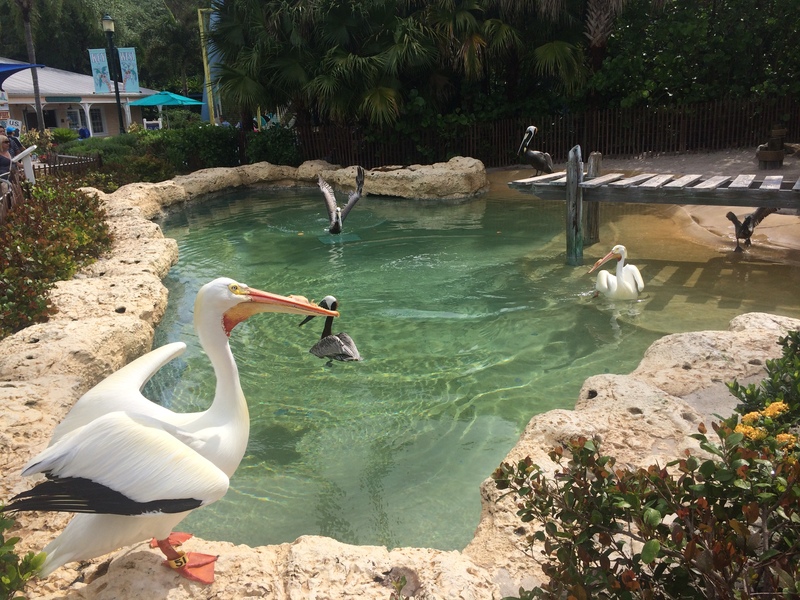 Pearl Diving was originally done at the Japanese Village which was removed in the 80’s and replaced by the Penguin Encounter. 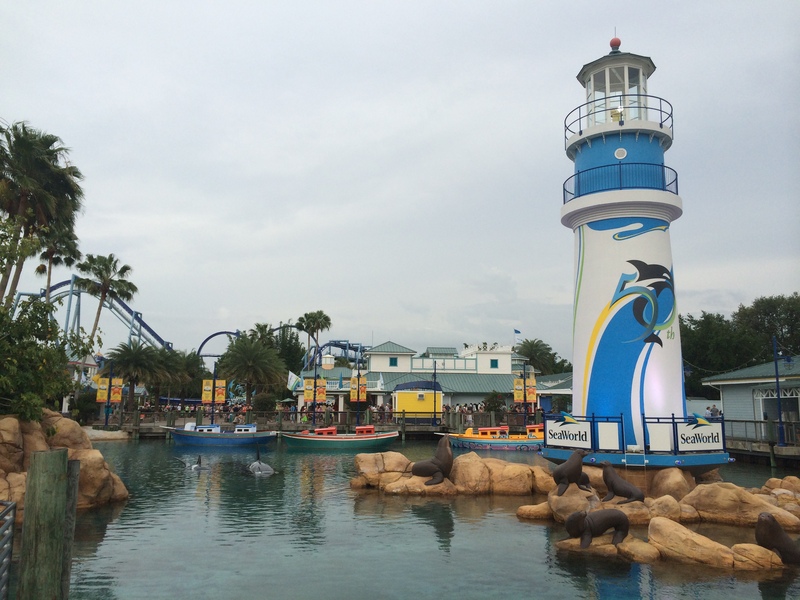 SeaWorld brought it back when the Waterfront opened in 2003. 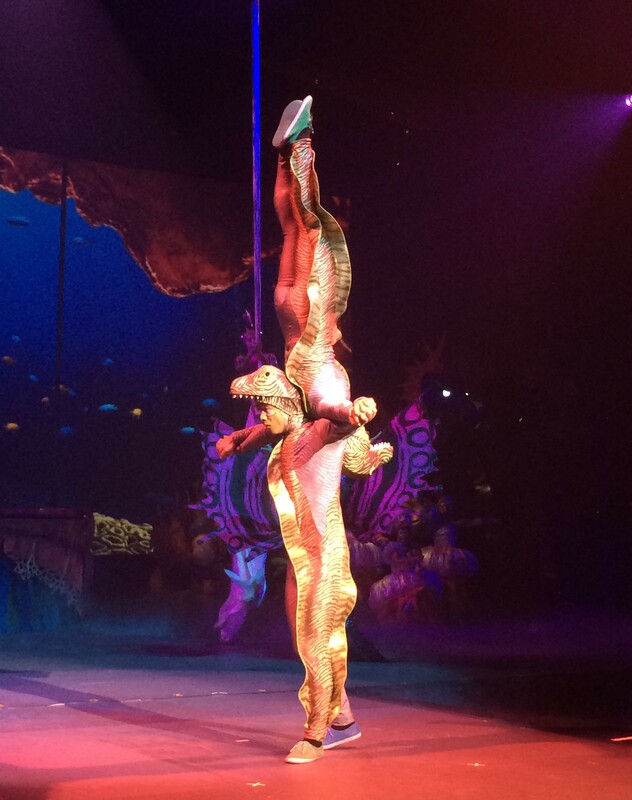 The divers will dive and collect the oysters, then remove the pearl provided you can pay for it first. 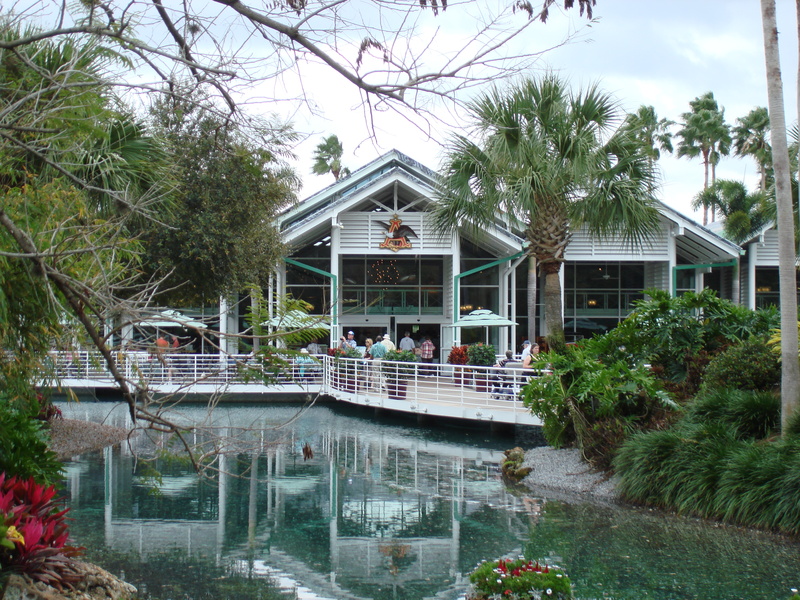 You can then add the pearl to several things in the gift shop called Oysters next door. 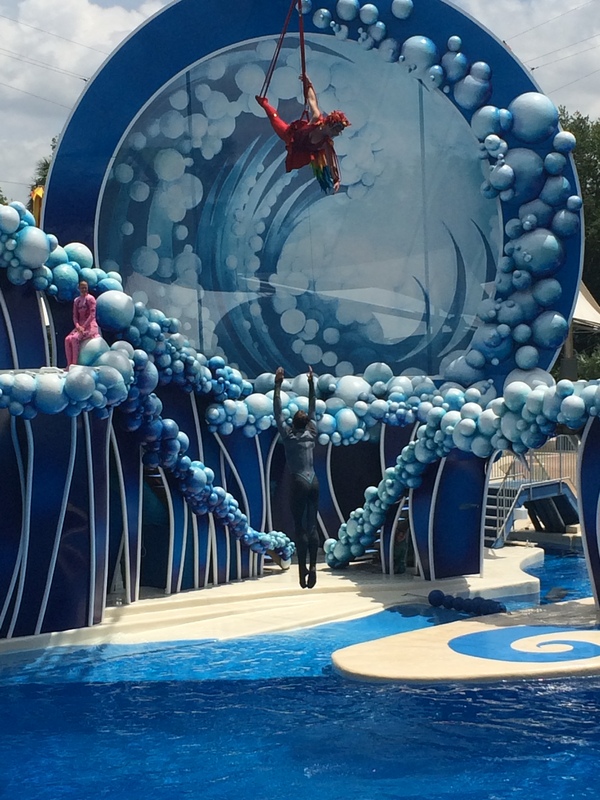 Unfortunately, these divers are no longer at SeaWorld Orlando but I hope they’ll be brought back soon. 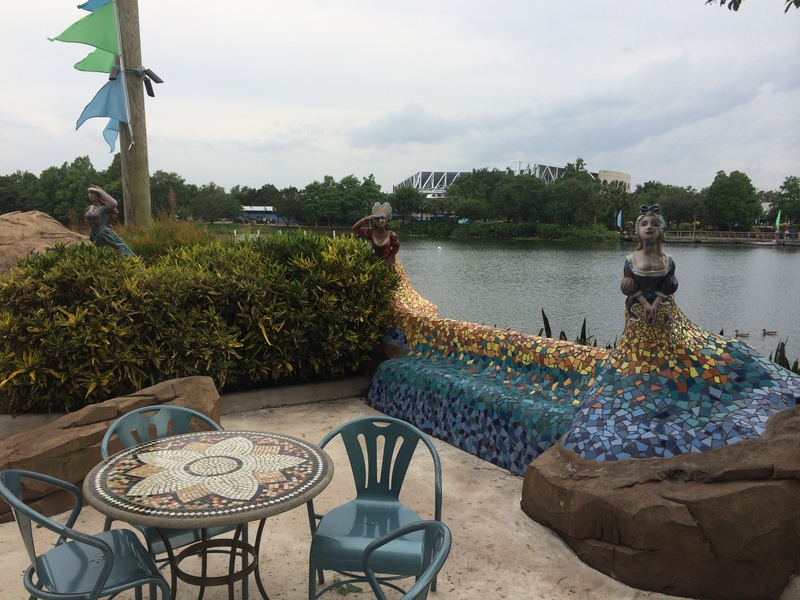 Our last stop in the Waterfront is a nice restaurant on the lake called the Spice Mill. 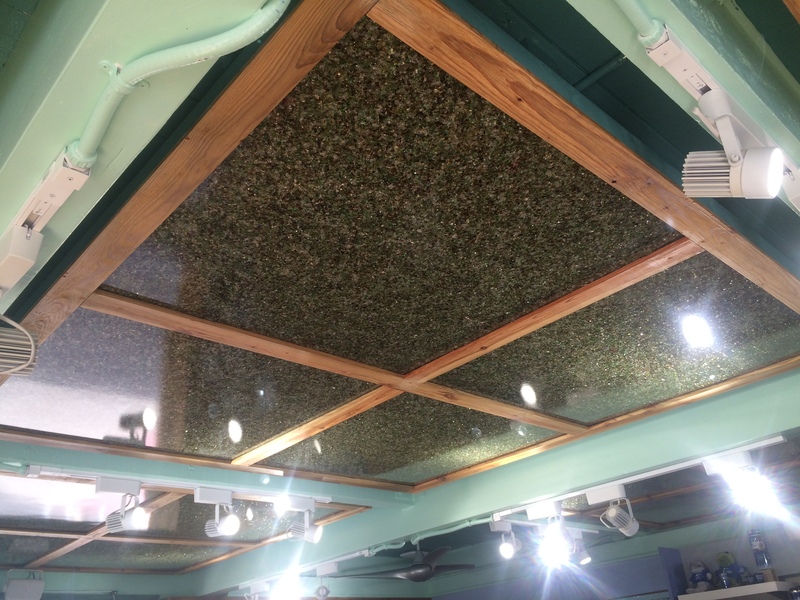 This restaurant is a counter service restaurant that serves American fare with their own seasoning. 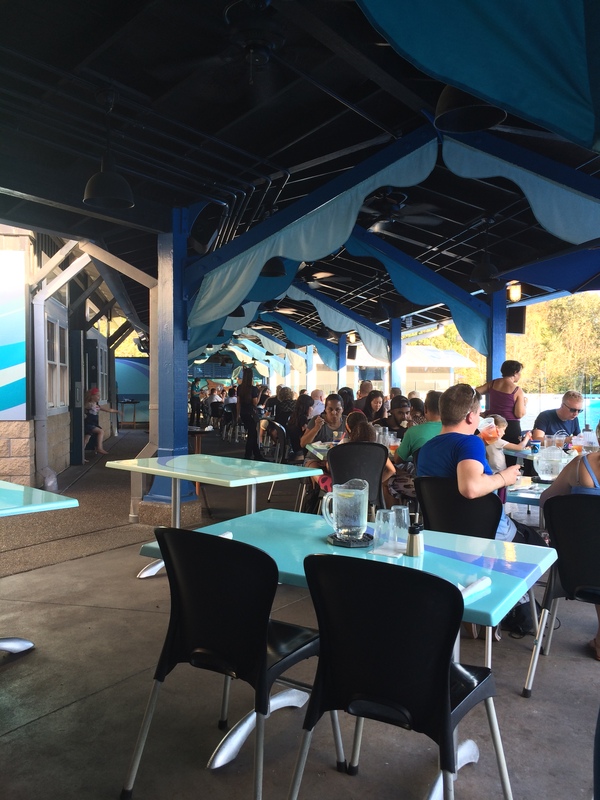 You can eat indoors or outdoors on the lakefront. 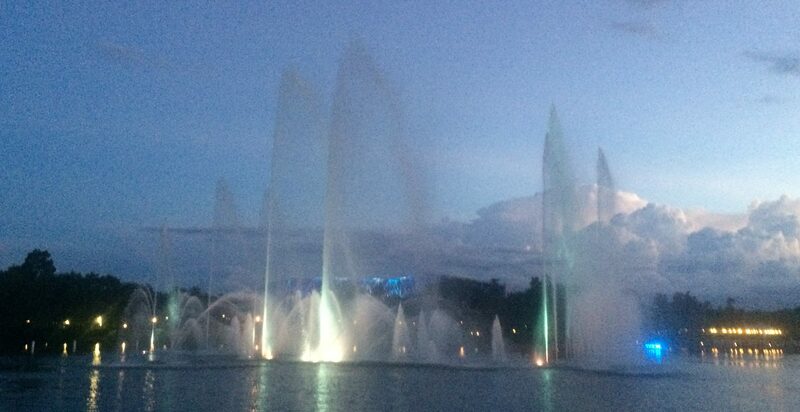 Just outside is a seating area where you can sit and watch a fountain show, every hour, on the hour. 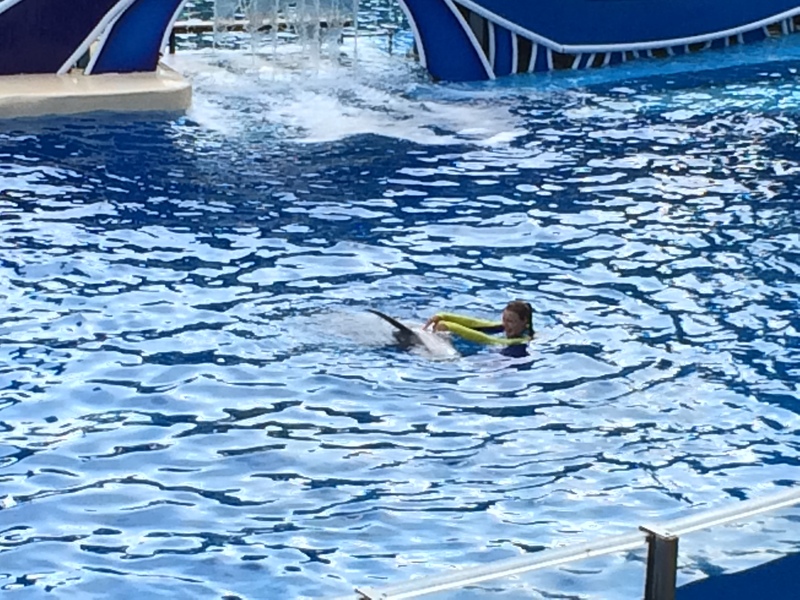 Here’s a video of one of the song’s they use during one of the hourly shows. 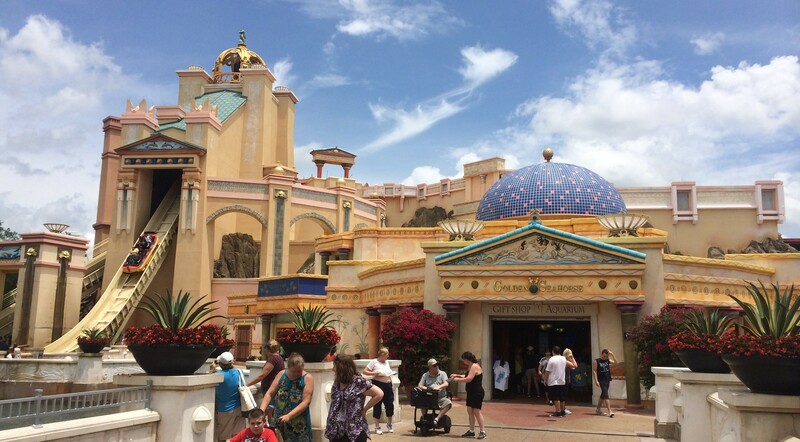 This area really is well themed as these photos will show you. 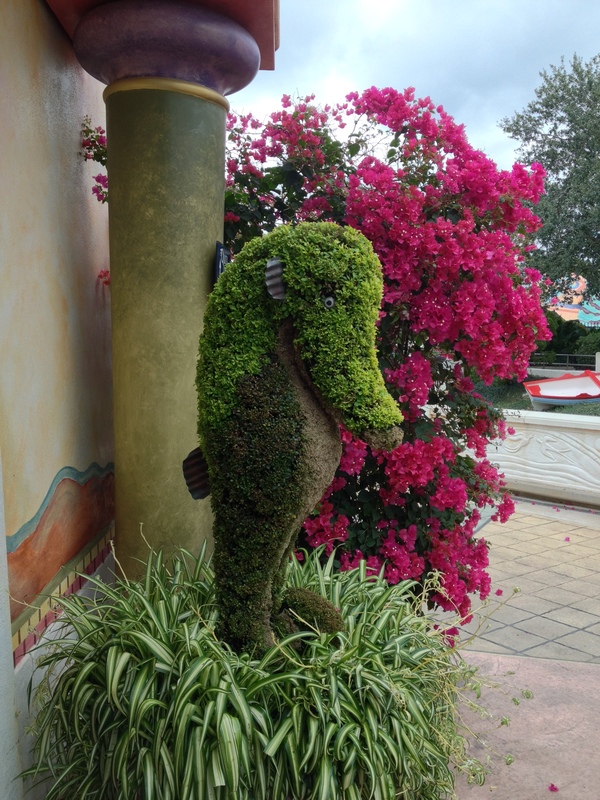 Now we walk back past the Sky Tower, Seaport Theater, and turn right at the Seafire Inn and leave the Waterfront and we come across the Dolphin Nursery. 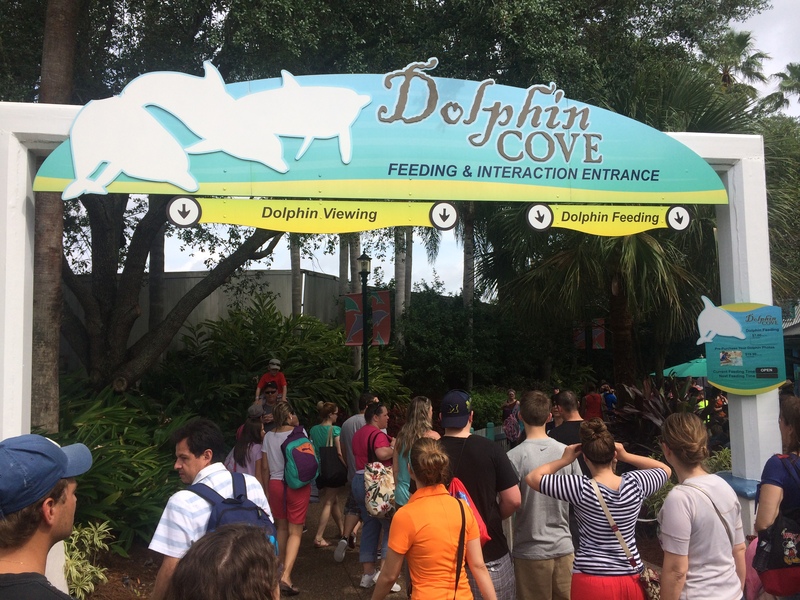 I do believe this is where the original dolphin petting and feeding area was when SeaWorld first opened in 1973. 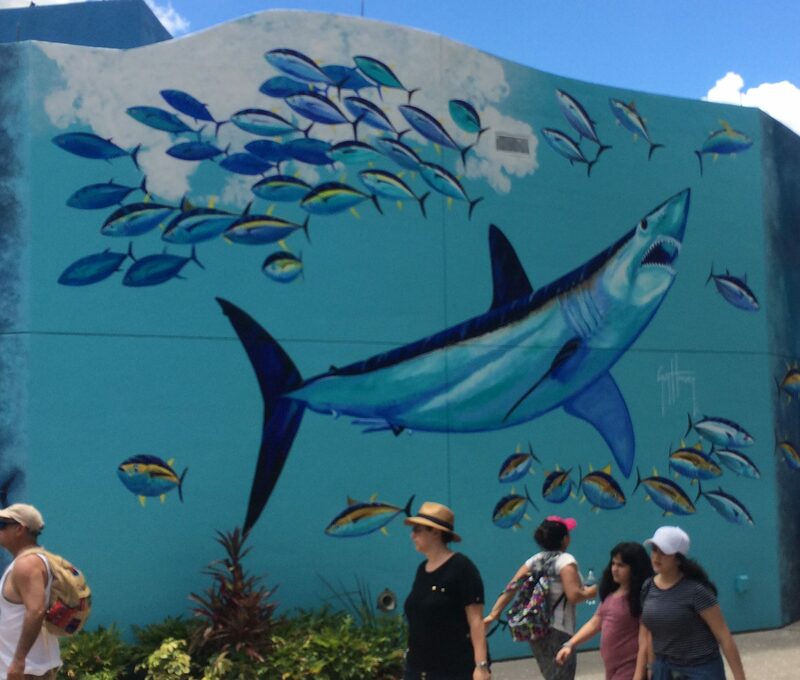 Notice the small building in the back which could have been where people bought the fish. 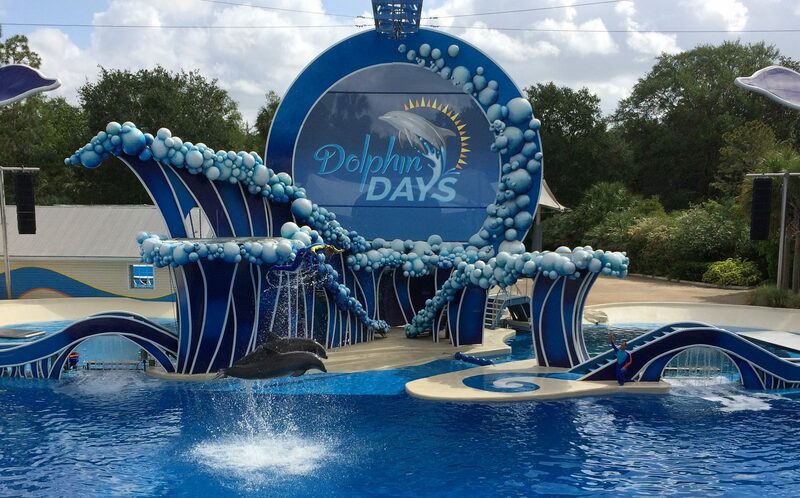 This is where pregnant Dolphins go to give birth and nurse their offspring until they can be returned to their habitat. 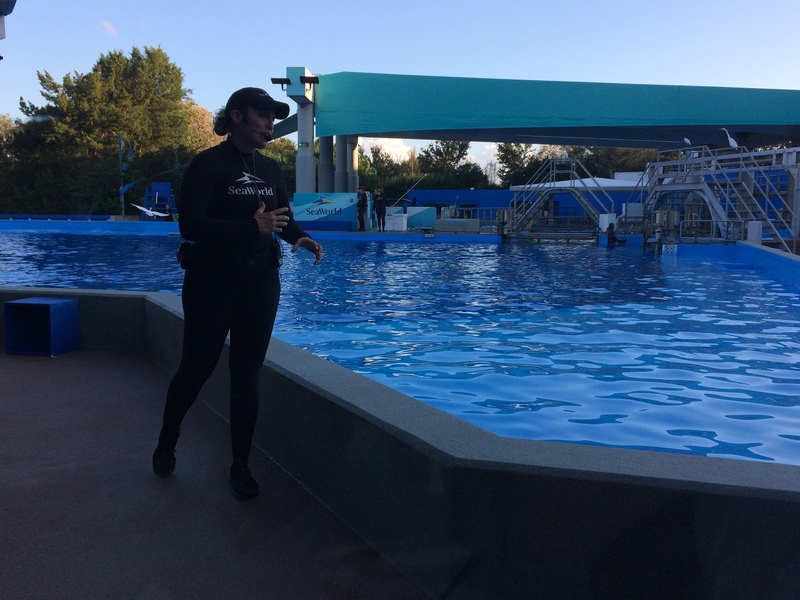 They also do trainer time segments here where trainer will come over to do basic interactions with the mothers and newborns. 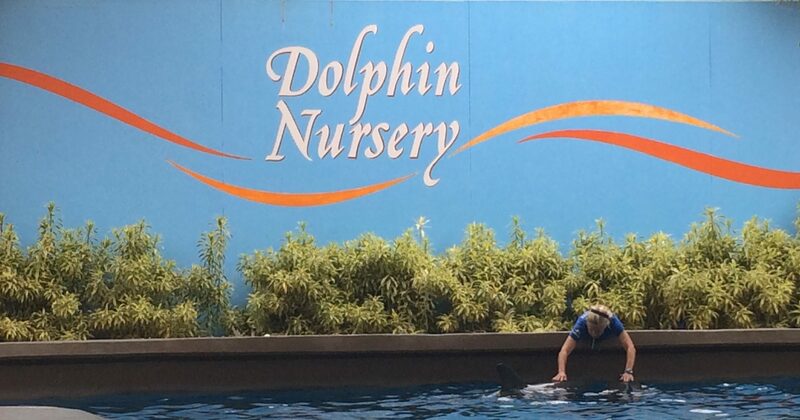 They’ll also do some basic exams while they’re there. 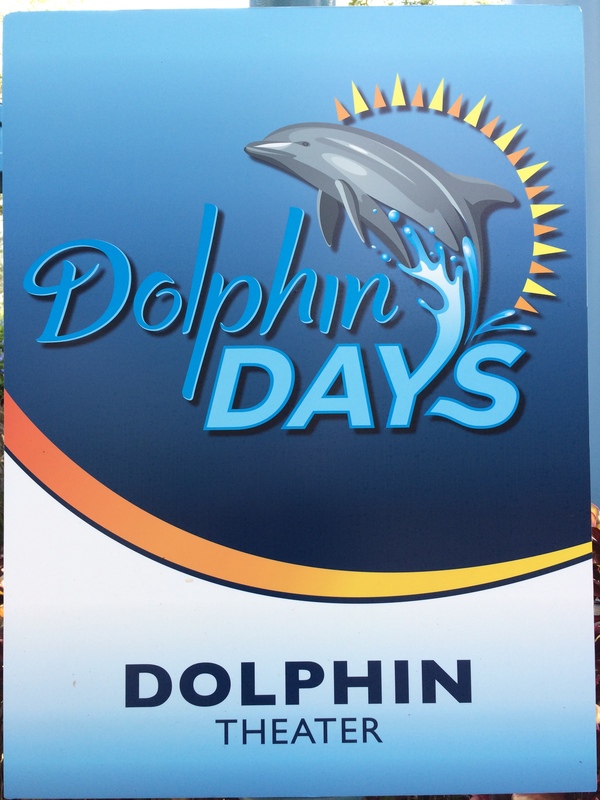 There is one more area which isn’t always open to the public and that is the Bayside Stadium area which used to be called the Atlantis Stadium and used to host the very popular ski and diving show until sometime in the late 90’s. 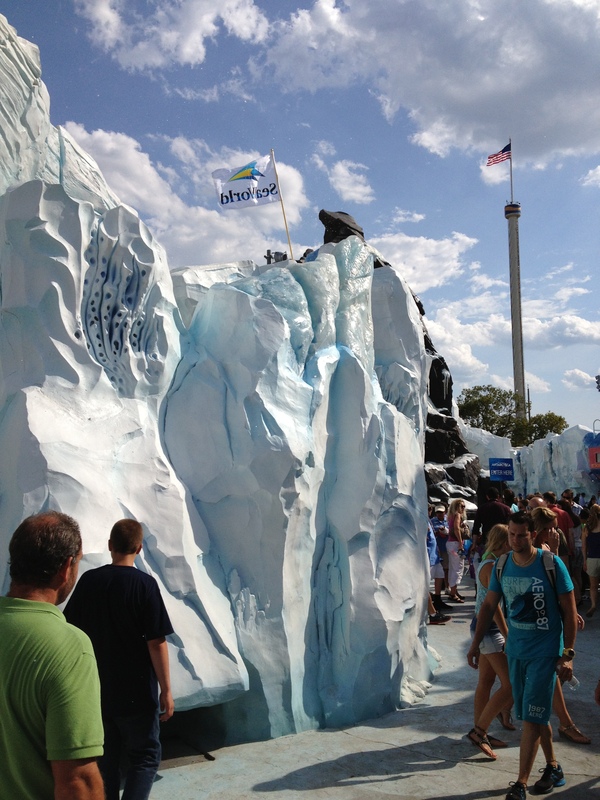 Now it is used for special events like Viva La Musica which features live latin music and food, the Bands, Brew, & BBQ which features live country and rock music and Bar-B-Que, and SeaWorld’s Christmas Festival village which features an ice skating show (under the stage in the photo) and a Christmas themed fireworks show on special nights. 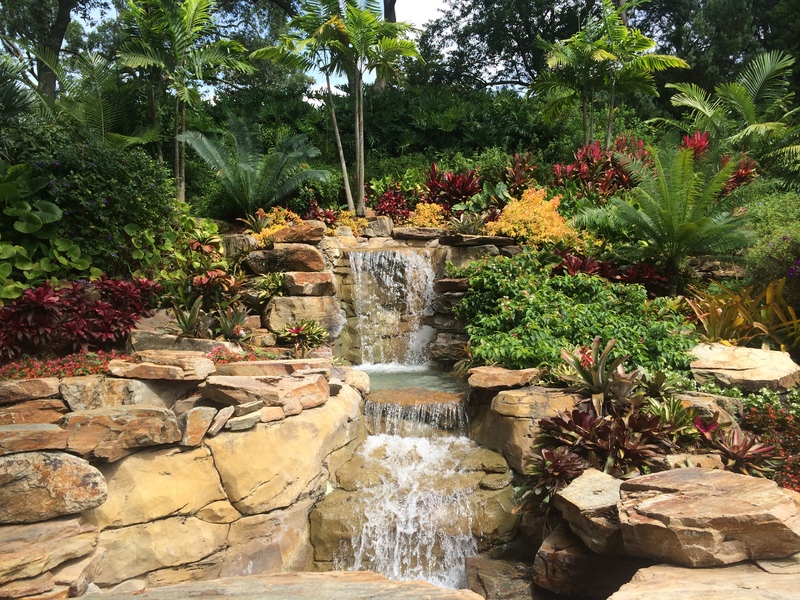 This area is also home to the all new Summer Soak Party where kids, and adults, can play in the sprinklers, water jets, and waterfalls while dancing to the latest hits. 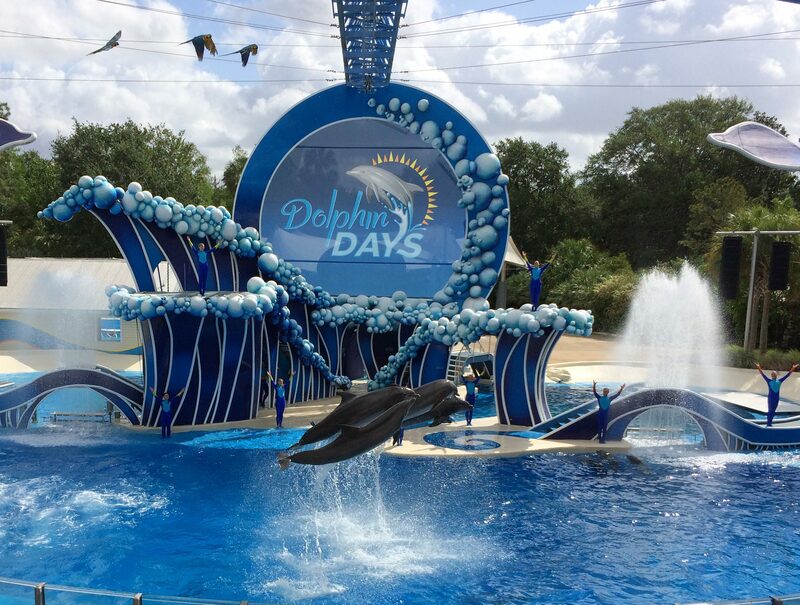 I hope you had a “Whale of a day” reading this review and if you did, then you might like to listed to a podcast called Unofficial SeaWorld Podcast which talks about everything that happens at all the SeaWorld Parks including the associated water parks and both Busch Gardens parks which are part of the SeaWorld Parks & Entertainment chain. 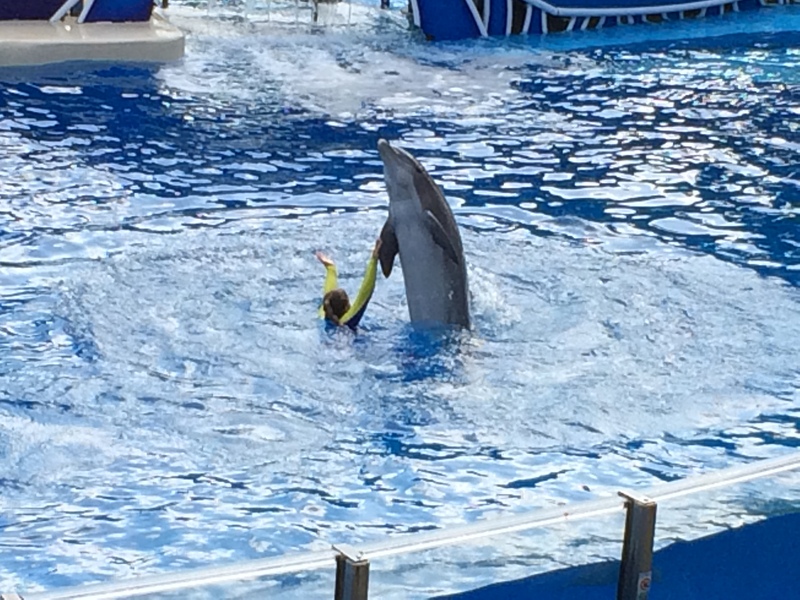 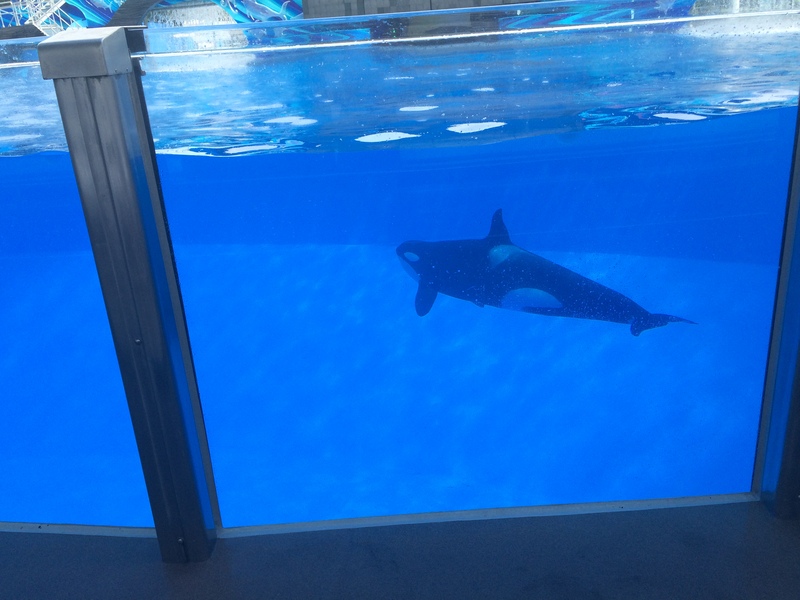 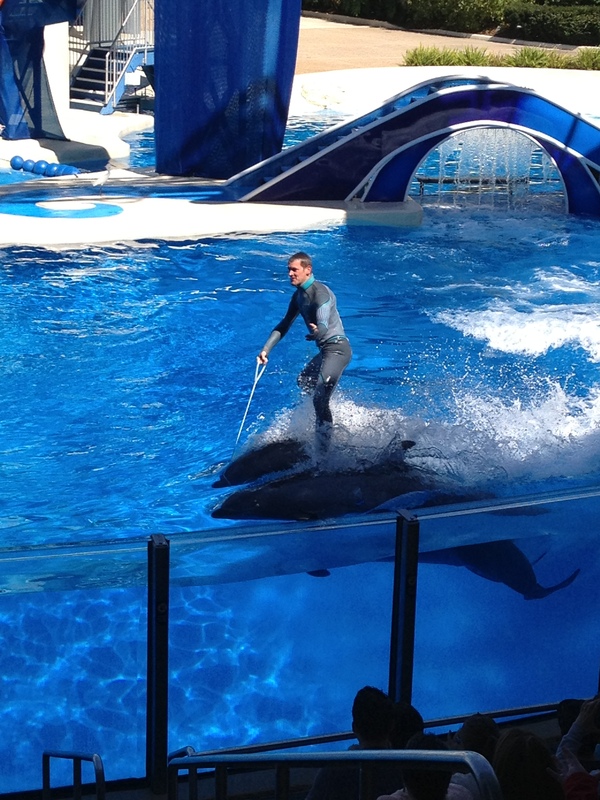 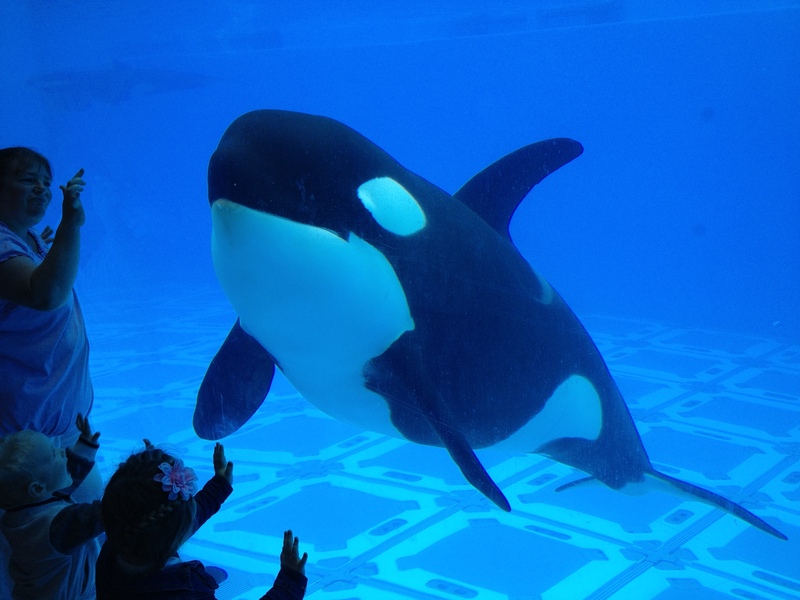 They also discuss the rescues and rehabilitation that they take part in as well as talk many of the SeaWorld employees. 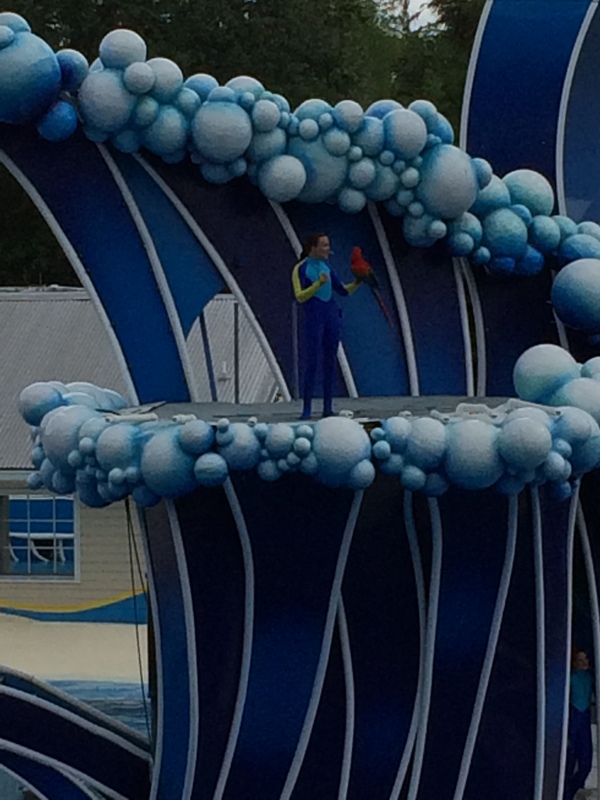 Sty tuned as I still have to add photos from the special events that SeaWorld Orlando does. 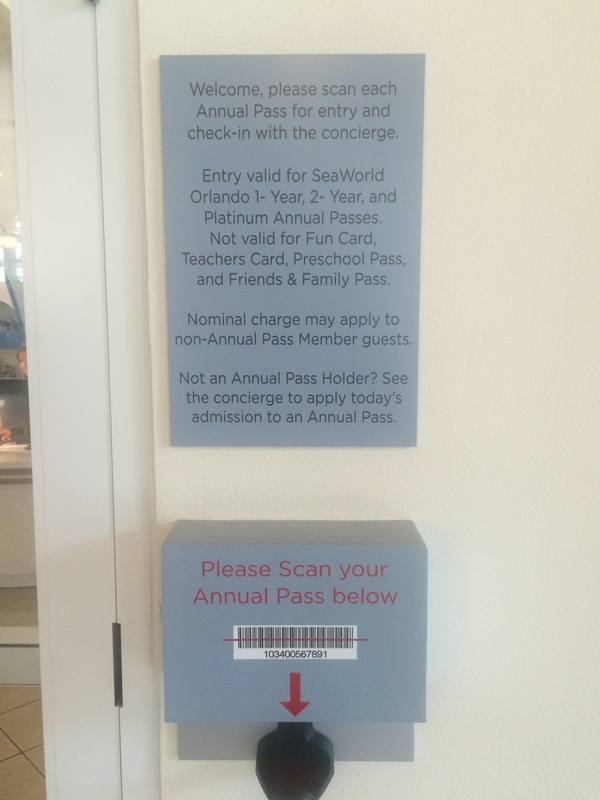 No problem, most of the info I get either comes from the parks themselves or RCDB.com.